Lot 1: Pair of Gent's Louis Vuitton Sunglasses. Lot 2: Louis Vuitton - Paris, Leather Belt. Lot 3: Pair of Louis Vuitton Leather High Heels. Lot 4: Pair of Louis Vuitton Leather Boots. Lot 5: Louis Vuitton Monogram Zippered Wallet. Lot 6: Pair of Louis Vuitton Sunglasses. Lot 7: Louis Vuitton Damier Ebene and Leather Travel Bag. Lot 8: Louis Vuitton VIP Paperweight. Lot 9: Pair of Louis Vuitton Sandals. Lot 10: Pair of Louis Vuitton Kensington Ankle Boots. Lot 11: Louis Vuitton "Art, Fashion and Architecture" Book. Lot 12: Pair of Louis Vuitton "Anita" Sunglasses. 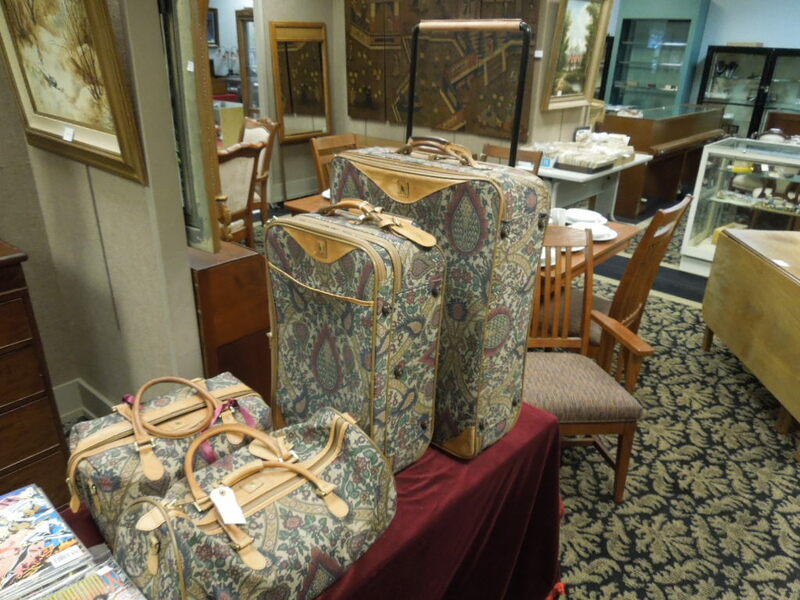 Lot 13: Louis Vuitton Trunk Paperweight. Lot 14: Pair of Louis Vuitton Boots. Lot 15: Pair of Louis Vuitton "Harold" Sunglasses. Lot 16: Pair of Louis Vuitton High Heel Boot Shoes. Lot 17: Pair of Louis Vuitton "Ella" Sunglasses. Lot 18: Pair of Louis Vuitton Sandals. Lot 19: Pair of Louis Vuitton Sandals. Lot 20: Pair of Louis Vuitton Boots. Lot 21: Louis Vuitton Epi Wallet. Lot 22: Pair of Louis Vuitton Ballerina Shoes. Lot 23: Louis Vuitton Zippy Coin Purse. Lot 24: (2) Pairs of Louis Vuitton Thong Sandals. Lot 25: International Sterling "Royal Danish" Flatware Service. Lot 26: Shreve & Co. Sterling cow Creamer and Pail. Lot 27: Ed San Giovanni Sterling Silver Compact. Lot 28: Amethyst, Diamond and Gold Pendant. Lot 29: Sapphire and Diamond Bangle Bracelet. Lot 30: Sapphire, Diamond and Gold Pendant. Lot 31: Ladies Platinum, Diamond and Pink Sapphire Ring. Lot 32: Ladies Platinum, Diamond and Sapphire Ring. Lot 33: Ladies Platinum and Yellow Diamond Ring. Lot 34: Ladies Platinum and Diamond Hamilton Watch. Lot 35: Jade and Gold Bangle Bracelet. Lot 36: 19th C. Chinese polychrome porcelain jar. Lot 37: Chinese Porcelain Charger with Dragon Decoration. Lot 38: Chinese Porcelain Glaze Dish. Lot 39: Chinese Black Glaze Porcelain Bud Vase. Lot 40: Chinese Plum Glaze Porcelain Dish. Lot 41: Lebedeva & Sokolov Palekh Russian Lacquer Boxes. Lot 42: (5) Fedoskino Russian Miniature Lacquer Boxes. Lot 43: (2) Fedoskino Russian Lacquer Boxes. Lot 44: (2) Kholui Russian Lacquer Boxes. Lot 45: Populov & Vleskin Palekh Russian Lacquer Boxes. Lot 46: Kosheleva & Efimova Fedoskino Russian Lacquer Boxes. Lot 47: Carthage Drachm, 410 - 310 BC. Lot 48: Rome Denarius, 138 - 161 AD. Lot 49: Rome Denarius, 117 - 138 AD. Lot 50: Greece, Bruttium, 282 - 203 BC. Lot 51: Rome Denarius, 138 - 161 AD. Lot 52: Sicily, Syracuse Pyrrhos, 278 - 275 BC. Lot 53: (6) Howard & Co. New York Sterling Silver Shell Dishes. 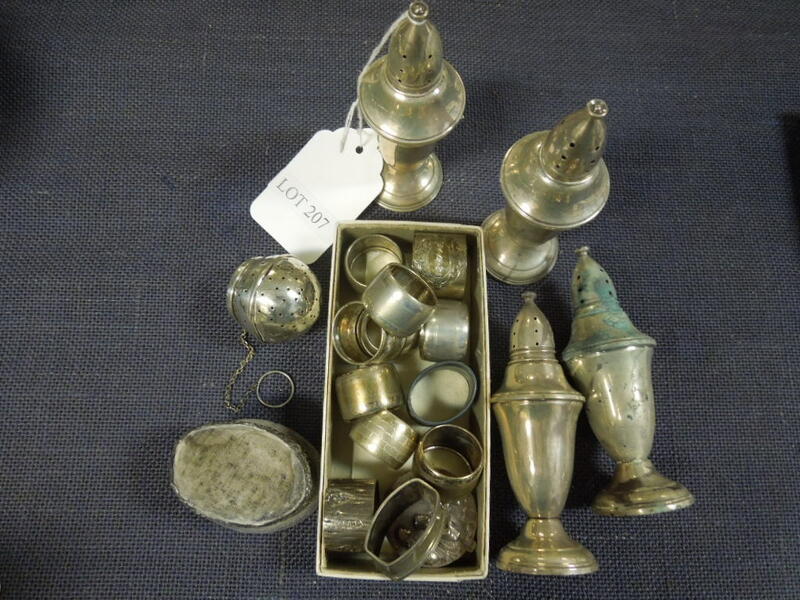 Lot 54: (2) 18th C. London Sterling Silver Shakers. Lot 55: Continental Silver Repousse Plate. Lot 56: 19th C. Gothic Revival Bronze Candelabra. Lot 57: English George III Sterling Silver Loving Cup. Lot 58: Howard & Co. New York Sterling Silver Dish. 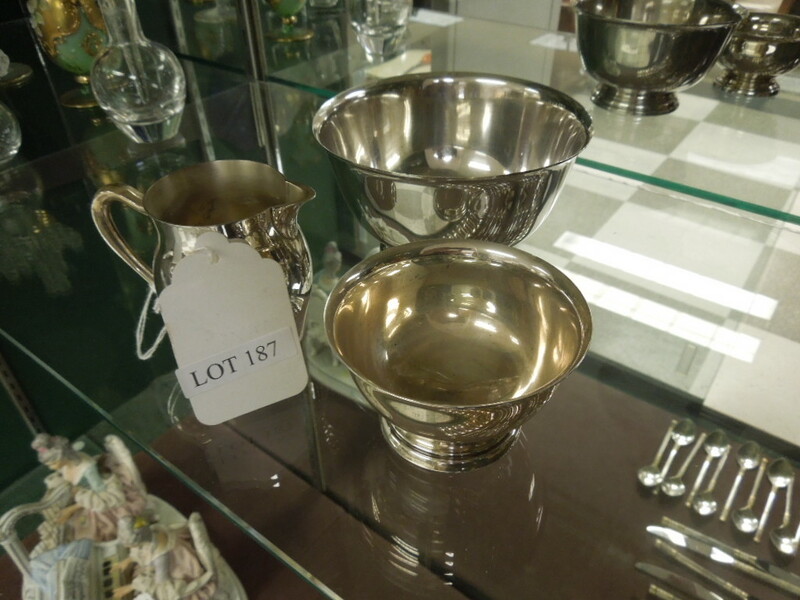 Lot 59: Graziella Laffi Peru Sterling Silver Bowl. Lot 60: Dylan Lewis Bronze Leopard. Lot 61: Circa 1870 Passion Flower Garden Seat. Lot 62: Dylan Lewis Bronze Leopard. 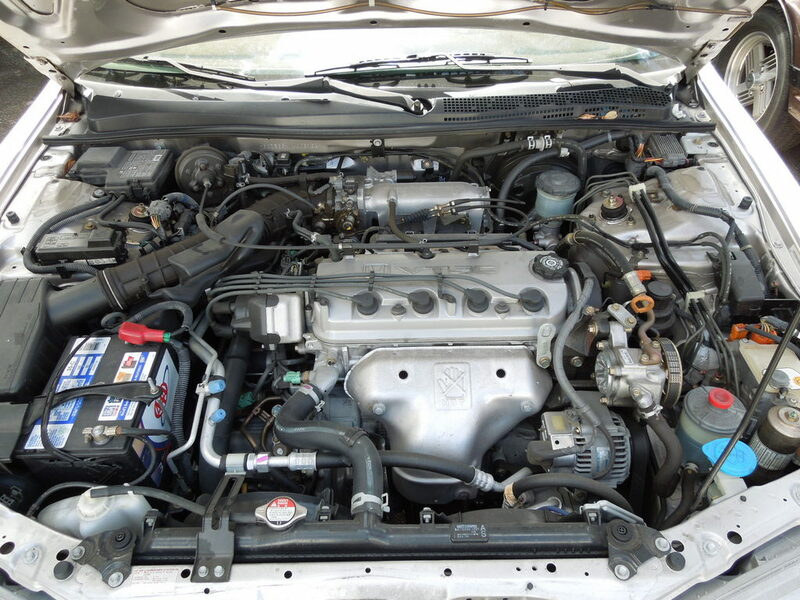 Lot 63: 1982 Datsun 280ZX Turbo Sedan. Lot 64: (22) Vintage Uncanny X-Men Comics. Lot 65: (10) Vintage Marvel X-Men & Fantastic Four Comics. Lot 66: (12) Vintage Marvel X-Men Comics. Lot 67: Group of (11) Vintage Marvel Comics. Lot 68: Group of (12) Vintage Marvel Comics. 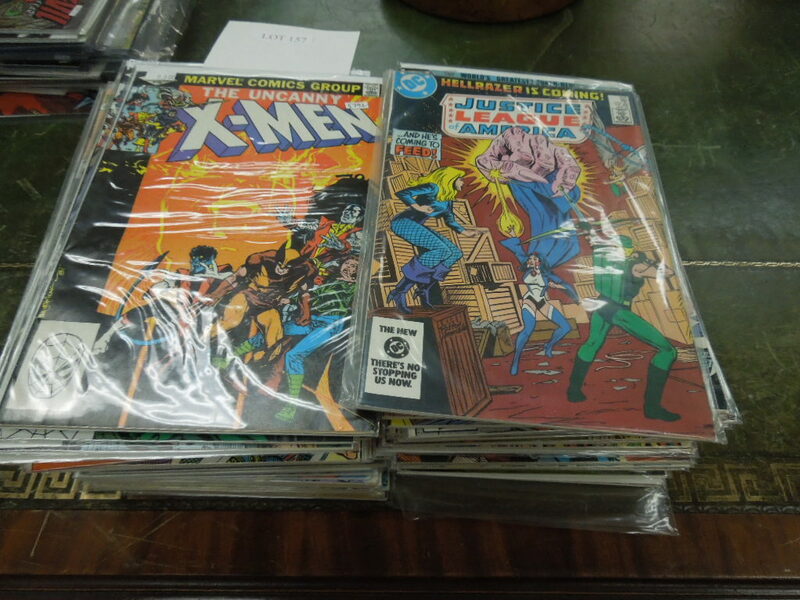 Lot 69: (15) Vintage X-Men Comics. Lot 70: (24) Vintage Marvel Amazing Spider-Man Comics. 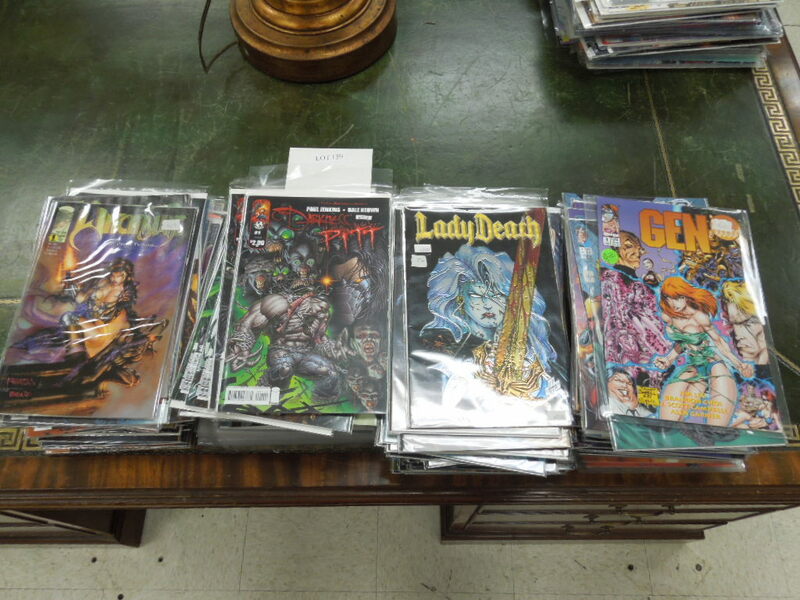 Lot 71: Group of (18) Vintage Marvel & DC Comics. 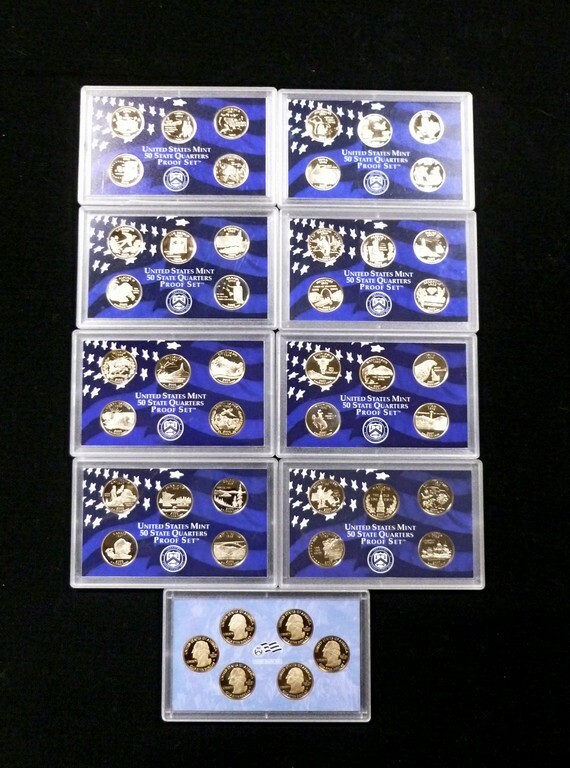 Lot 72: (4) PCS U.S. Gold Coins. 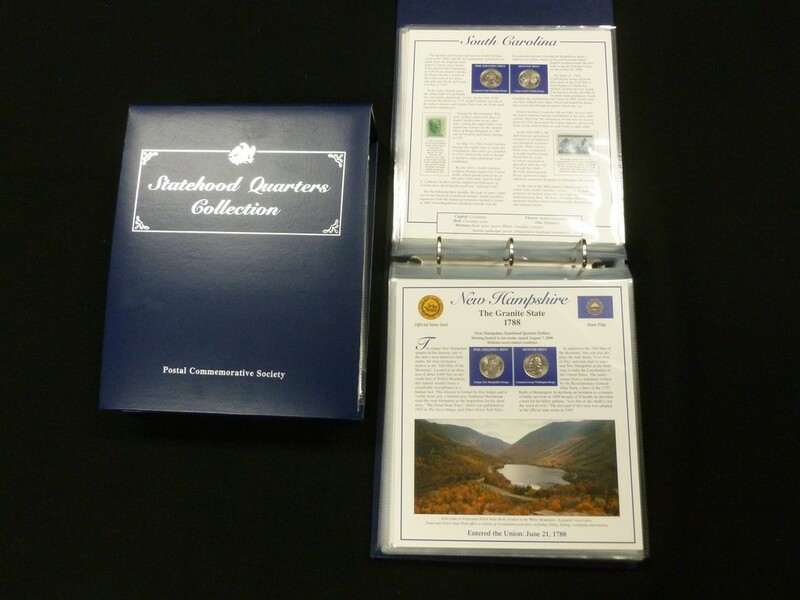 Lot 73: PCS Uncirculated Morgan Silver Dollars of The 19th Century. Lot 74: 1890-CC & 1904-O Morgan Silver Dollars. 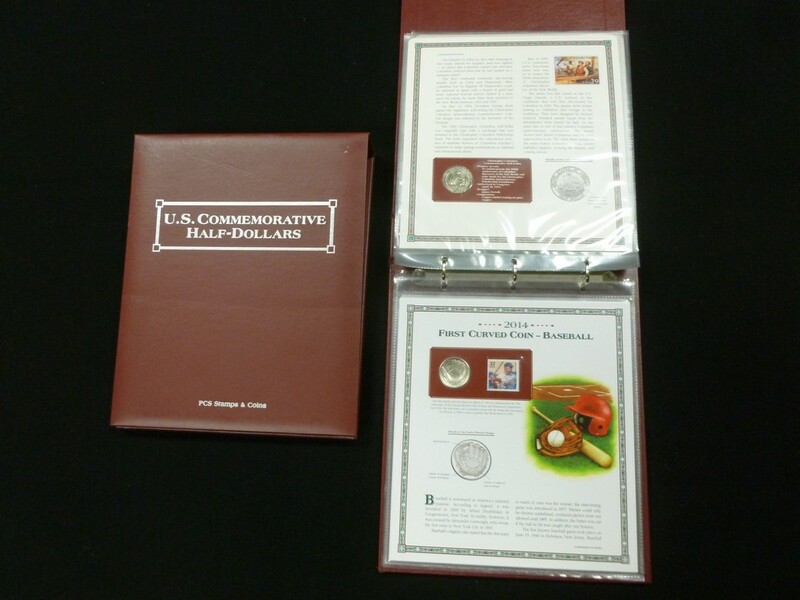 Lot 75: PCS Brilliant Uncirculated U.S. Silver Half Dollar Set. 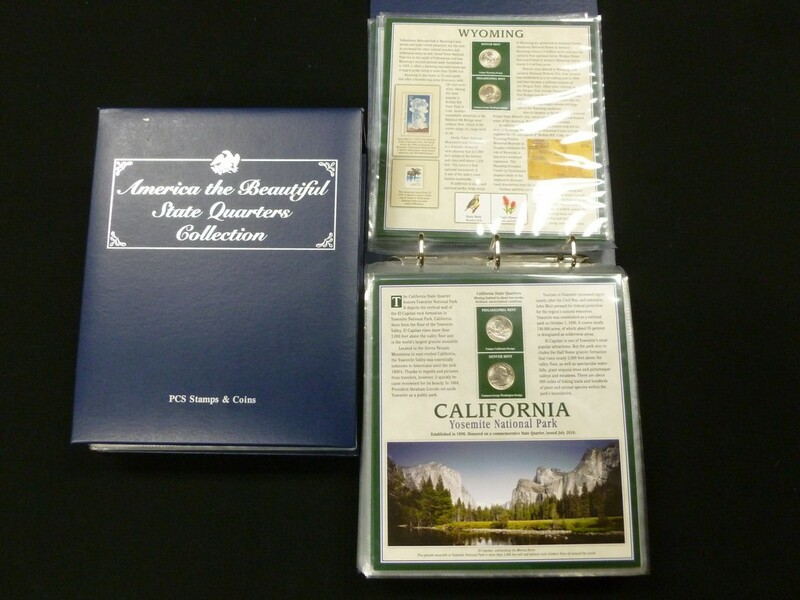 Lot 76: (2) Albums, U.S. Commemorative Silver Dollar Collector Panels. 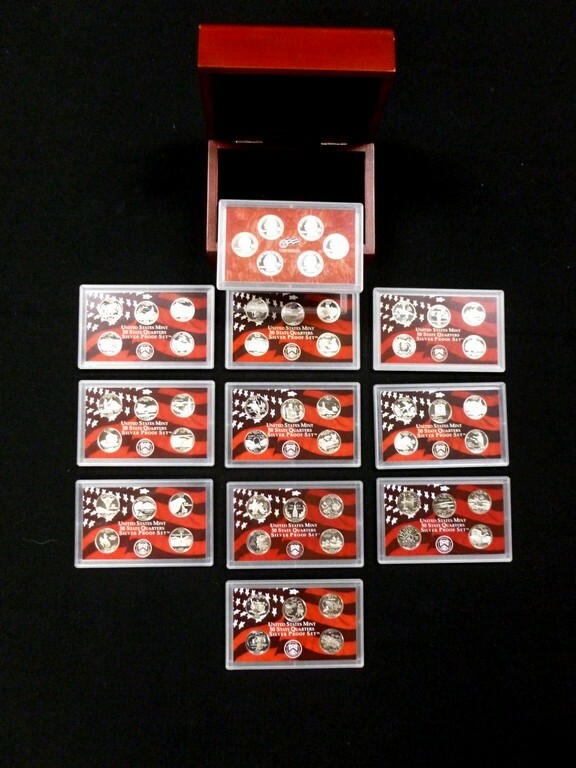 Lot 77: PCS Uncirculated Morgan Silver Dollar Collection. 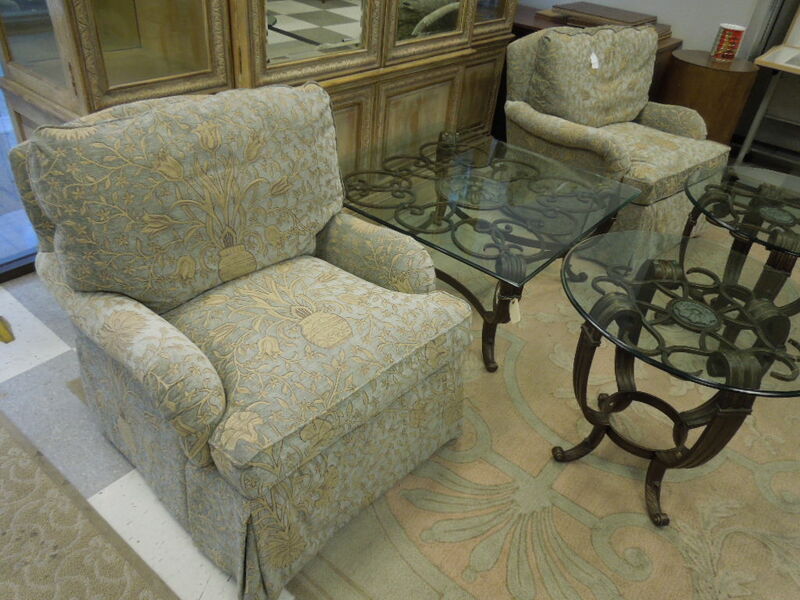 Lot 78: Pair of Japonesque Queen Anne Style Chairs. 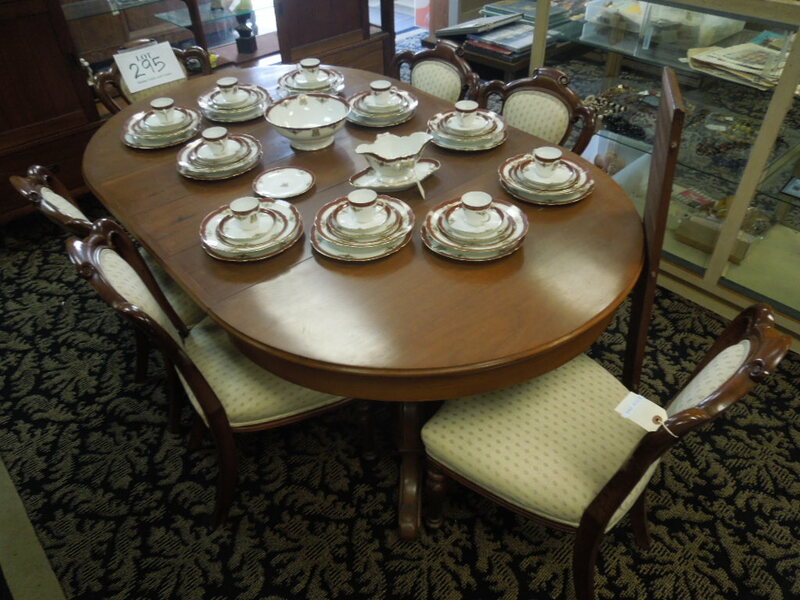 Lot 79: Baker Pedestal Table and Set of Four Chairs. 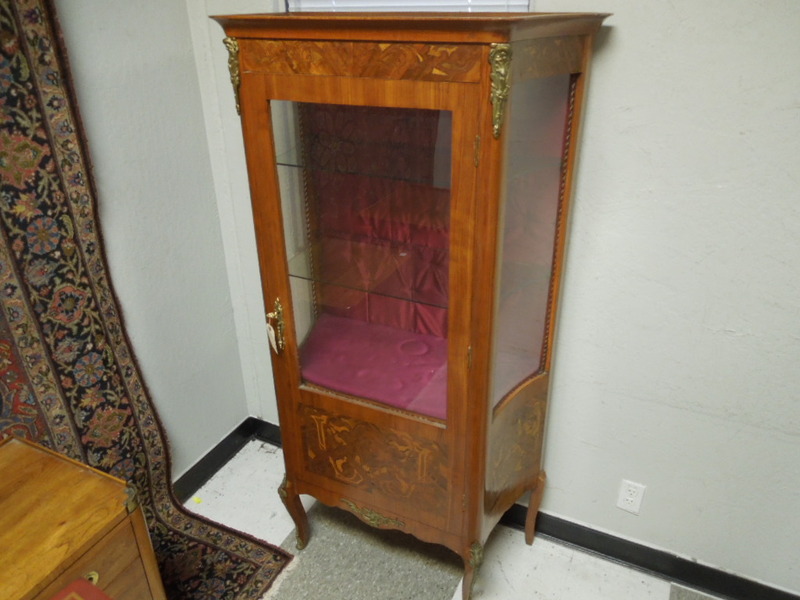 Lot 80: Wrought Metal Jardiniere Stand. 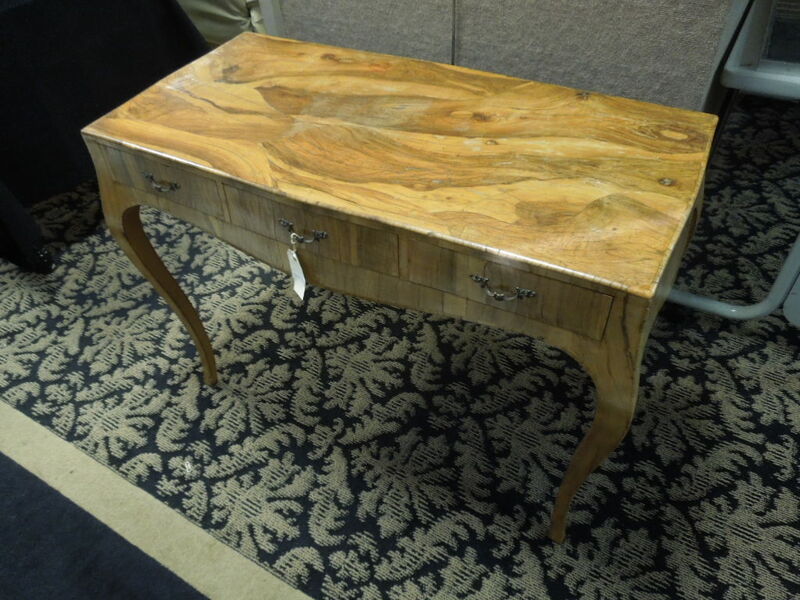 Lot 81: Wellington Hall Florentine Hall Table. Lot 82: Retro Metal Sculpture Floor Lamp. 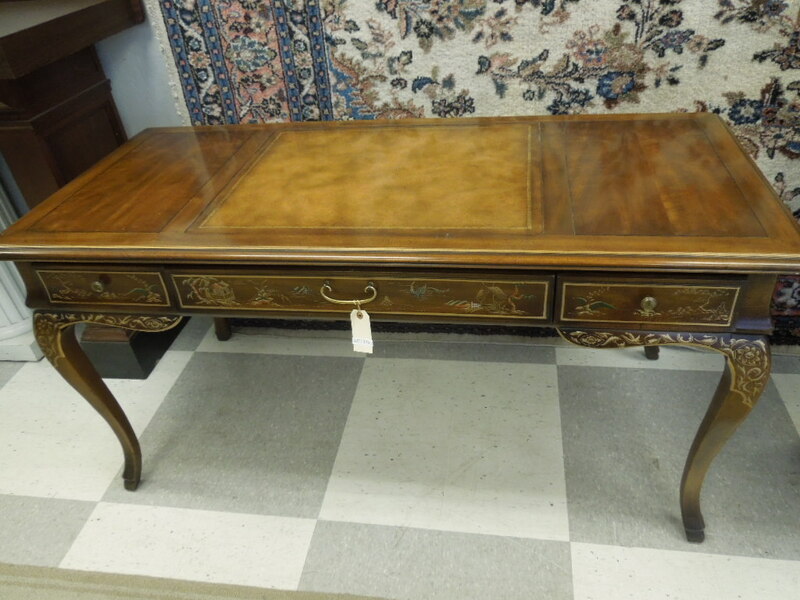 Lot 83: Chinese Rosewood Altar Table. Lot 84: Pair of Chinese Cloisonne Jardinieres. Lot 85: Chinese Crackle Glaze Porcelain Vase. Lot 86: Chinese Eggshell Porcelain Bowl. Lot 87: Chinese Porcelain Stem Cup. Lot 88: Chinese Carved Sea Shell. Lot 89: Chinese Polychrome Porcelain Box. 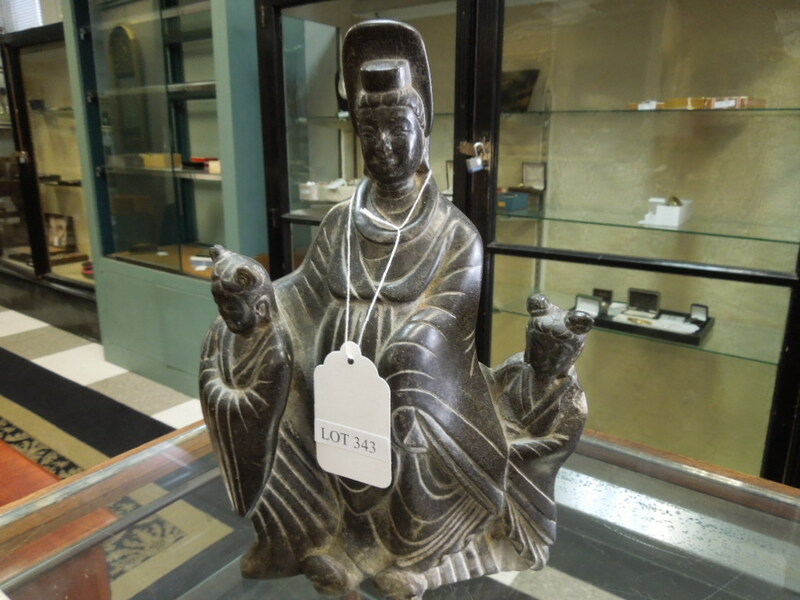 Lot 90: Chinese Carved hard Stone Sculpture on Stand. Lot 91: Chinese Brown and White Porcelain Pitcher. Lot 92: Chinese Carved Jade Perfume Bottle. Lot 93: Chinese Gilt Bronze Deity Figure. Lot 94: Chinese Polychrome Blue & Brown Porcelain Bowl. 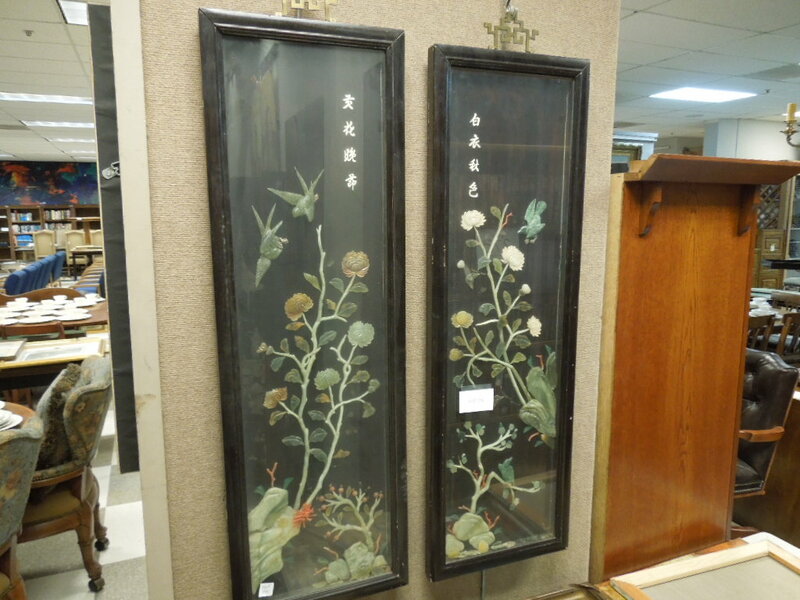 Lot 95: (2) Chinese Hand Painted Porcelain Panels. Lot 96: 14K Yellow Gold Bangle Bracelet. Lot 97: 14K Gold Rope Necklace with Orb Pendant. 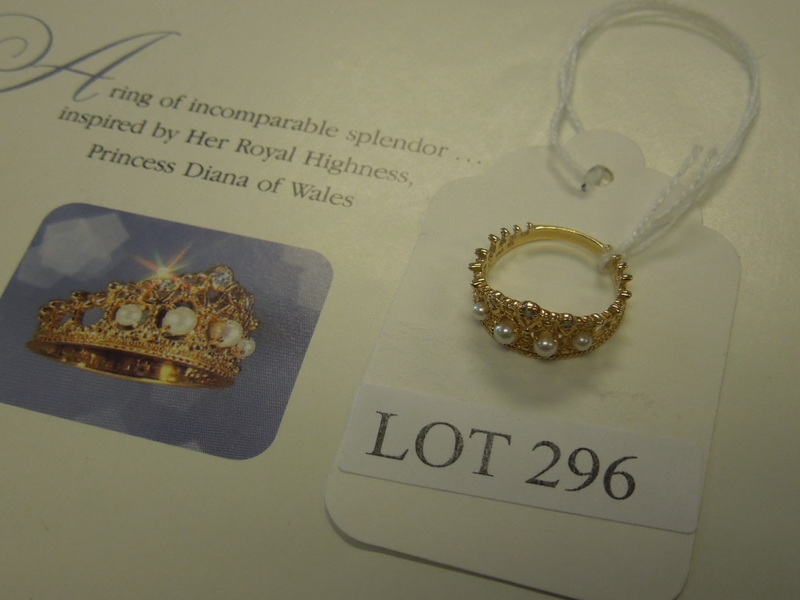 Lot 98: Ladies 18K Gold & Diamond Ring. Lot 99: Ladies 14K Gold Bulova Dior Watch. 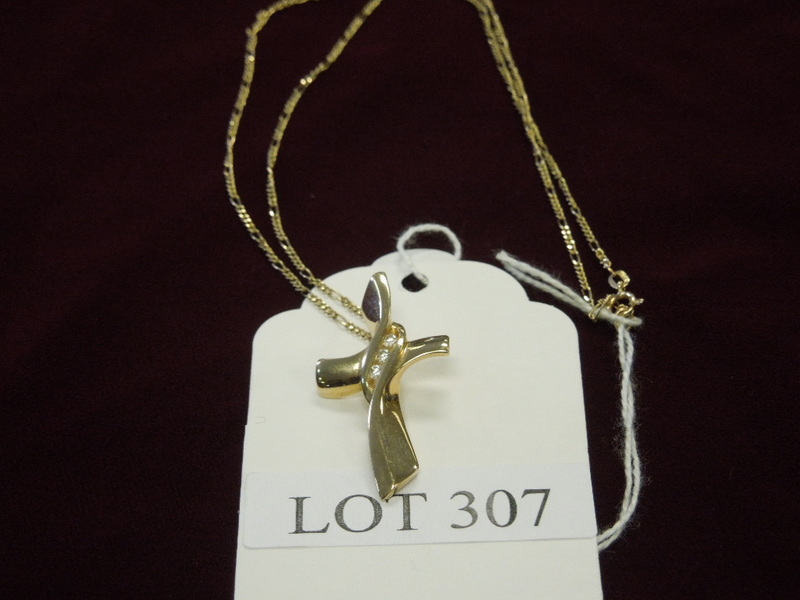 Lot 100: 14K Yellow Gold Chain with Ankh & Fish Pendants. Lot 101: Ladies 14K Gold & Diamond Band. Lot 102: 14K Yellow Gold Bangle Bracelet. Lot 103: US $5 Gold Coin Pendant. Lot 104: 14K Yellow Gold Bracelet. Lot 105: Pair of 14K Gold Clip Earrings. Lot 106: Vintage Blatz Beer Cardboard Advertising Sign. Lot 107: Vintage Coca-Cola Advertising Sign. Lot 108: Ed Fourcher Pastel Disney Character, Signed. Lot 109: Vintage Trupak Quality Products Advertising Sign. Lot 110: Vintage Coca-Cola Santa Claus Sign. Lot 111: 1952 Richard Nixon Letter to John F. Stahl. Lot 112: Star Wars & Empire Strikes Back Lobby Card Sets. (2). Lot 113: Modernist Lithograph on Paper, Landscape. 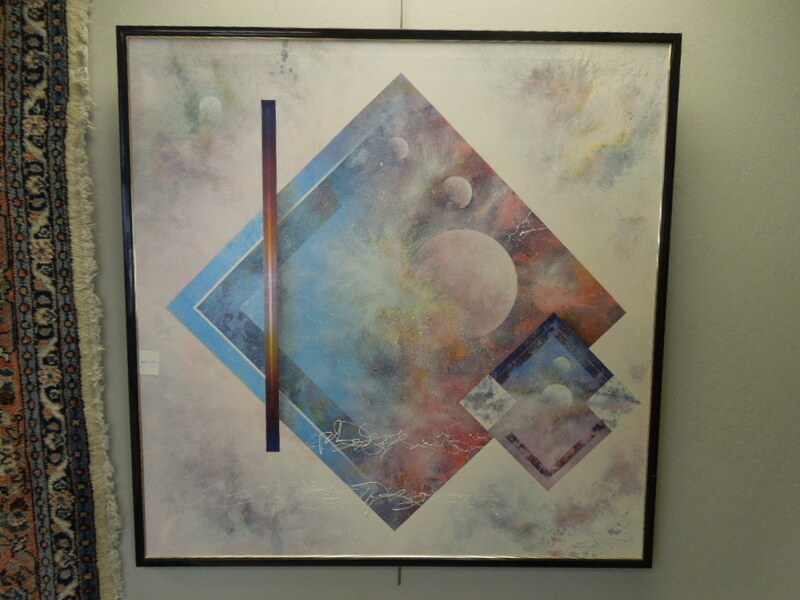 Lot 114: Janet Richardson-Baughman Oil on Canvas, Abstract. Lot 115: Modernist Lithograph on Paper, Landscape. 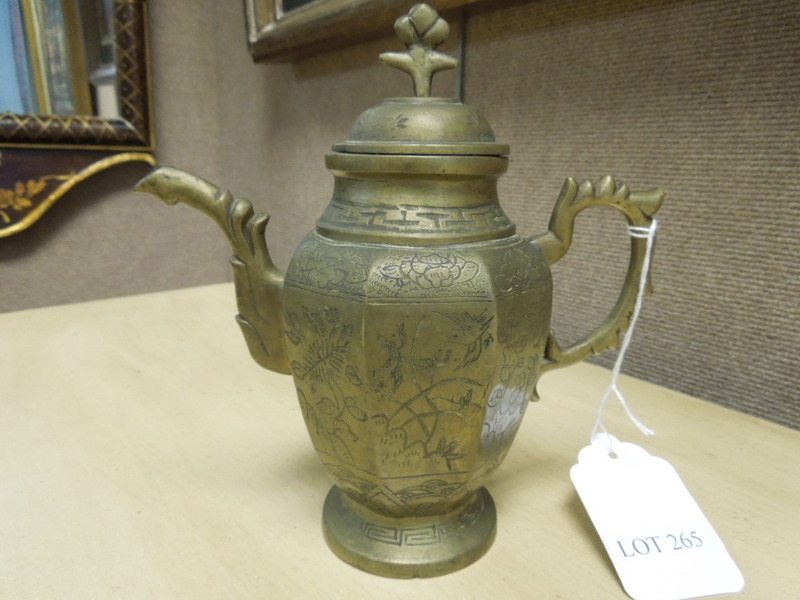 Lot 116: Chinese Bronze Teapot. Lot 117: Chinese Porcelain Peach Bowl. Lot 118: Chinese Ceremonial Beaded Necklace. Lot 119: Chinese Blue and White Porcelain Abacus Box. Lot 120: Chinese Carved Wood & Gilt Buddha Figure. Lot 121: Chinese Octagonal Ink Stone in Carved Wood Box. Lot 122: (2) Chinese Carved Hard Stone Beast Form Seals. 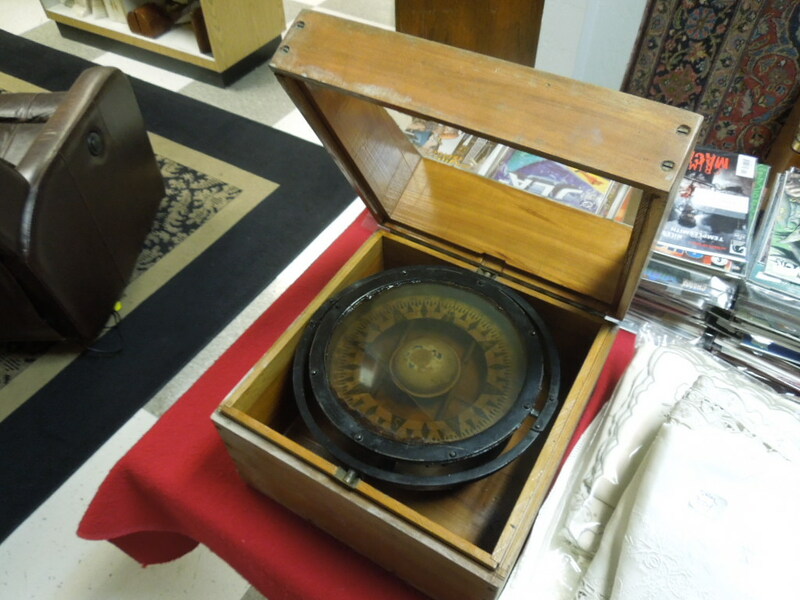 Lot 123: Vintage Lyon & Healy Wooden Harp Case. 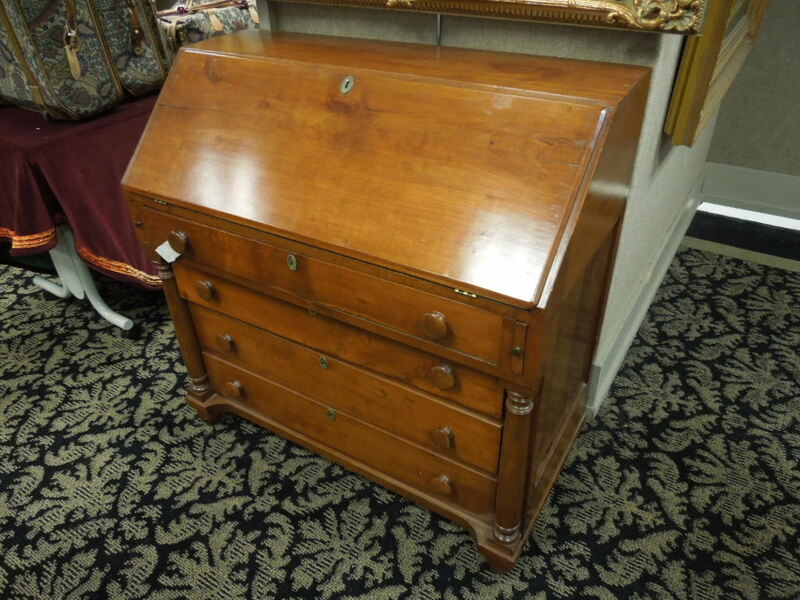 Lot 124: 19th C. English Mahogany Secretary. 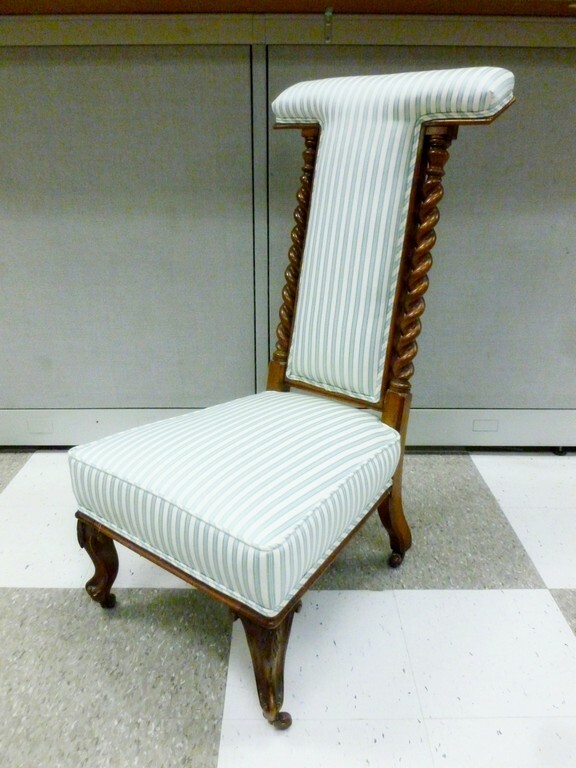 Lot 125: Sigvard Bernadotte France & Son Danish Chair. 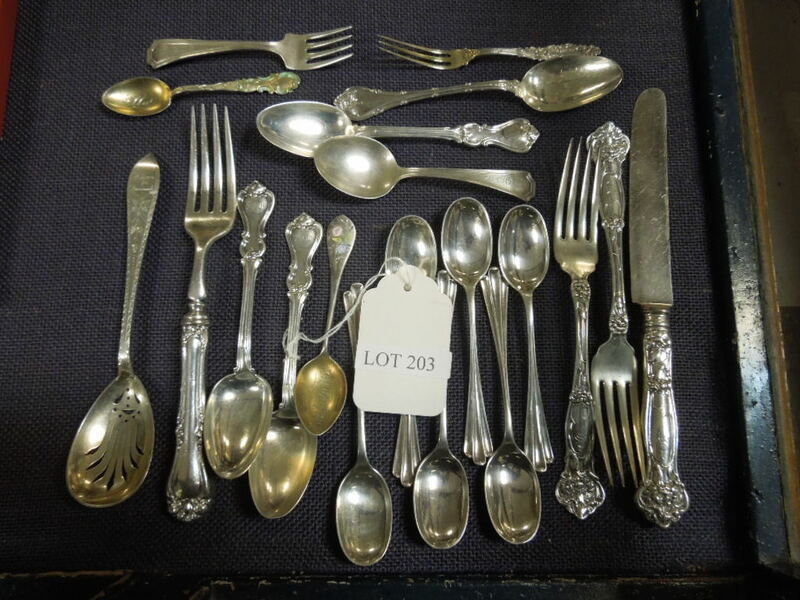 Lot 126: Reed & Barton "Grande Renaissance" Sterling Flatware, 109 pieces.. 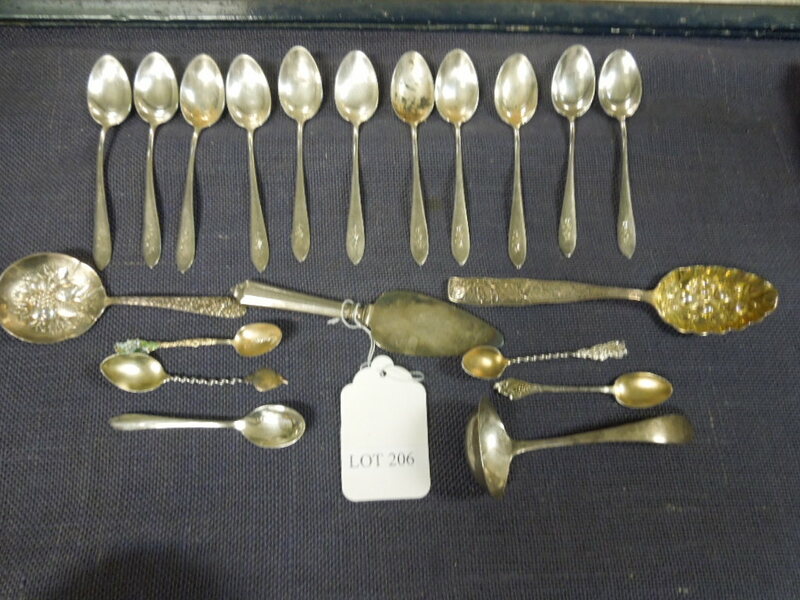 Lot 127: (2) 18th C. English Sterling Silver Berry Spoons. Lot 128: International Silver "Stuyvesant" Sterling Flatware. Lot 129: (10) Ivan Schizov Russian Lacquer Plaques. Lot 130: (4) Kholui Russian Lacquer Miniature Boxes. Lot 131: Sokolov Palekh Russian Lacquer Box, Tsar Saltan. 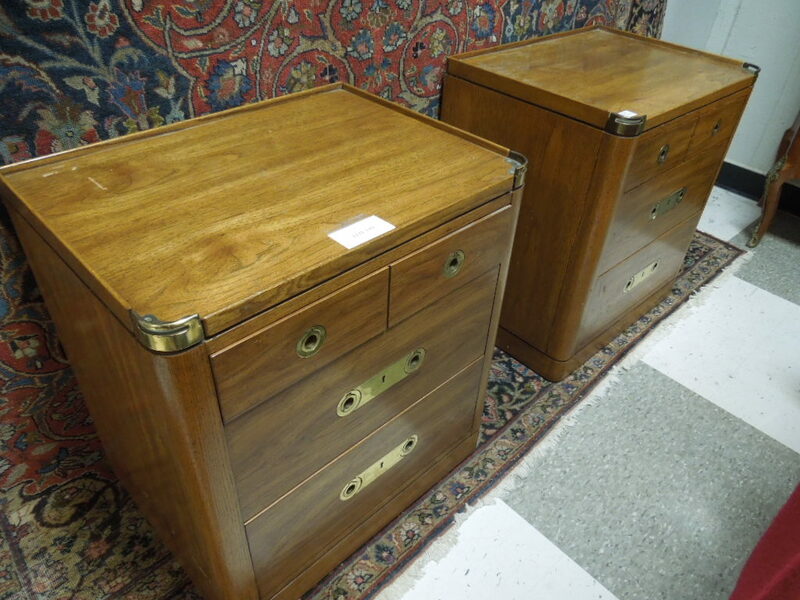 Lot 132: (2) Kholui Russian Lacquer Boxes. Lot 133: Palekh Russian Lacquer Box, Sadko. Lot 134: (2) Fedoskino Russian lacquer Boxes. Lot 135: Continental Bisque Head Doll. 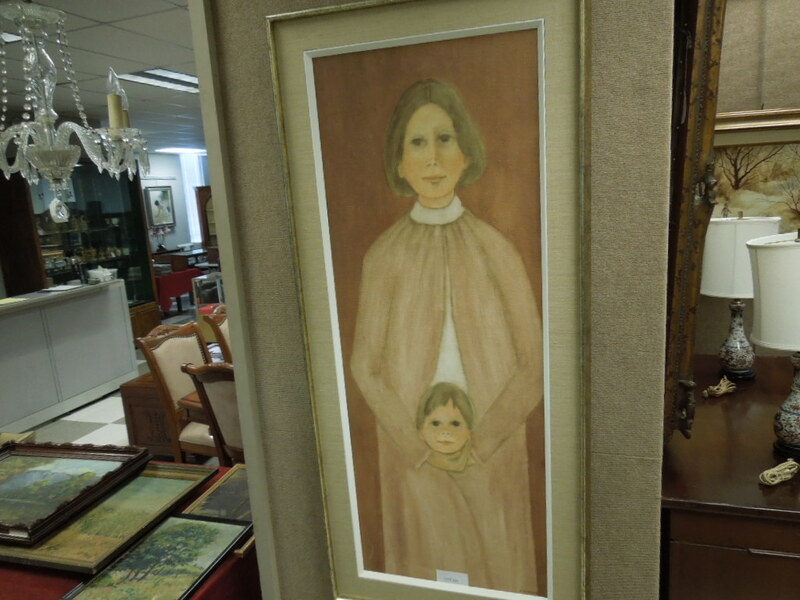 Lot 136: (2) David Lee Watercolors on Silk. Lot 137: Antonio Rodriguez-Almansa, Harlequin & Dancer. Lot 138: Ted Christensen Acrylic On Canvas, "Lone Flight". 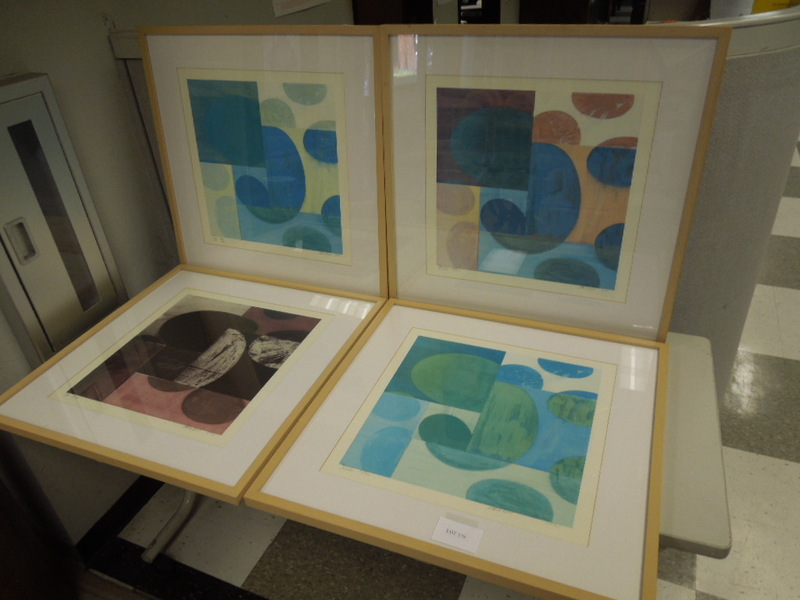 Lot 139: Contemporary Lithograph on Paper. Lot 140: Antonio Rodriguez-Almansa, Gypsy Woman. 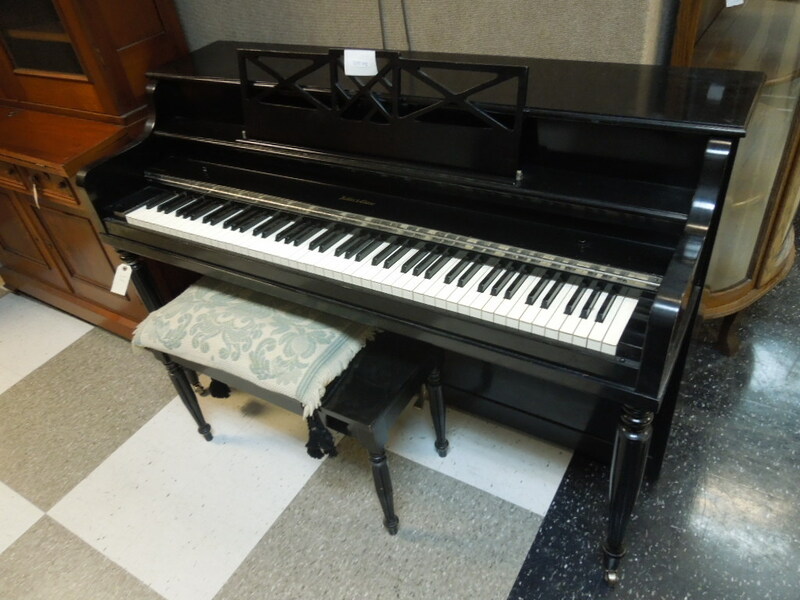 Lot 141: Yamaha M560QA Upright Piano with Bench. Lot 142: Derrik Van Nimwegen Oil on Museum Board. Lot 143: Chinese Olive Green Porcelain Vase. Lot 144: Chinese Bronze Lidded Censer. Lot 145: Chinese Blue and Grey Glaze Porcelain Bowl. Lot 146: Chinese Carved Hard Stone Snuff Bottle. Lot 147: Chinese Blue and White Porcelain 2-handled Vase. Lot 148: Chinese Green Hard Stone Cup. Lot 149: Chinese Yellow Beaded Ceremonial Necklace. Lot 150: Chinese Olive Green Glaze Porcelain Vase. Lot 151: Chinese Black Glaze Ceramic Duck Form Vessel. Lot 152: Chinese Porcelain Crackle Glaze Bowl. Lot 153: Chinese Black and Polychrome vase. Lot 154: Chinese Bronze Censer. 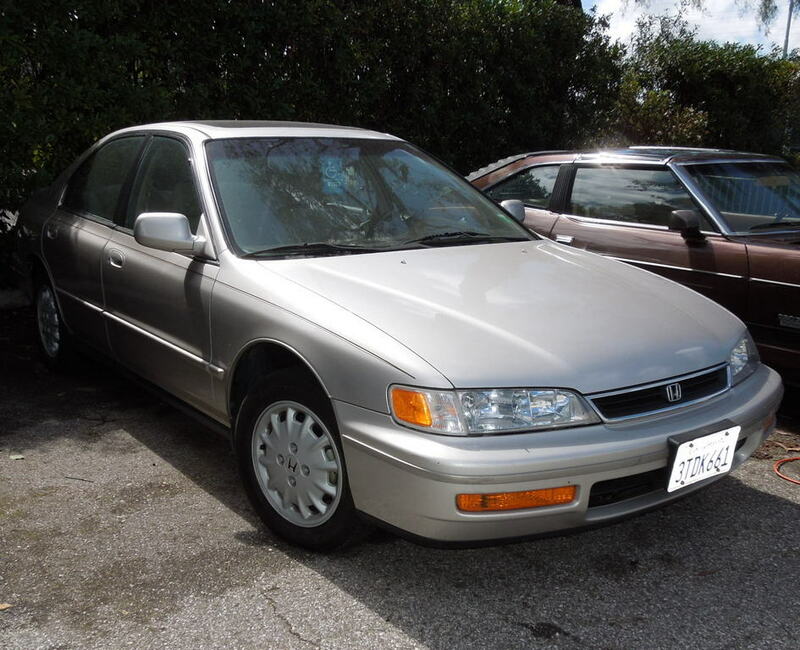 Lot 155: Chinese Black & Brown Glaze Ceramic Pitcher..
1997 Honda Accord EX 4-door sedan. 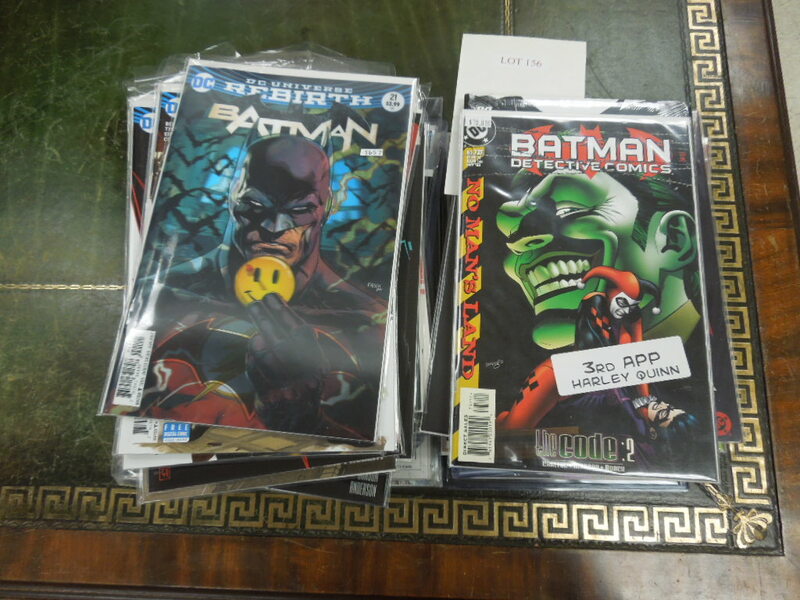 Lot 156: Collection Of Modern Age Batman Comics Incl. Key Dates. 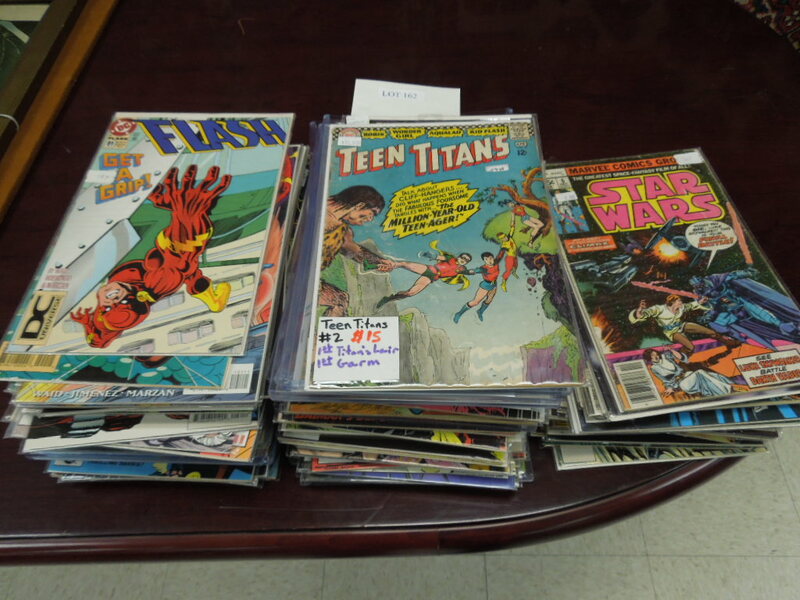 Lot 157: Collection Of Vintage Marvel & Dc Comics Incl. X-Man, Jla. 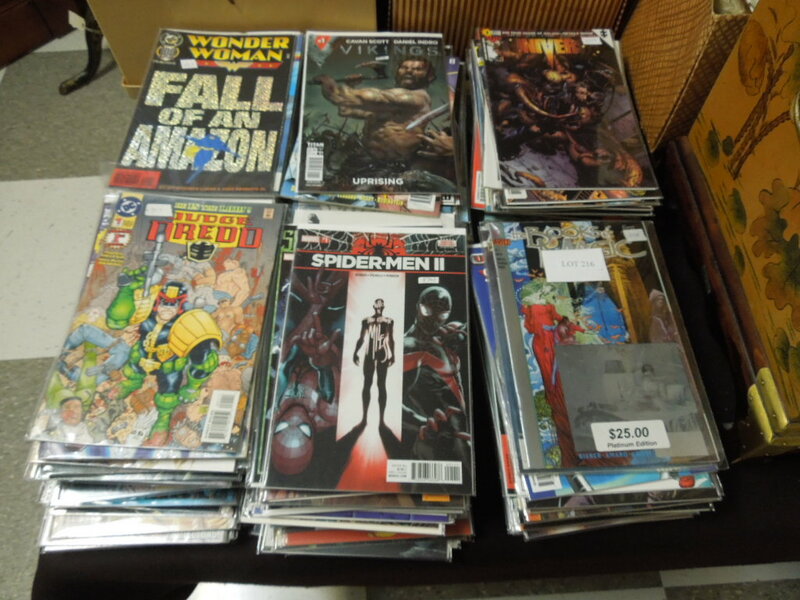 Lot 158: Collection Of Modern Age Comics Incl. Limited Edition, Signed And With Certificate. 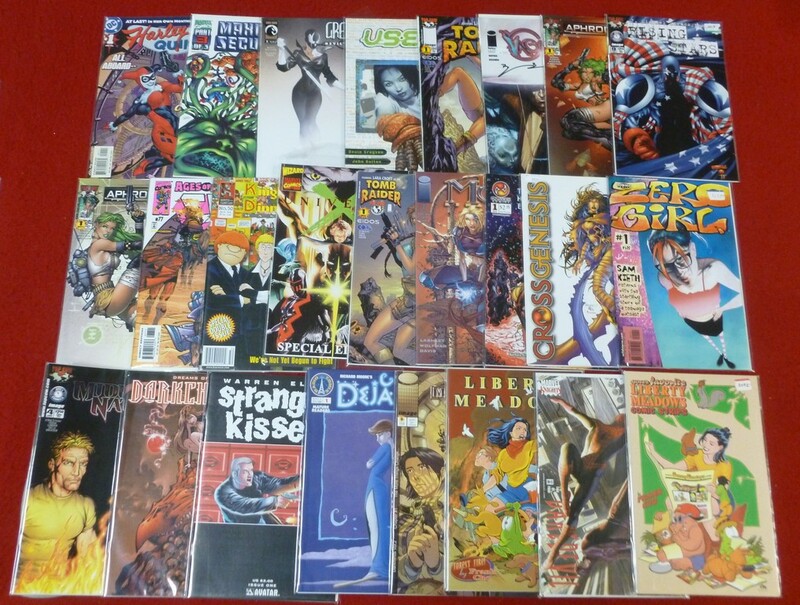 Lot 159: Collection Of Modern Age Fantasy Comics Incl. Jen 13, Lady Death, The Darkness & Witch Blade. 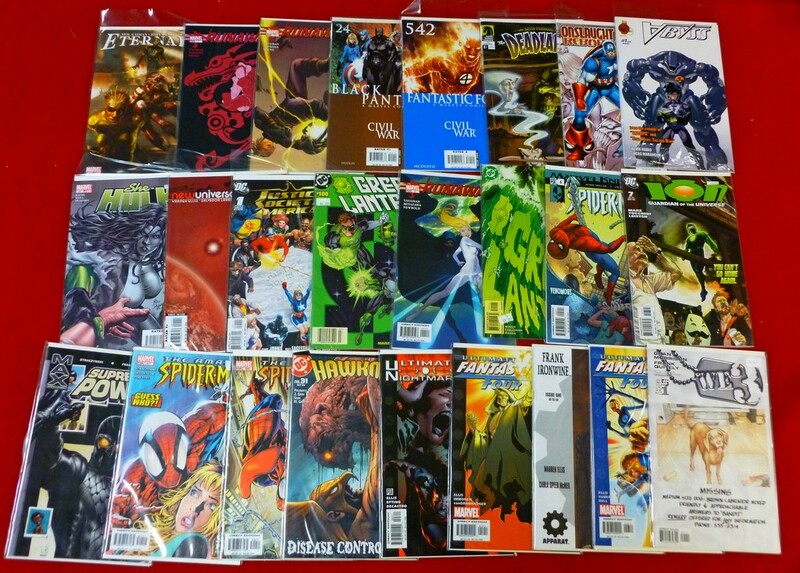 Lot 160: Collection Of Limited Edition Modern Age Comics With Variants. 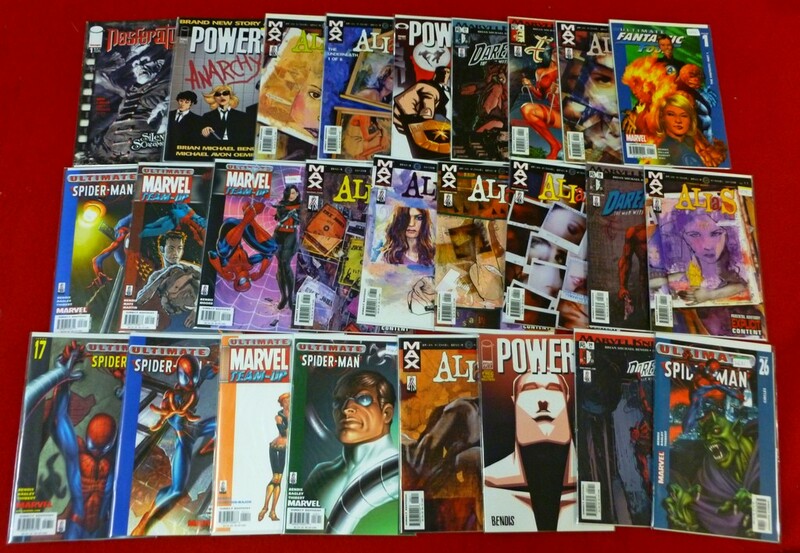 Lot 161: Collection Of Modern Age Comics Incl. Variant, Signed, With Certificates. 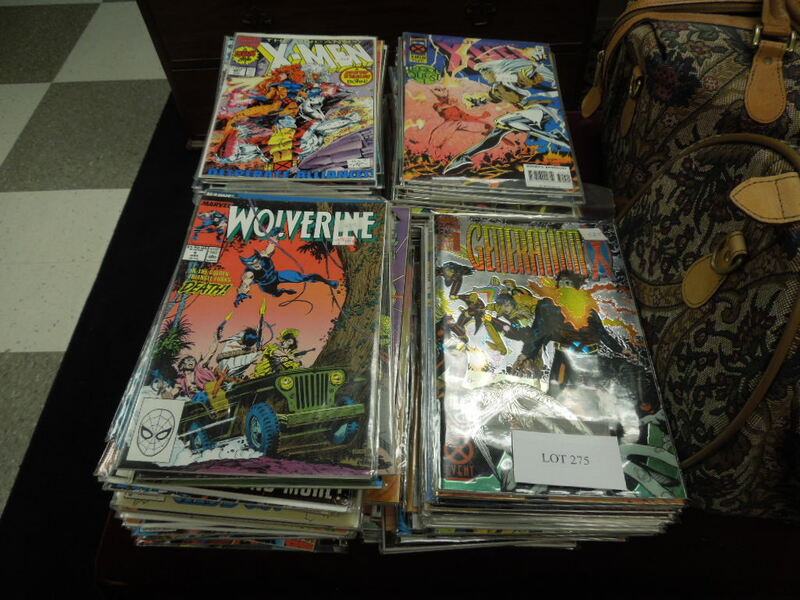 Lot 162: Collection Of Vintage Marvel & Dc Comics Incl. Key Dates. 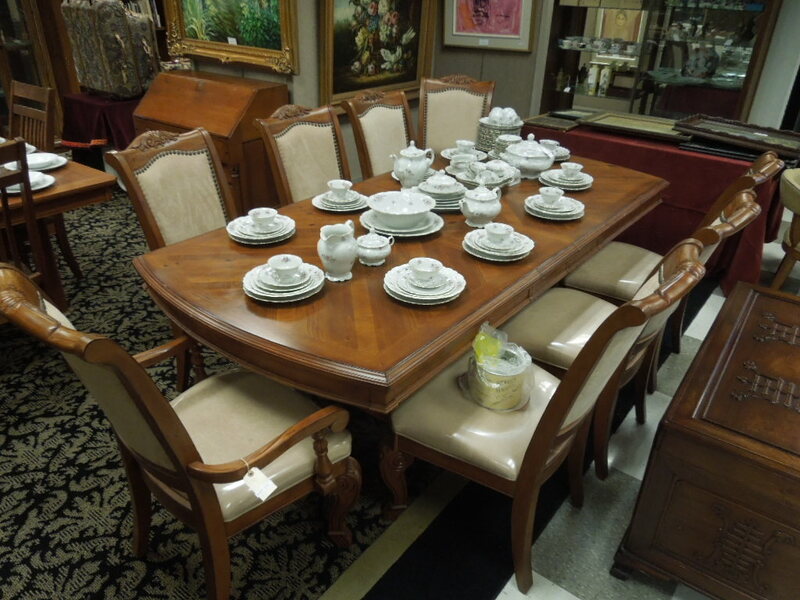 Lot 163: Contemporary Custom Dining Table With 2 Leaves, 2 Leather Upholstered Chairs And 10 Side Chairs. 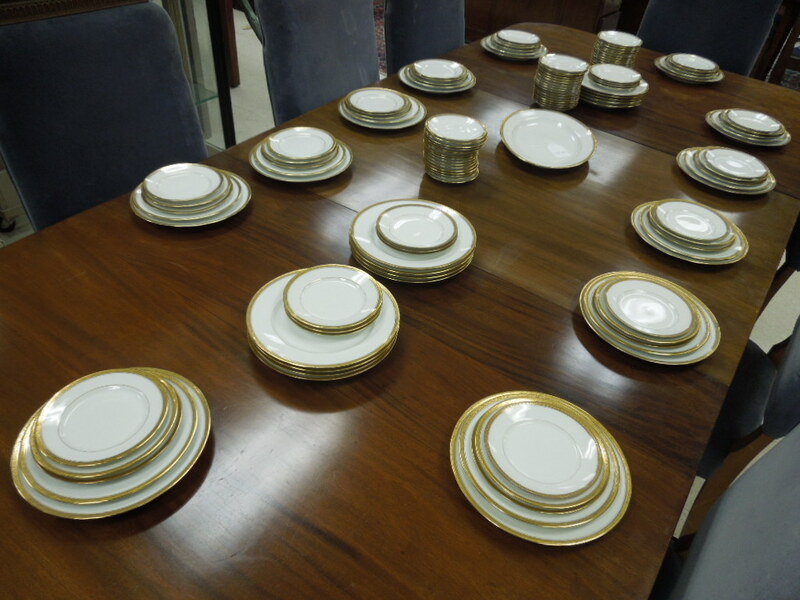 Lot 164: Royal Worcester Silver Chantilly Porcelain Dinner Service. 58 Pieces. 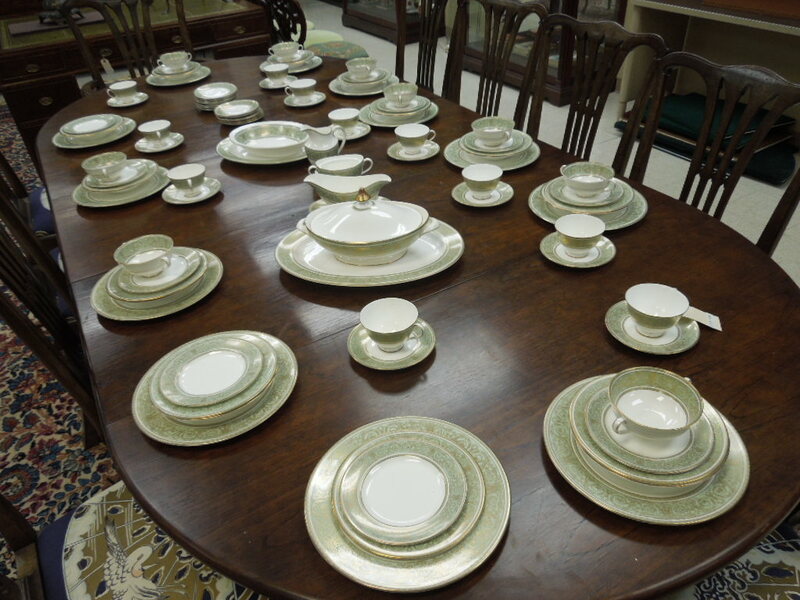 Lot 165: French Porcelain Gilt Rimmed Dinner Service, Gumps Of Sf. 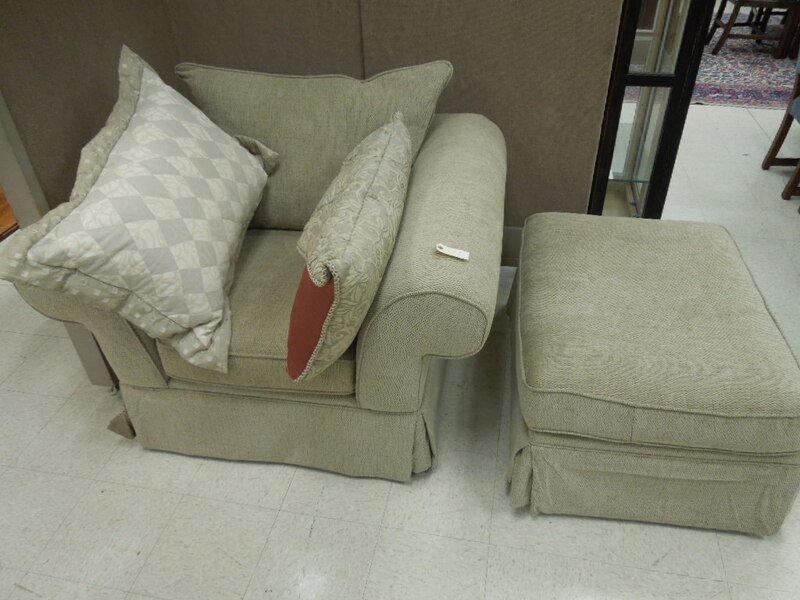 Lot 166: Contemporary Upholstered Armchair With Ottoman. 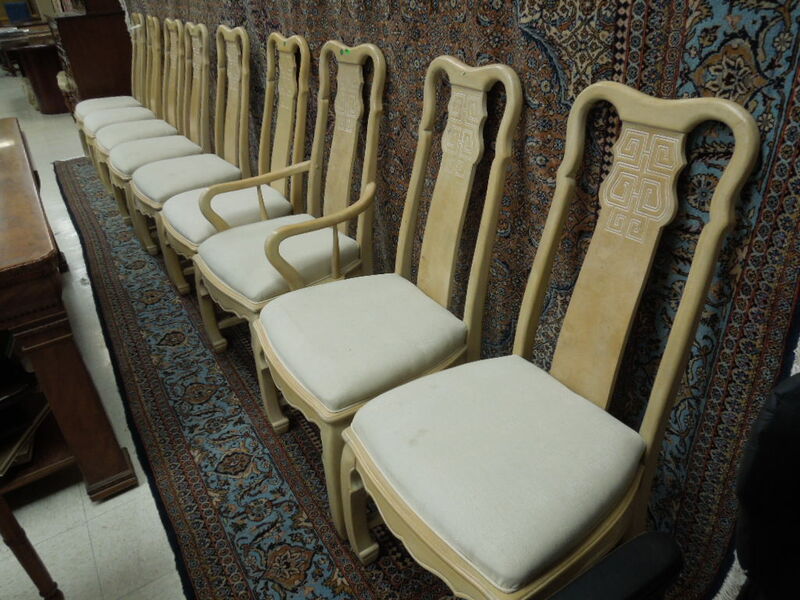 Lot 167: Set Of (9) Contemporary Oriental Style Dining Chairs With Upholstered Seats. 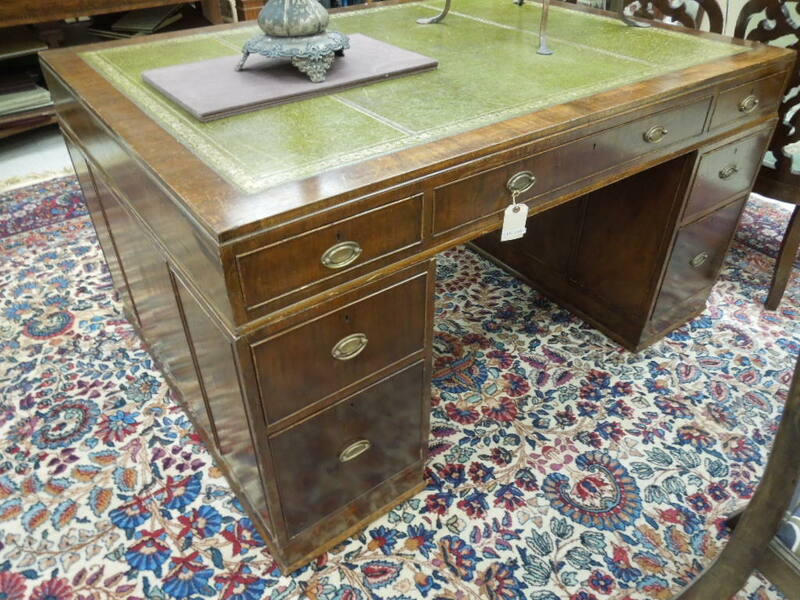 Lot 168: Georgian Partner's Desk With Green Leather Inset Top. 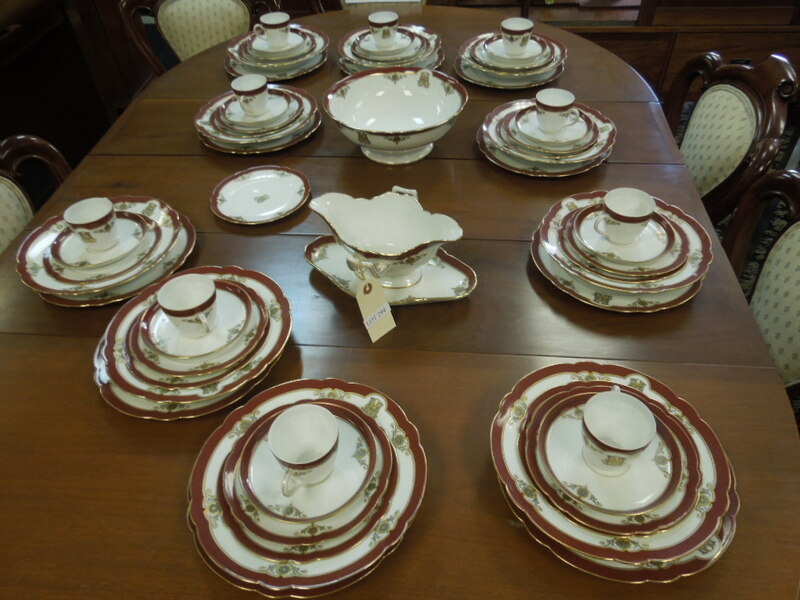 Lot 169: Royal Doulton English Renaissance Porcelain Dinner Service. 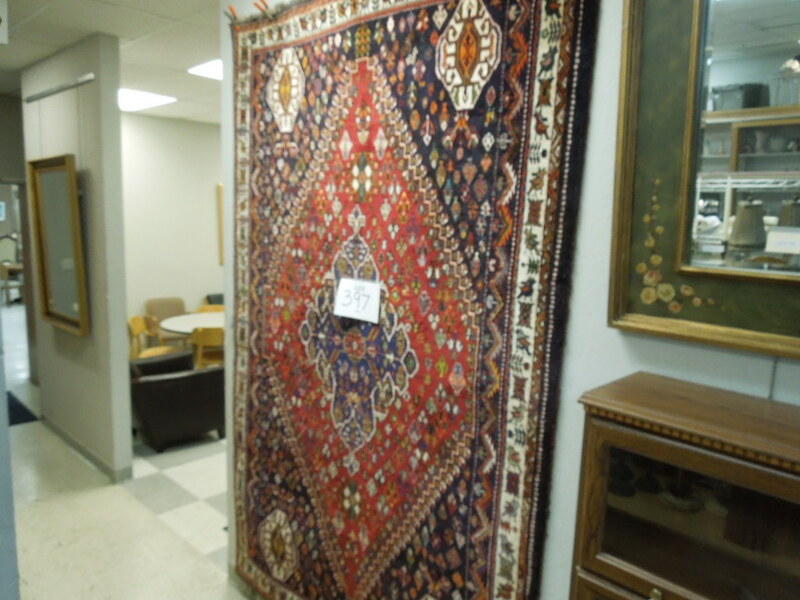 Lot 170: Persian Hand Knotted Wool Rug. Red Field With Center Medallion And Spandrels. (12'6" X 8'2"). Lot 171: Contemporary Modern Oil On Canvas, Signed. (47" X 47"). Framed. 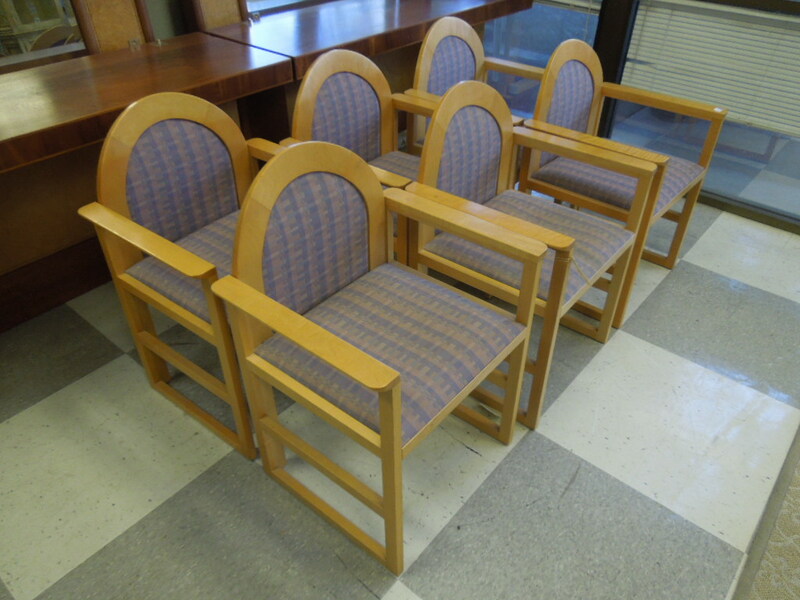 Lot 172: (6) Contemporary Modernist Dining Chairs. 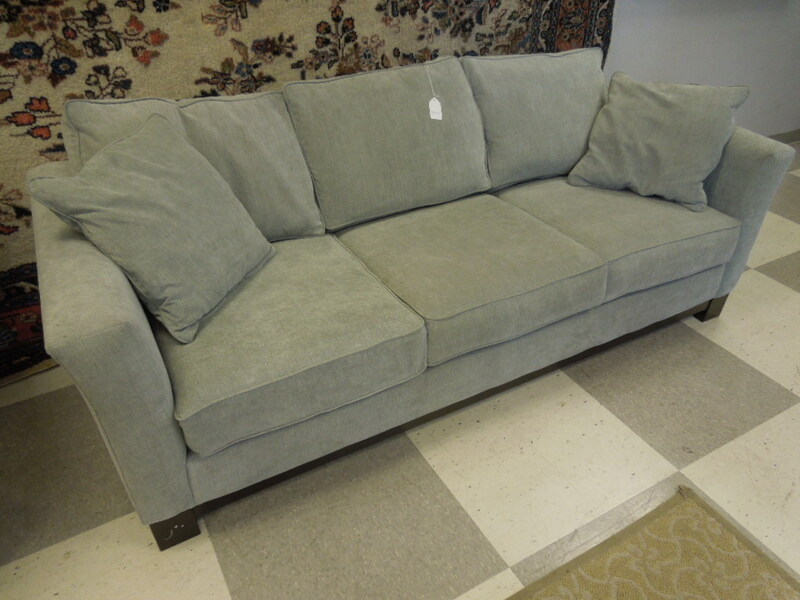 Lot 173: Jonathan Lewis Design Contemporary 3-Seat Sofa. 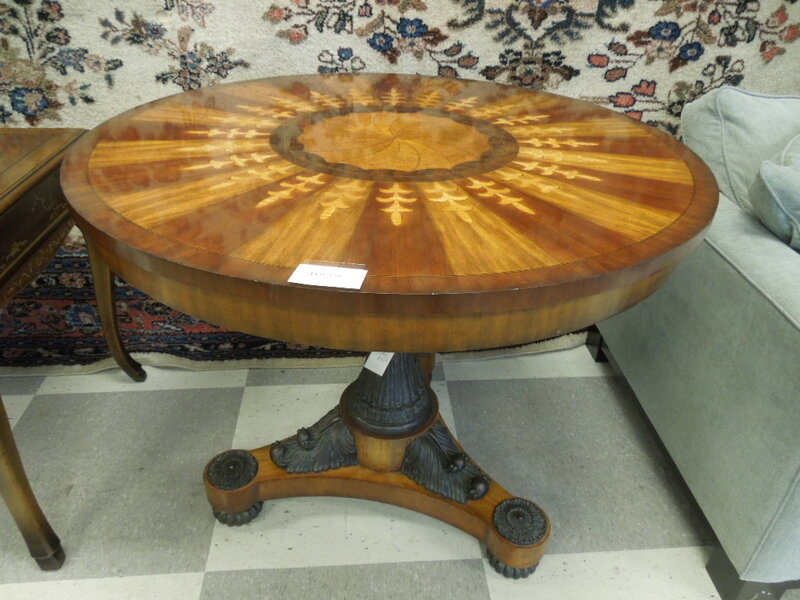 Lot 174: Maitland-Smith Continental Style Circular Center Table. Mixed Woods Marquetry On Bronzed Metal Pedestal. (34" Tall). 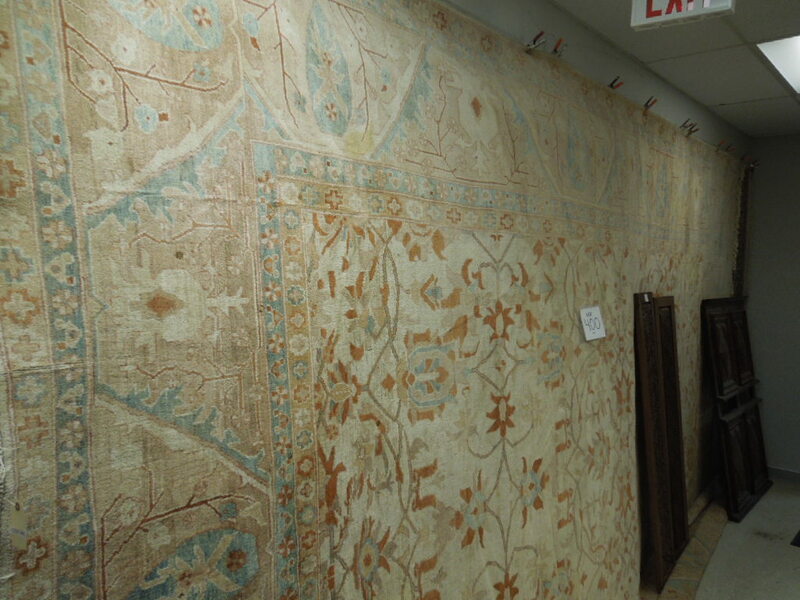 Lot 175: Oriental Hand Knotted Wool Rug With Beige Ground, Floral Center Medallion, Floral Borders And Spandrels. (9.5' X 17.5'). 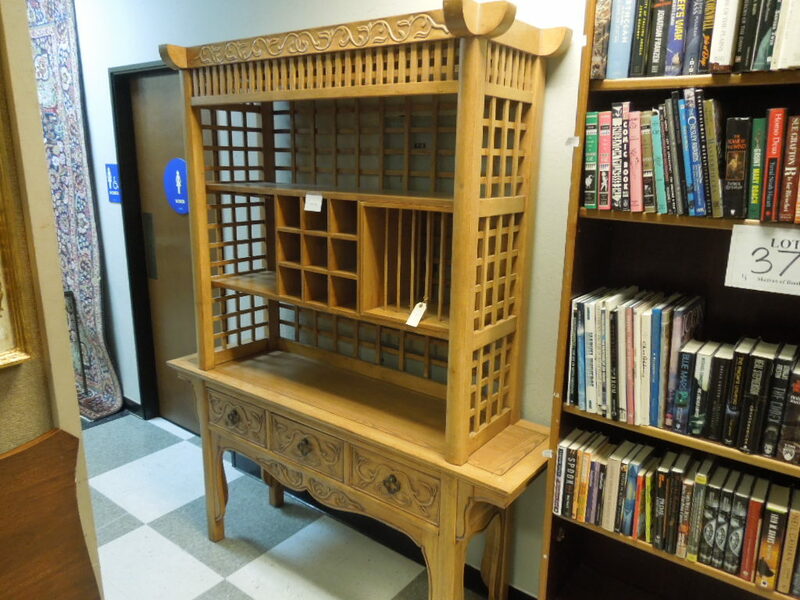 Lot 176: Drexel 3-Drawer Bureau Plat In Oriental Taste. 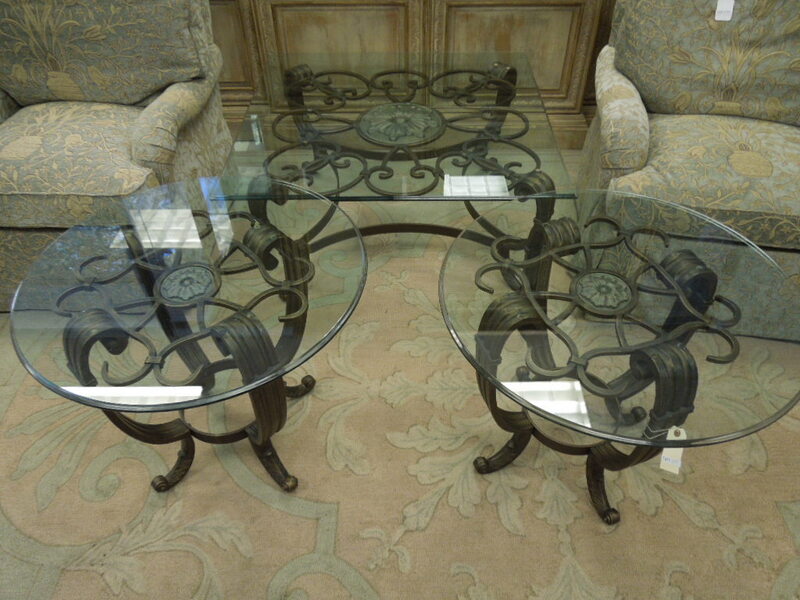 Lot 177: Contemporary Bronze Tone Metal And Glass Top Coffee Table With A Pair Of Matching End Tables. 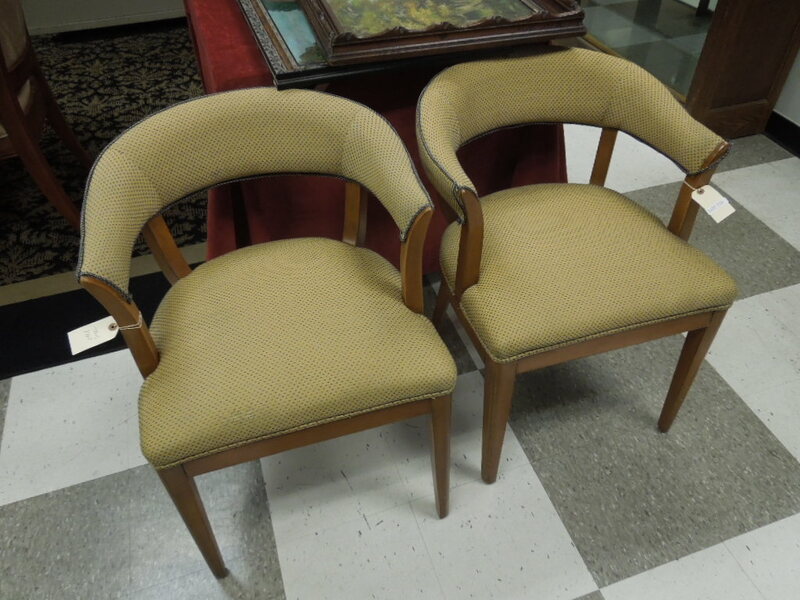 Lot 178: Pair Of Beachley Furniture Fabric Upholstered Swivel Armchairs. Lot 179: Set Of (4) Arnoldi, Pencil Signed And Numbered Prints. 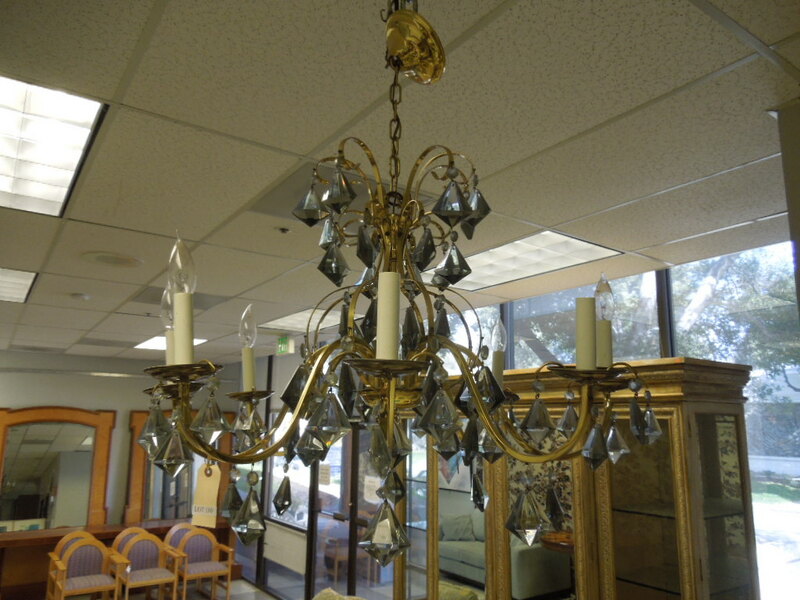 Lot 180: Brass 8-Light Chandelier With Smoke Glass Crystals And Additional Crystals. 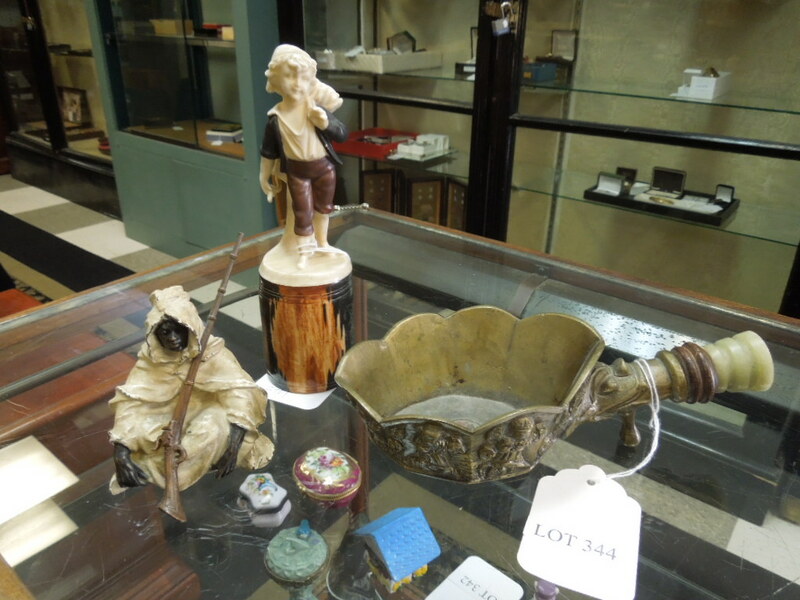 Lot 181: Bavarian Porcelain Sprite Figural Vase And Italian Porcelain Figure Of A Seated Lady. 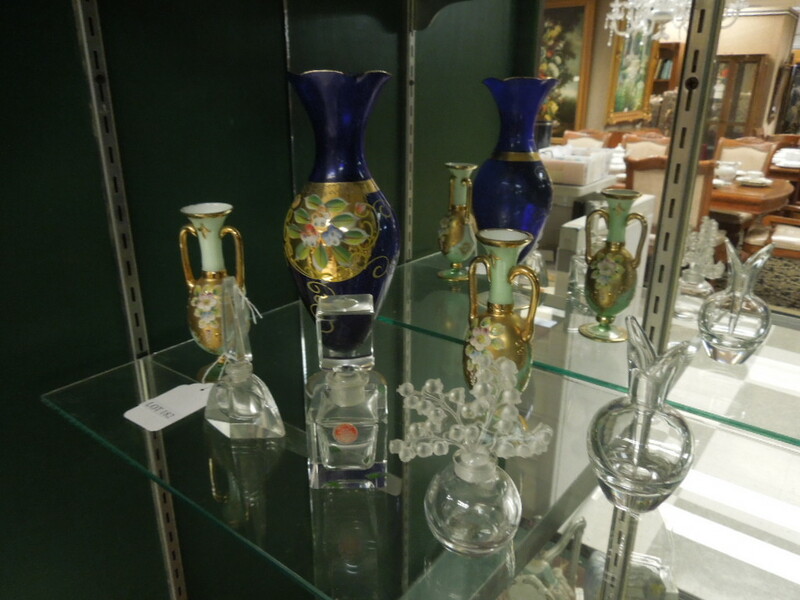 Lot 182: Group Of Crystal Stoppered Scent Bottles And Bud Vases. 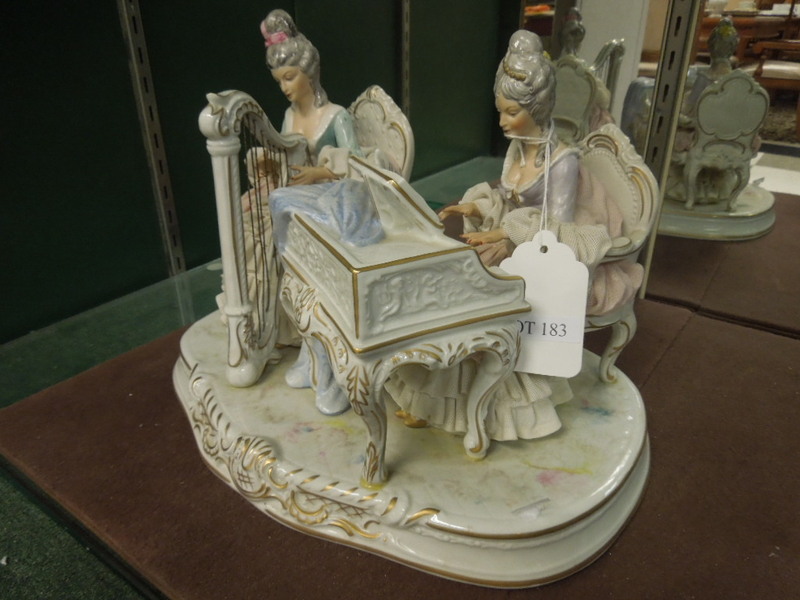 Lot 183: Dresden Porcelain Figural Group, 18th C. Lady Musicians. (9.5" X 13" X 9"). 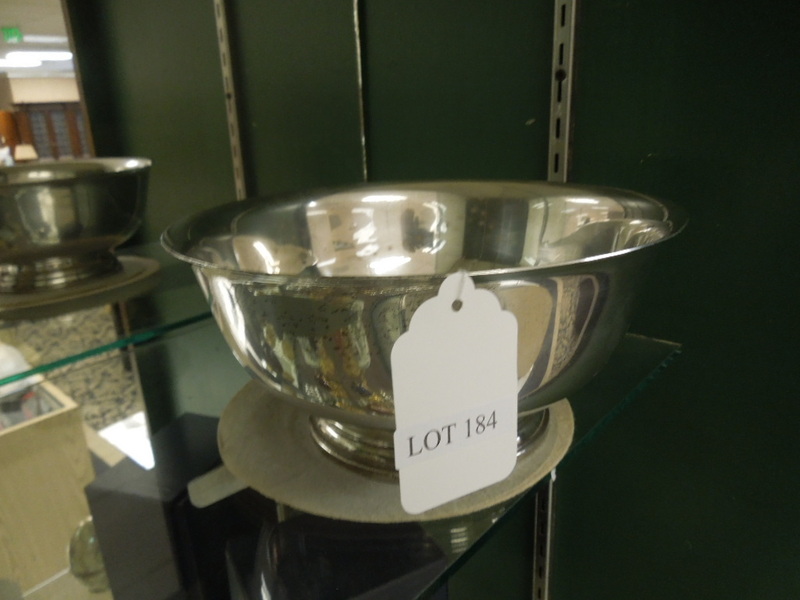 Lot 184: Newport Sterling Silver Footed Bowl. (4 1/4" X 9"). (20.34 Ozt). 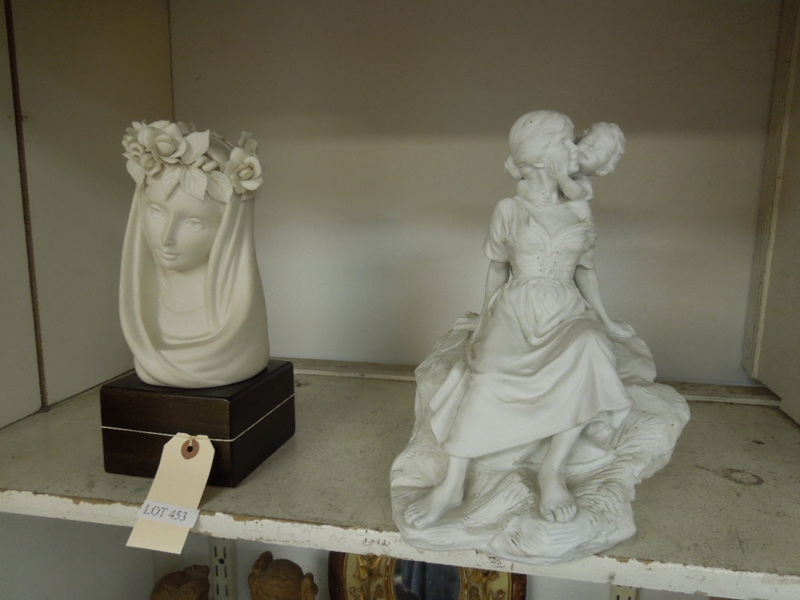 Lot 185: (2) Continental Fine Porcelain Figures. 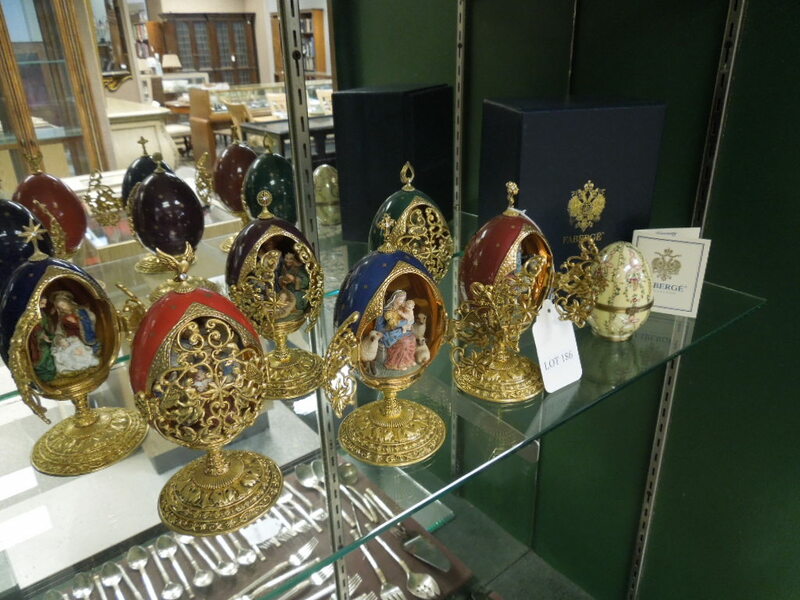 Lot 186: House Of Faberge, Group Of (6) Iconic Decorative Eggs And An Oviform Container With Box. 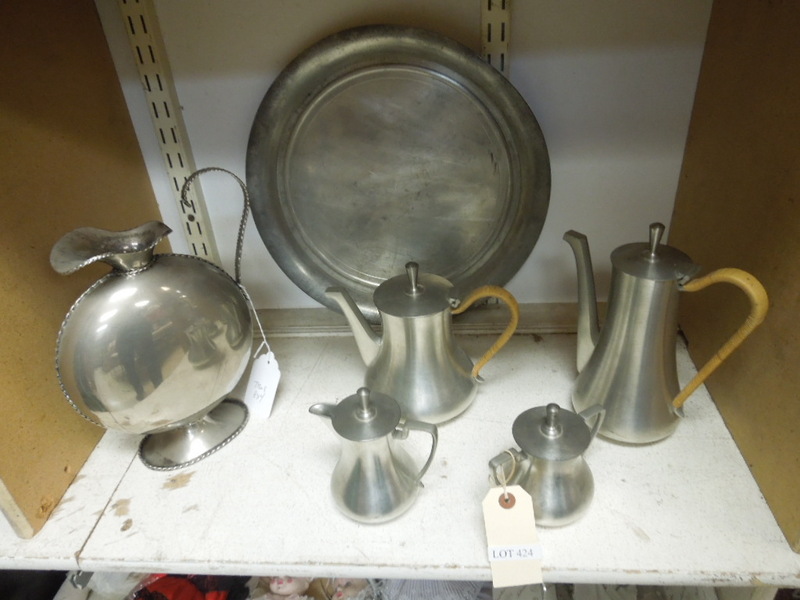 Lot 187: Paul Revere Reproduction Sterling Silver Bowl, Poole Sterling Paul Revere Reproduction Creamer And A Poole Sterling Waste Bowl. (14.31 Ozt). Lot 188: Wallace "Golden Aegean Weave" Sterling Silver Flatware. 49 Pieces. Several Knife Blades Rusted. (58.85 Ozt Excluding Knives And Cake Server). 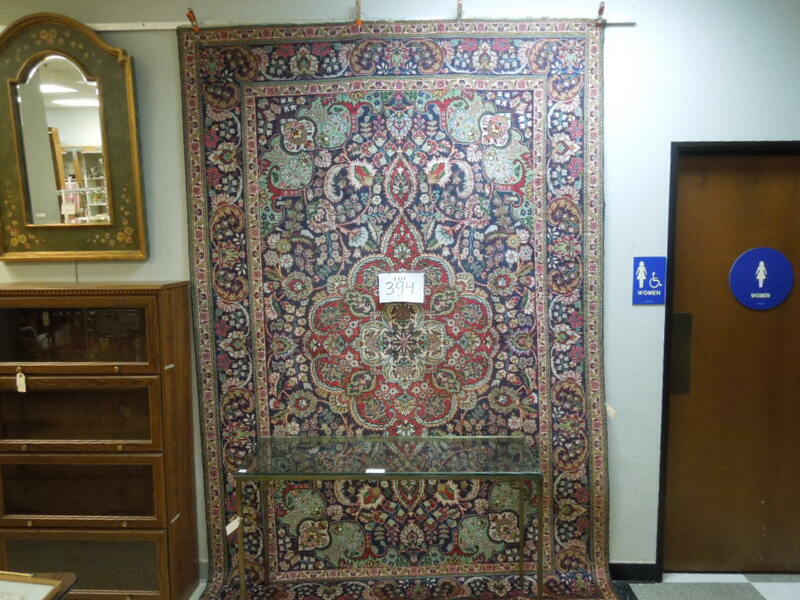 Lot 190: Kashan Hand Knotted Rug. (Approx. 11' X 8'). Lot 191: Collection Of Modern Age Comics Incl. Jla, House Of Secrets, Ghost In The Shell, Buffy. (Approx. 250). 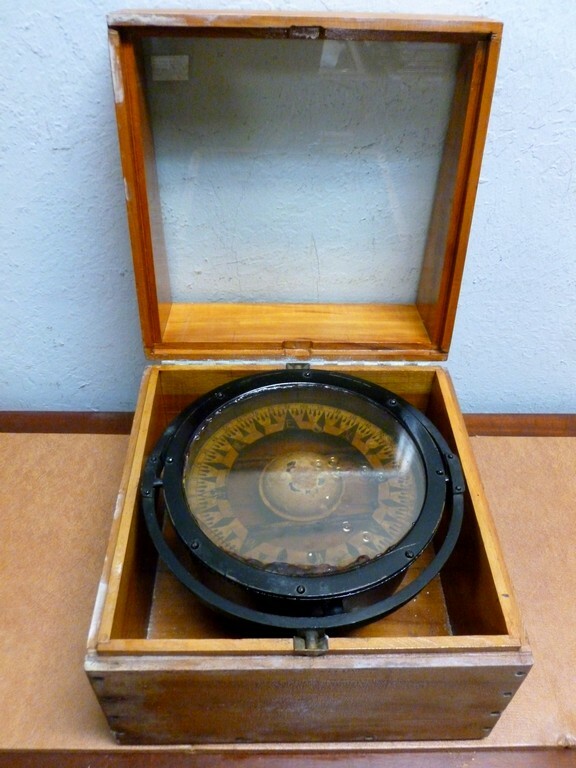 Lot 192: Naval Ship's Compass In Display Box. 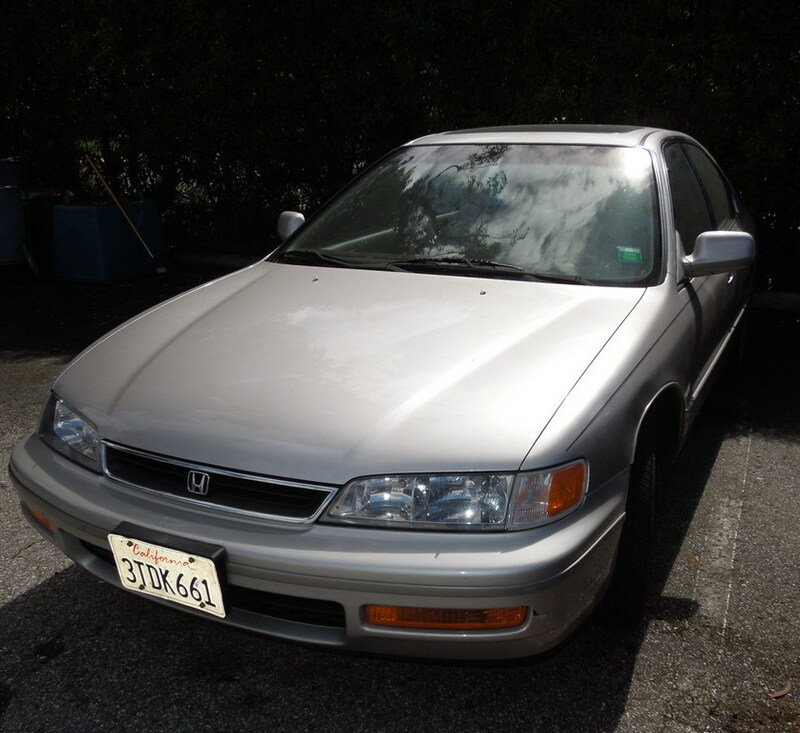 A. Leitz Co. Sf. 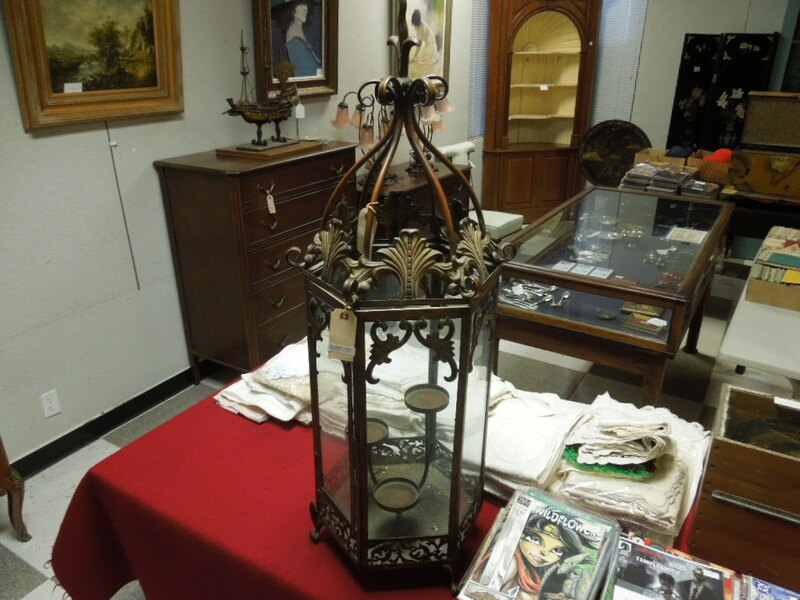 Lot 193: Contemporary Wrought Metal And Glass Paneled Octagonal Candle Stand. (42" Tall). 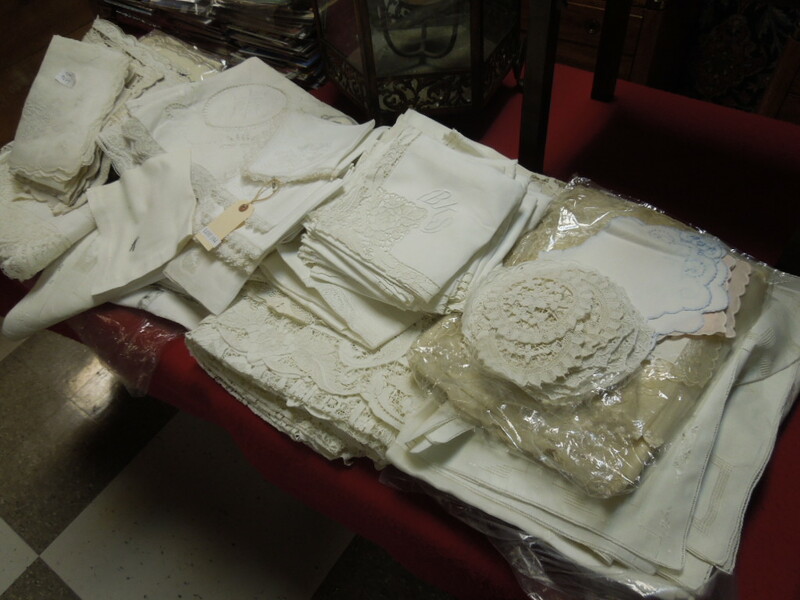 Lot 194: Group Of Hand Stitched Table Linen Sets. 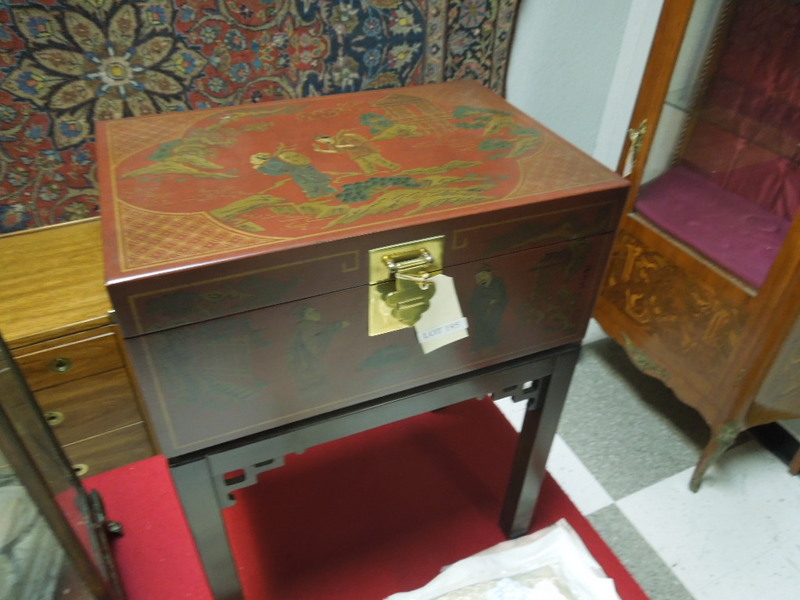 Lot 195: Oriental Red Lacquered Lidded Box On Stand. (22" Tall). 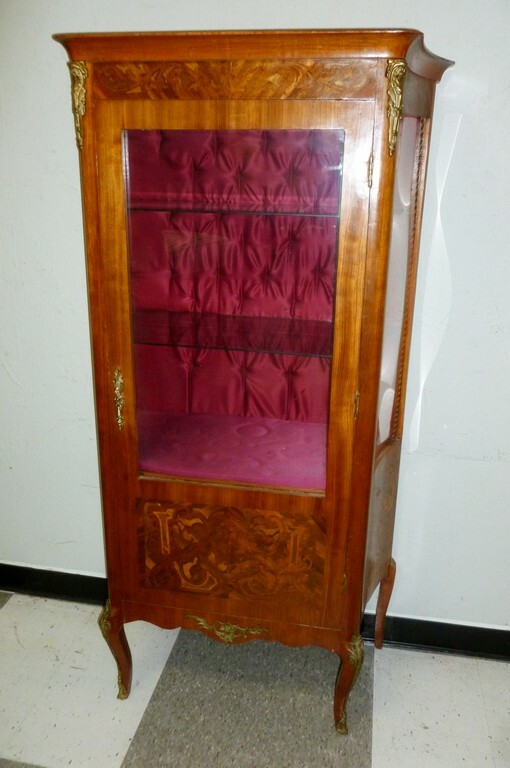 Lot 196: Continental Marquetry Inlay 3-Shelf Vitrine. 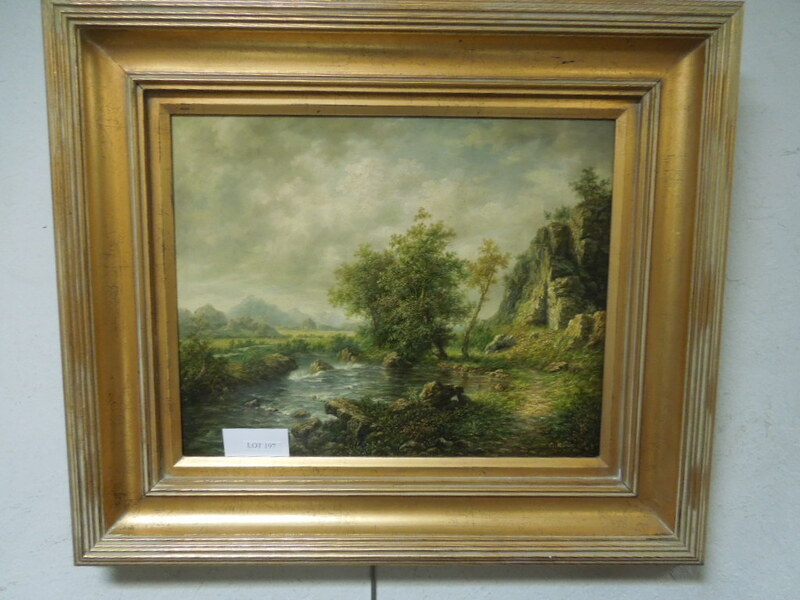 Lot 197: Gilt Framed Oil On Board, Wooded Landscape With Creek, Signed Lower Right. (16" X 20"). 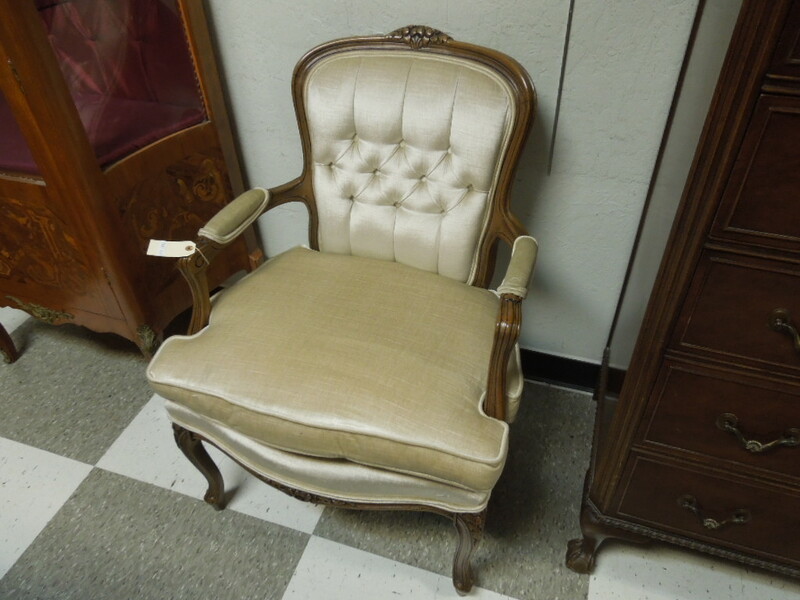 Lot 198: Fogle Furniture Provincial Style Walnut Armchair With Satin Upholster. Masterpiece Collection. 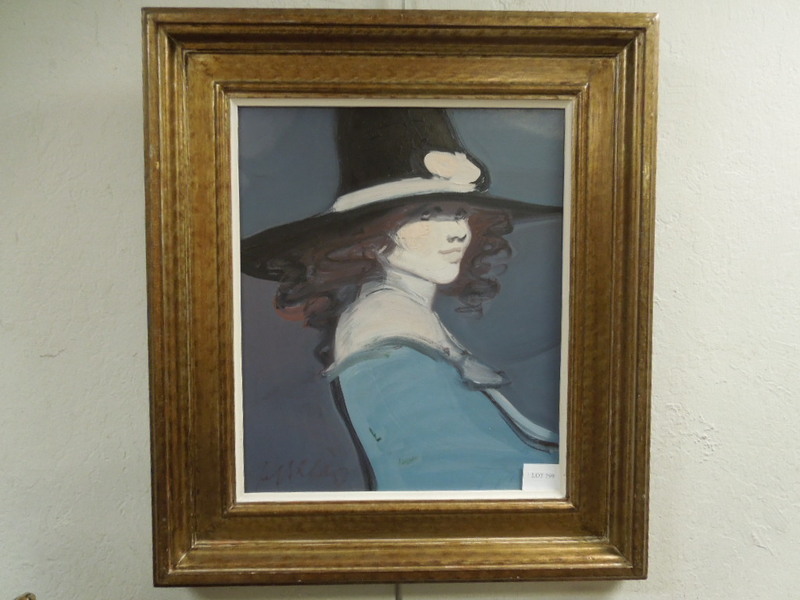 Lot 199: Juan Garces Oil On Board, Lady With Hat In Blue And Black. Signed. (21" X 18"). Framed. 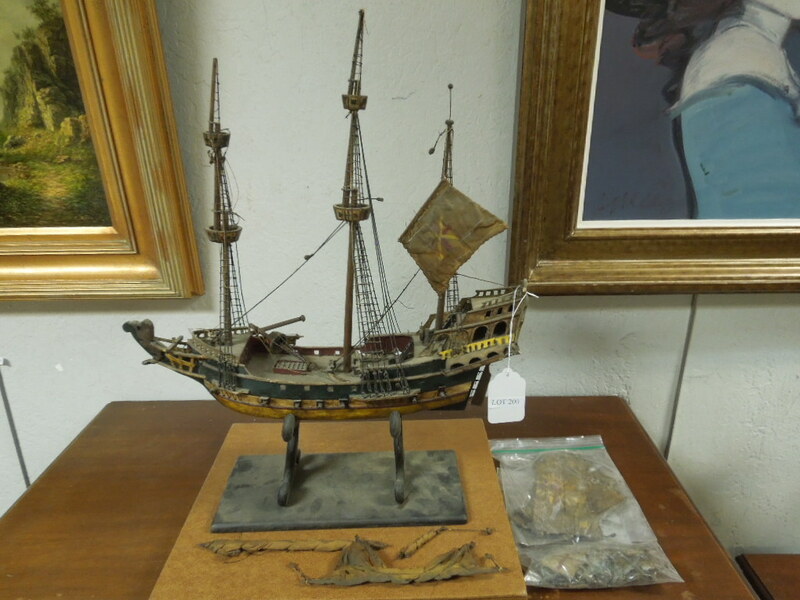 Lot 200: Model Ship Of A Spanish Galleon On Stand. (22" X 20"). 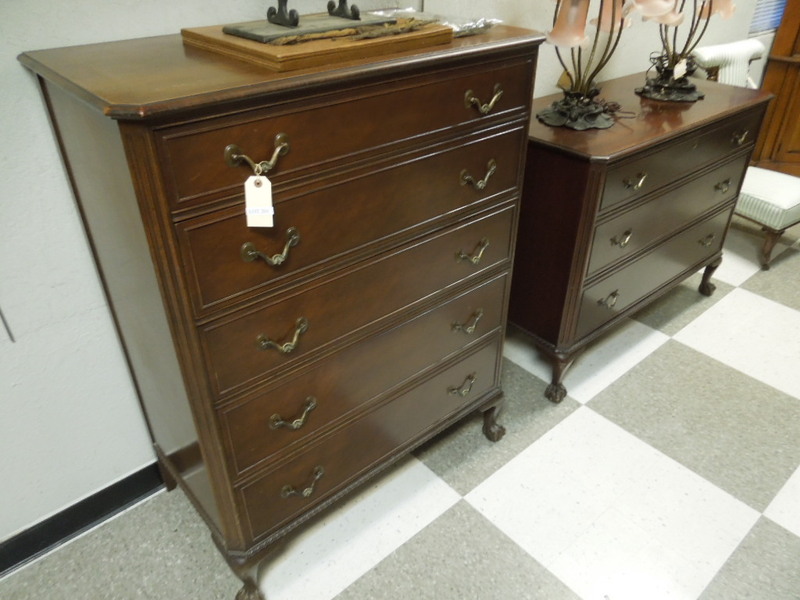 Lot 201: Mid 20th C. Mahogany Chippendale Style 2-Pc Bedroom Set. 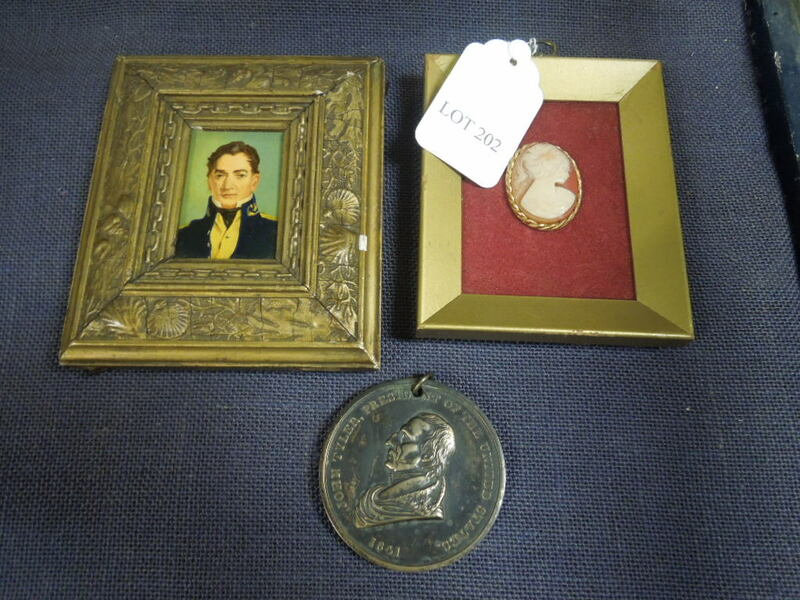 Lot 202: Framed Miniature Portrait, Cameo And A Commemorative Medallion. 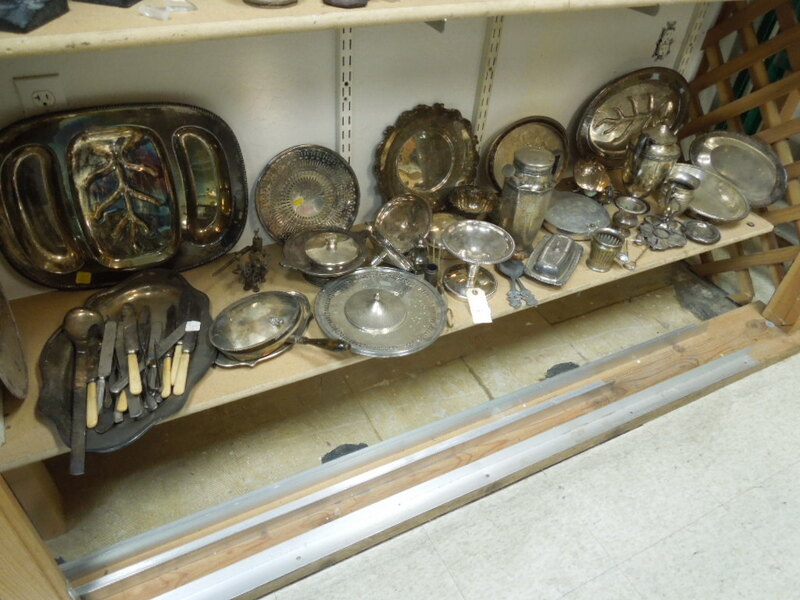 Lot 203: Group Of Sterling Silver Flatware Incl. 19th C. English (20 Pcs, Approx. 13.73 Ozt). 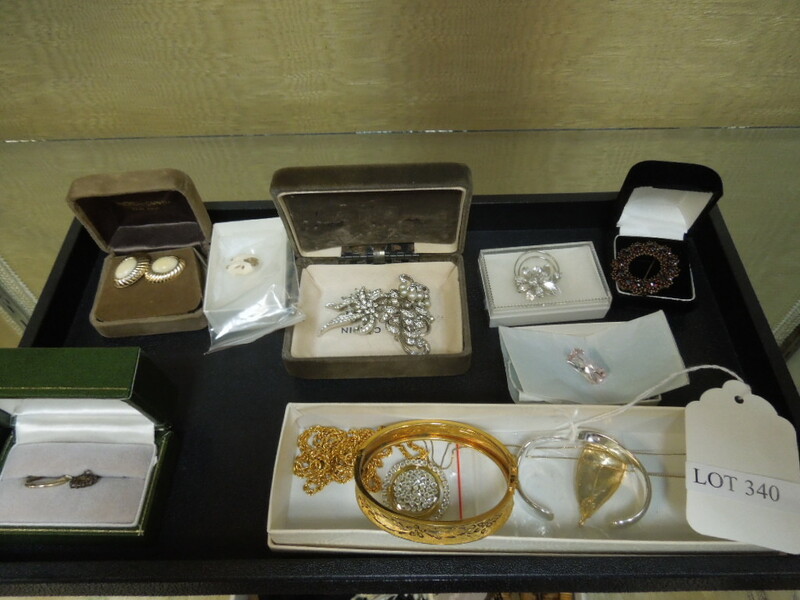 Lot 204: Group Of Costume Jewelry, Buckles And Watches. 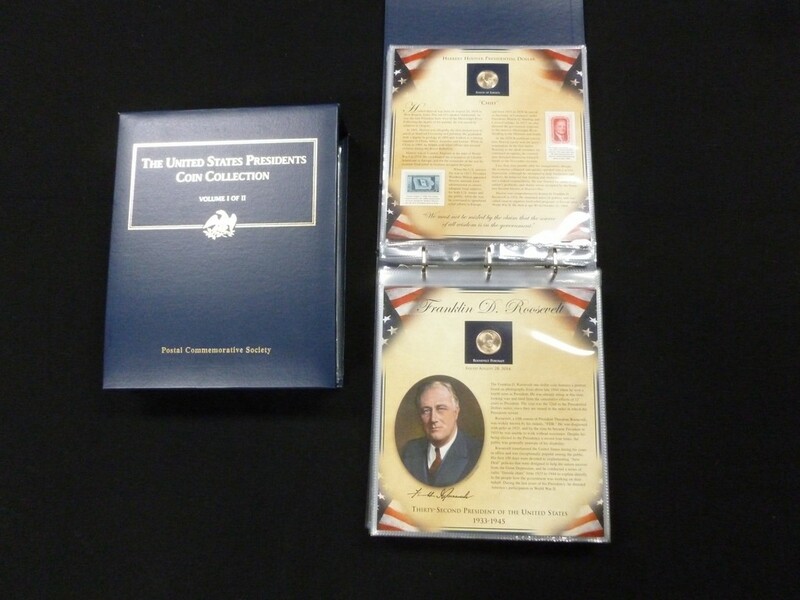 Lot 205: (3) Sets Of U.S. Mint Proof And Silver Proof Sets. 1999, 2000, 2001. 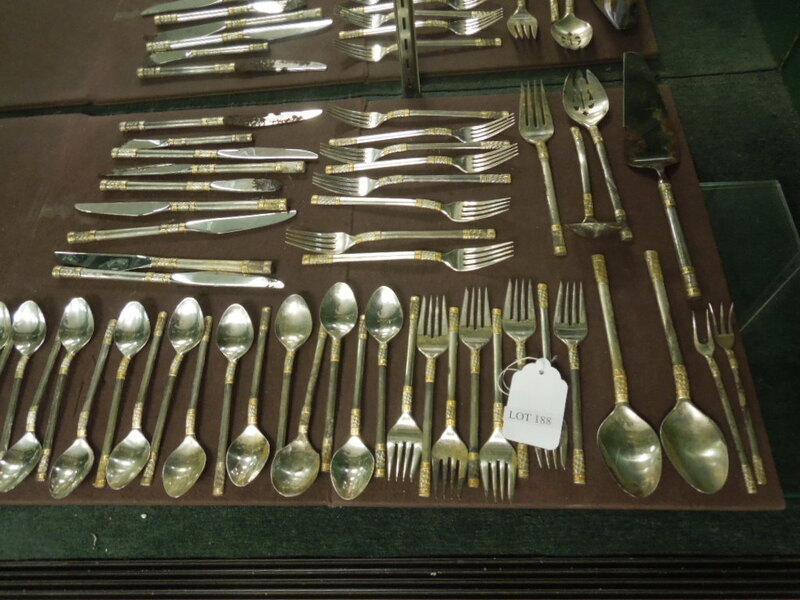 Lot 206: Group Of Sterling Silver Flatware. (20 Pcs, 9.65 Ozt Excluding Sterling Handled Knife). 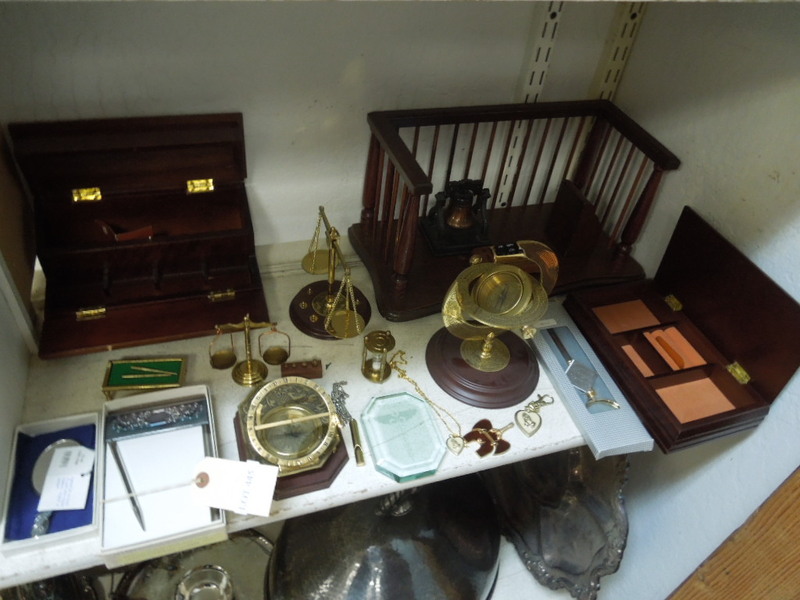 Lot 207: Group Of Sterling And Silver Plated Items Incl. Shakers. 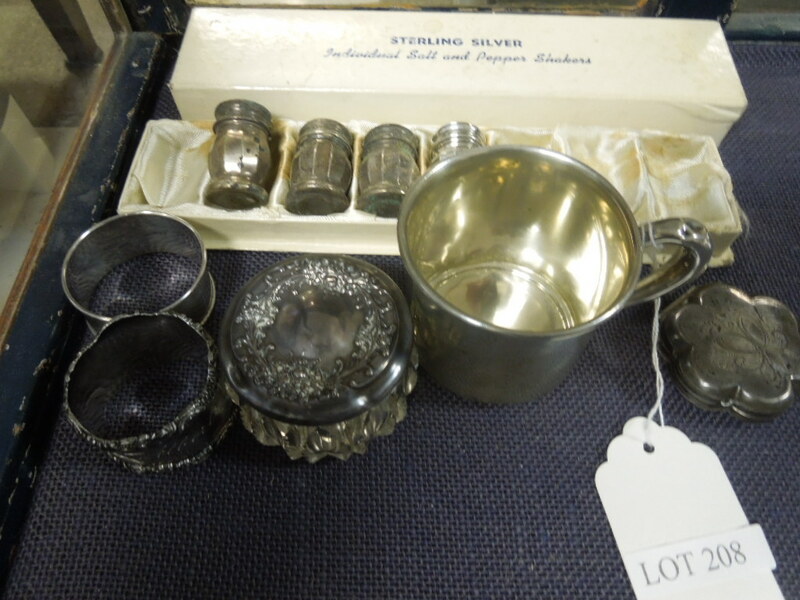 Lot 208: Sterling Silver Cup, 2 Vanity Items, Shakers And Napkin Rings. (9). 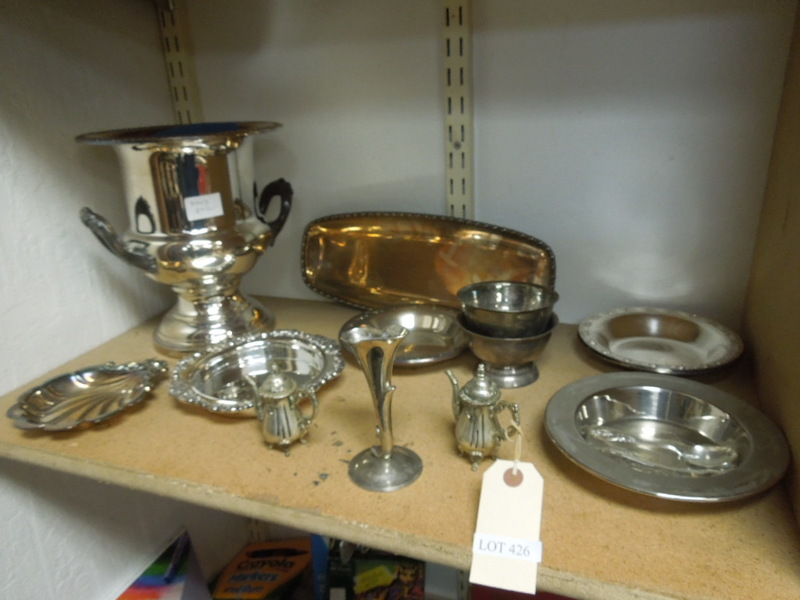 Lot 209: Group Of Sterling And Silver Plated Tableware Items. 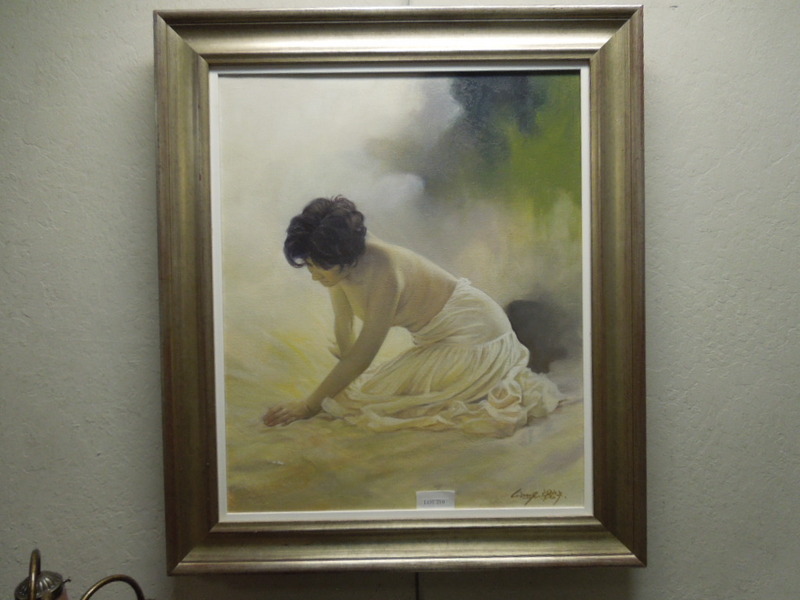 Lot 210: L'ang Diaz Oil On Canvas, Woman Kneeling. Signed. (28" X 23"). Framed. 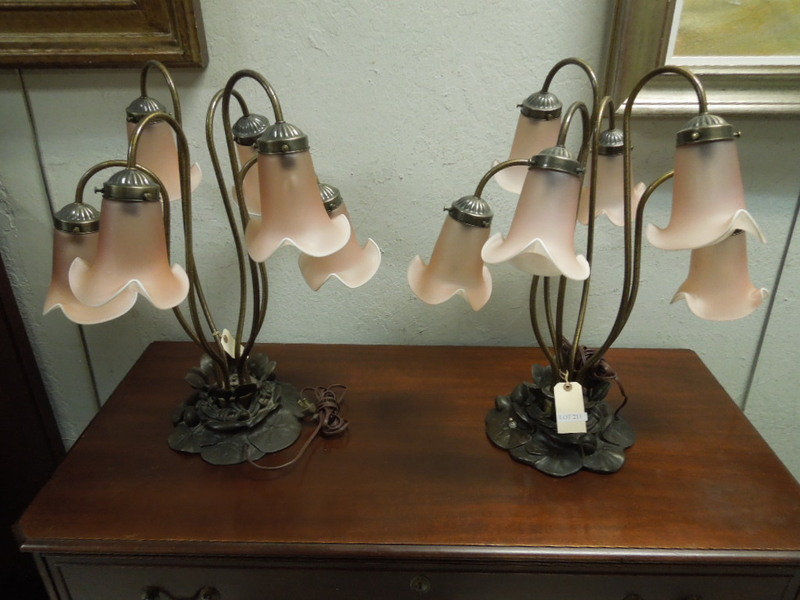 Lot 211: Pair Of Contemporary Lily Form Table Lamps. 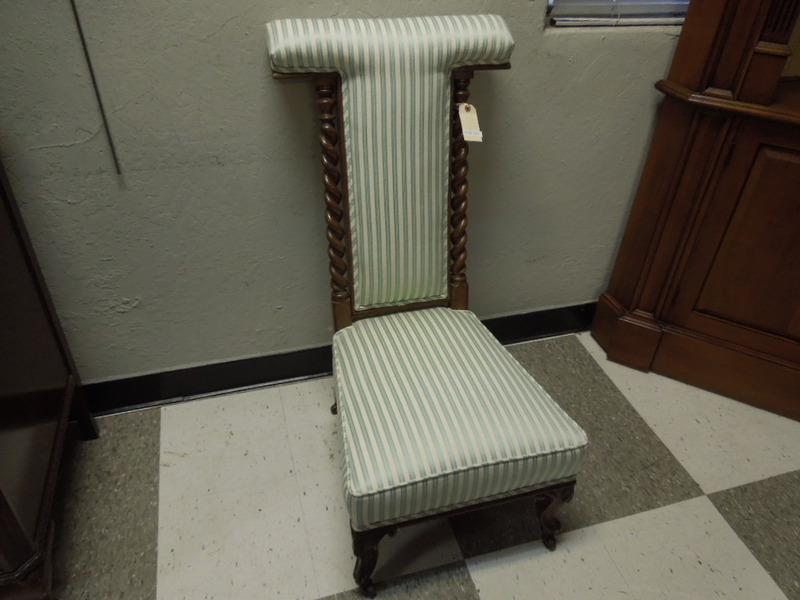 Lot 212: Early 20th C. Barley Twist Low Chair With Striped Fabric Upholstery. 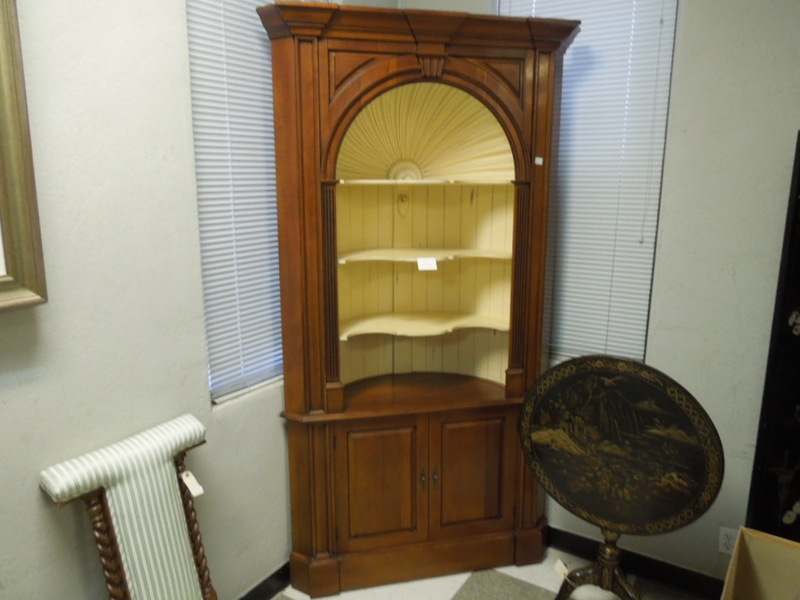 Lot 213: Contemporary Corner Cabinet With 3 Shelves And 2 Doors. 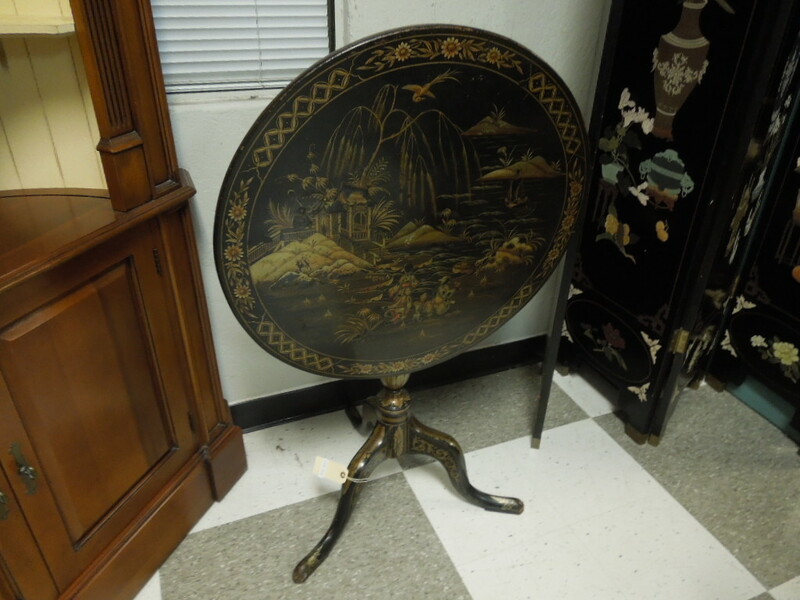 Lot 214: Oriental Hand Painted Tilt Top Pedestal Table. 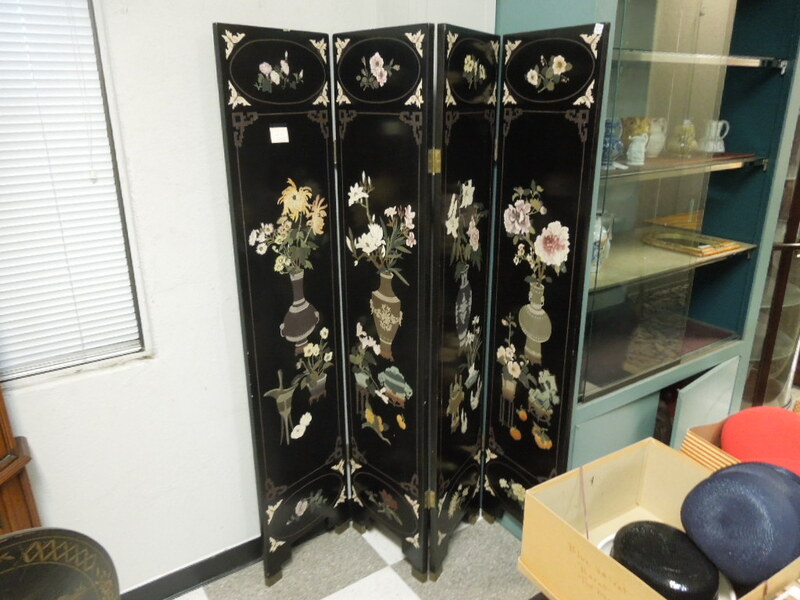 Lot 215: Oriental 4-Panel Black Lacquer Reversible Screen. Flowers In Vases Decoration. Lot 216: Group Of Modern Age Comics Incl. X-Men, Punisher, Preacher & Fantastic 4. (Approx. 270). 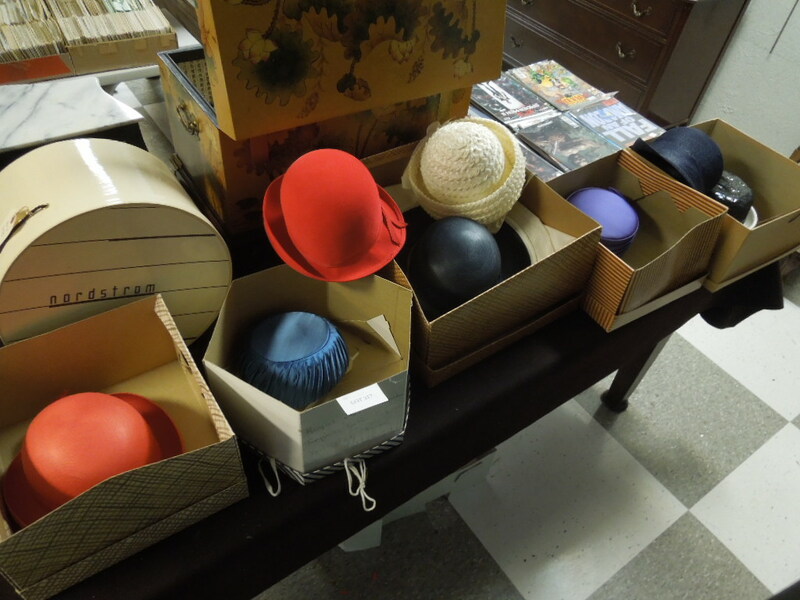 Lot 217: Group Of Ladies' Vintage Hats And Hat Boxes. 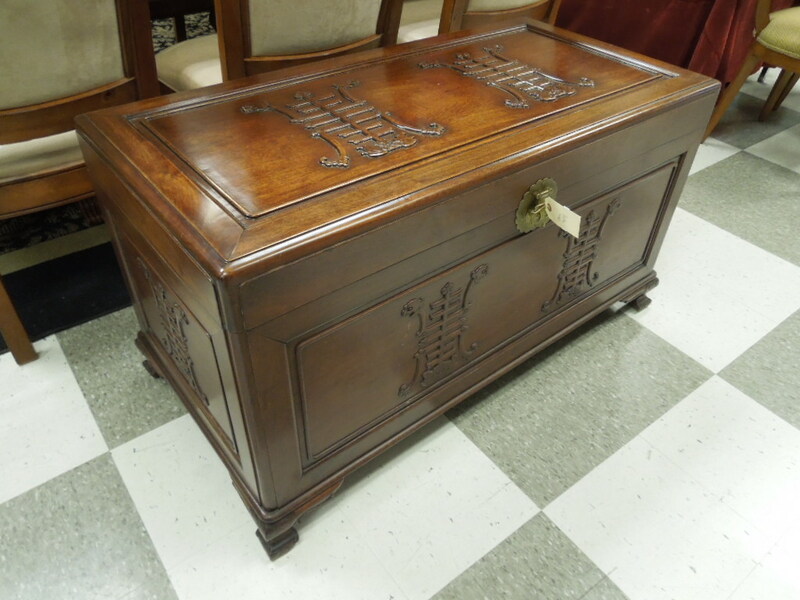 Lot 218: Oriental Style 2-Drawer Table Top Bombe Chest. 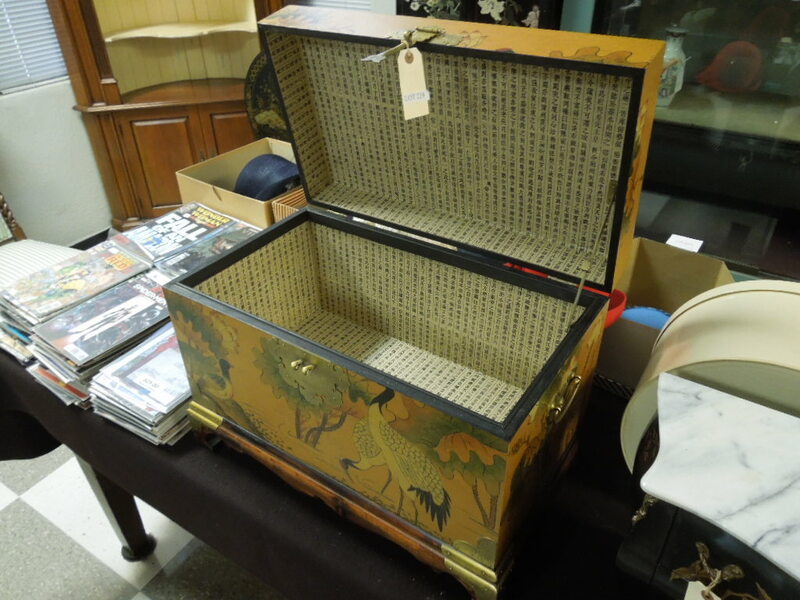 Lot 219: Oriental Lidded Box And Stand. (23" X 13" X 16"). 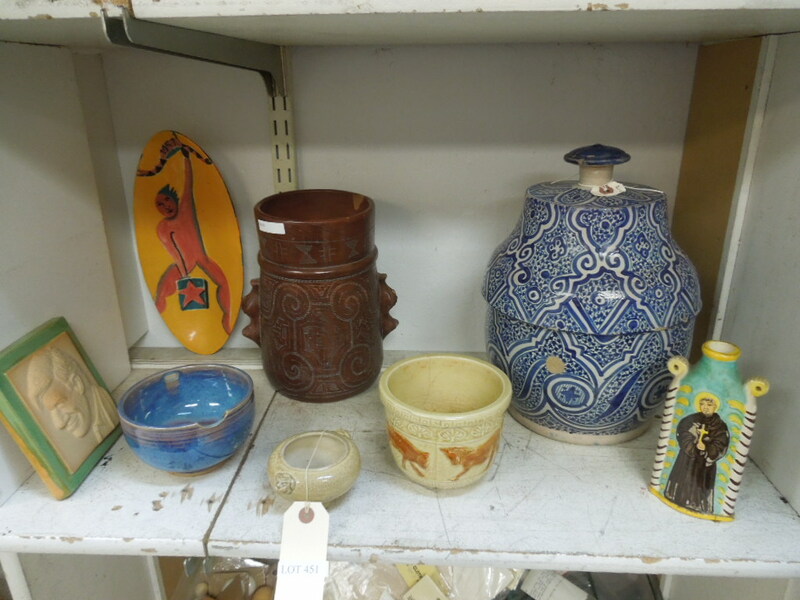 Lot 220: Shelf Of Pottery Items Incl. Wedgwood Pitchers, Salt Glazed Beer Stein. (7 Pcs). 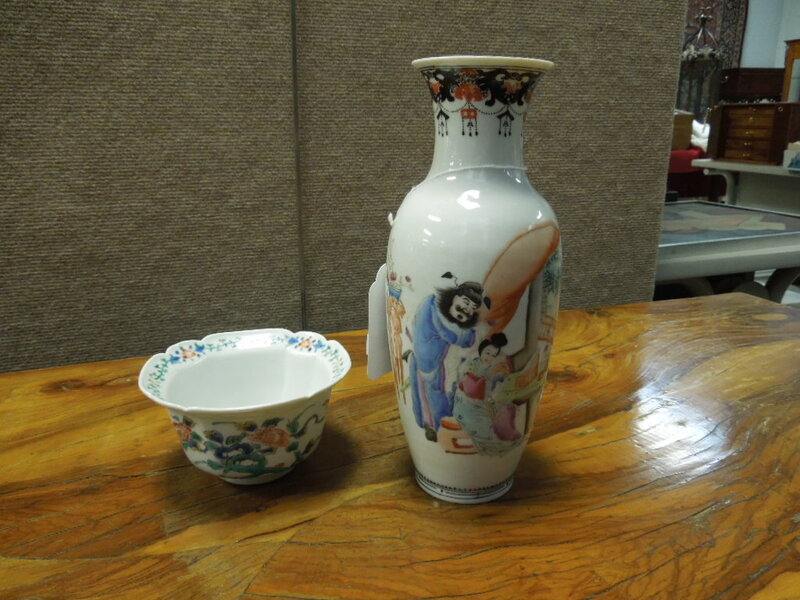 Lot 221: Oriental Fine Porcelain Hand Painted Vase And A Footed Bowl. 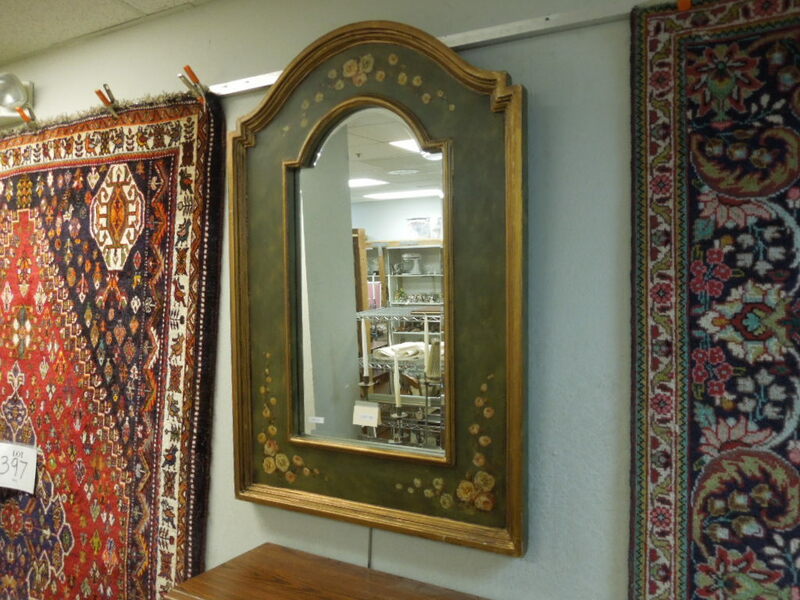 Lot 222: Middle Eastern Style Stone And Metal Framed Wall Mirror. (14" X 11"). 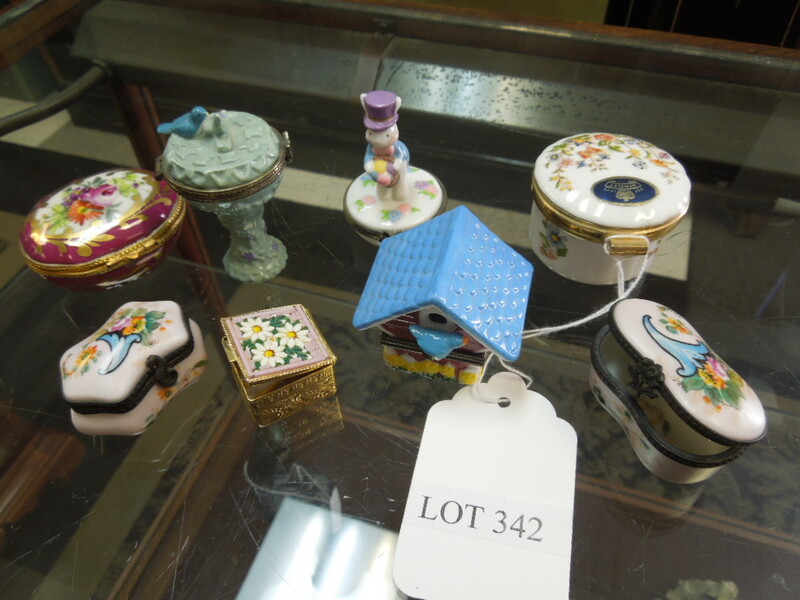 Lot 223: Group Of Asstd. Artwork, Incl. 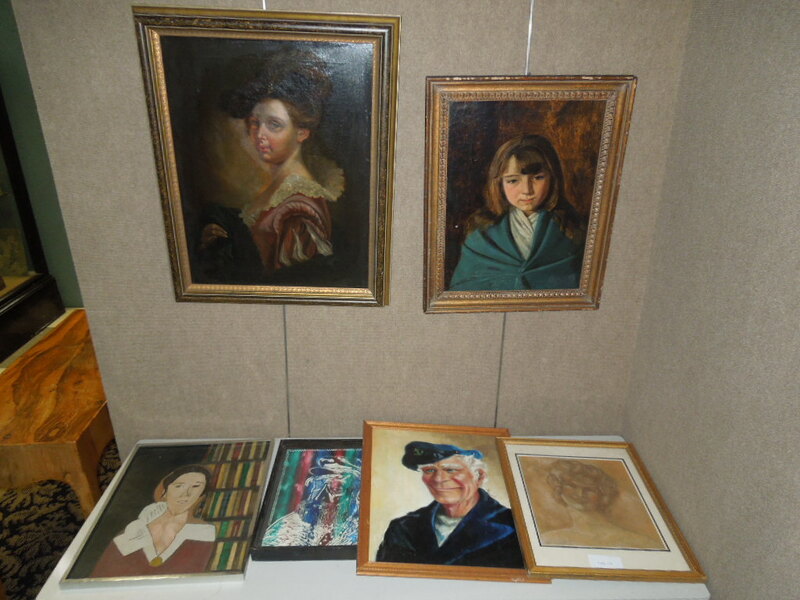 Oils, Portraits, Relief Carving. 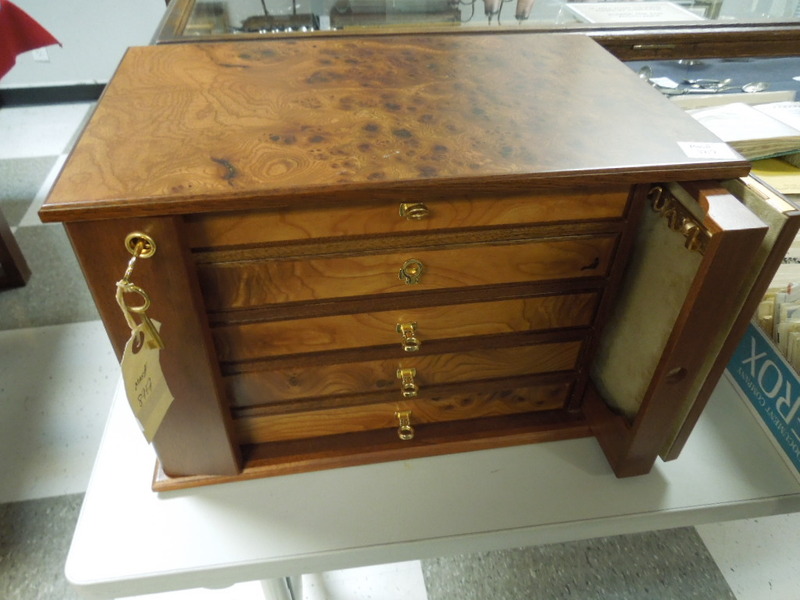 Lot 224: Burl Wood Veneer Dresser Top Jewelry Box. 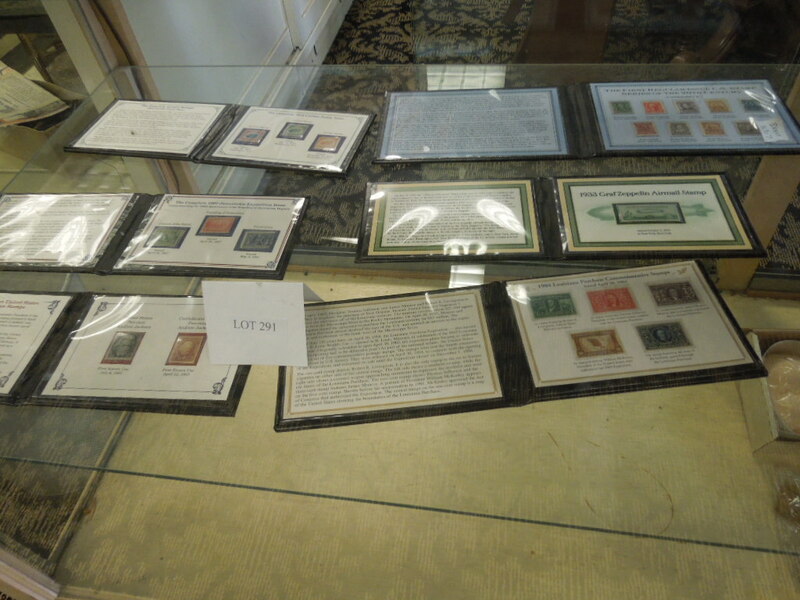 Lot 225: (4) Boxes Of Stamps And First Day Covers. 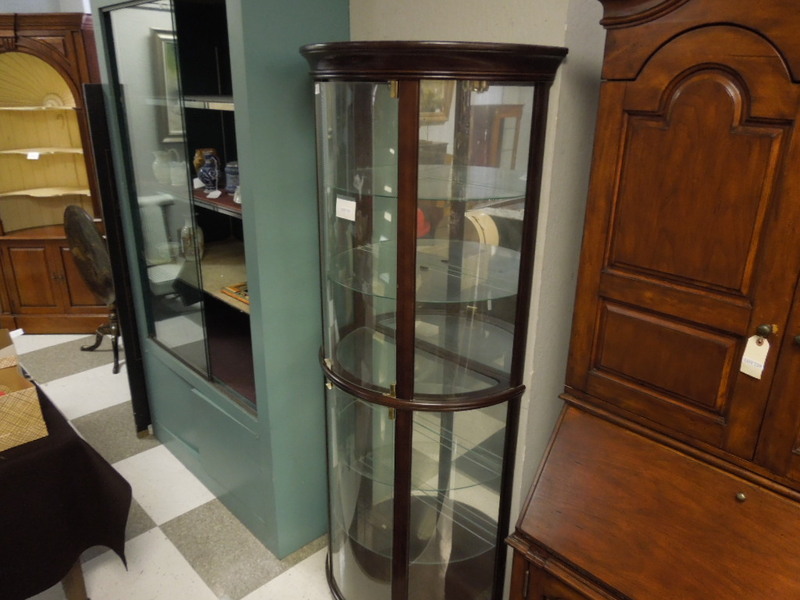 Lot 226: Contemporary Mahogany 5-Shelf Curio Cabinet. 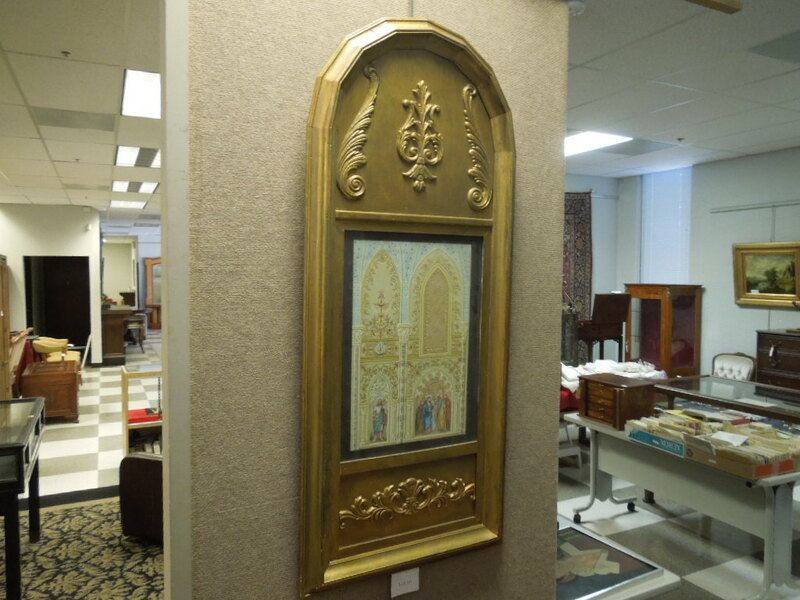 Lot 227: Hand Painted Panel Depicting Interior Portion Of A Church. Gilt Framed. (17.5" X 11.5"). 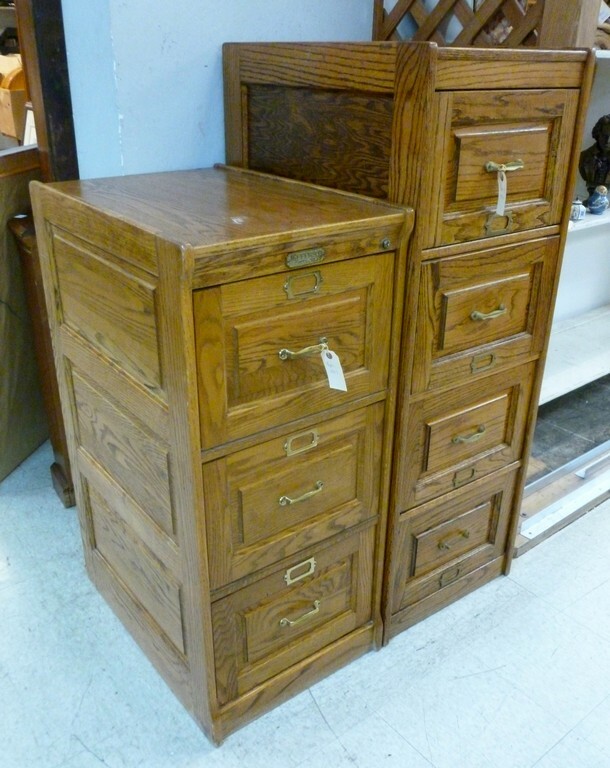 Lot 228: Continental Fruitwood 3-Drawer Bureau Plat. 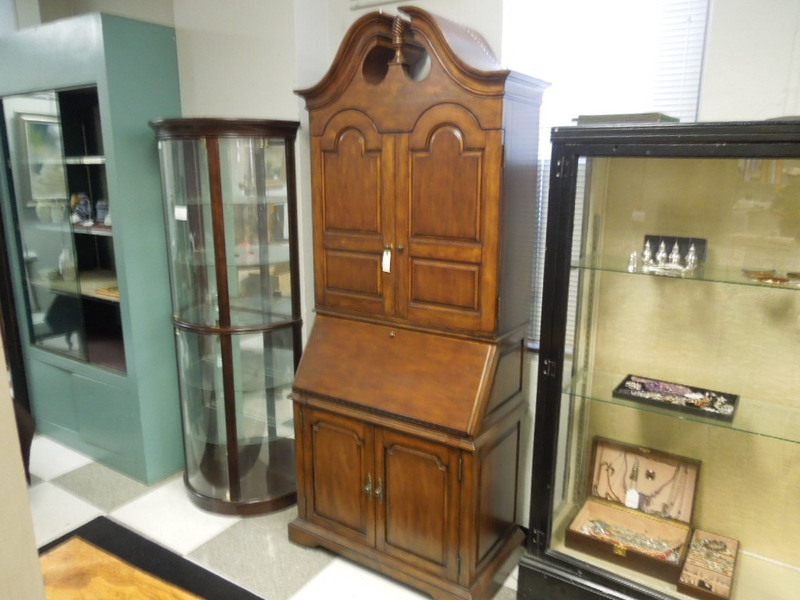 Lot 229: Contemporary 4-Door Drop Front Secretaire. Lot 230: Group Of Modern Age Comics Incl. Vampirella, Avengelyne, Witch Blade. (Approx. 180). 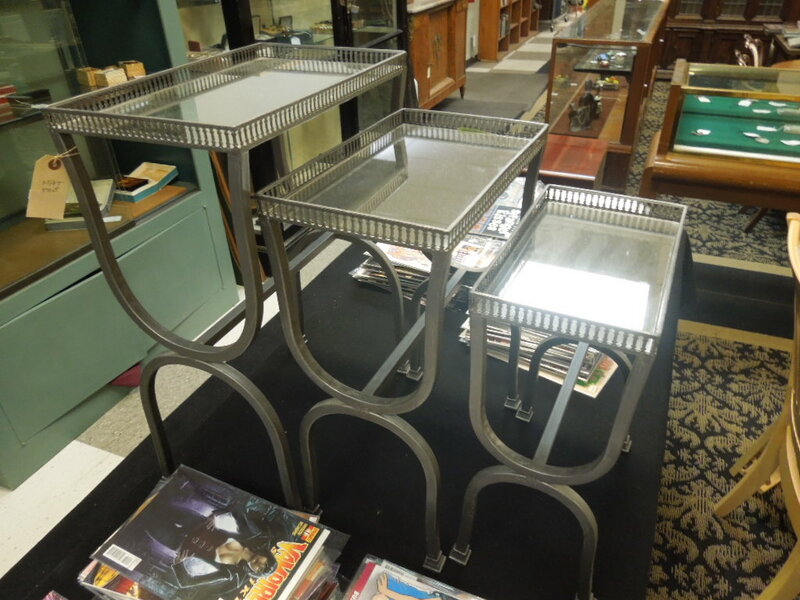 Lot 231: Set Of (3) Mirror Top Contemporary Metal Tables With Galleried Tops. 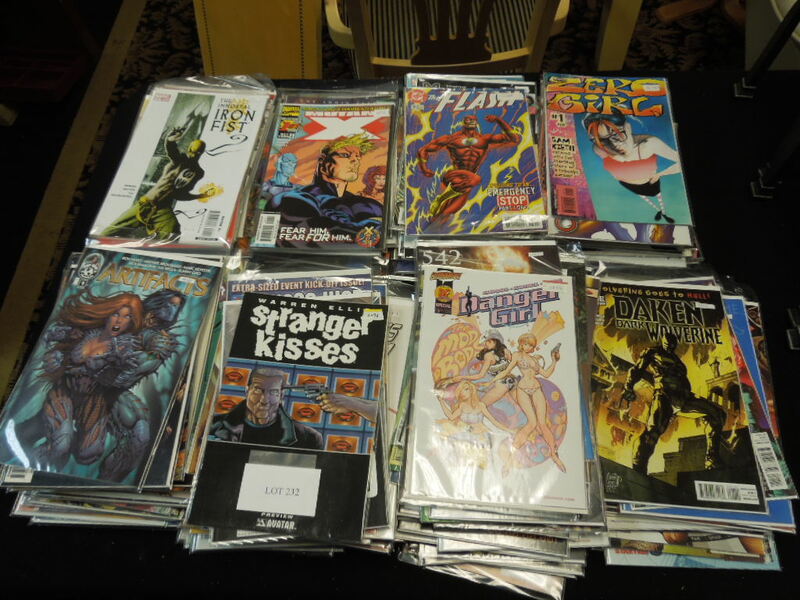 Lot 232: Group Of Modern Age Comics Incl. Spawn, Jla, Flash, Hellboy. (Approx. 250+). 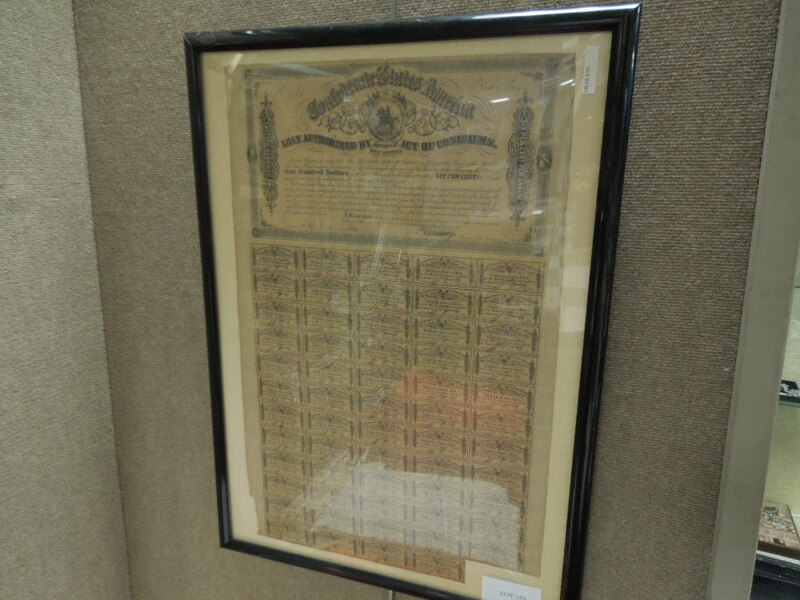 Lot 233: Framed Csa Sheet Of 3 Dollar Bonds. C. 1864. 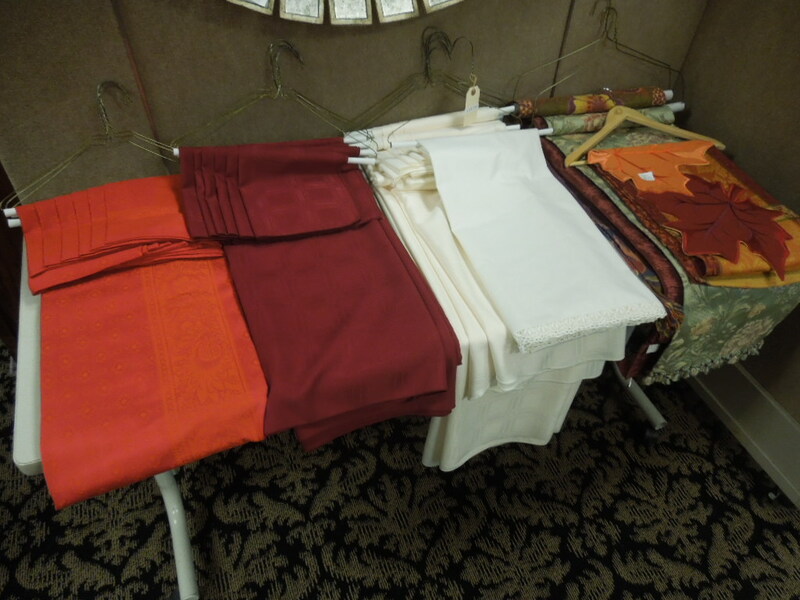 Lot 234: Group Of Fine Table Linen Sets. 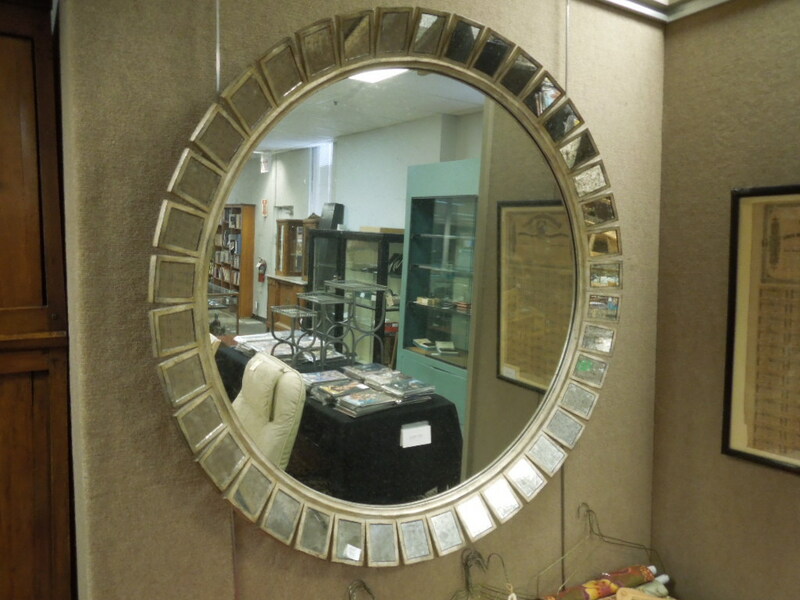 Lot 235: Contemporary Segmented Star Burst Mirror. (48" Dia). 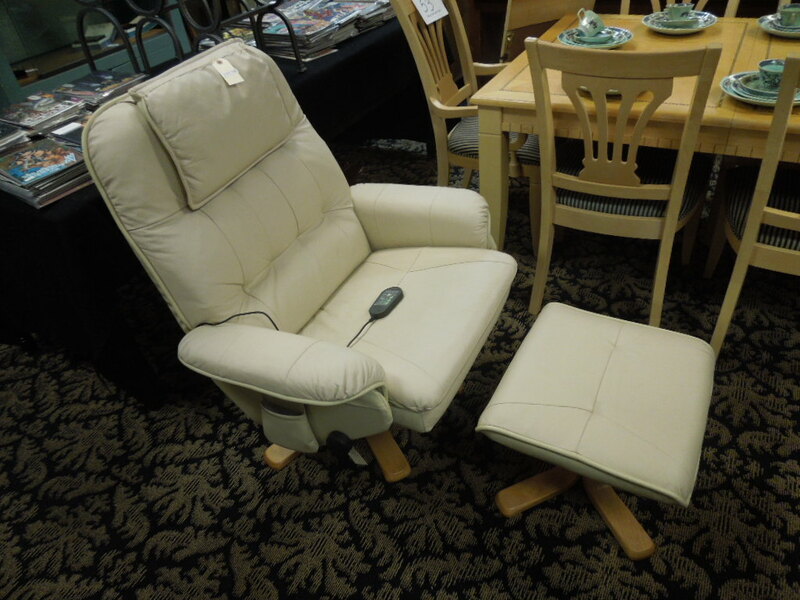 Lot 236: Modern Leather Upholstered Swivel Recliner And Ottoman. 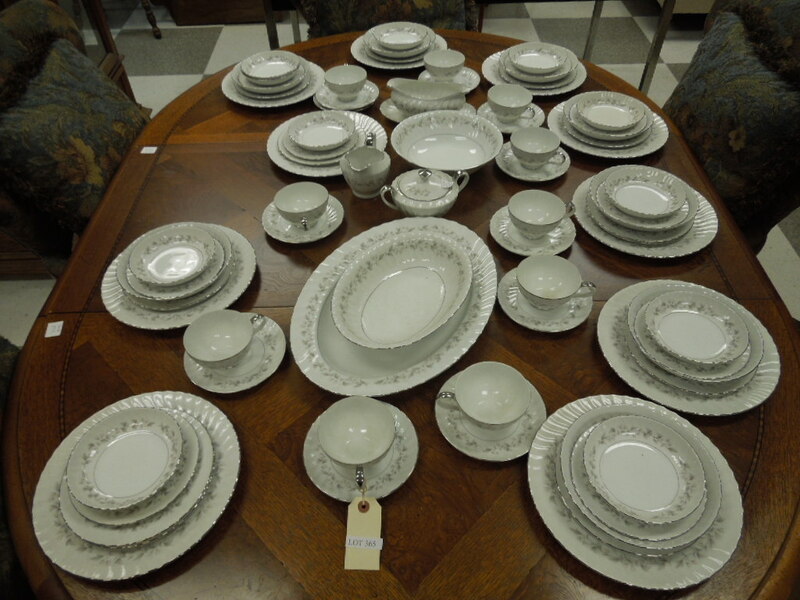 Lot 237: Adams Ironstone Dinnerware Set. 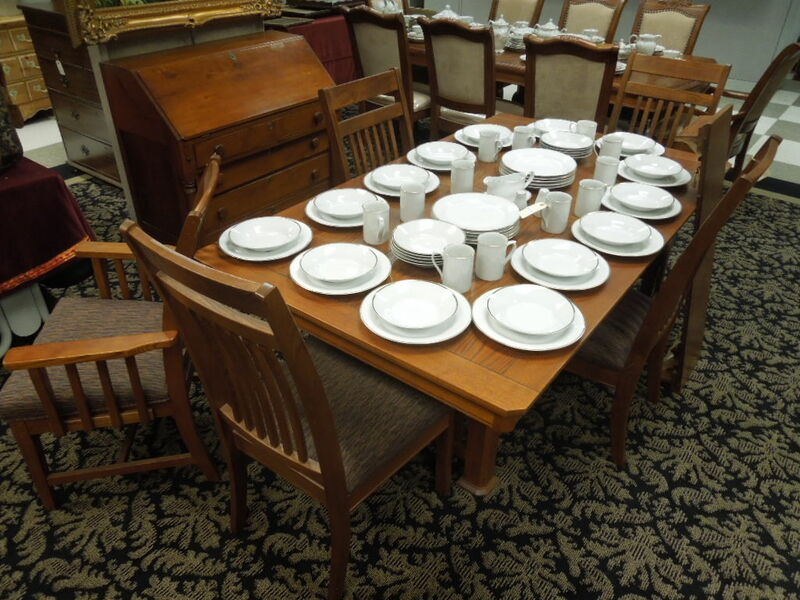 Lot 238: Contemporary Blonde Wood Dining Table With 1 Leaf And 6 Chairs. 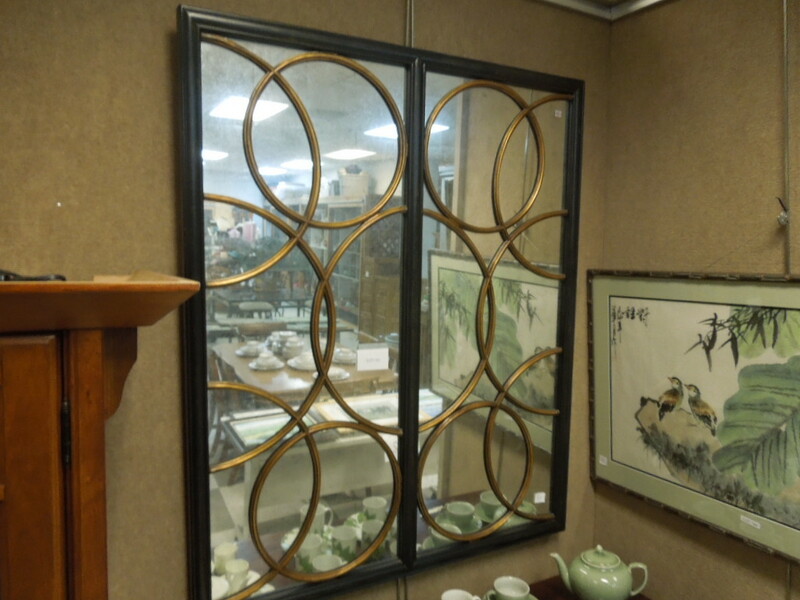 Lot 239: Oriental Hand Painted Wall Mirror. 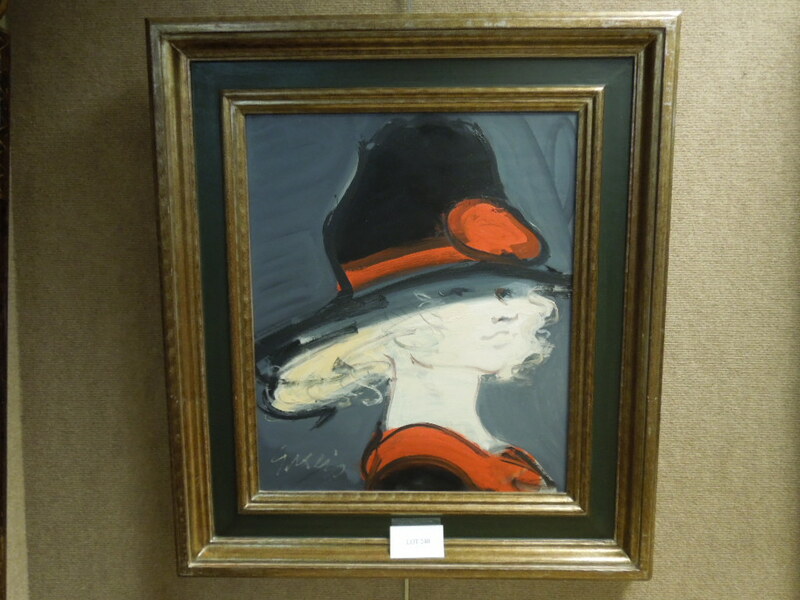 Lot 240: Juan Garces Oil On Board, Lady In Red And Black, Signed. (20" X 18"). 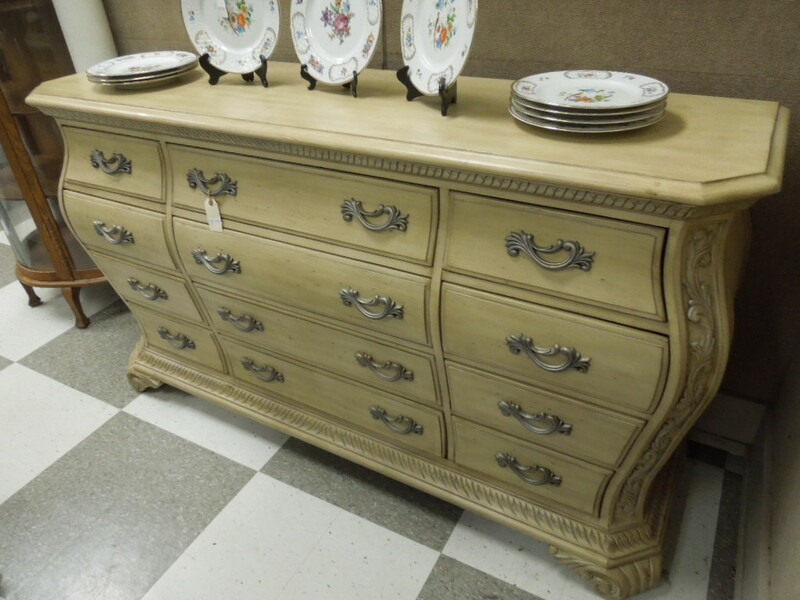 Lot 241: Wynwood Contemporary 12-Drawer Dresser. 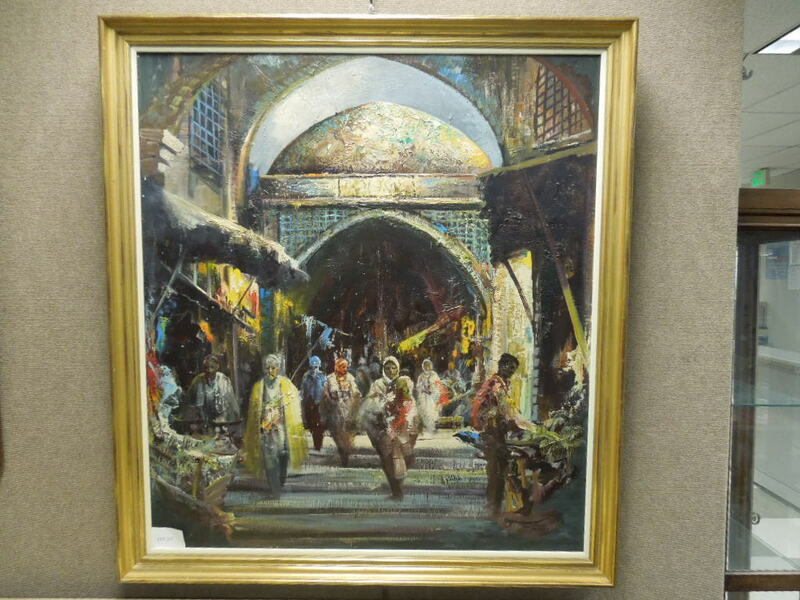 Lot 242: Rahnavardkar Anoush, Oil On Canvas, Bazaar. Signed. (40" X 36"). Framed. 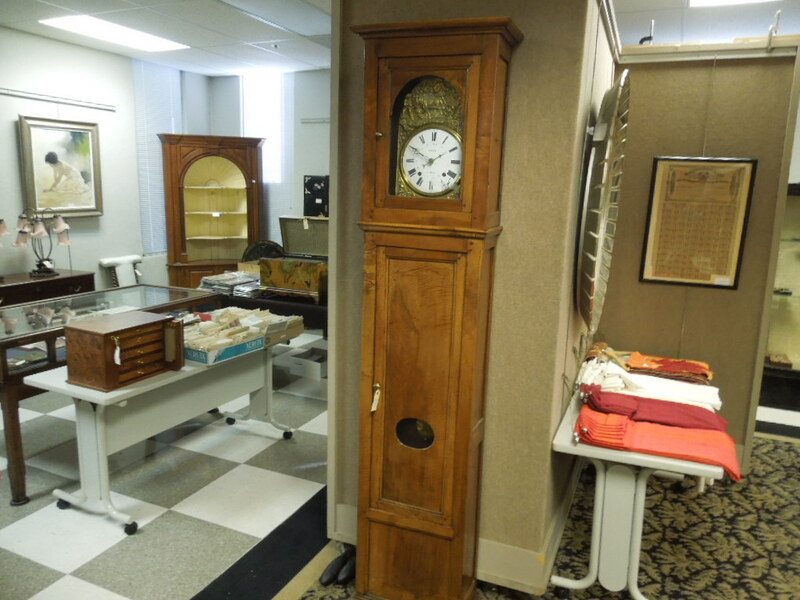 Lot 243: 19th C. Continental Walnut Grandfather Clock. 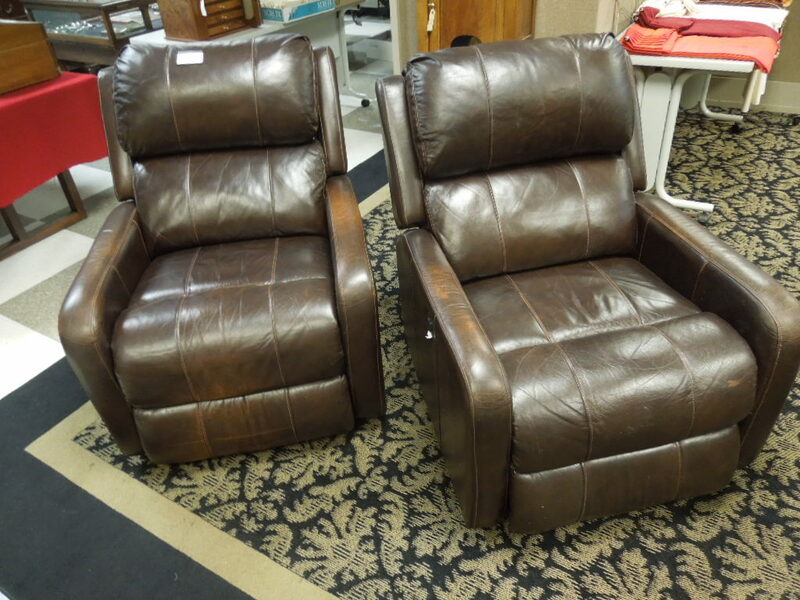 Lot 244: Pair Of Contemporary Leather, Power Recliners. 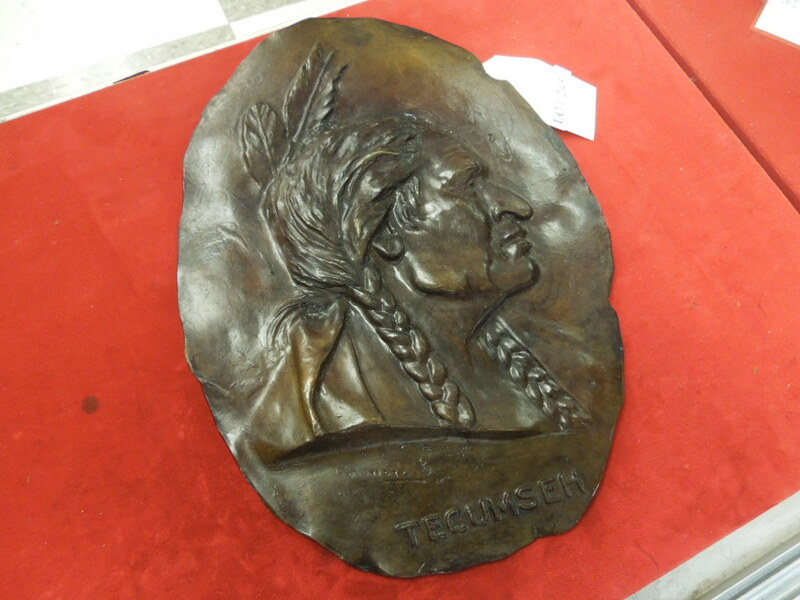 Lot 245: Bronze Oval Plaque, Portrait Of Tecumseh, Signed. (12.5" X 9.5"). 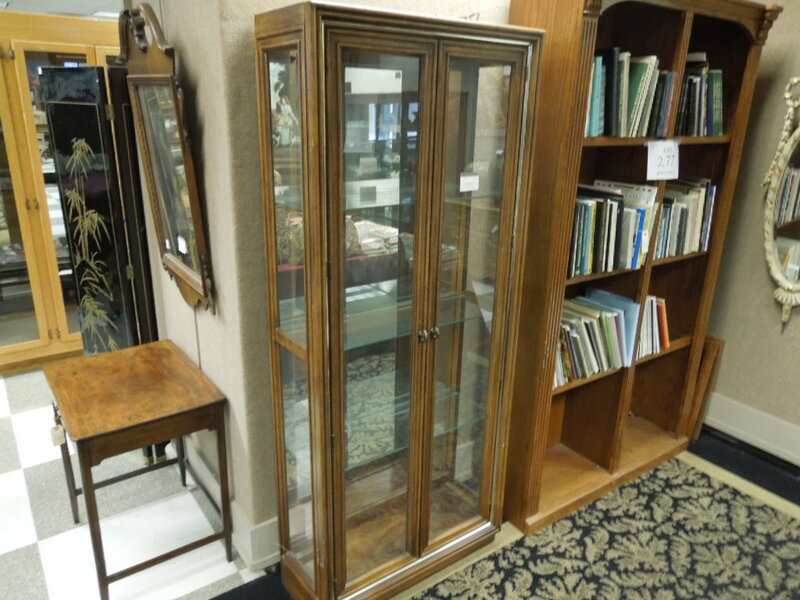 Lot 247: Contemporary Lighted Display Cabinet. Lot 248: Oriental Rosewood Lidded Camphor Chest. 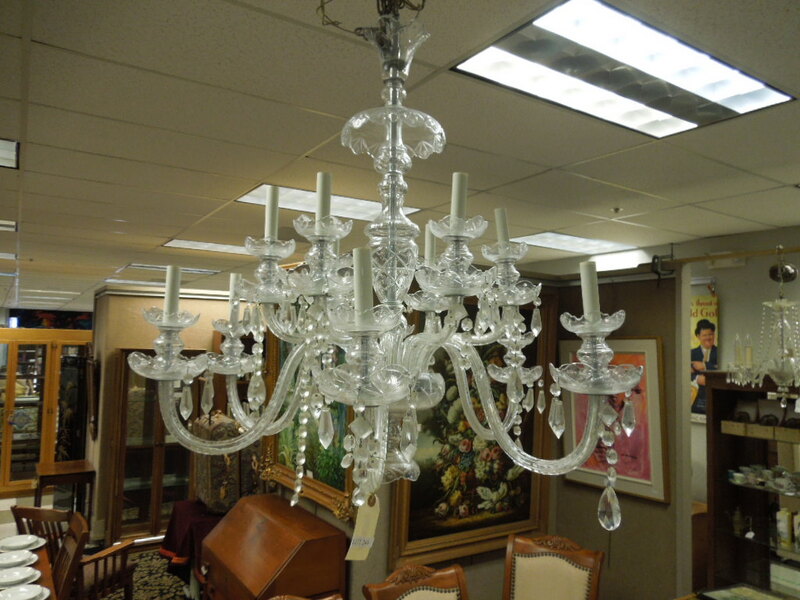 Lot 249: 1930s Drop Crystal 12-Light Chandelier. 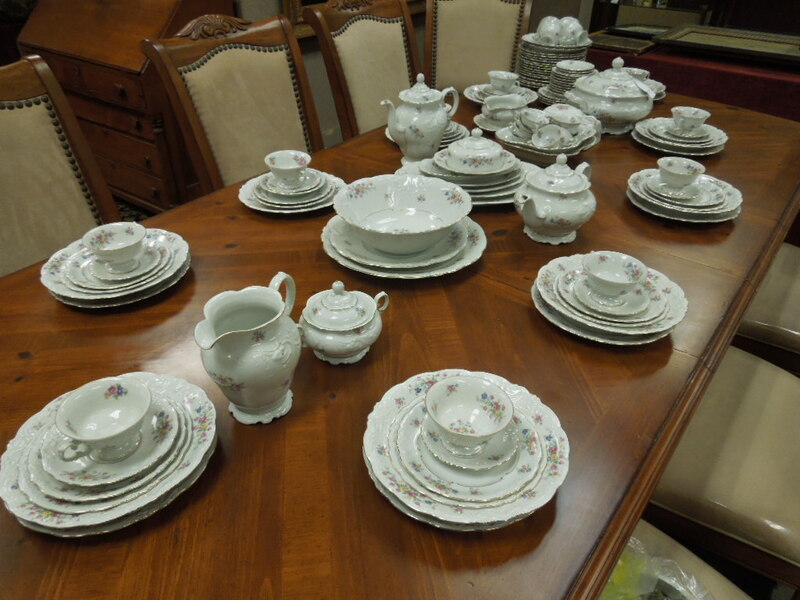 Lot 250: Kpm Extensive Porcelain Dinner Service. (Approx. 120 Pcs). 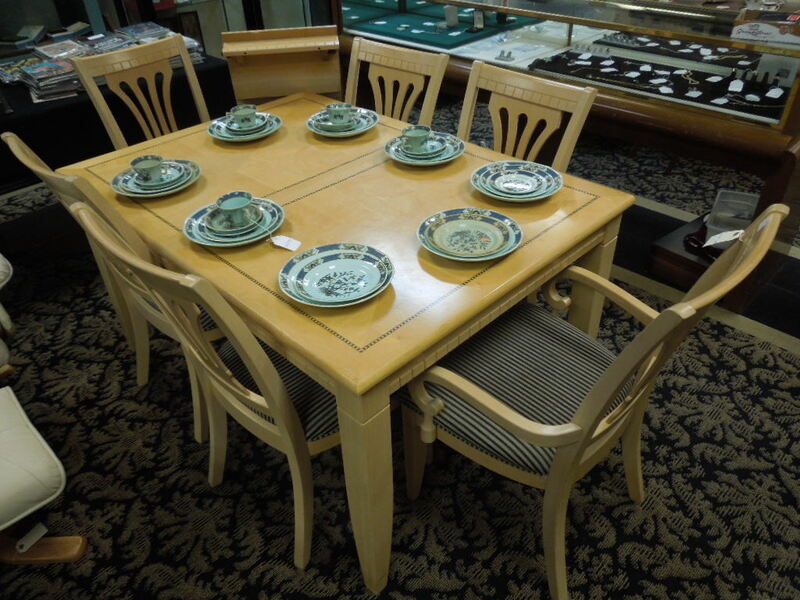 Lot 251: Contemporary Knotted Pine Dining Table With 2 Leaves And 8 Chairs. 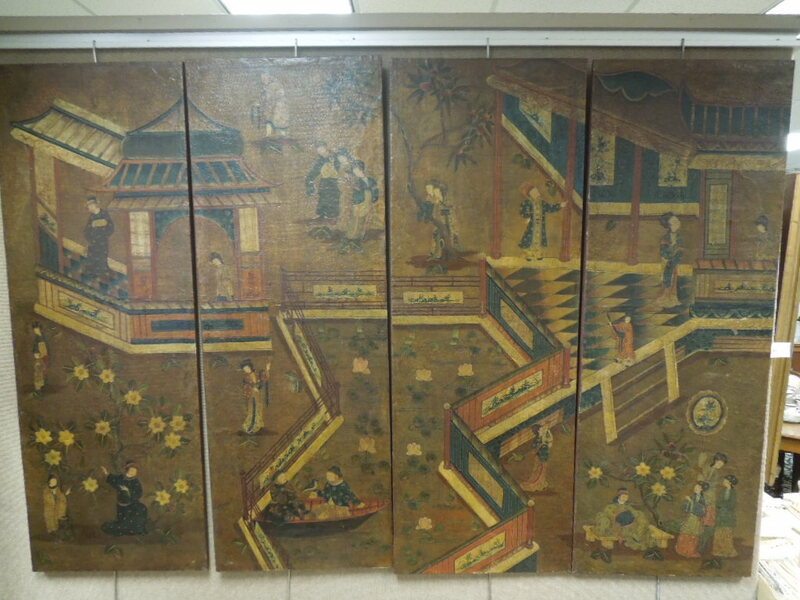 Lot 252: Oriental 4-Panel Painting On Board, Pagoda And Courtyard Scene. (Panels: 59" X 21"). 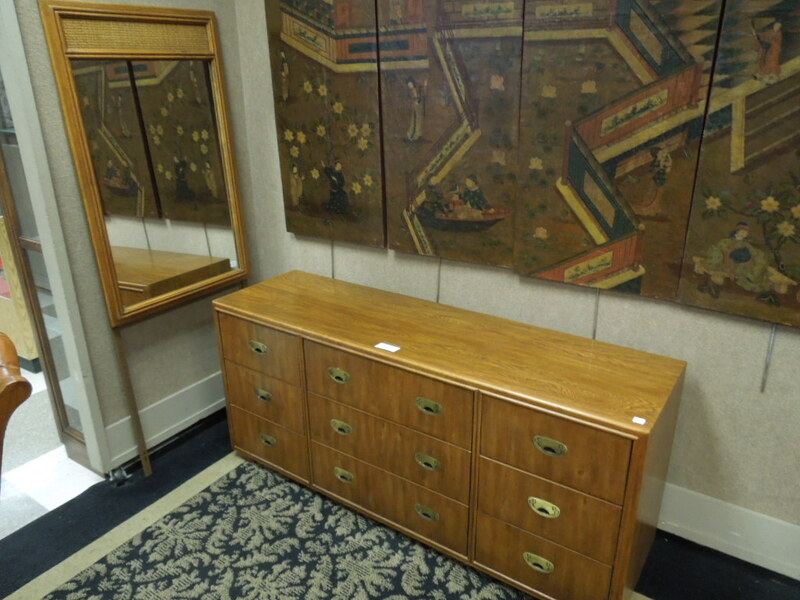 Lot 253: Drexel Contemporary 9-Drawer Mirrored Dresser. 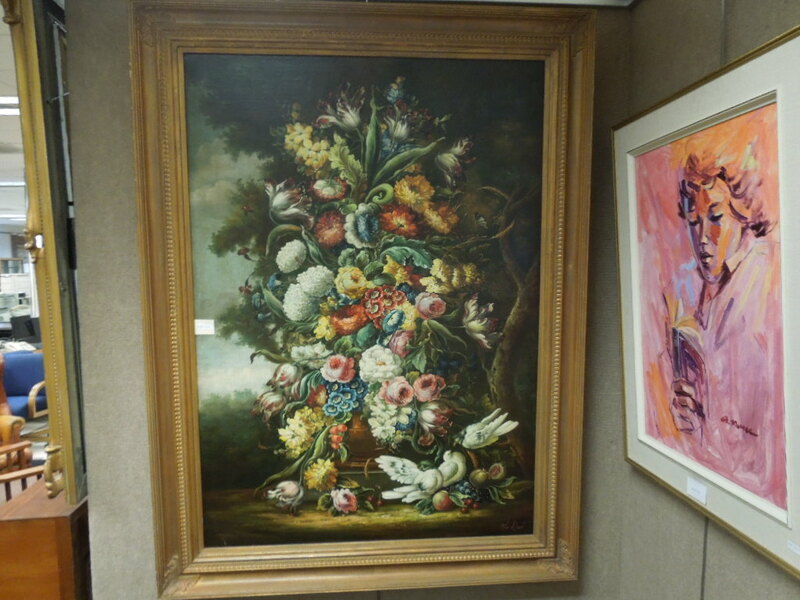 Lot 254: Decorative Oil On Canvas, Floral Still Life. (60" X 40"). 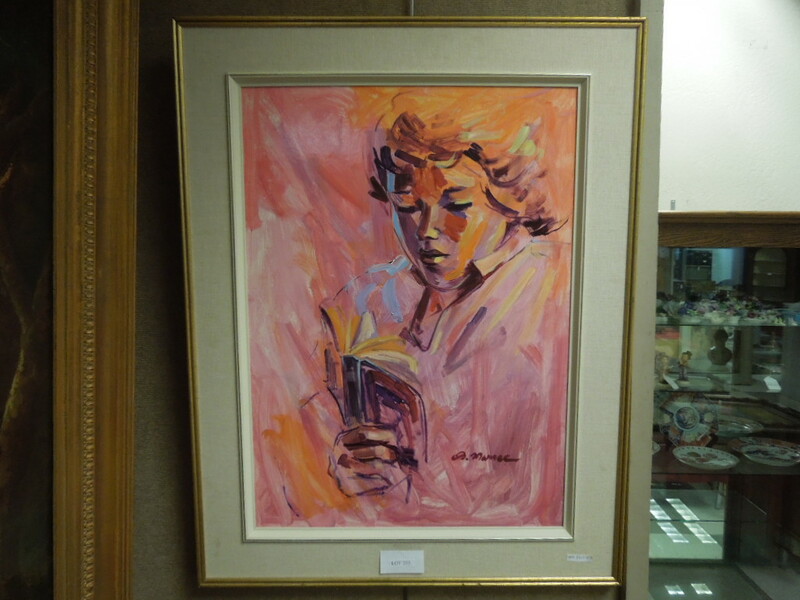 Lot 255: A. Morrer Acrylic On Board, Lady With A Book, Signed. (27" X 21.5"). Lot 256: Pair Of Fruitwood Horse Shoe Back Upholstered Chairs. 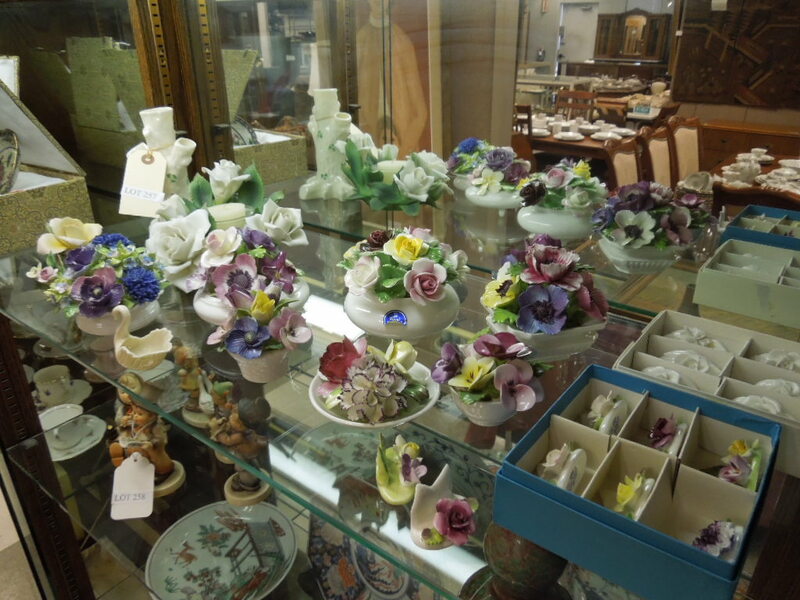 Lot 257: Shelf Of Porcelain Floral Decorative Items Incl. Coal Port, Doulton, Belleek. 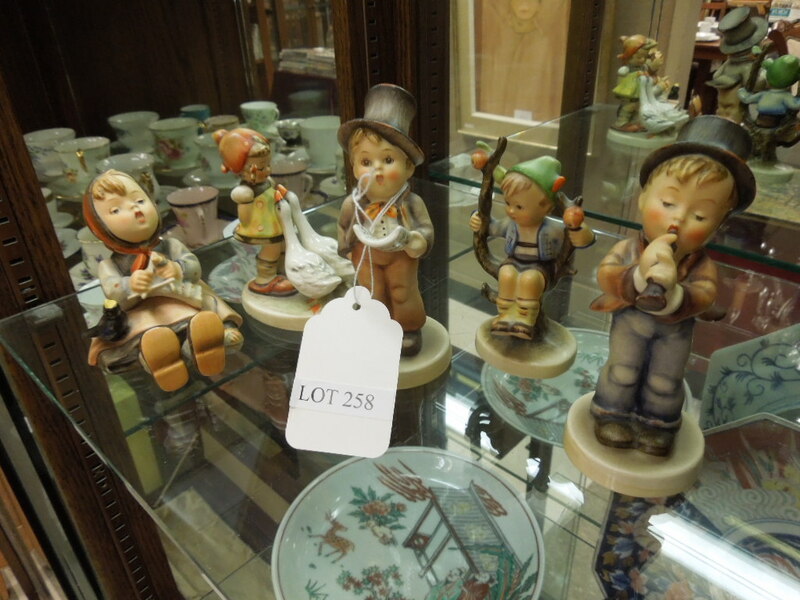 Lot 258: Group Of (5) Hummel Figures. 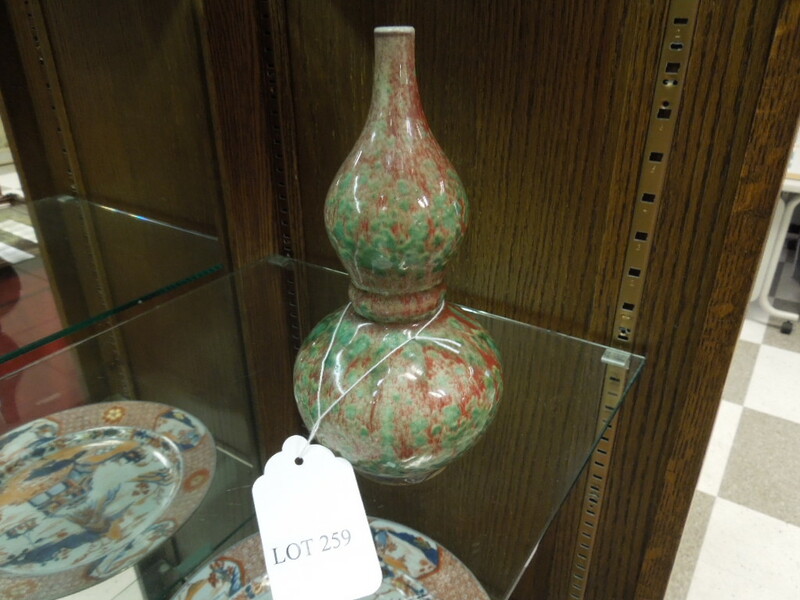 Lot 259: Oriental Double Gourd Crackle Glaze Vase. (8.5" Tall). 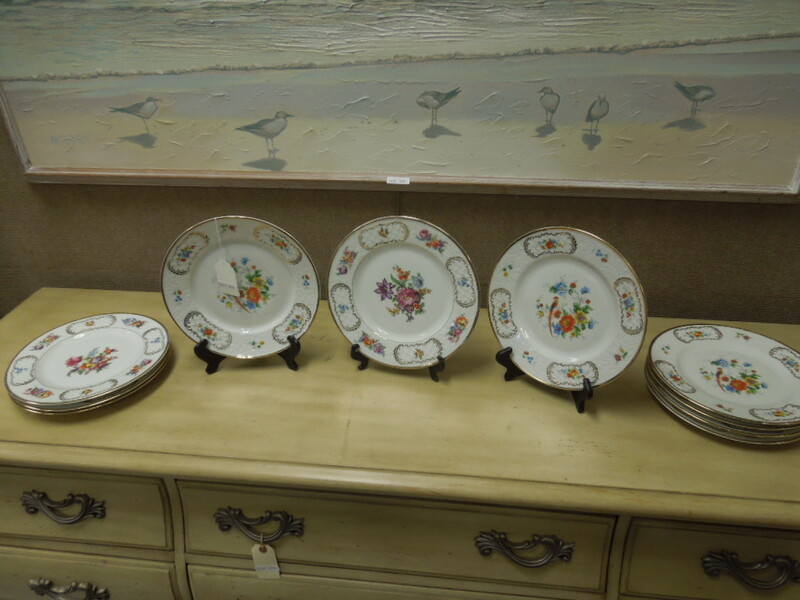 Lot 260: Group Of (4) Oriental Hand Painted Porcelain Plates. 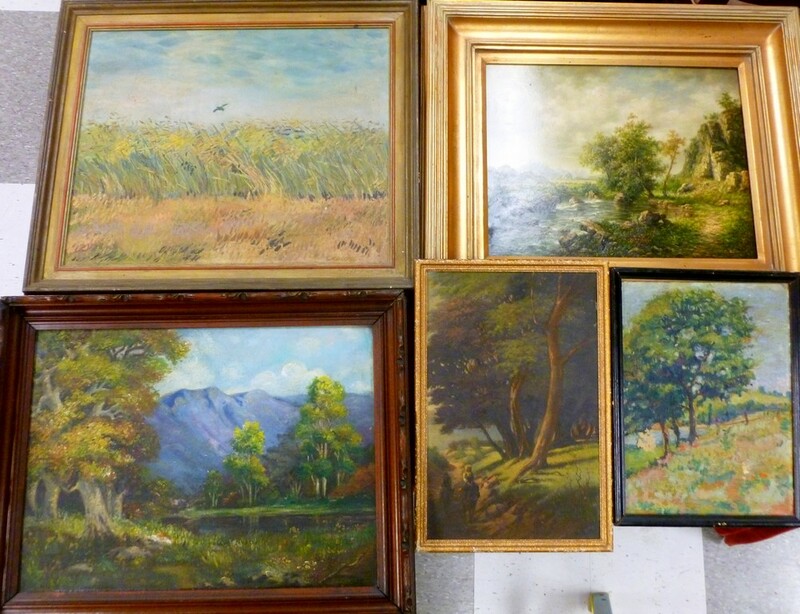 Lot 261: Group Of (5) Decorative Oil Paintings, Landscapes. 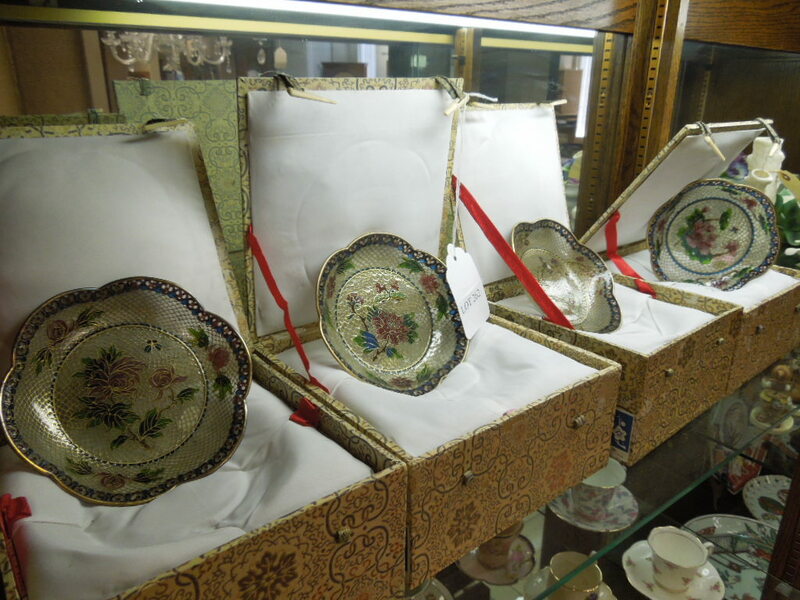 Lot 262: (4) Oriental Glass Mosaic Bowls In Presentation Boxes. 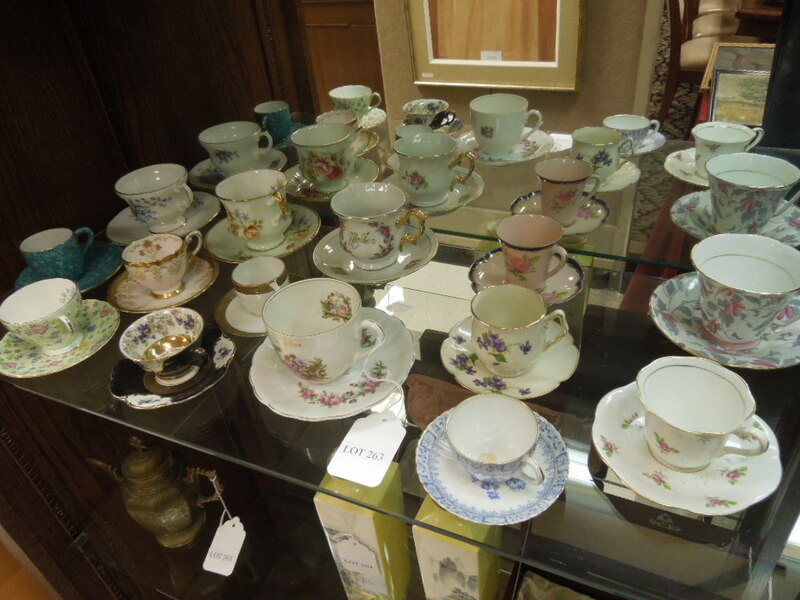 Lot 263: Shelf Of Fine China Cup And Saucer Sets. (14). Lot 264: Pair Of Japanese Hand Painted Porcelain Vases With Presentation Boxes. (10" Tall). Lot 265: Oriental Brass Teapot With Flora And Fauna Decoration, Dragon And Character Marks On The Bottom. (7.5" Tall). Lot 266: Rejane Sanchagrin Oil On Board "Quintessence", Signed. With Galerie Clarence Gagnon Certificate. (42" X 18"). 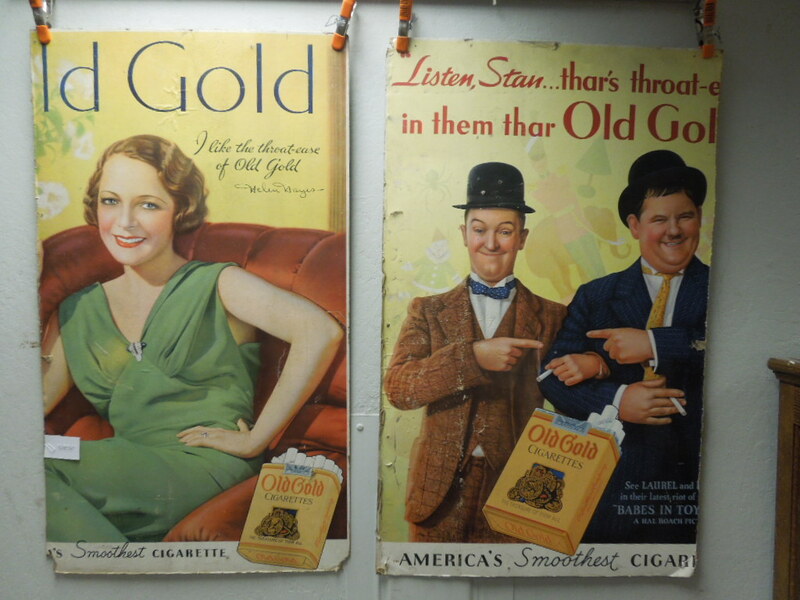 Lot 267: (2) Vintage Cardboard Advertising Signs. (For Cigarettes). 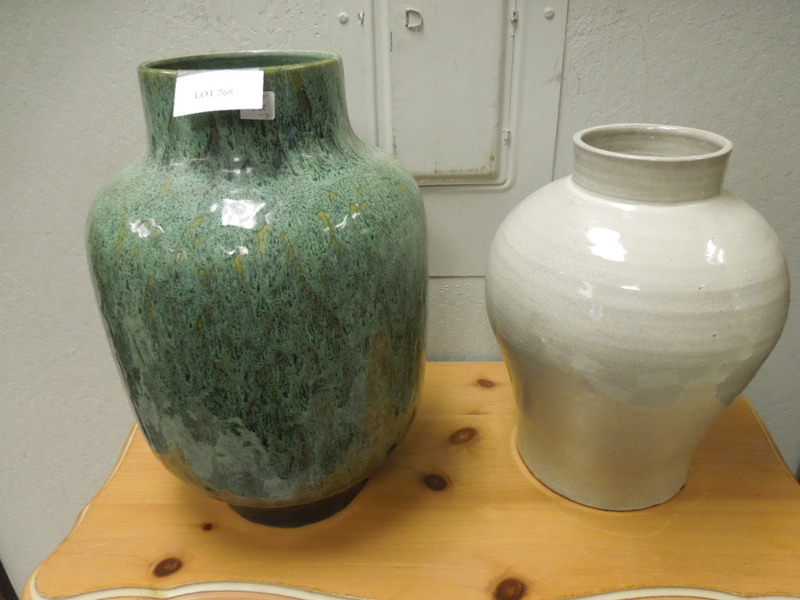 Lot 268: (2) Large Pottery Vases. 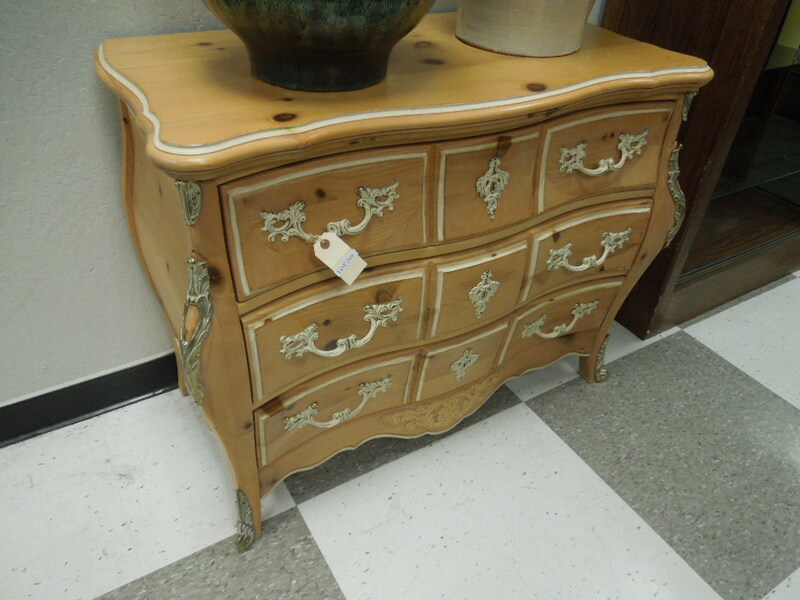 Lot 269: Regency Style Knotted Pine 3-Drawer Chest. 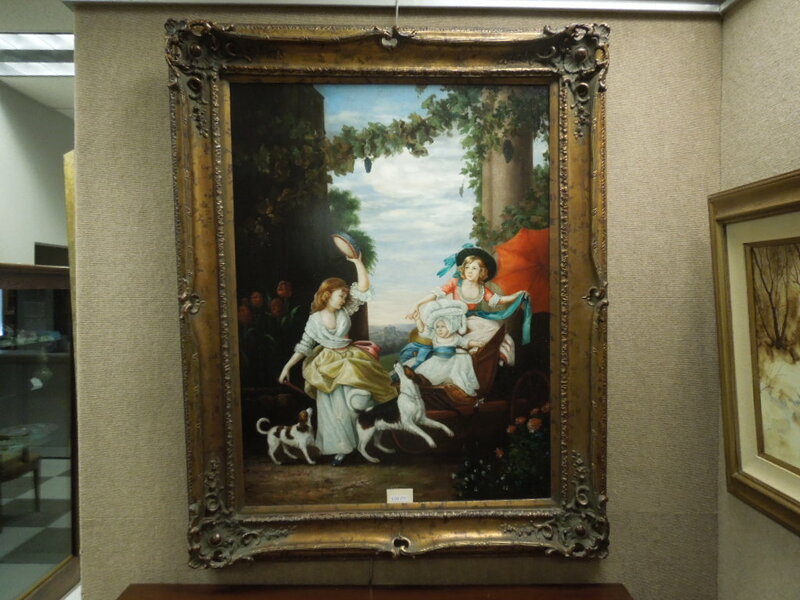 Lot 270: Gilt Framed Oil On Canvas, Tambourine Dancer, Signed Reynolds. (40" X 30"). 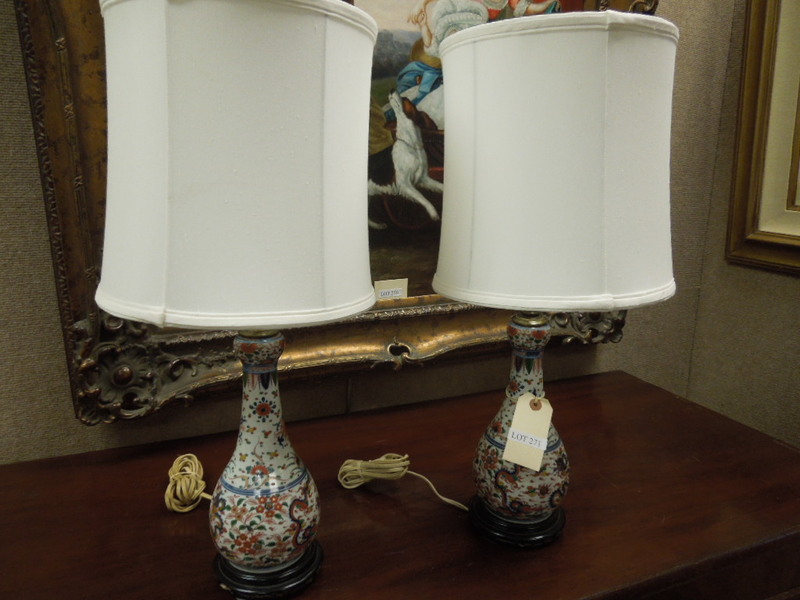 Lot 271: Pair Of Oriental Porcelain Vases As Table Lamps. 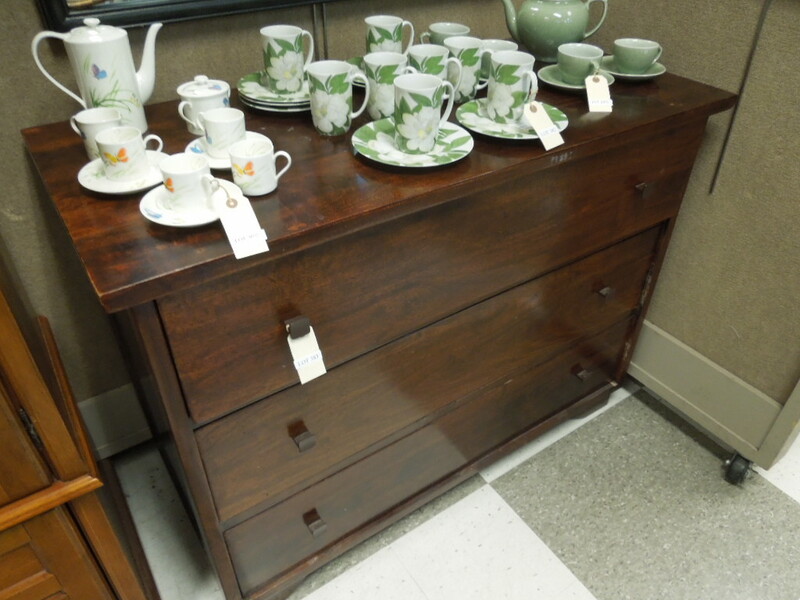 Lot 272: 1930s Mahogany 5-Drawer Chest. 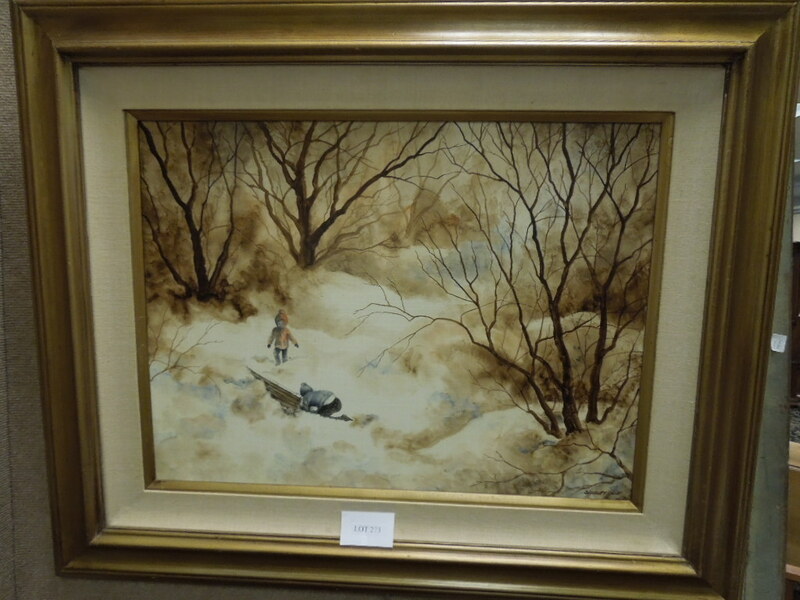 Lot 273: Shirley Holt Oil On Board, Fun At Yosemite, Signed Lower Right. (18" X 24"). 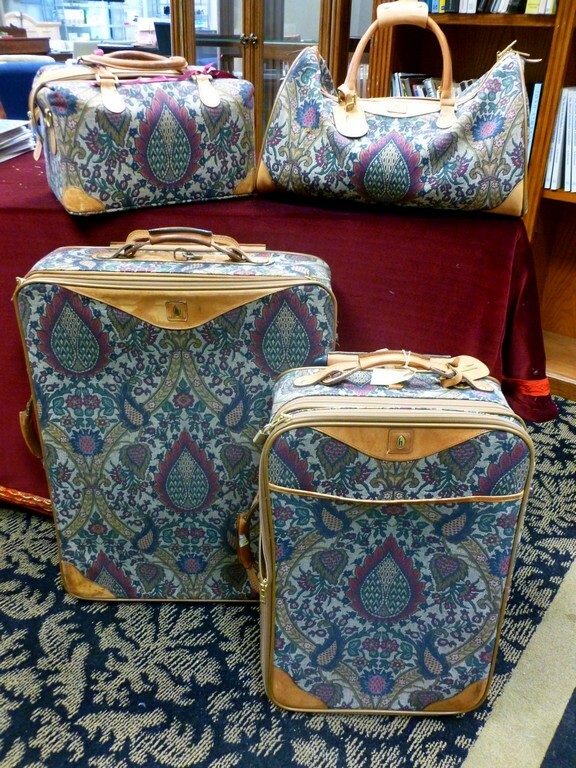 Lot 274: Vintage 4-Pc Set Of Hartmann Luggage. 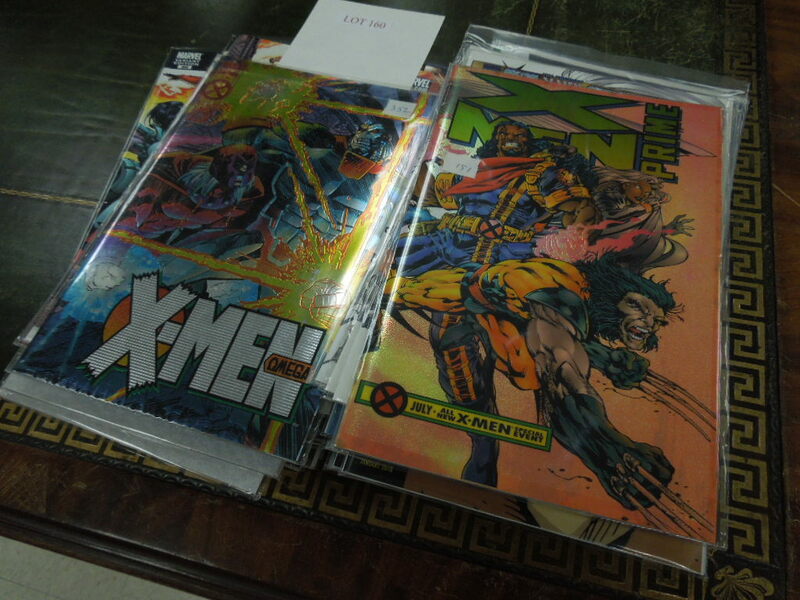 Lot 275: Group Of Modern Age X-Men Comics Incl. The Uncanny X-Men, X-Men 2099, Generation X. (Approx. 200). 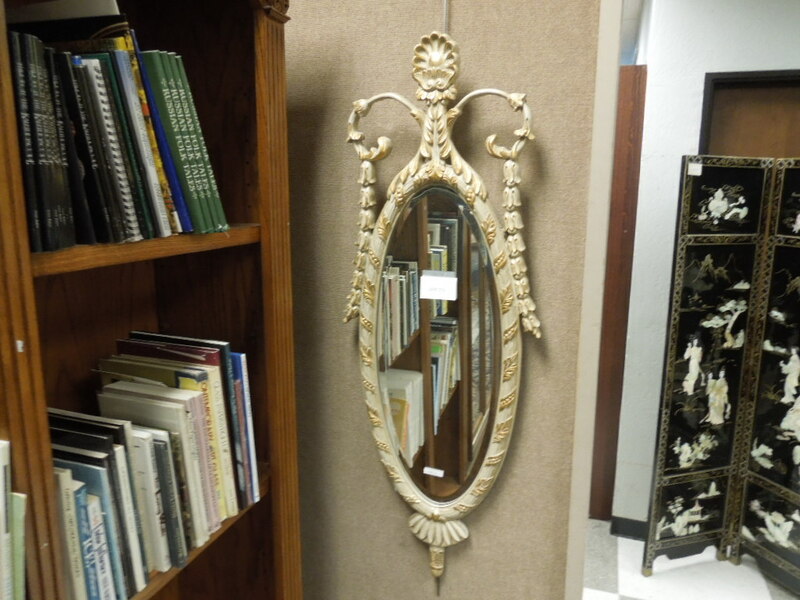 Lot 276: Contemporary Oval Beveled Mirror With Gilt Floral Decoration. 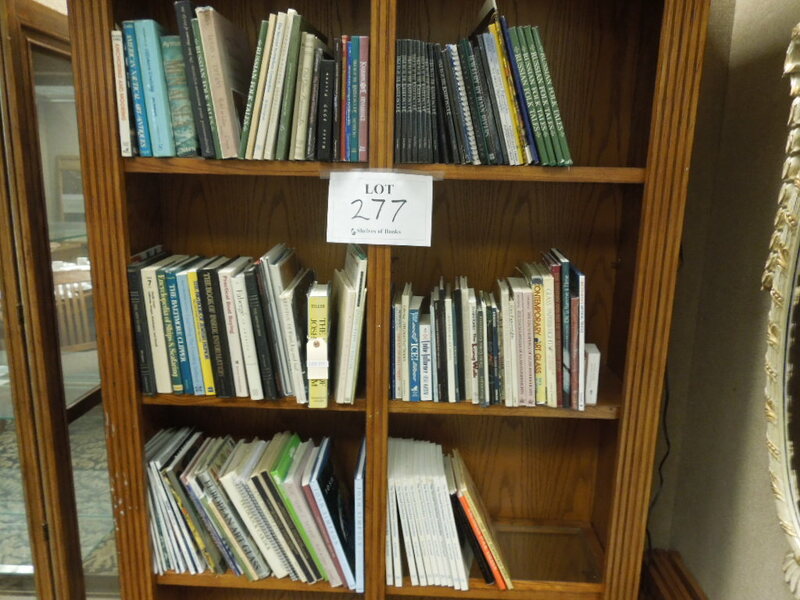 Lot 277: (6) Shelves Of Books. 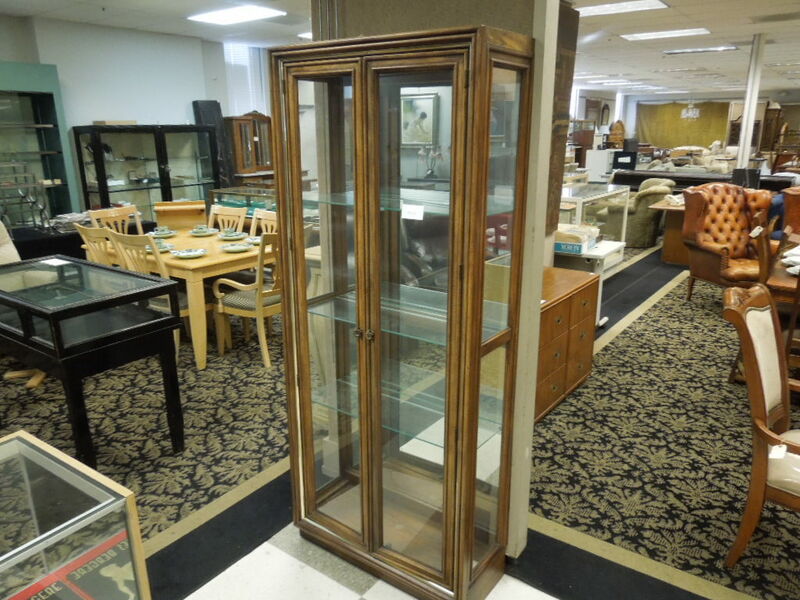 Lot 278: Contemporary Lighted 3-Shelf Display Cabinet. 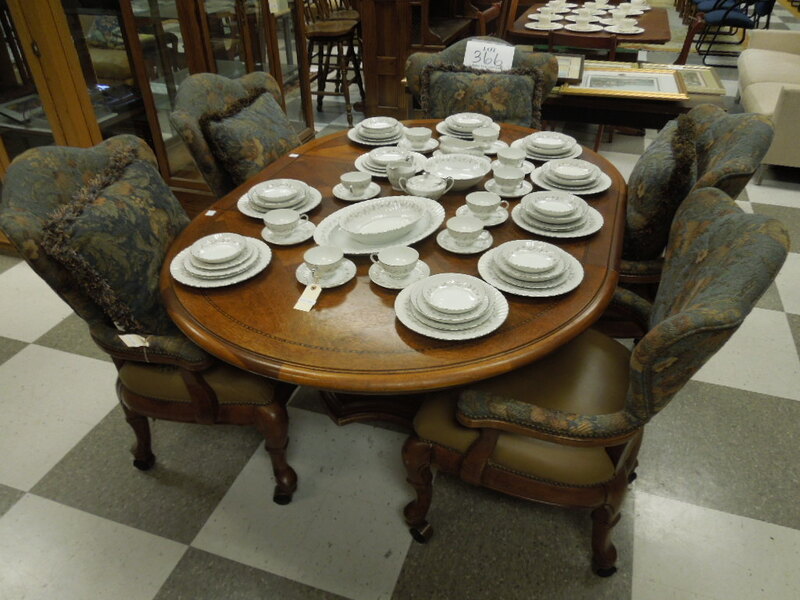 Lot 279: Early 20th C. Drop Side Dining Table. 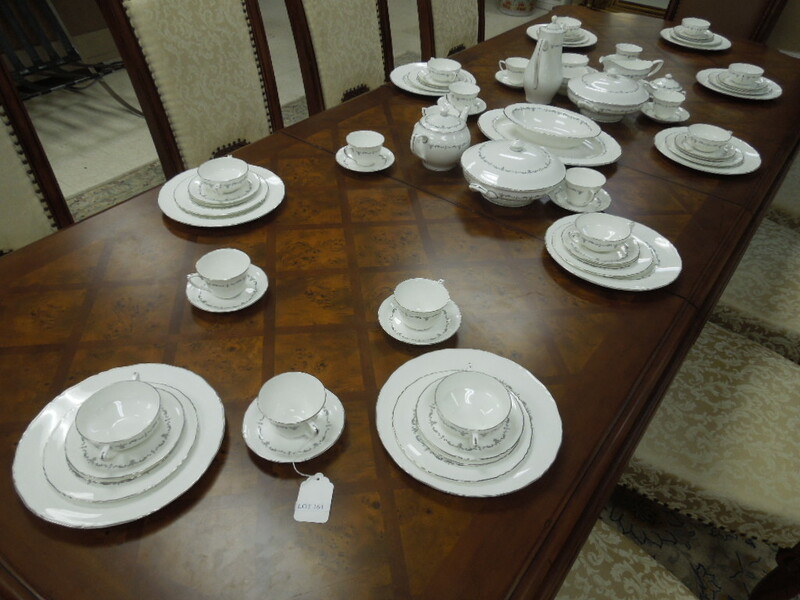 Lot 280: Gilt Rimmed White Porcelain Dinner Service. Lot 281: Contemporary Oak Mission Style Dining Table With 1 Leaf And 4 Chairs Plus An Associate Chair. 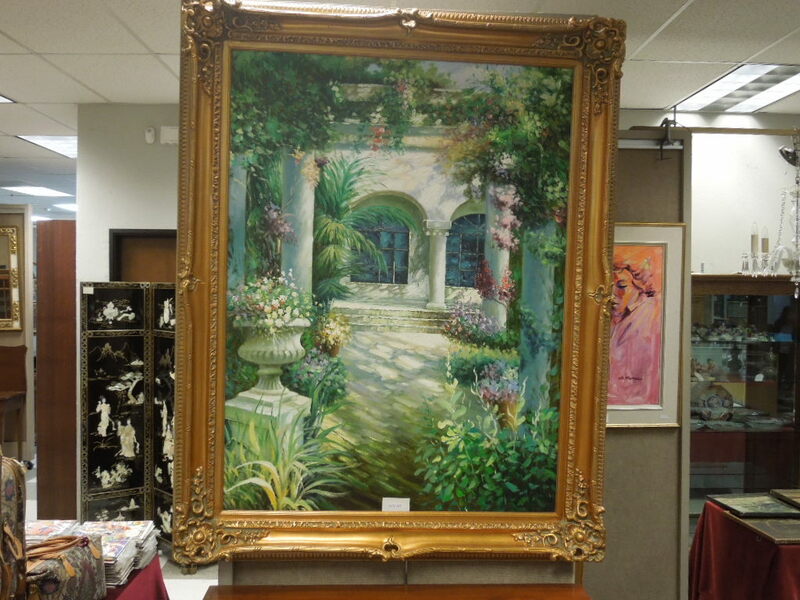 Lot 282: Framed Oil On Canvas, Roman Garden. (48" X 36"). 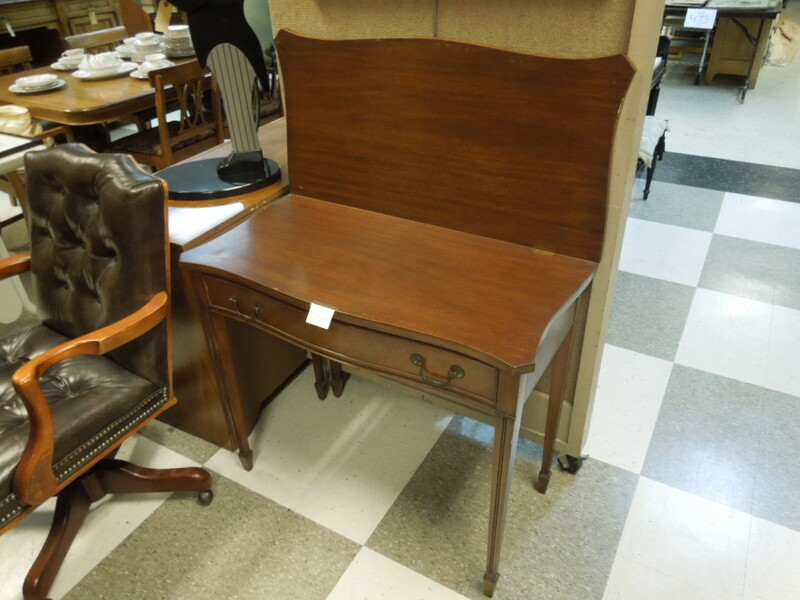 Lot 283: Early 20th C. Fruitwood Drop Front 4-Drawer Desk. 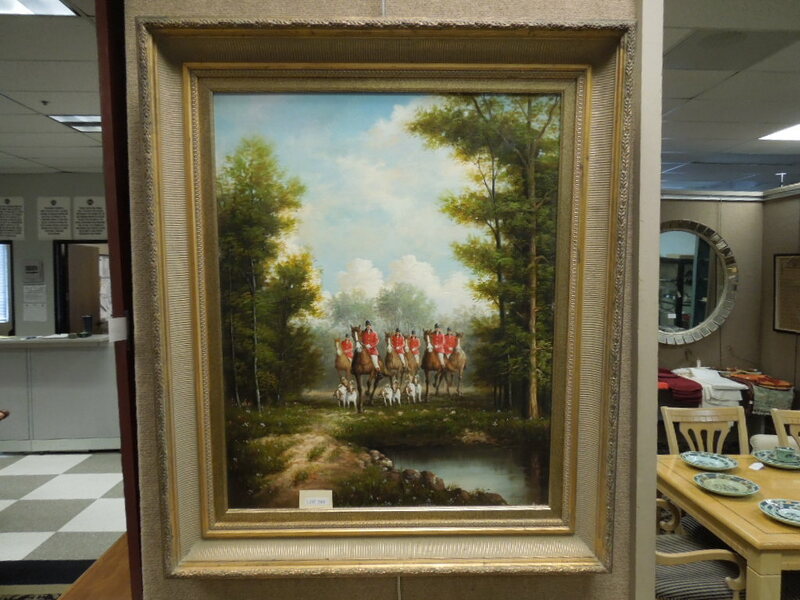 Lot 284: Gilt Framed Oil On Canvas, Fox Hunt, Signed Lower Right. (30" X 24"). 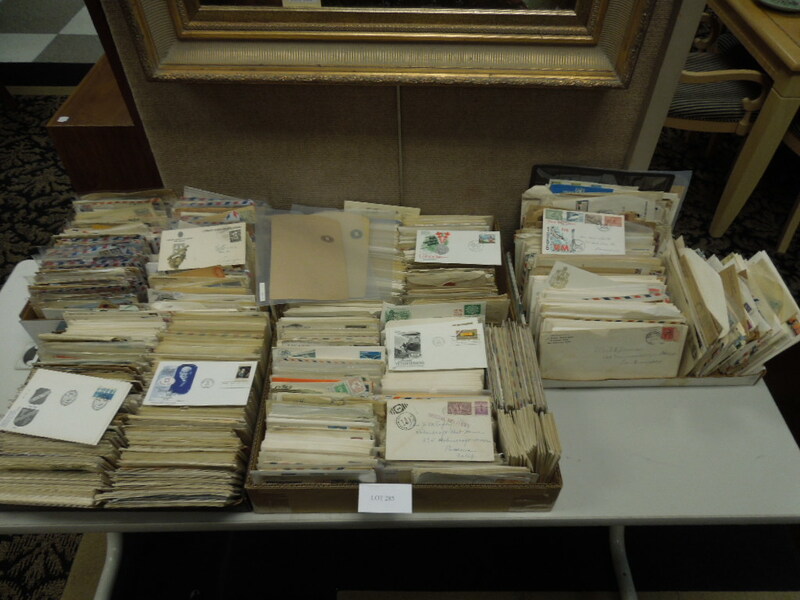 Lot 285: (5) Boxes Of U.S. First Day Covers. 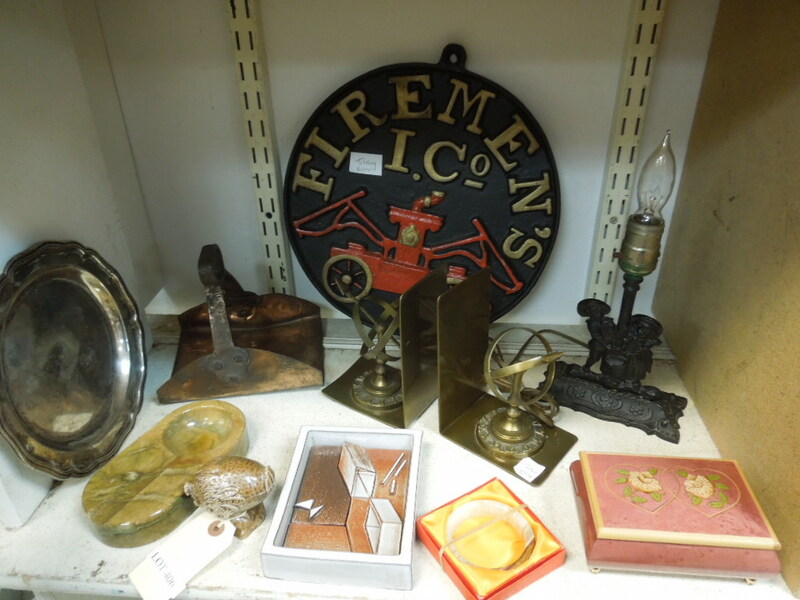 Lot 286: Group Of Collectibles Incl. 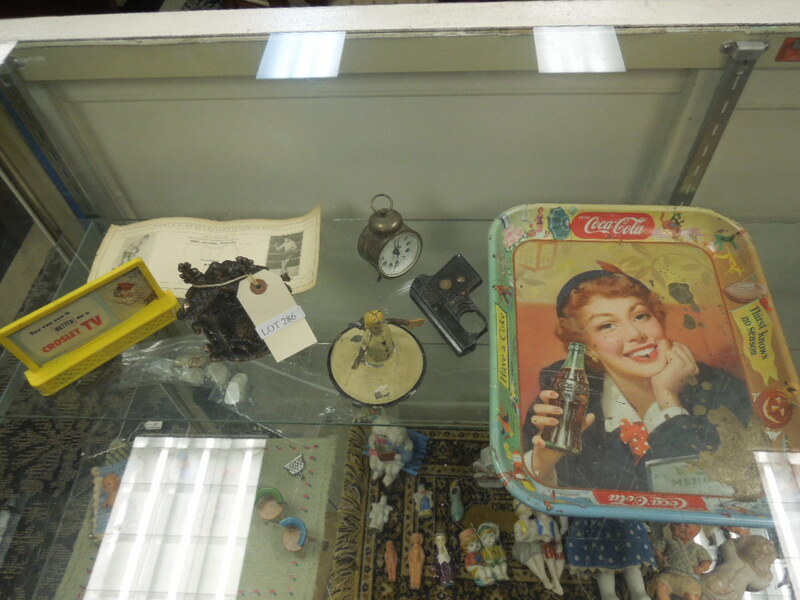 Toys, Bank, Coca-Cola Tray. 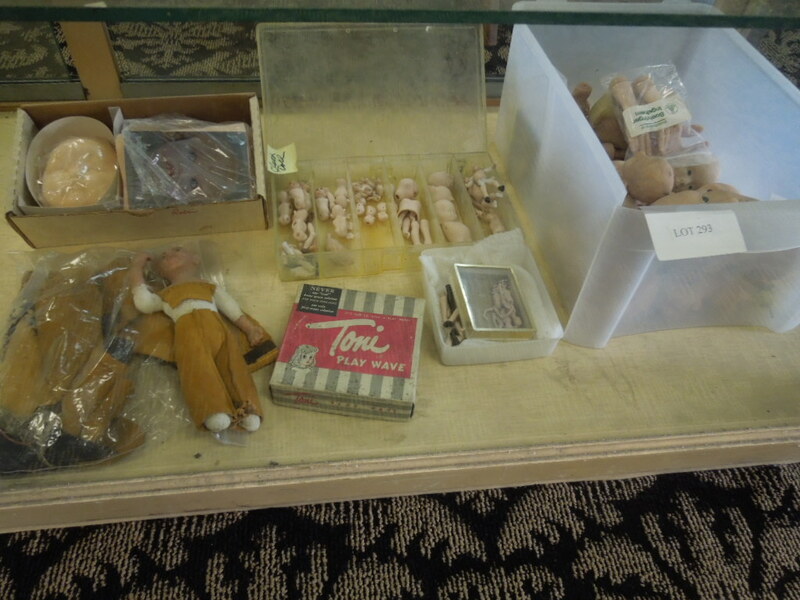 Lot 287: Shelf Of Miniature Dolls And Dollhouse Items. 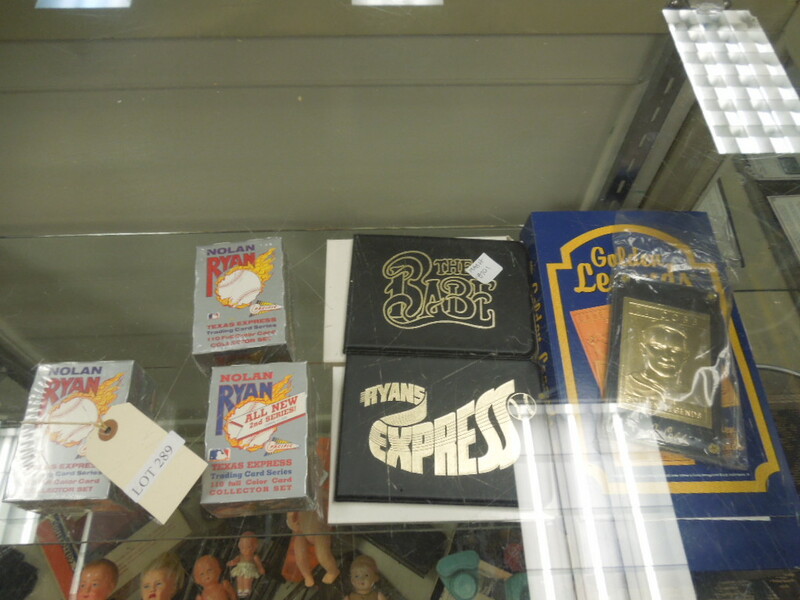 Lot 289: Group Of Baseball Trading Cards And Related Items. 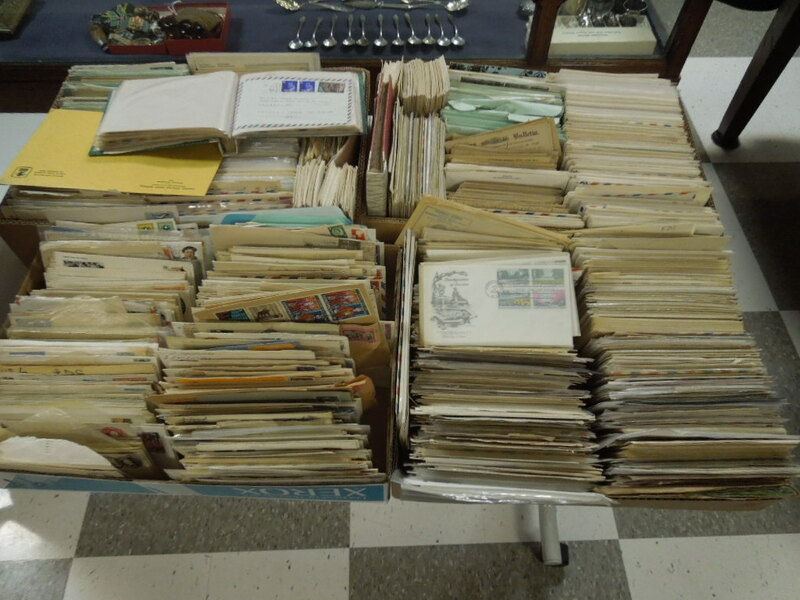 Lot 290: Large Group Of Cancelled Stamps And Stamp Sheets. Lot 291: (6) Asstd. Pcs Stamp Booklets. 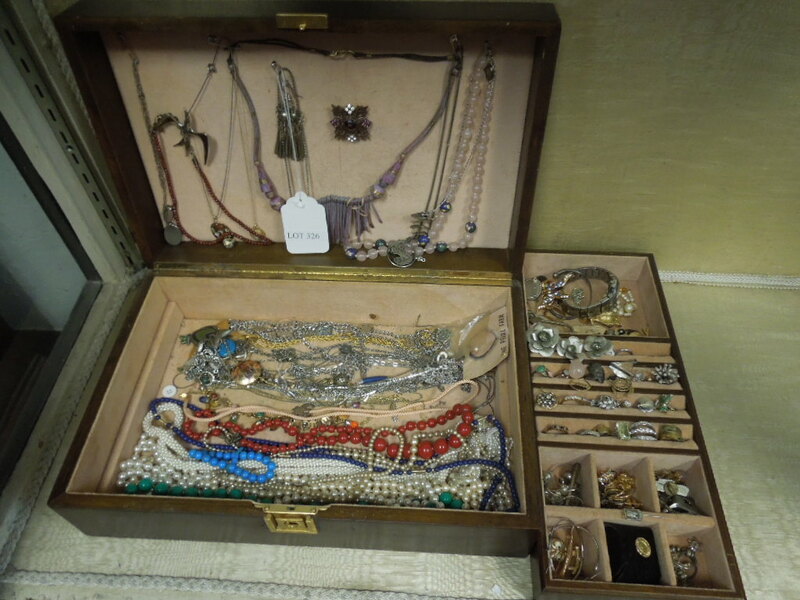 Lot 292: Shelf Of Costume Jewelry Necklaces. 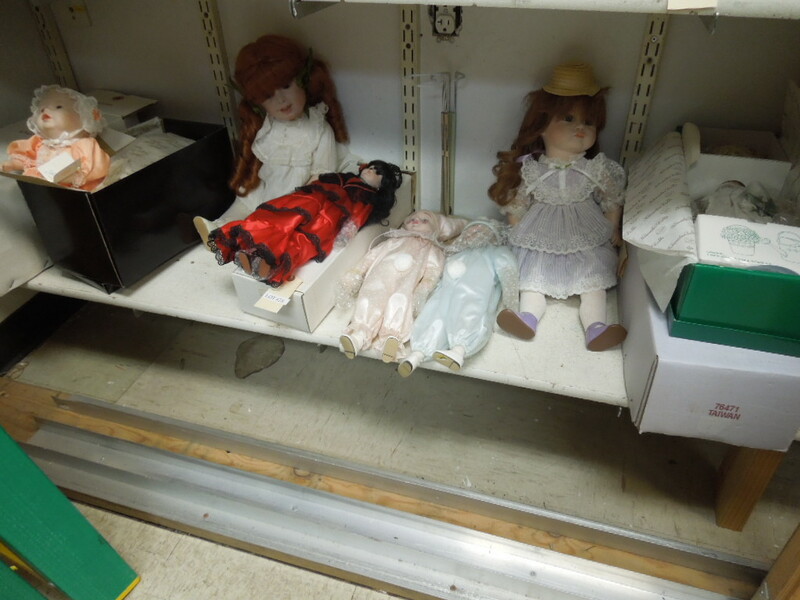 Lot 293: Shelf Of Doll Parts. 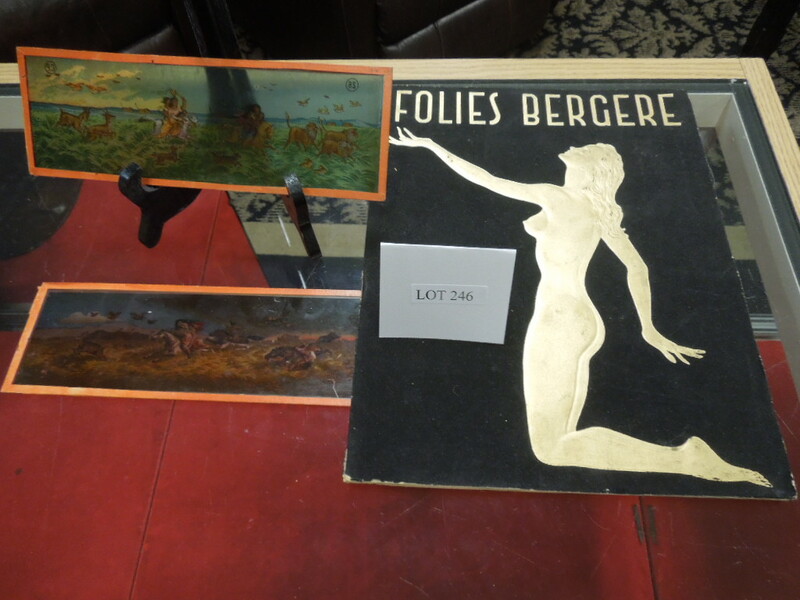 Lot 294: Ch. Pillivuyt Porcelain Dinner Service. Medaille D'or Paris Exp. 1867. Monogrammed. 62 Pieces. 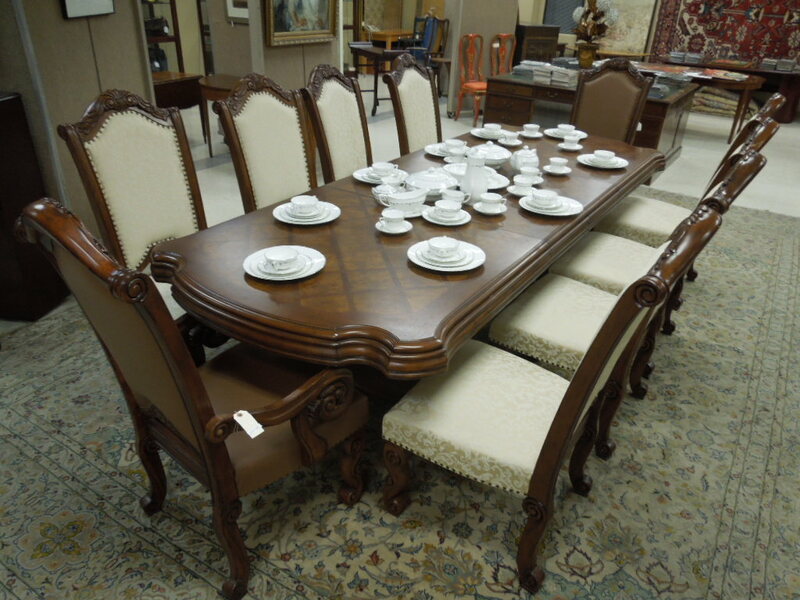 Lot 295: Circa 1920s Mahogany Pedestal Dining Table With 4 Leaves And (6) Period Mahogany Upholstered Chairs. Lot 296: 14k Yellow Gold Princess Diana Tiara Ring With Diamonds And Pearls. (3.5 Grams). 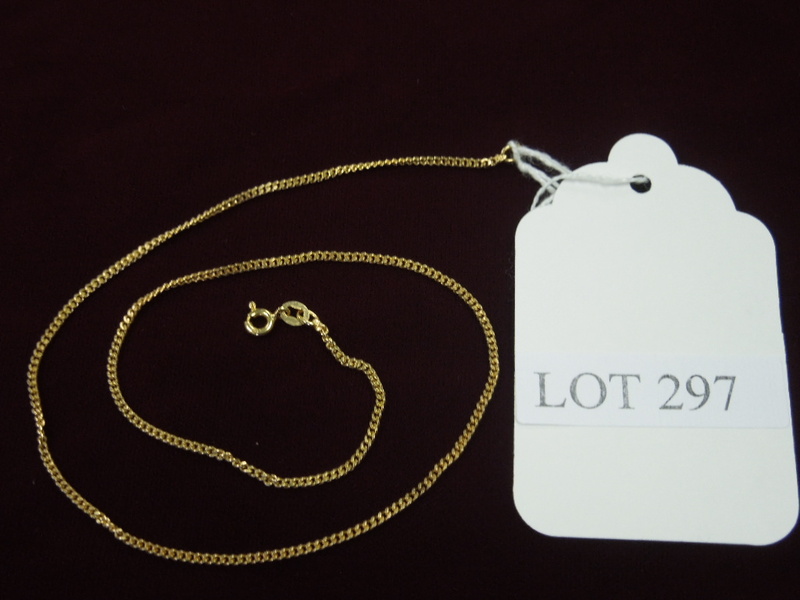 Lot 297: 18k Yellow Gold Necklace. (5.2 Grams). 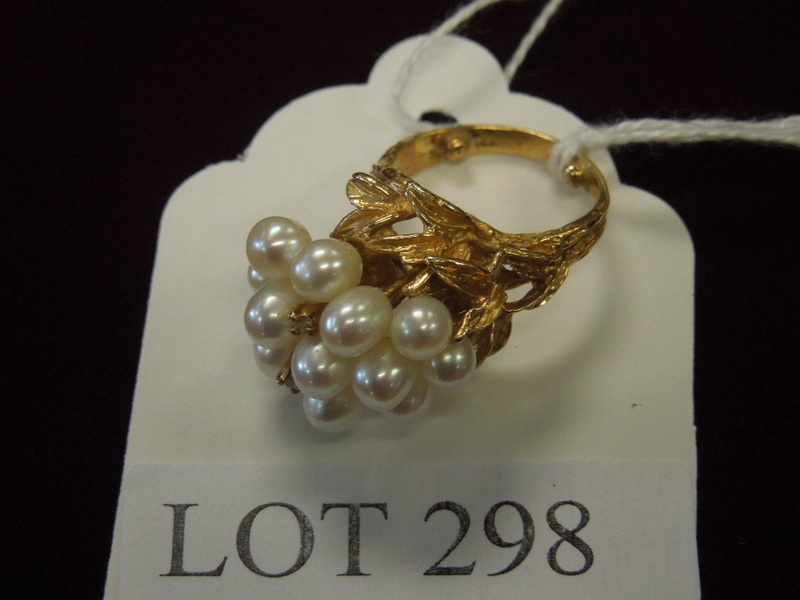 Lot 298: 14k Yellow Gold And Pearl Cluster Ring With 2 Clear Stones. (10.2 Grams). 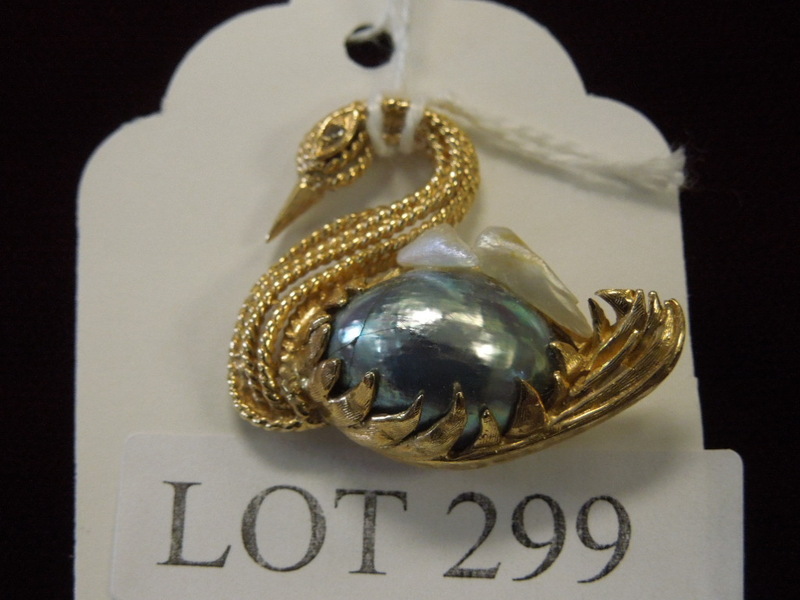 Lot 299: 14k Yellow Gold Swan Brooch With Diamond Eye And A Pearl Cabochon. (8.8 Grams). 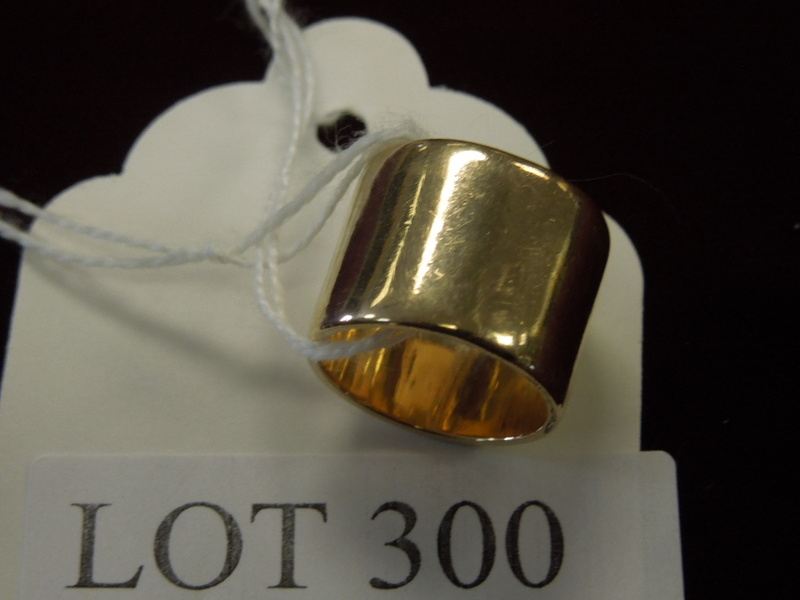 Lot 300: 14k Yellow Gold Ring. (Tests 14k, 10.2 Grams). 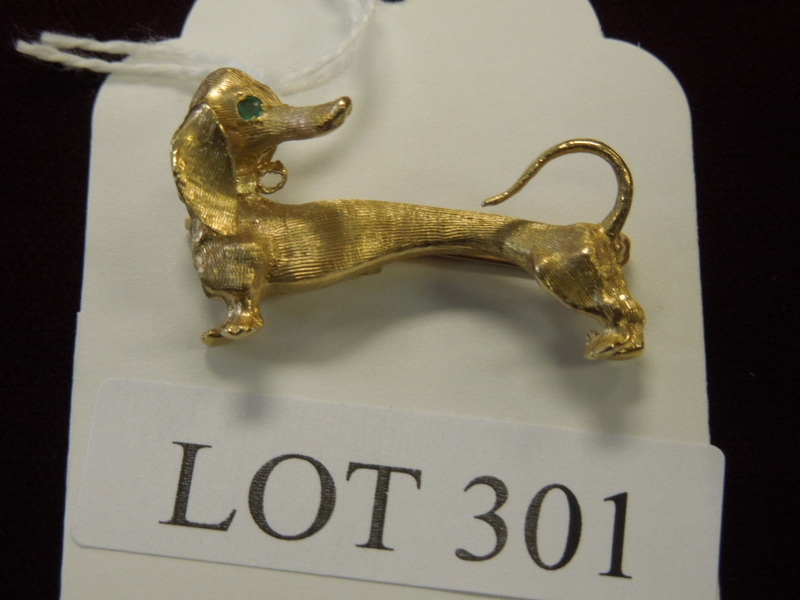 Lot 301: 14k Yellow Gold Dachshund Brooch. (6.8 Grams). 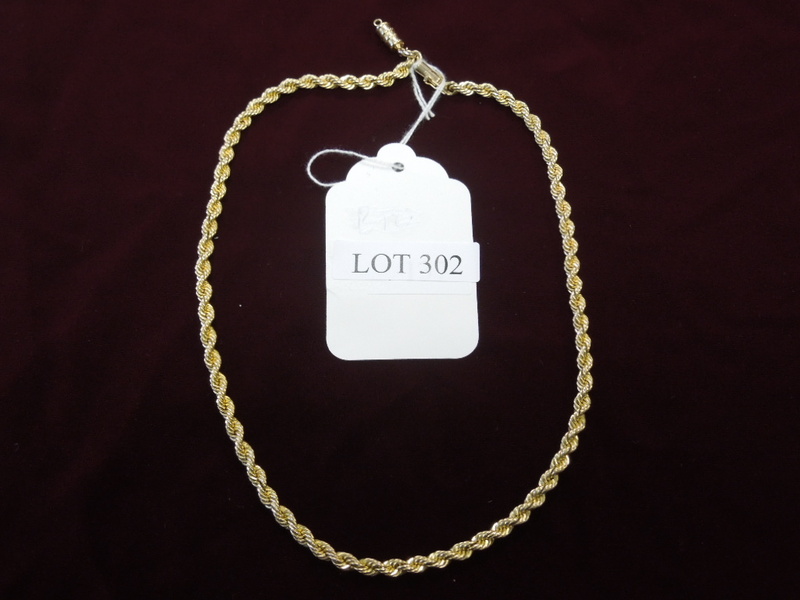 Lot 302: 14k Yellow Gold Rope Link Necklace. (17.5", 40 Grams). 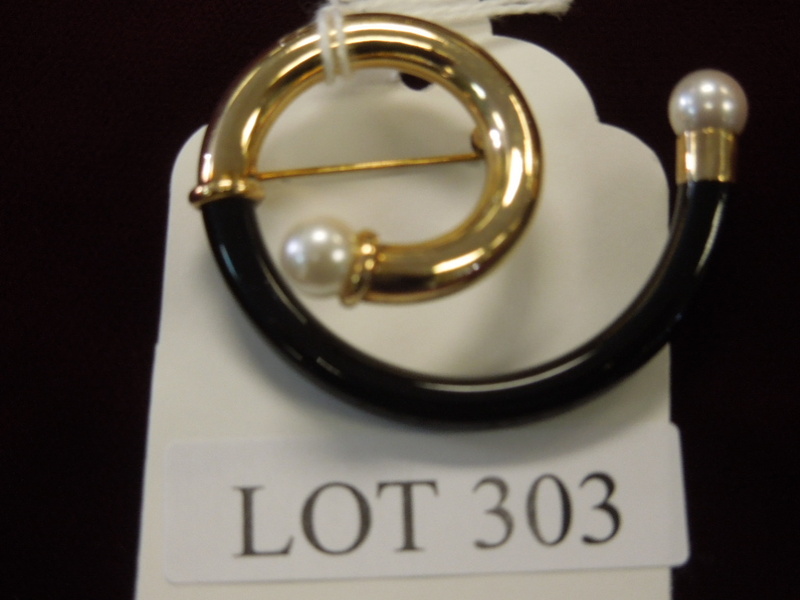 Lot 303: Free Form Brooch With 14k Yellow Gold And 2 Pearls. (8.4 Grams). 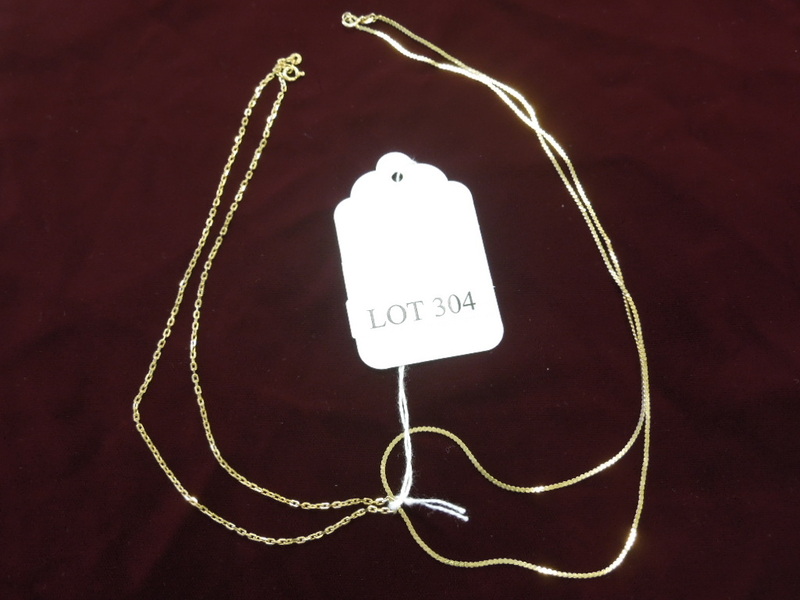 Lot 304: (2) 14k Yellow Gold Necklaces. (10.2 Grams). Lot 305: 14k Yellow Gold Cross With 4 Marquise Cut Diamonds. (5.4 Grams). 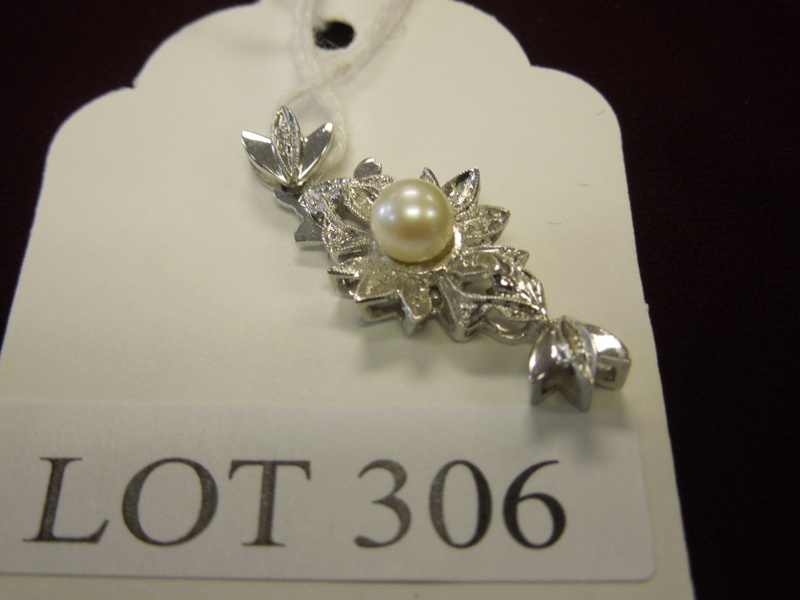 Lot 306: 18k White Gold Pendant With Pearl. 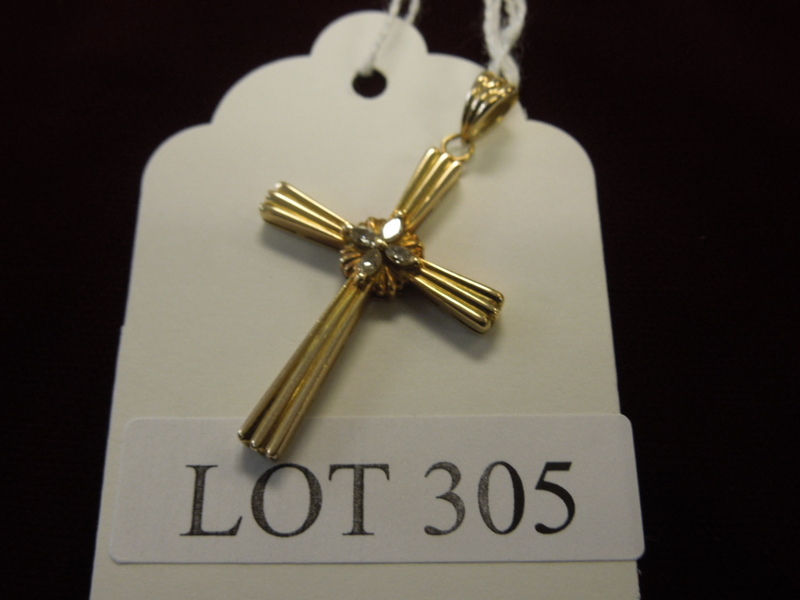 Lot 307: 14k Yellow Gold Stylized Cross Pendant With 3 Diamonds On A 14k Chain. (7.3 Grams). 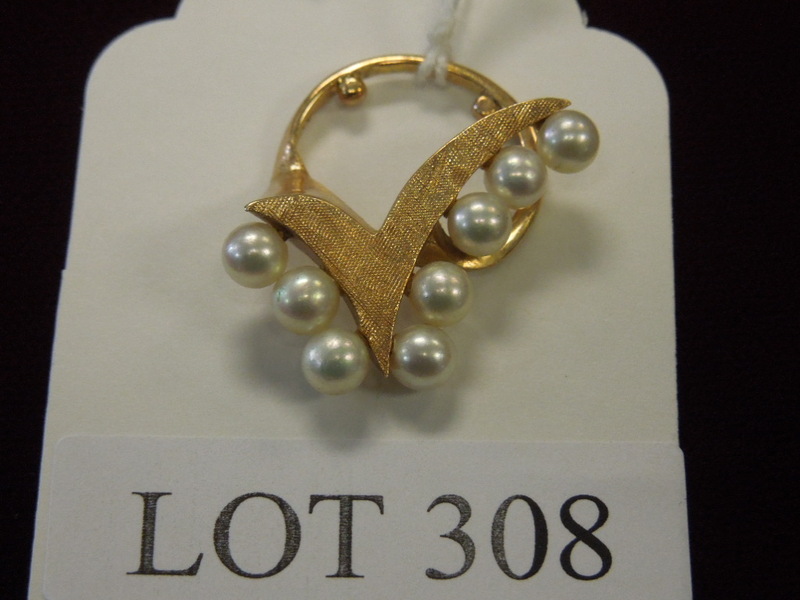 Lot 308: 14k Yellow Gold Pendant With 8 Pearls. (6.8 Grams). 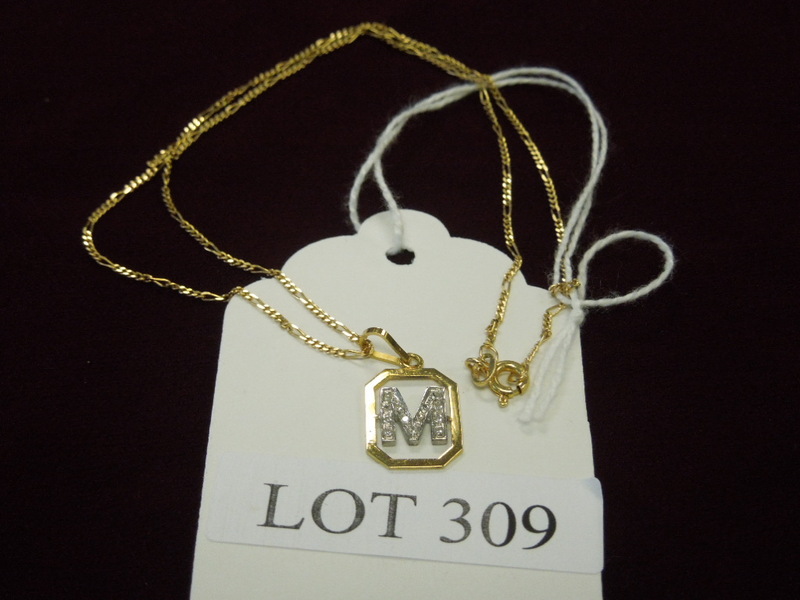 Lot 309: 18k Yellow Gold Chain With "M" Pendant And Diamond Accents. 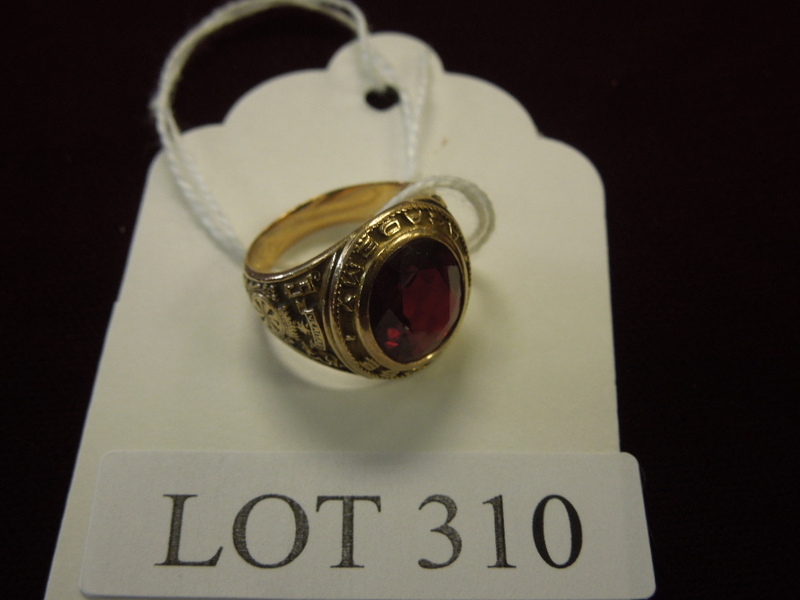 Lot 310: 10k Yellow Gold 1953 Class Ring With Faceted Red Stone. 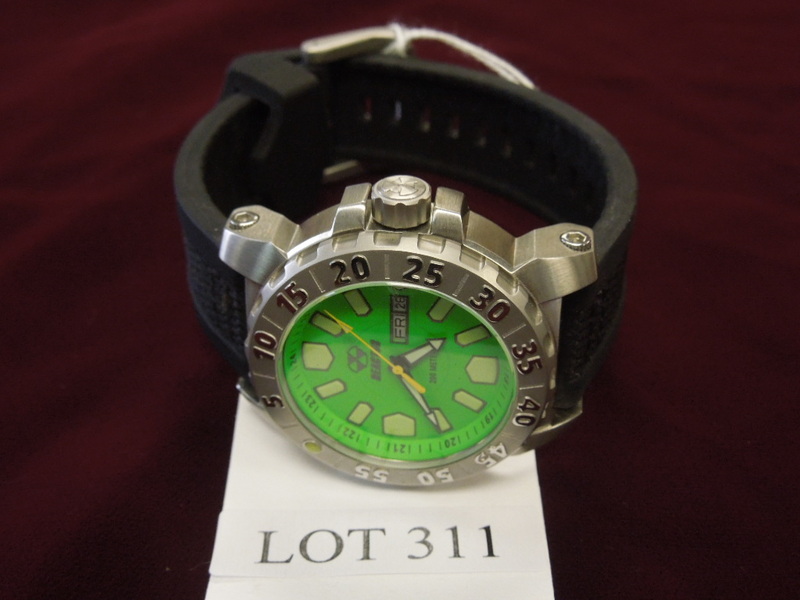 Lot 311: Reactor "Melt Down 2" Men's Wristwatch. 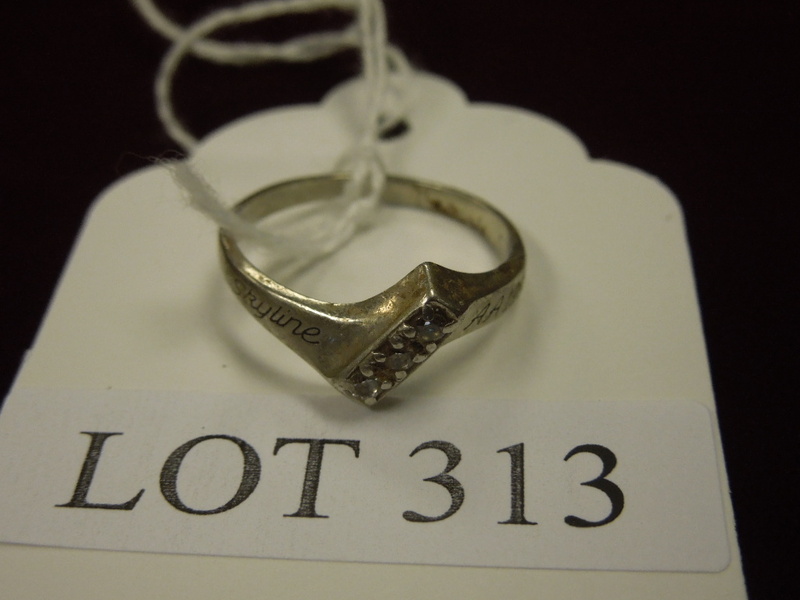 Lot 313: 10k White Gold Ring With 3 Clear Stones. (3.1 Grams). 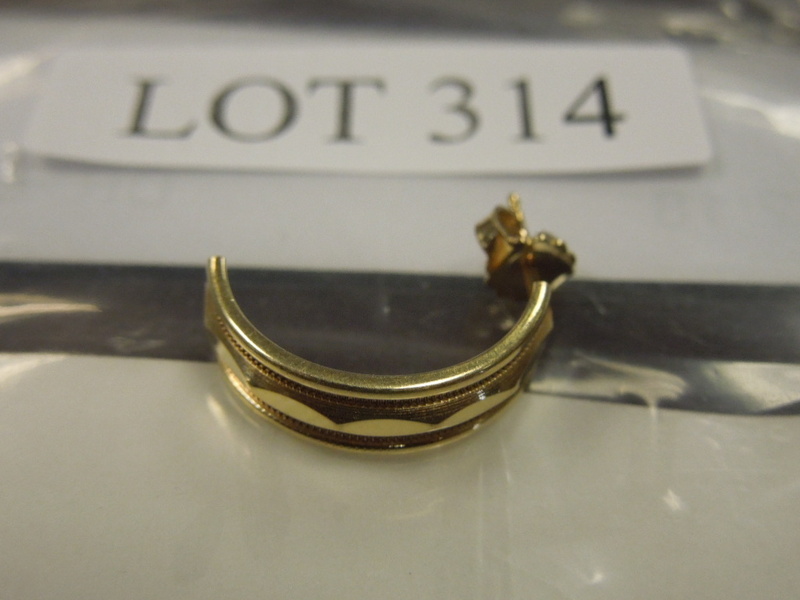 Lot 314: 14k Yellow Gold Earring. (1.9 Grams). 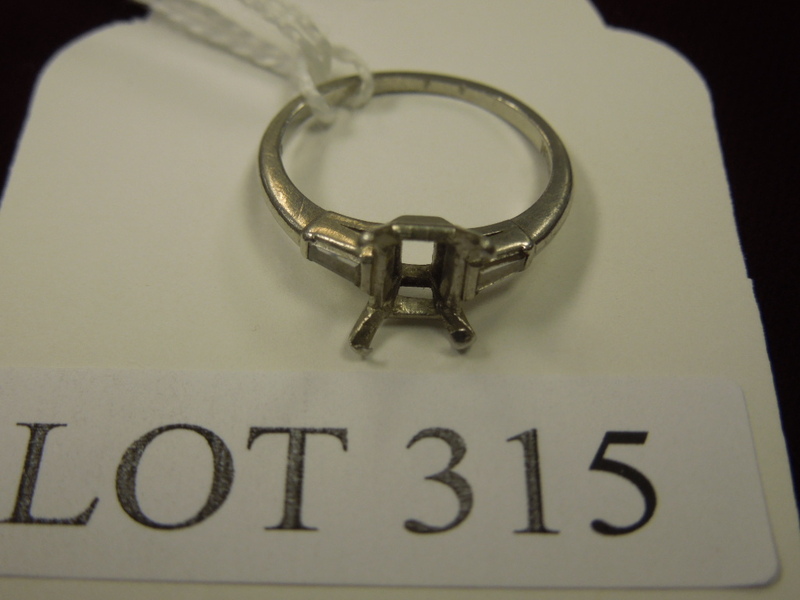 Lot 315: Platinum Ring. (Missing Center Stone). (3.1 Grams). 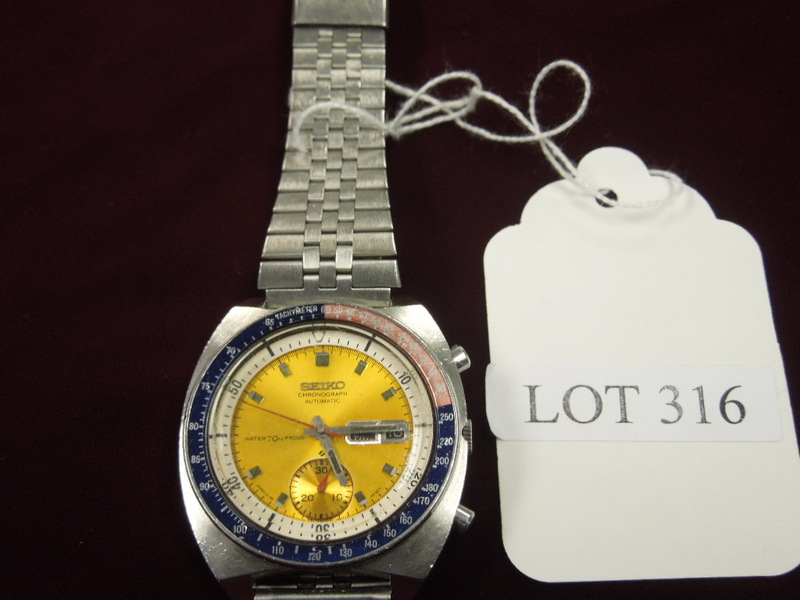 Lot 316: Seiko Automatic Chronograph. 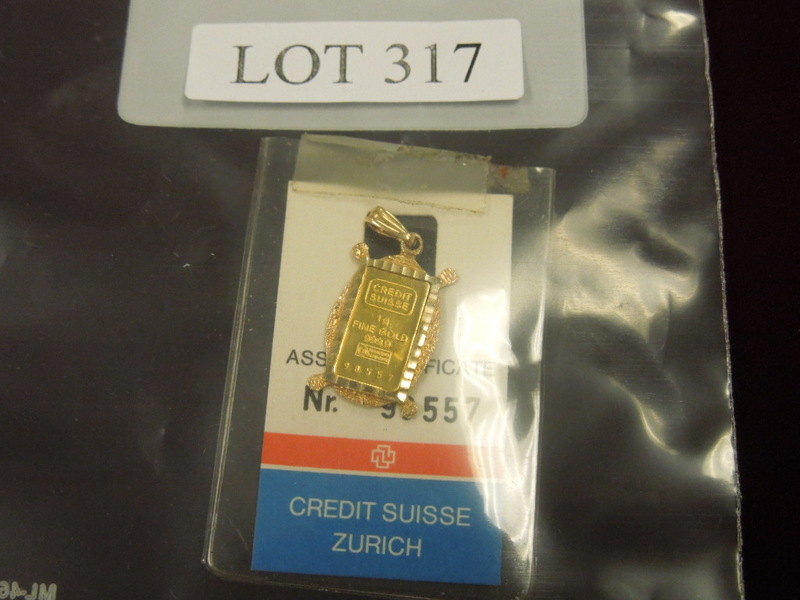 Lot 317: Credit Suisse 1 Grams Fine Gold Pendant. 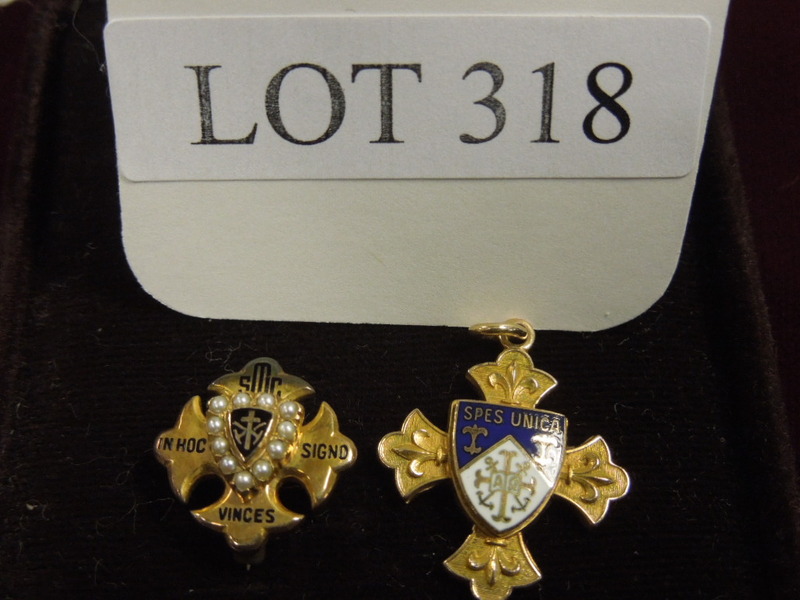 Lot 318: (2) 10k Pendants. 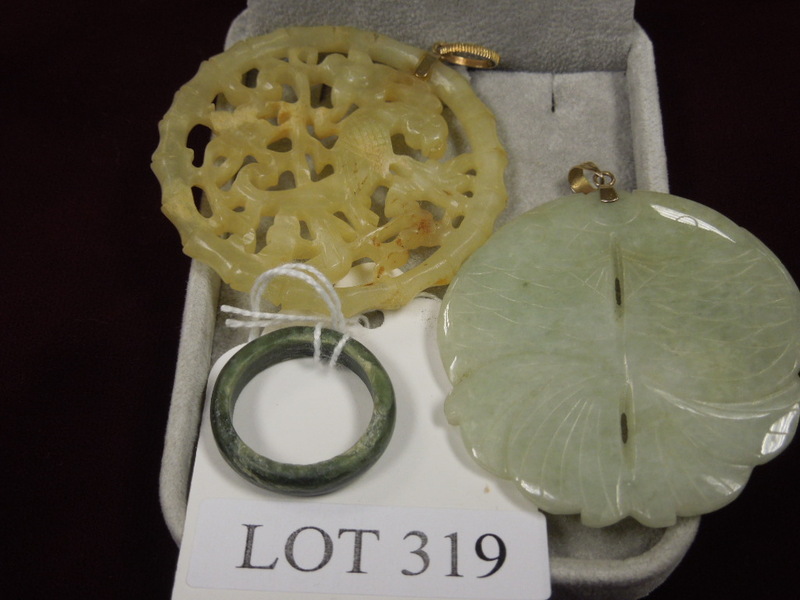 Lot 319: (2) Carved Jade Pendants With 14k And A Ring. 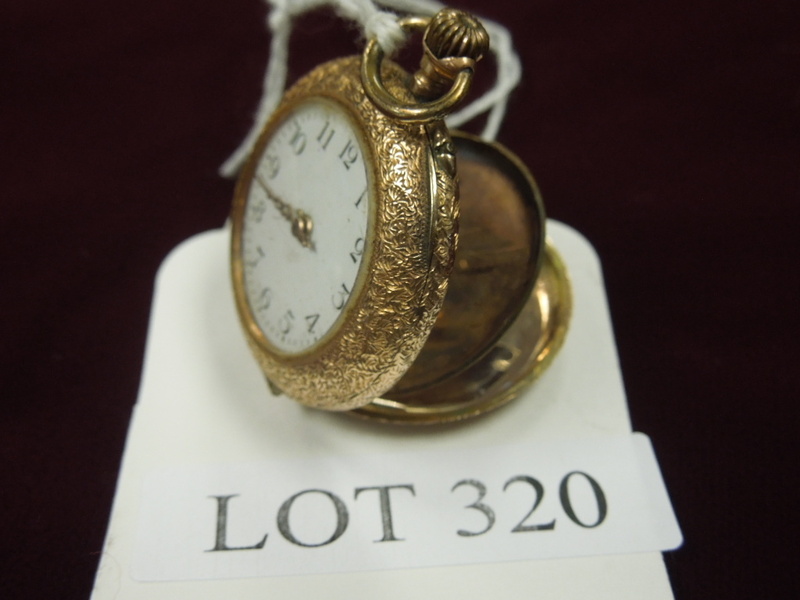 Lot 320: Vintage Pocket Watch Marked 14k. 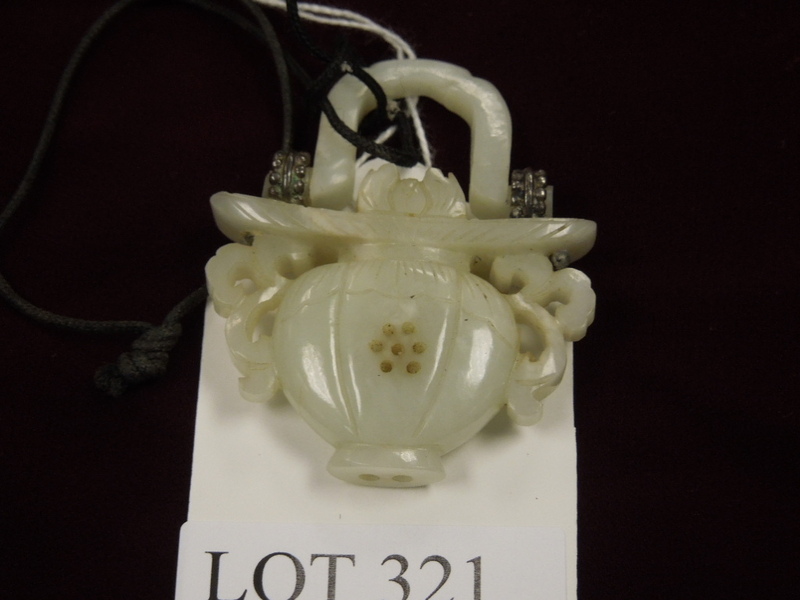 Lot 321: Carved White Jade Vessel Form Pendant. 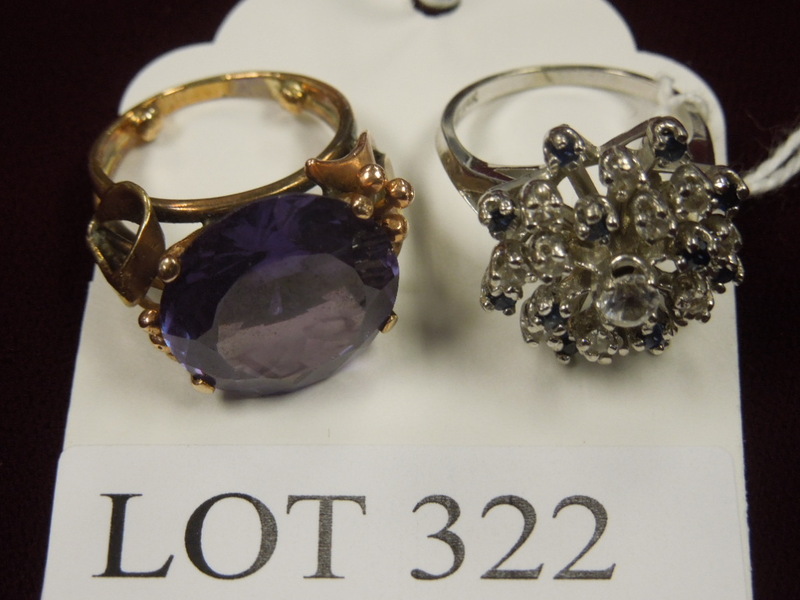 Lot 322: (2) Gold Rings With Stones. (One Marked 14k, One Tests 14k). 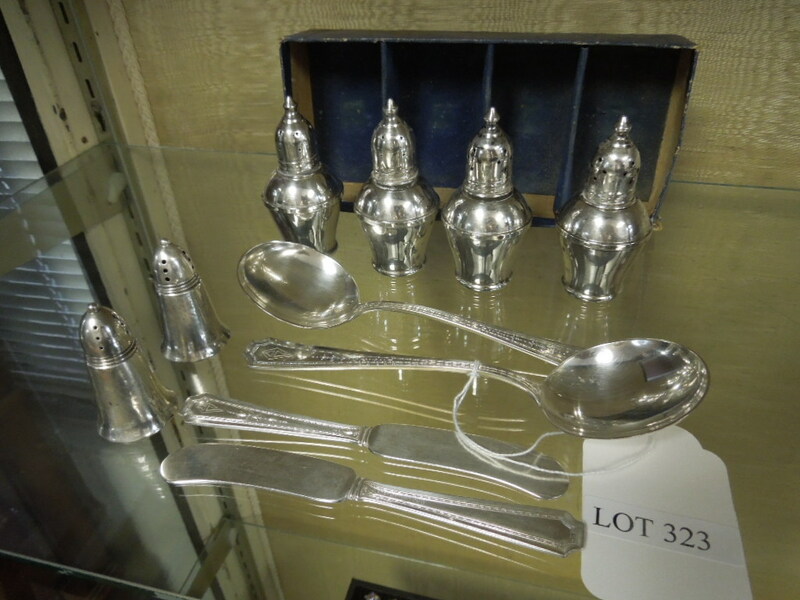 Lot 323: Group Of Sterling Silver Flatware And Weighted Shakers. 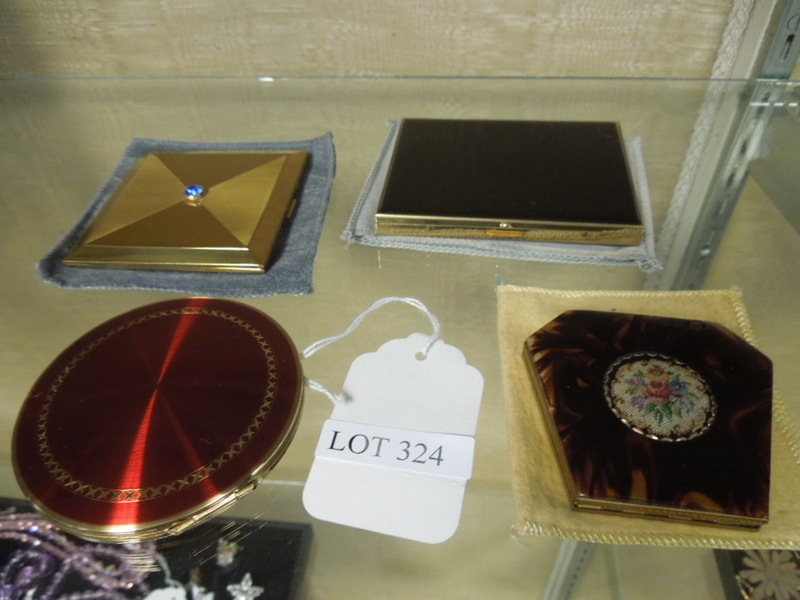 Lot 324: Group Of (3) Vintage Compacts And A Cigarette Case. 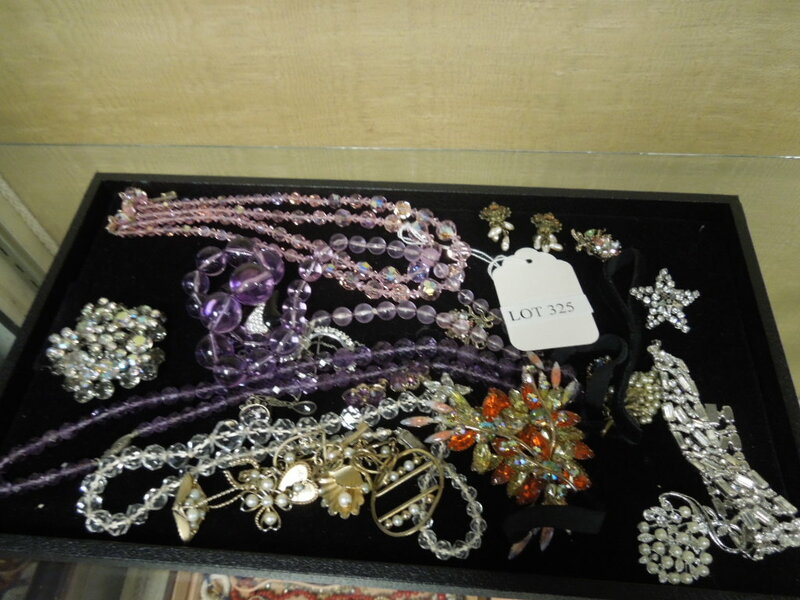 Lot 325: Group Of Rhinestone, Crystal And Vintage Jewelry. 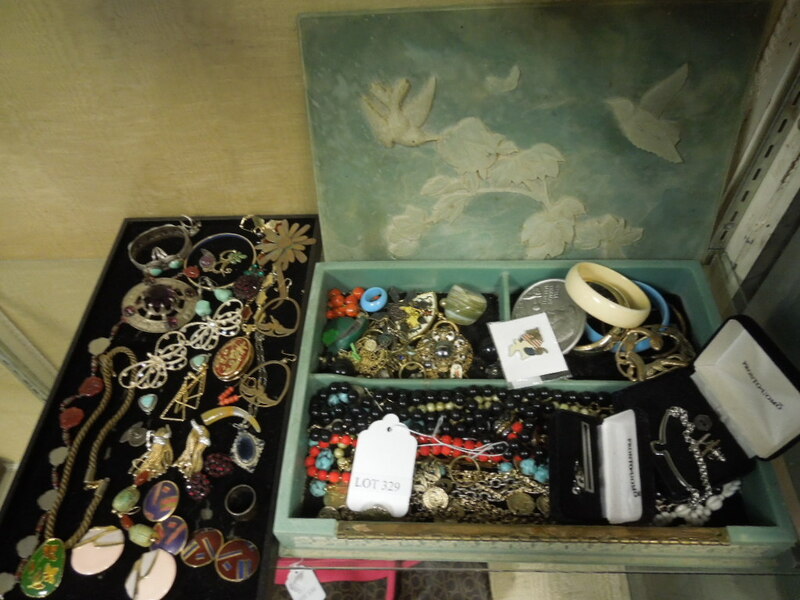 Lot 326: Jewelry Box With Asstd. Costume Jewelry. 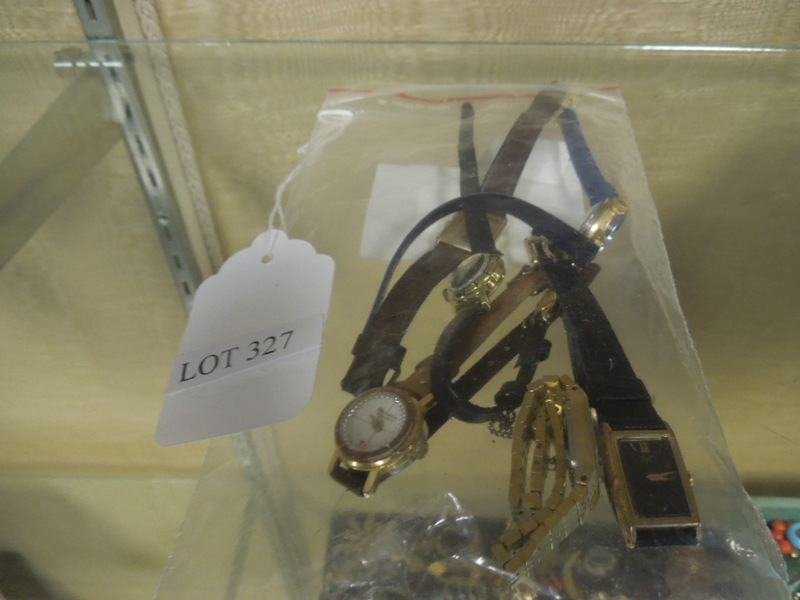 Lot 327: Group Of (5) Ladies' Wristwatches. 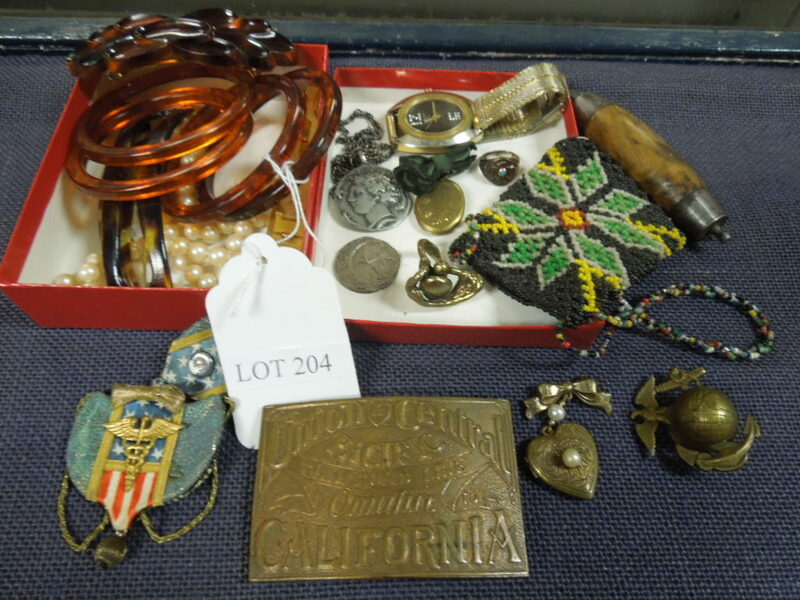 Lot 328: (6) Asstd. Bolo Brooches Incl. Lisa Carlson. 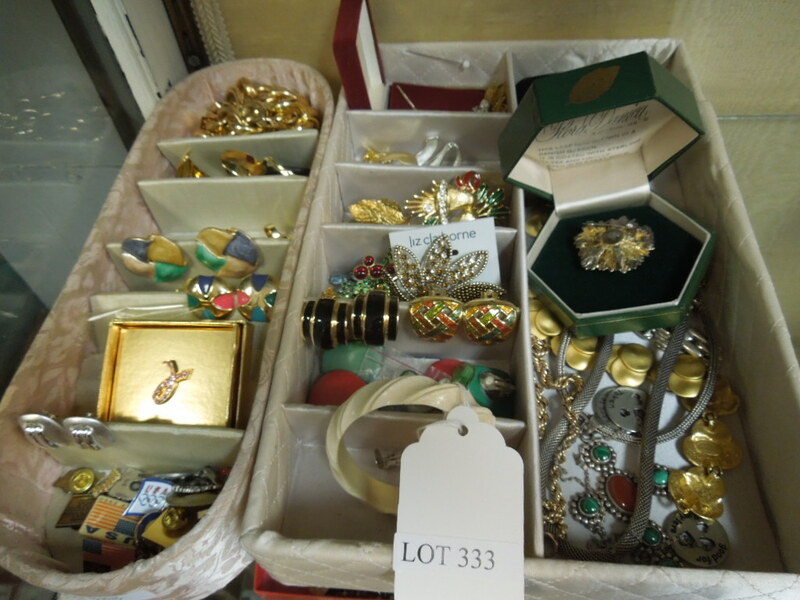 Lot 329: Group Of Costume Jewelry. 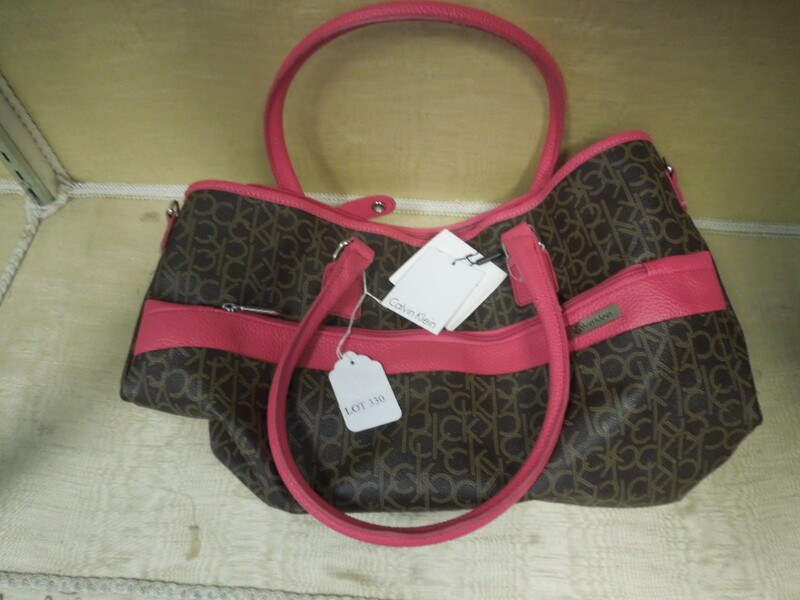 Lot 330: Calvin Klein Shoulder Bag With Original Tags. 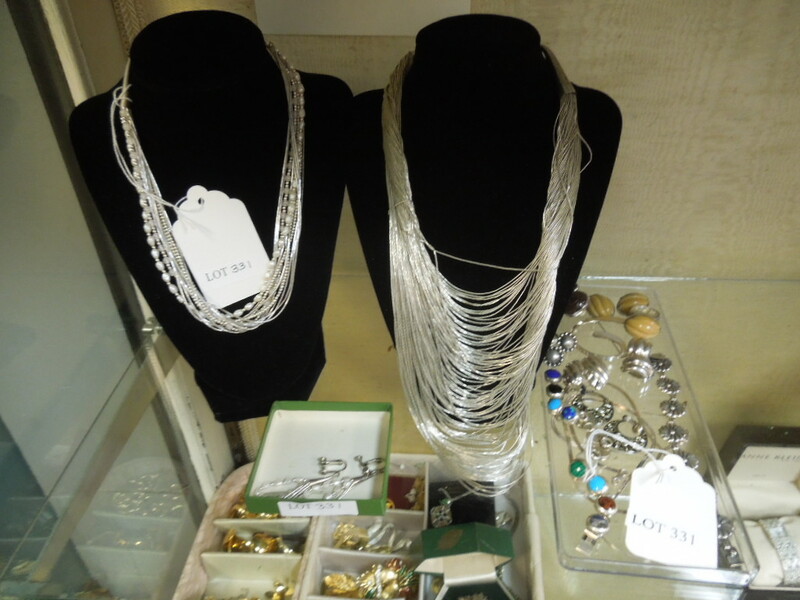 Lot 331: Group Of Costume Jewelry Necklaces, Earrings And Bracelets. (Stands Not Included). 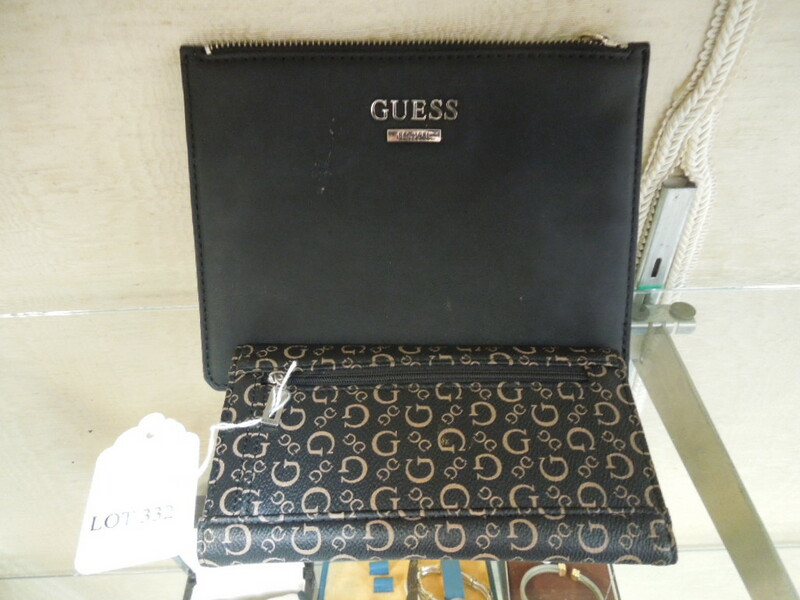 Lot 332: Guess Ladies' Wallet And A Clutch Purse. 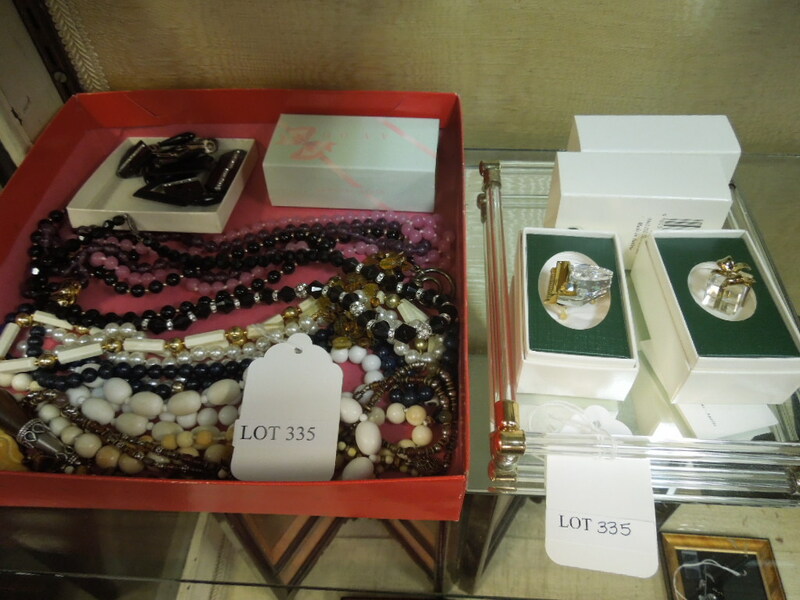 Lot 333: Group Of Costume Jewelry Incl. Sterling Silver Necklaces. 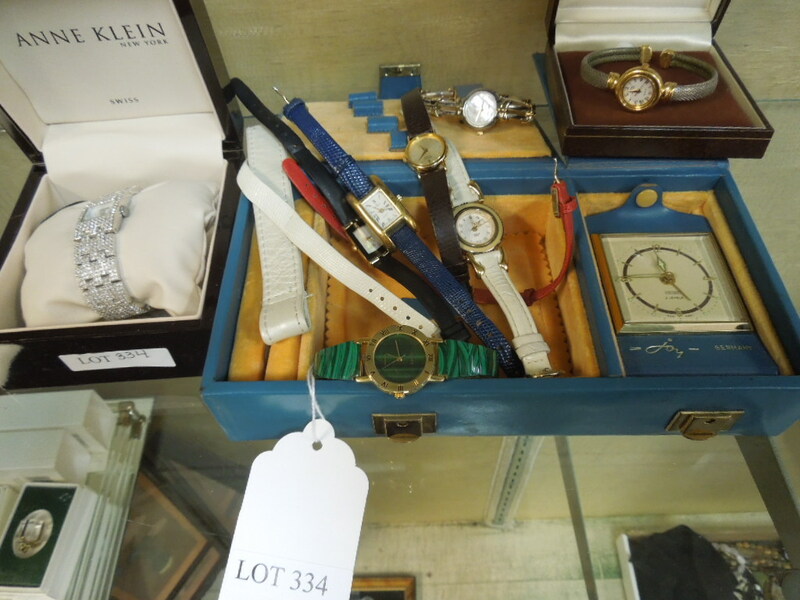 Lot 334: Group Of Ladies' Wristwatches Incl. Anne Klein, Peugeot. 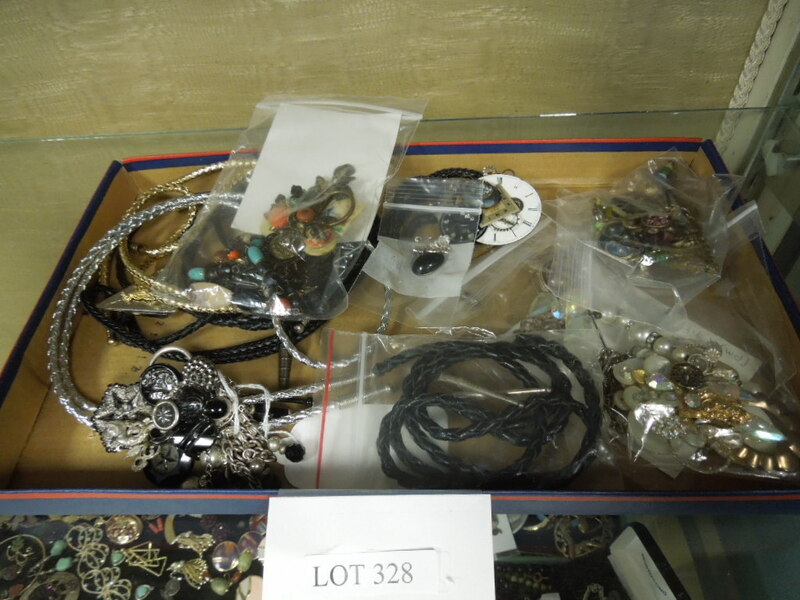 Lot 335: Group Of Costume Jewelry And Swarovski Crystal Keepsakes. 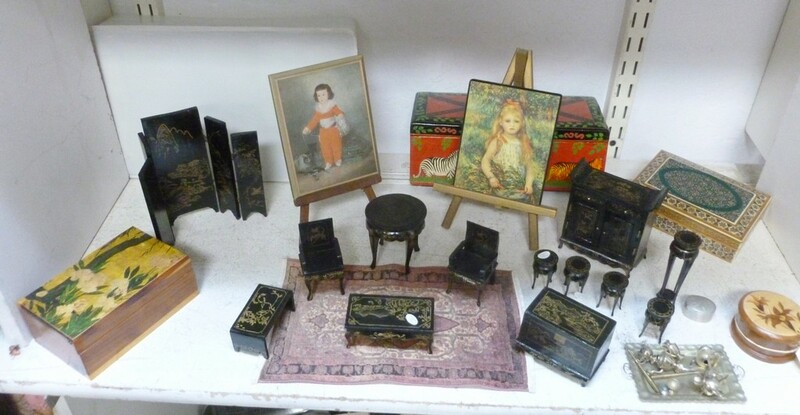 Lot 336: Oriental Miniature Screen And 3 Plaques. 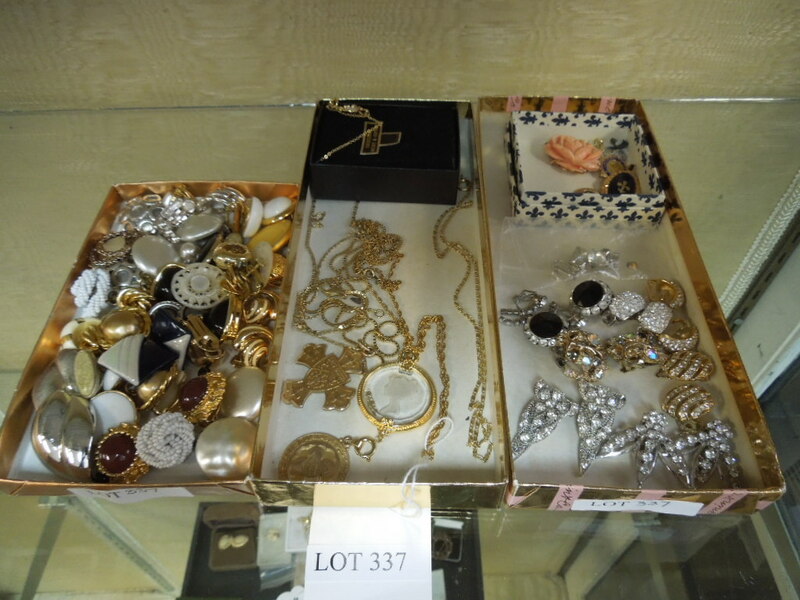 Lot 337: Group Of Costume Jewelry Necklaces And Earrings. 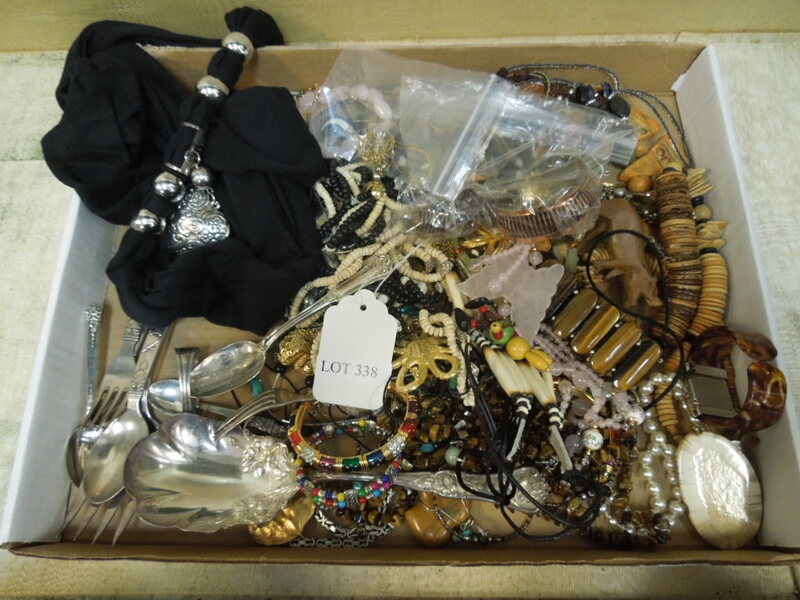 Lot 338: Box Of Costume Jewelry And Flatware. 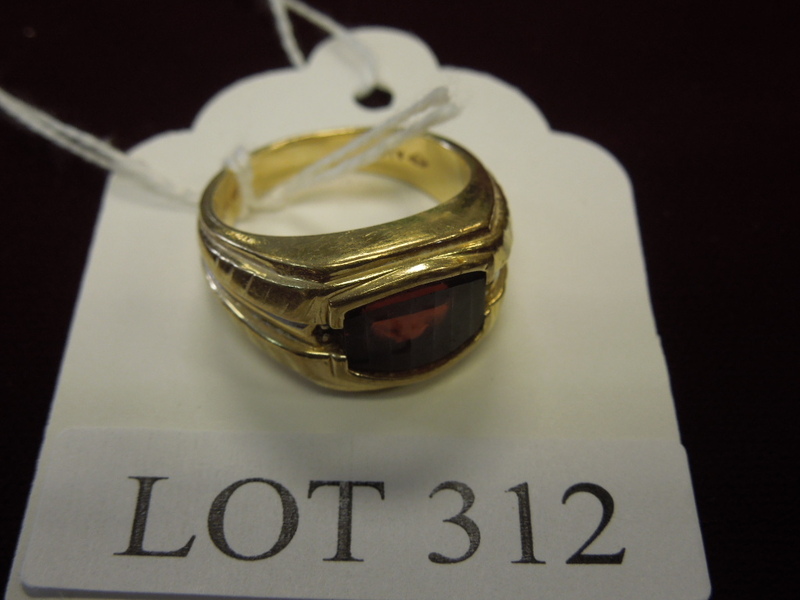 Lot 339: 18k Yellow Gold Ring With 2 Stones And Small Group Of Costume Jewelry. 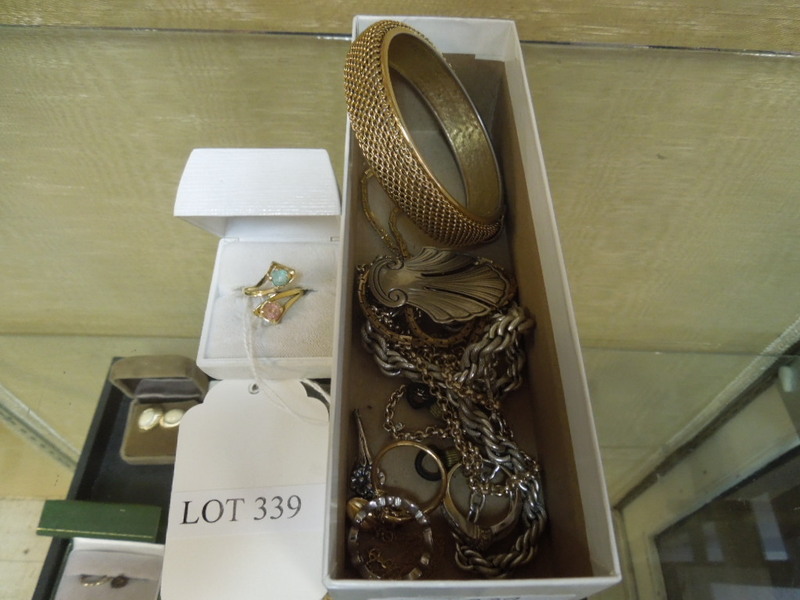 Lot 340: 14k Gold Earrings, 14k Chain And A Small Group Of Costume Jewelry. 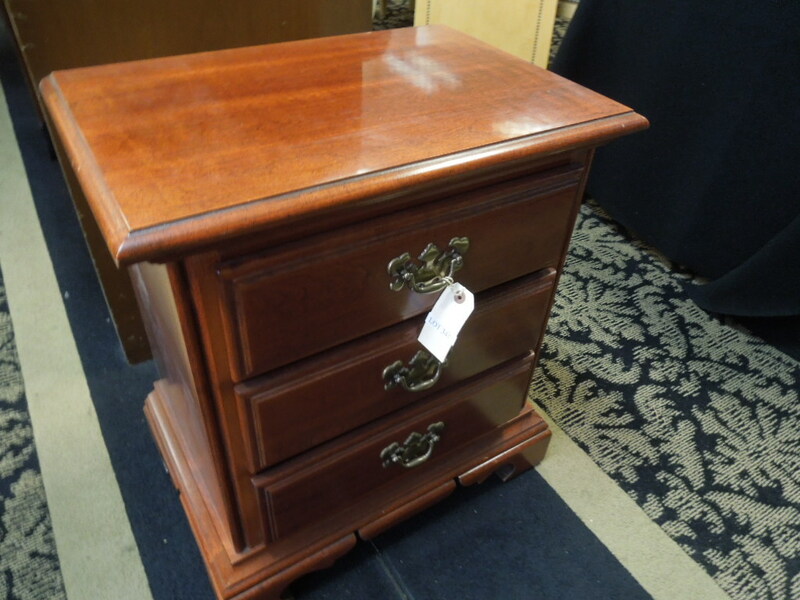 Lot 341: Mahogany 3-Drawer Low Chest. 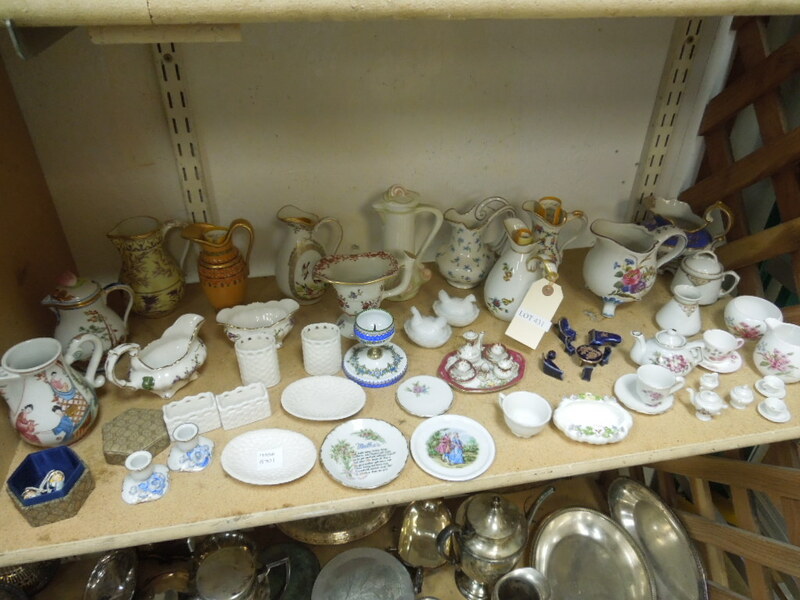 Lot 342: Group Of Fine Porcelain Incl. Lidded Pill Boxes. Lot 343: Carved Stone Guan Yin Figural Group. (Approx. 12" Tall). Lot 344: Chinese Brass "Iron" Pot With Hard Stone Handle. 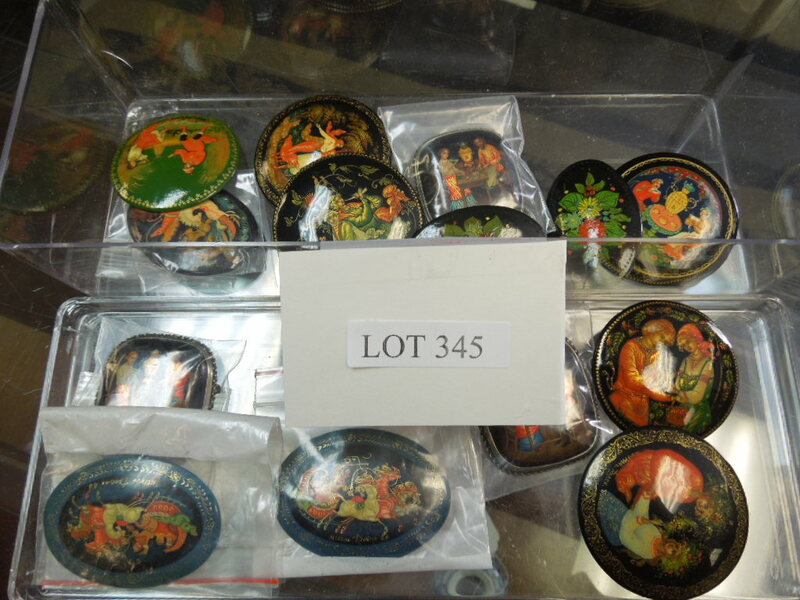 Lot 345: (12) Russian Lacquer Brooches, Signed. 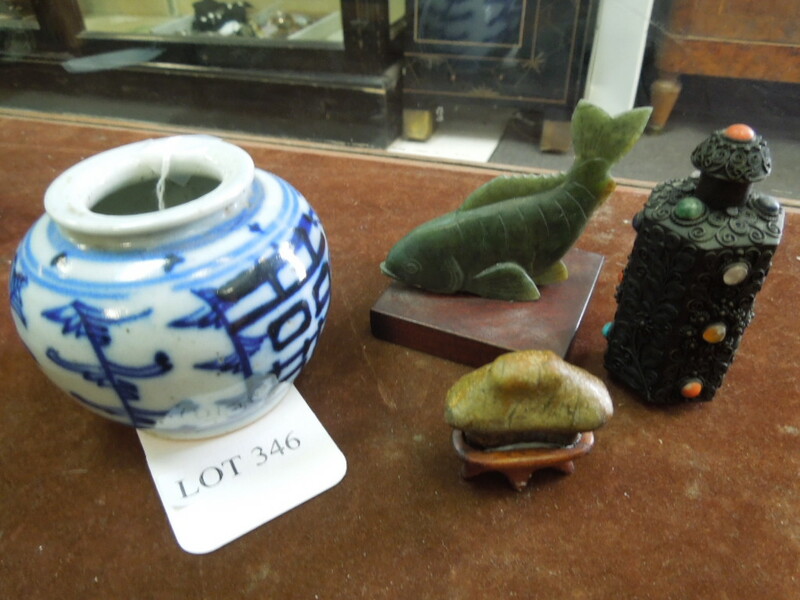 Lot 346: Chinese Porcelain Miniature Bowl, Carved Stone Fish, Filigree Snuff Bottle And A Miniature Figurine. 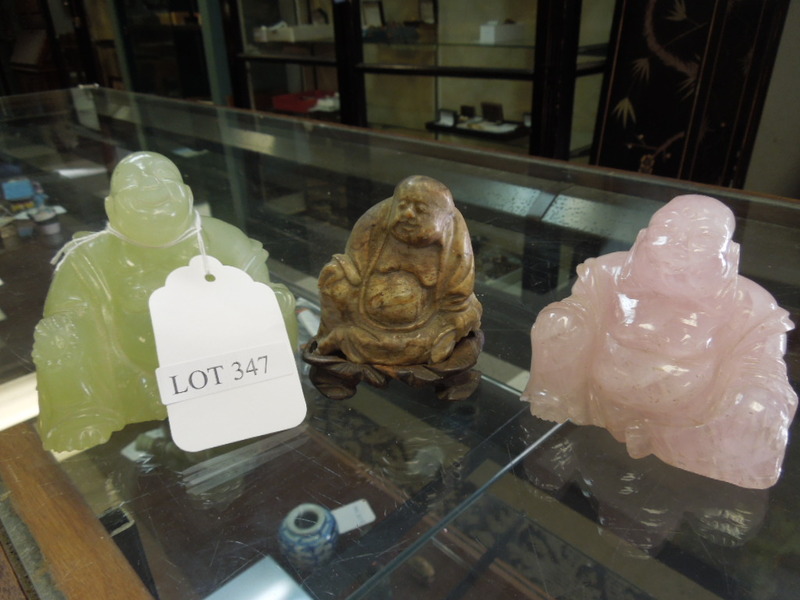 Lot 347: (3) Chinese Carved Buddha Figures Incl. Rose Quartz. 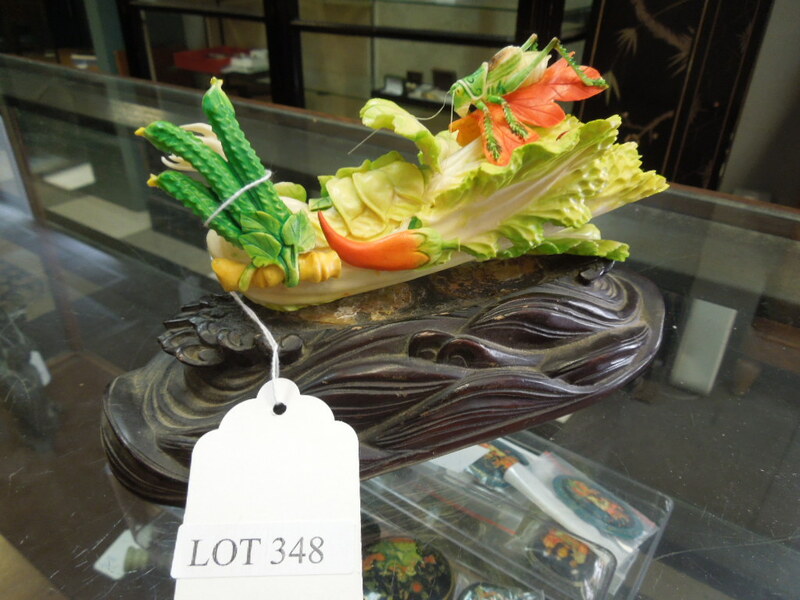 Lot 348: Carved Composition Figure Of Lettuce And Grasshopper On Stand. 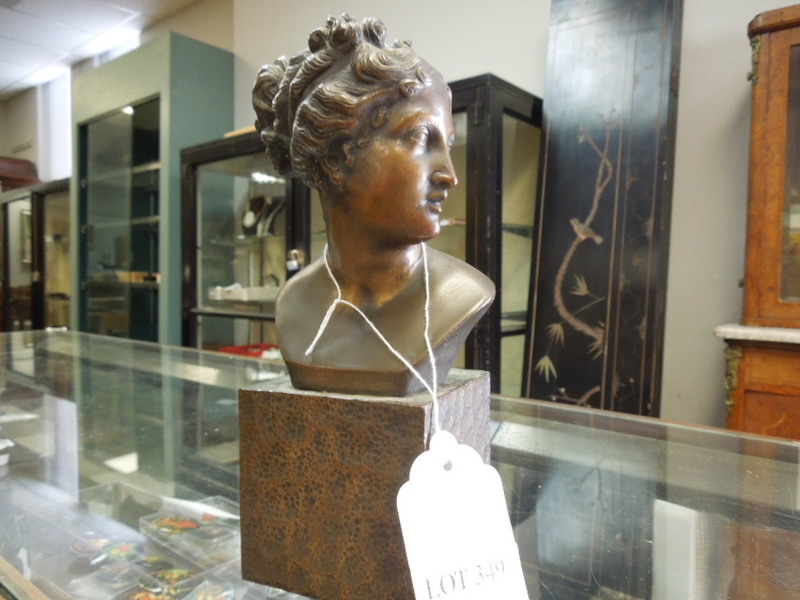 Lot 349: Bronze Classical Bust Of A Woman. (9" Tall). 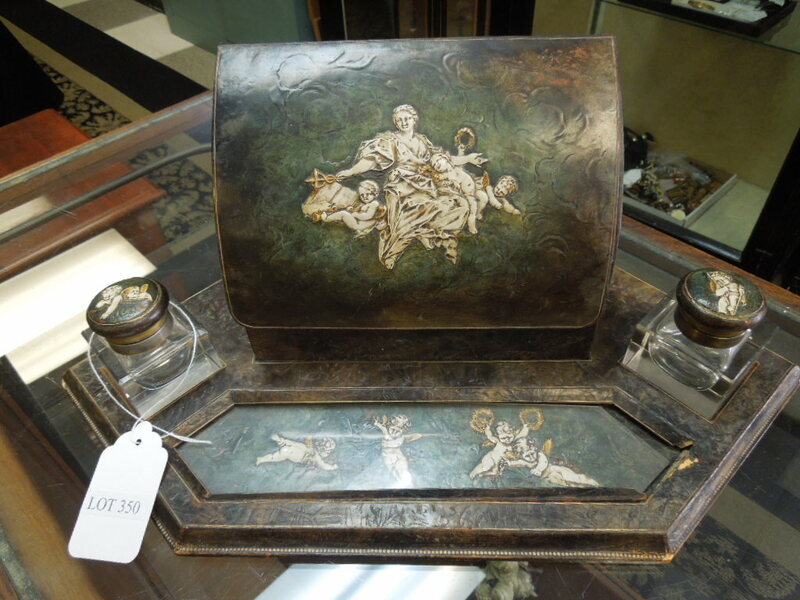 Lot 350: Hand Tooled And Embossed Leather Inkwell Set. 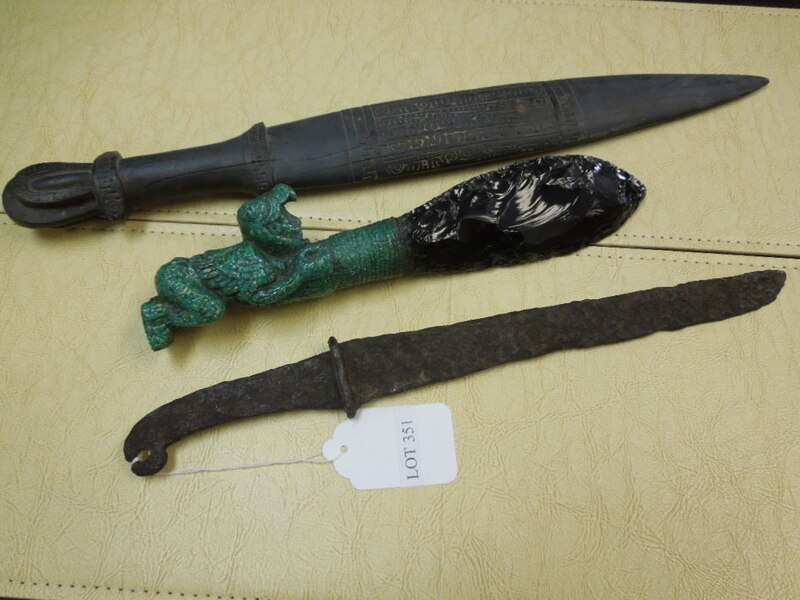 Lot 351: Tribal Carved Stone Fetish Knife, Hand Carved Wood Knife And A Forged Iron Cut Knife. 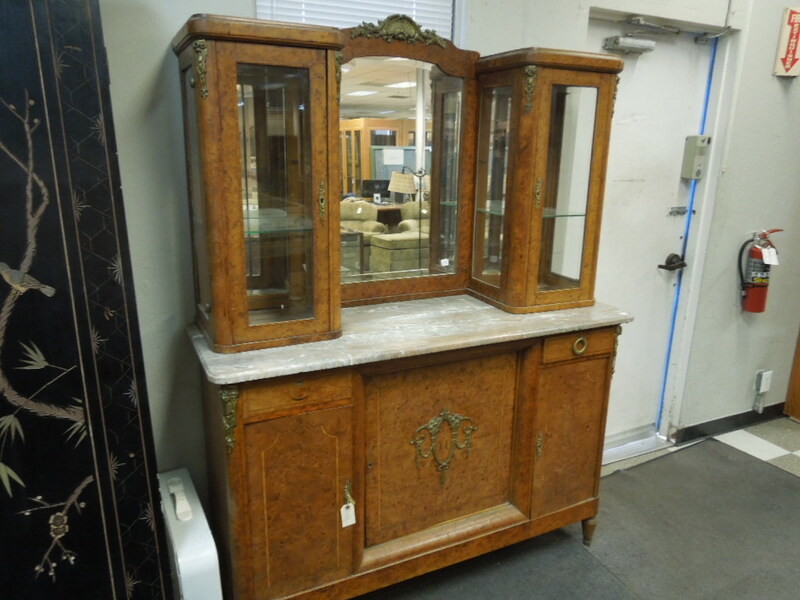 Lot 352: 1920s Continental Burl Walnut And Marble Top Buffet Deux Corps. 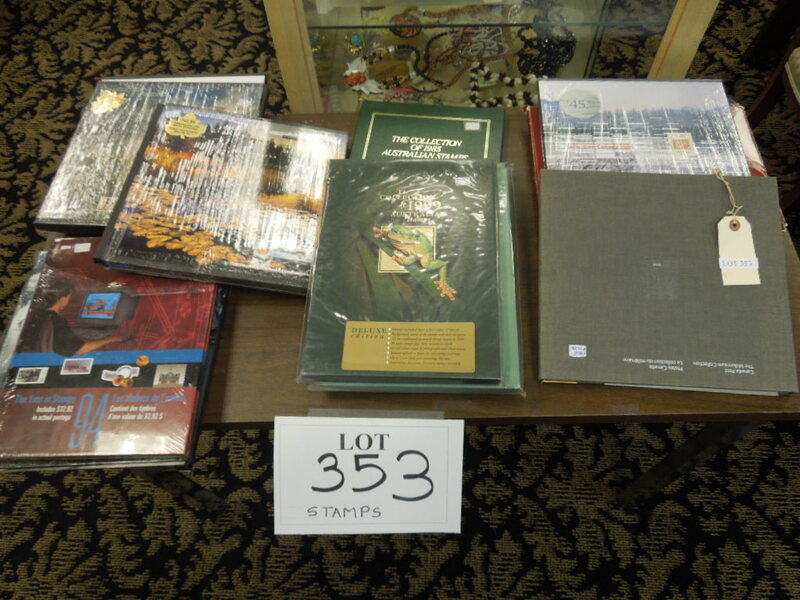 Lot 353: Group Of Australia & Canada Annual Stamp Books. 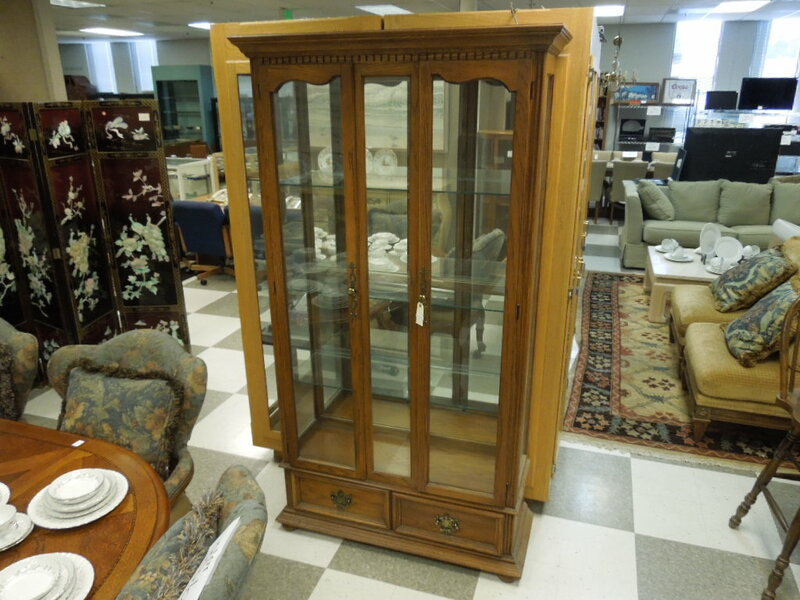 Lot 354: Gothic Style 8-Door Glass Front Cabinet. 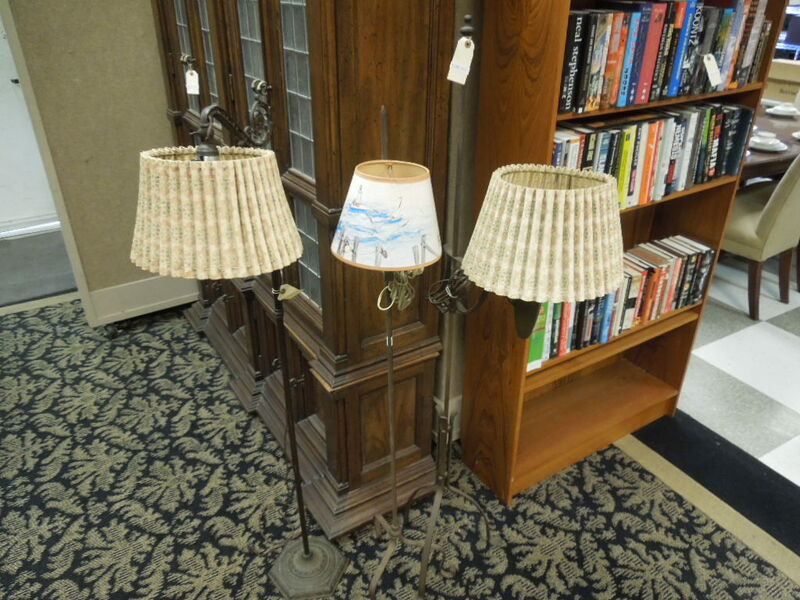 Lot 355: (3) Vintage Metal Floor Lamps. 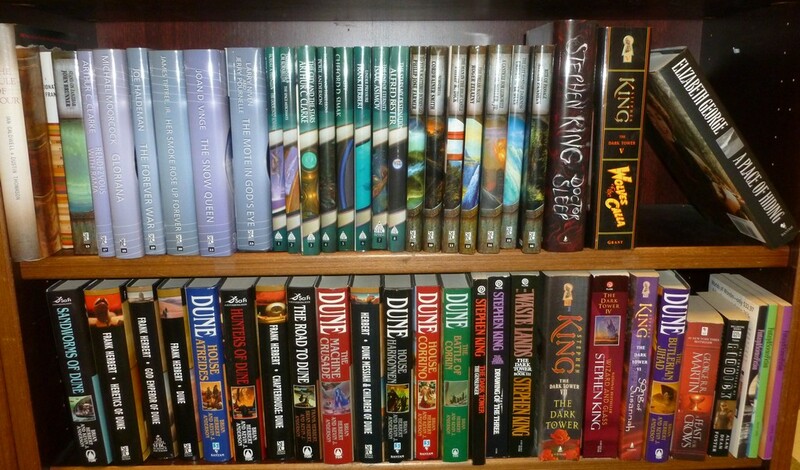 Lot 356: (4) Shelves Of Sci-Fi And Other Books. 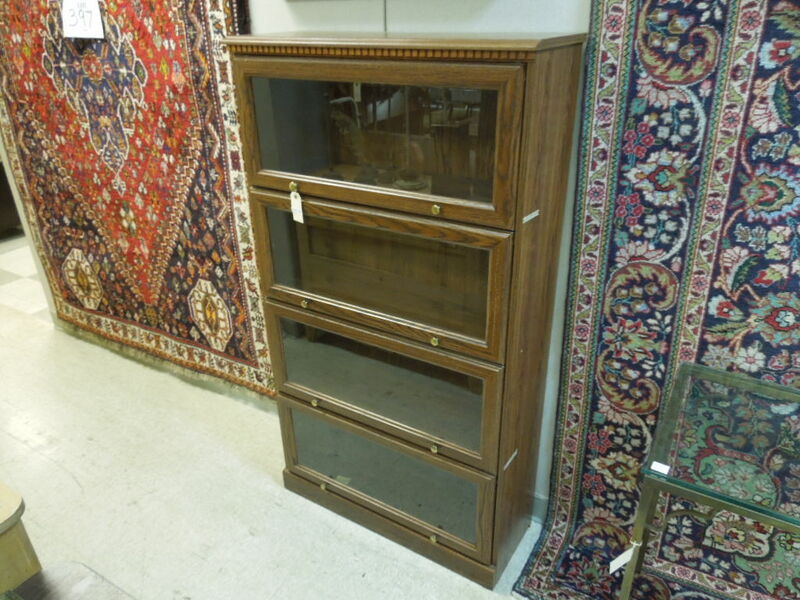 Lot 357: Teak 6-Shelf Bookcase. 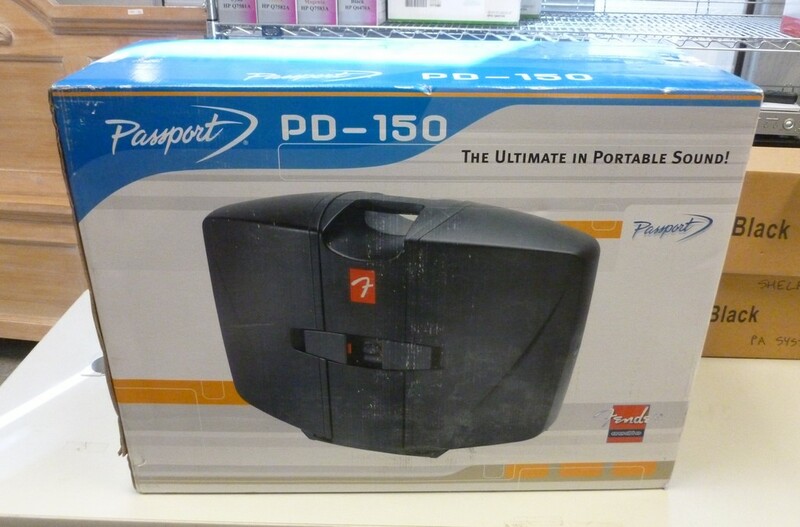 (Made In Denmark). 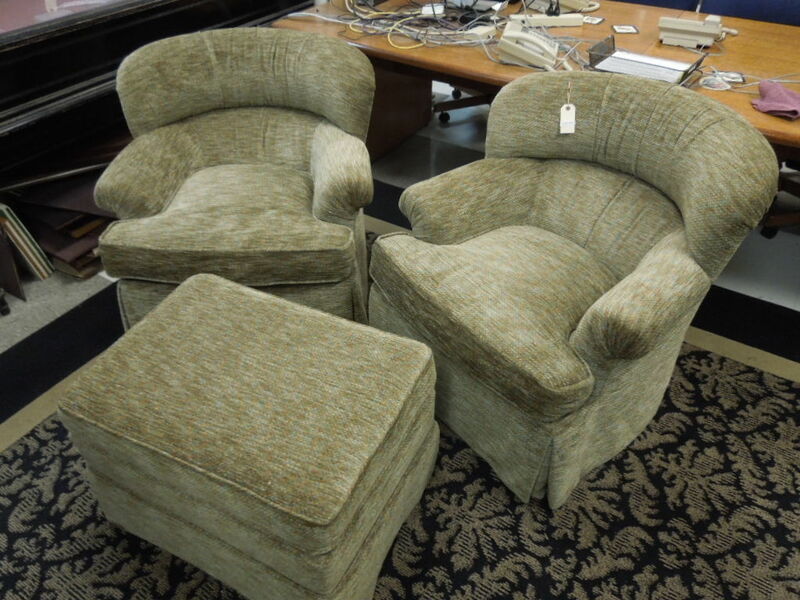 Lot 358: Pair Of Upholstered Swivel Armchairs With Ottoman. 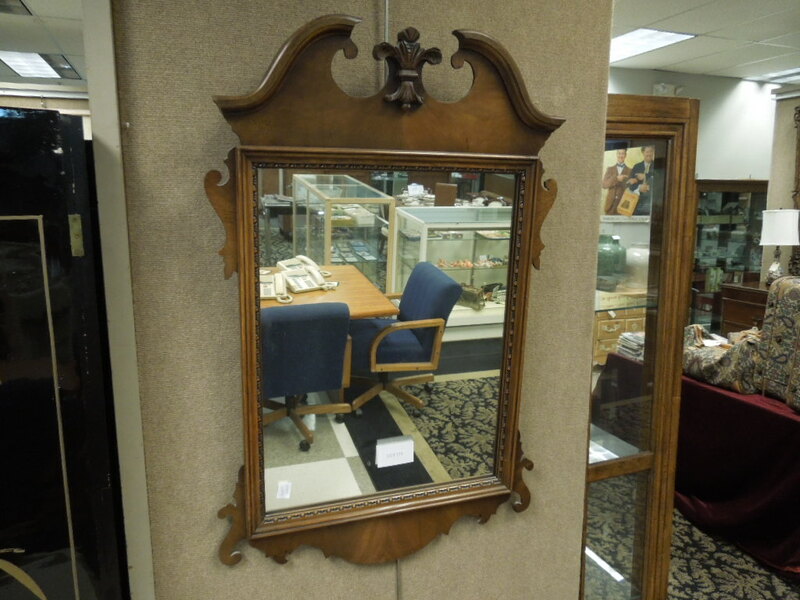 Lot 359: 1940s Walnut Framed Federal Style Mirror. 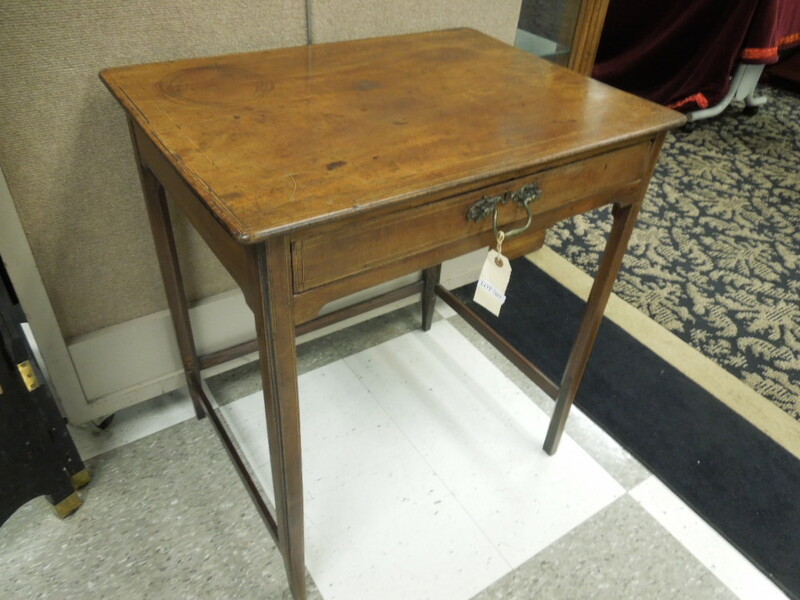 Lot 360: 19th C. Single Drawer Writing Table. 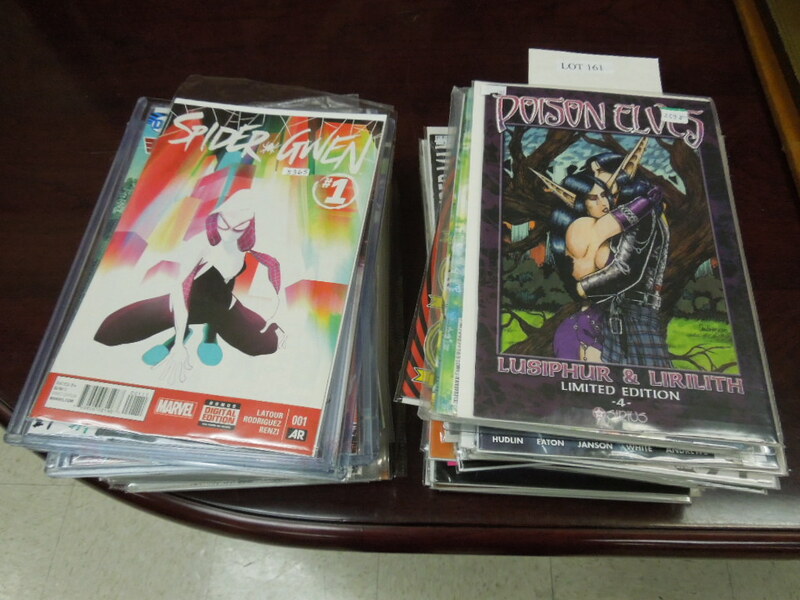 Lot 361: Collection Of Modern Age Comic Books And Trading Cards Incl. Some Signed Cards. 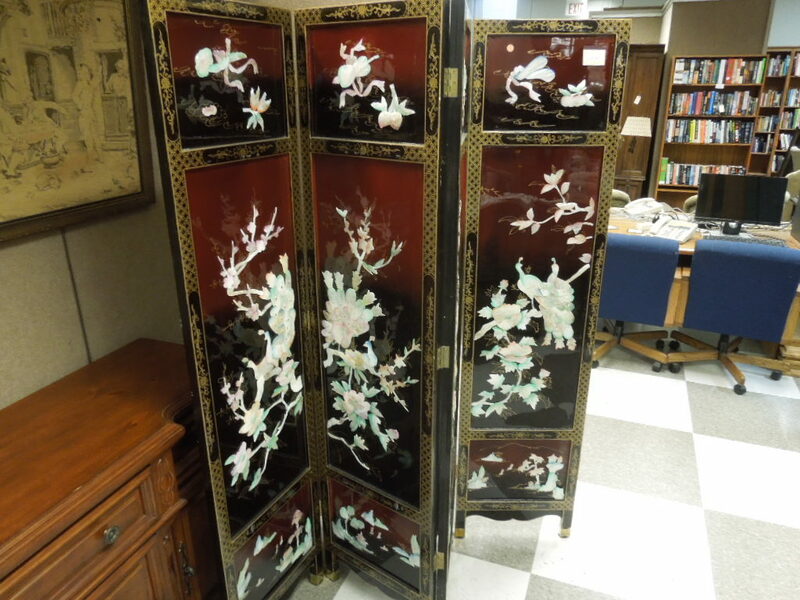 Lot 362: Oriental 4-Panel Reversible Screen With Applied Flora And Fauna Decoration. 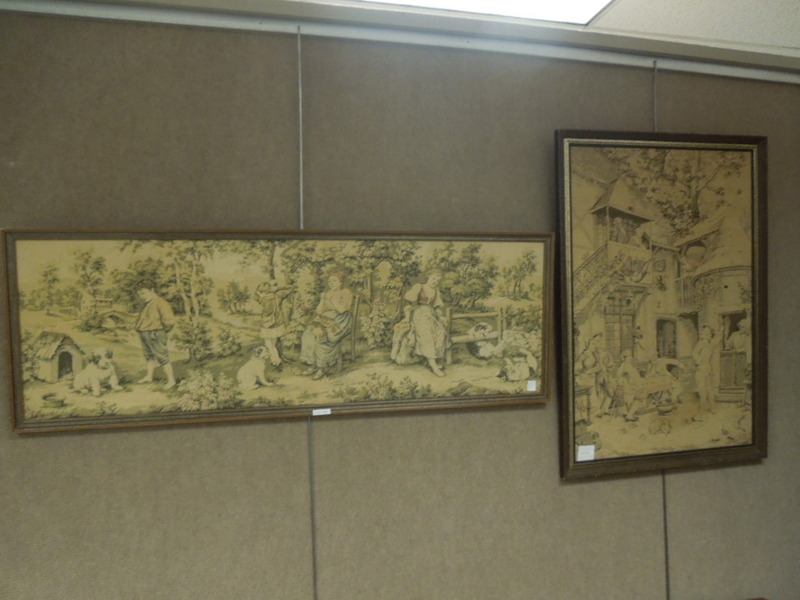 Lot 363: (2) Framed Tapestries. 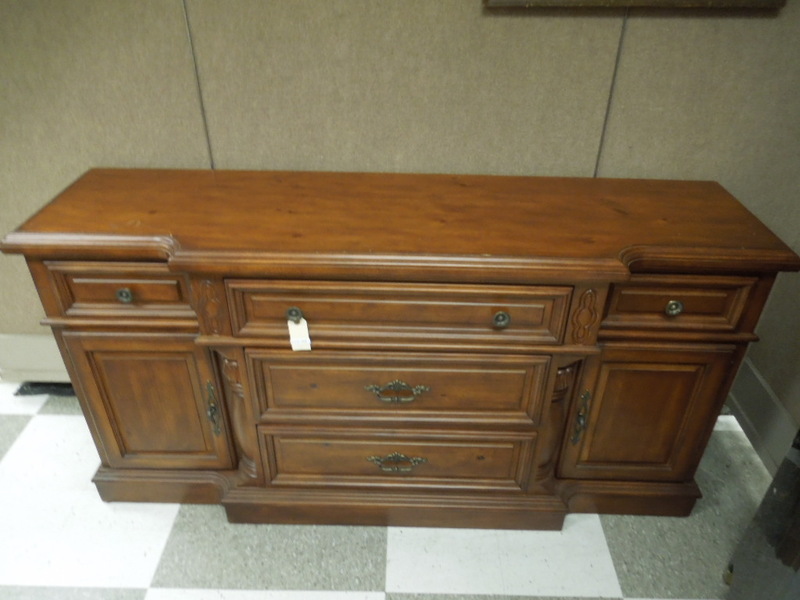 Lot 364: Knotted Pine Contemporary 5-Drawer 2-Door Buffet. 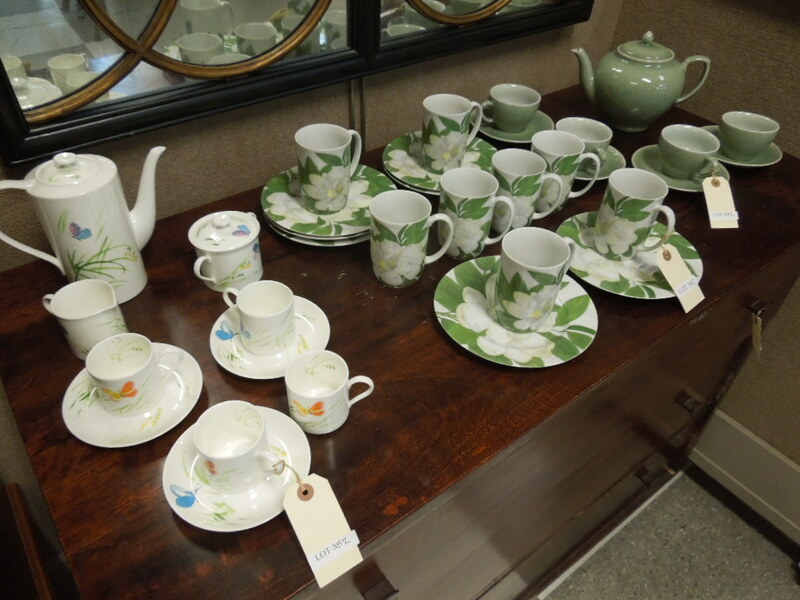 Lot 365: Japanese Porcelain Dinner Service. Lot 366: Contemporary Dining Table With 5 Chairs. 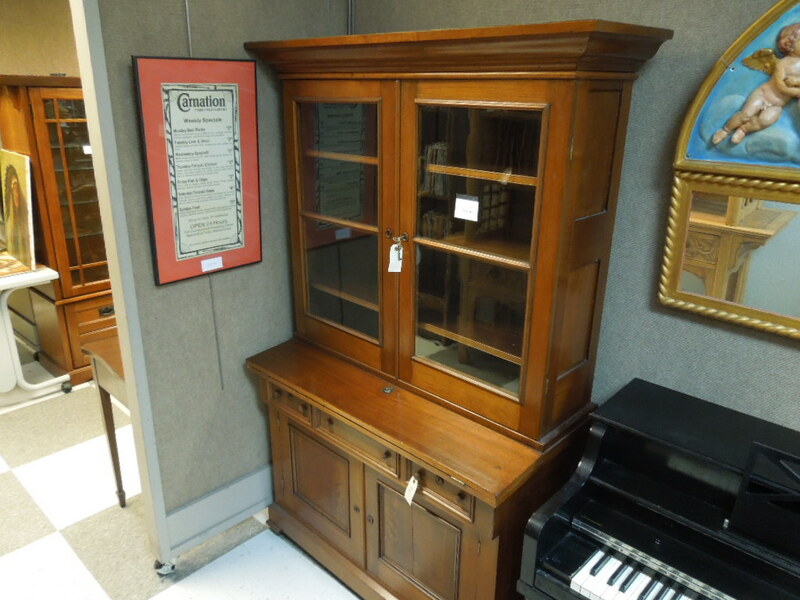 Lot 367: Contemporary Oak, Lighted Display Cabinet. 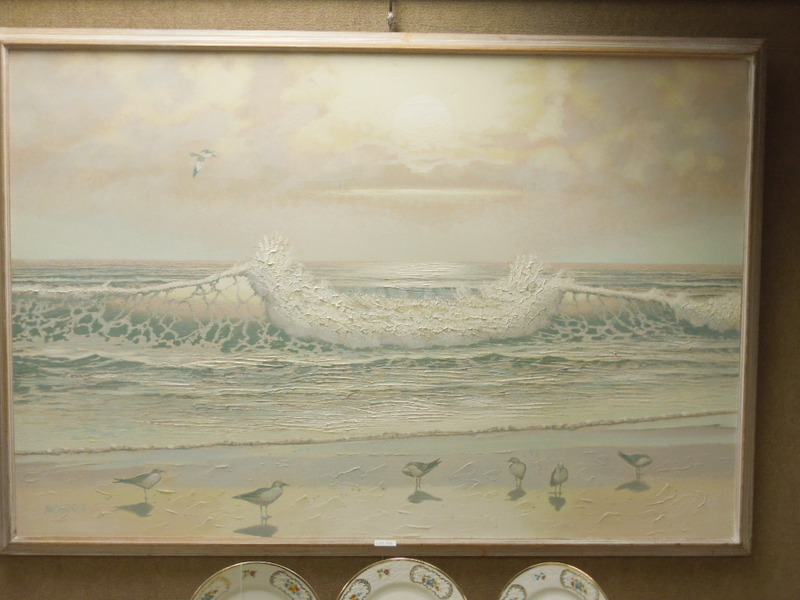 Lot 368: Contemporary Oil On Canvas, Birds On A Seashore, Signed Anderson. (44" X 64"). 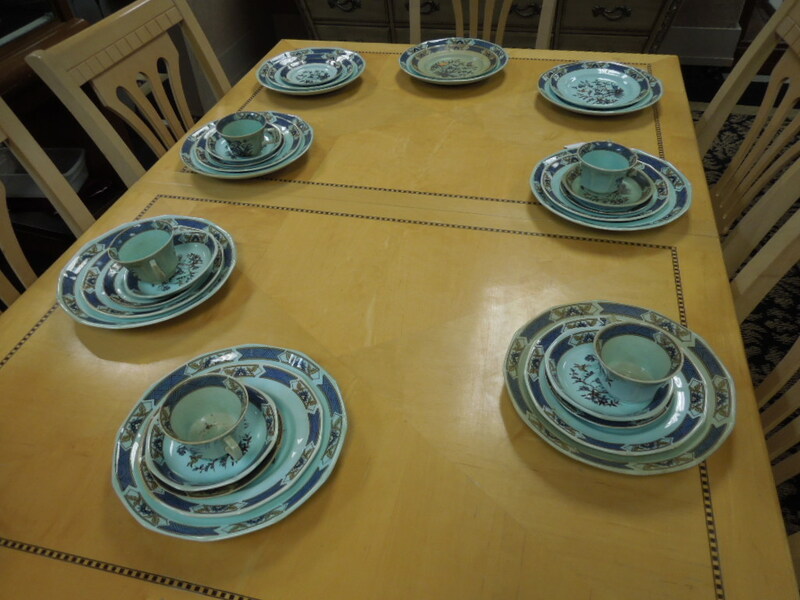 Lot 369: (10) Schumann Bavaria Porcelain Dinner Plates. Gilt Rimmed With Floral Decoration. 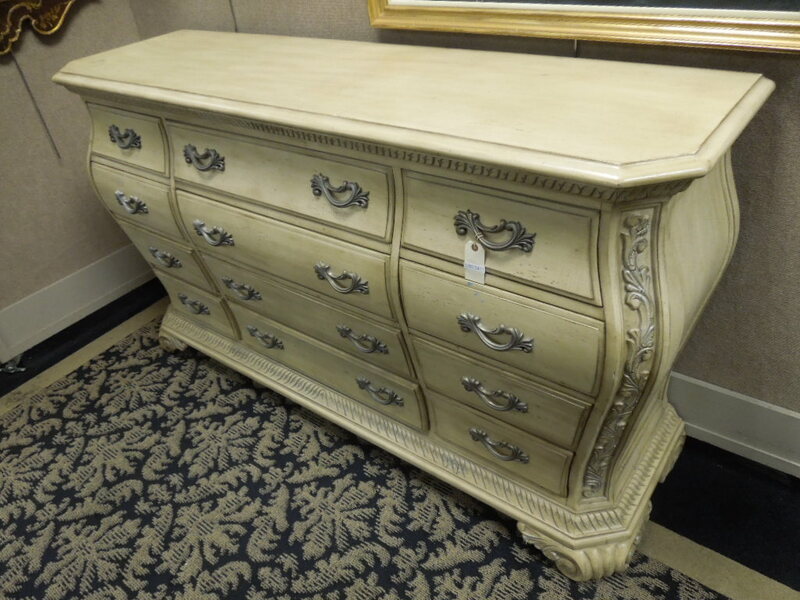 Lot 370: Wynwood Contemporary 12-Drawer Dresser. 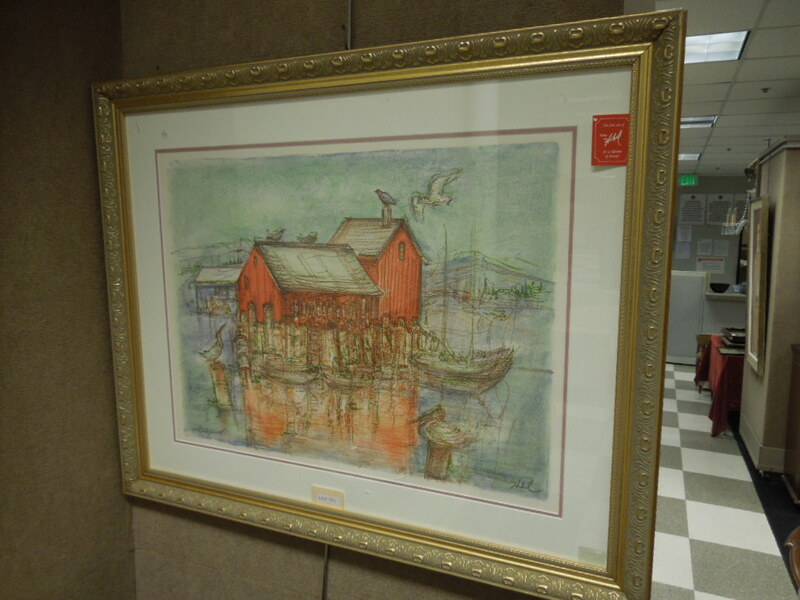 Lot 371: Framed Edna Hibel Artist Proof Lithograph, Wharf With Boats. (21" X 28"). 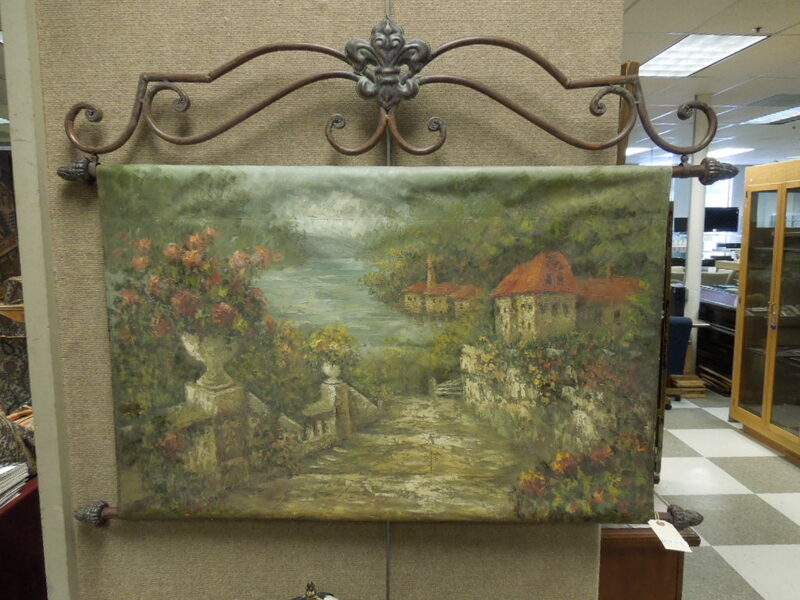 Lot 372: Hanging Oil On Canvas Tapestry Village Road To The Lake. Signed. (24" X 36"). 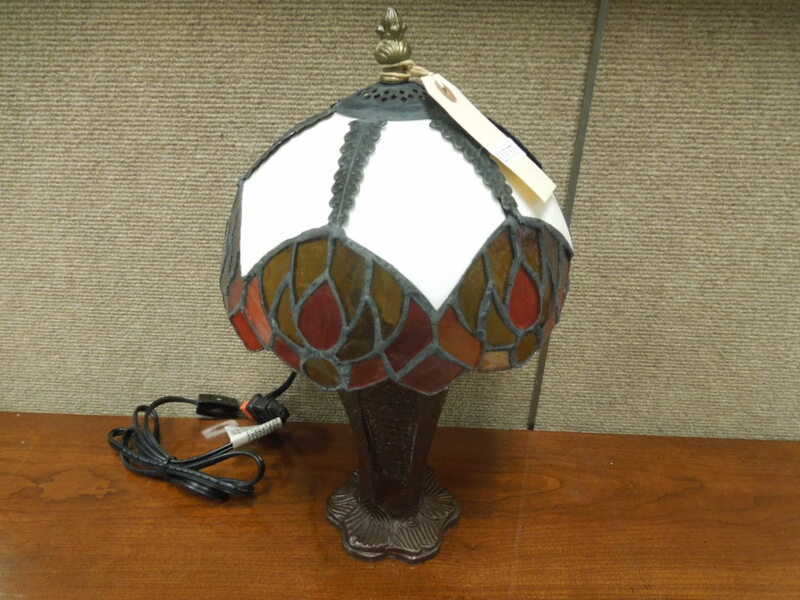 Lot 373: Contemporary Leaded Glass Shade Table Lamp. 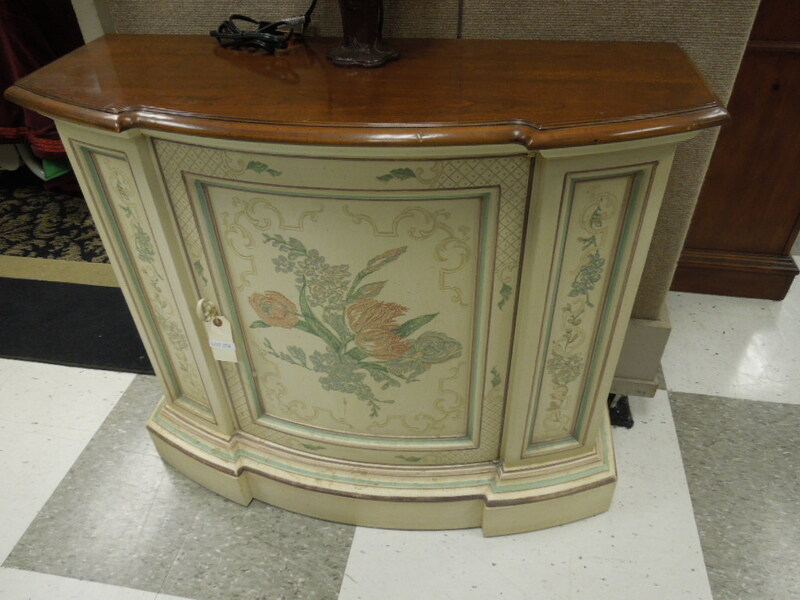 Lot 374: Contemporary Single Door Painted Wall Cabinet. 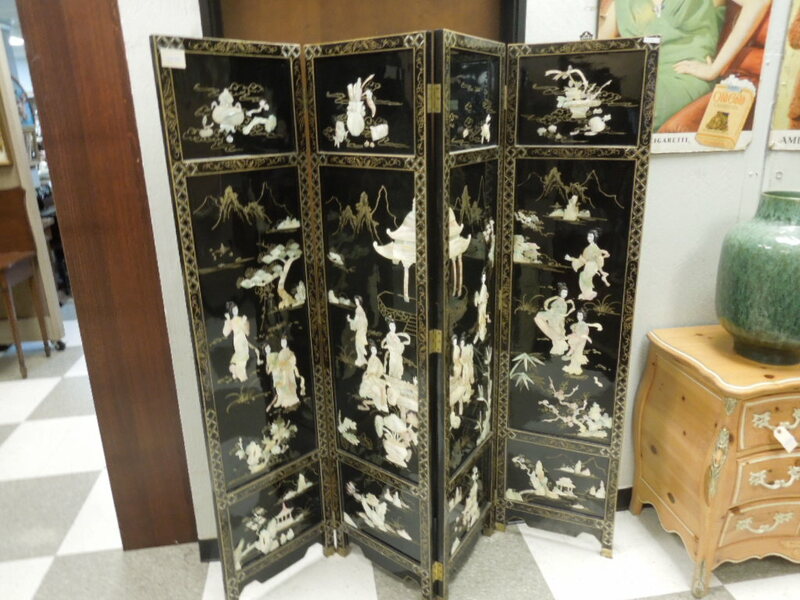 Lot 375: Oriental 4-Panel Folding Screen. 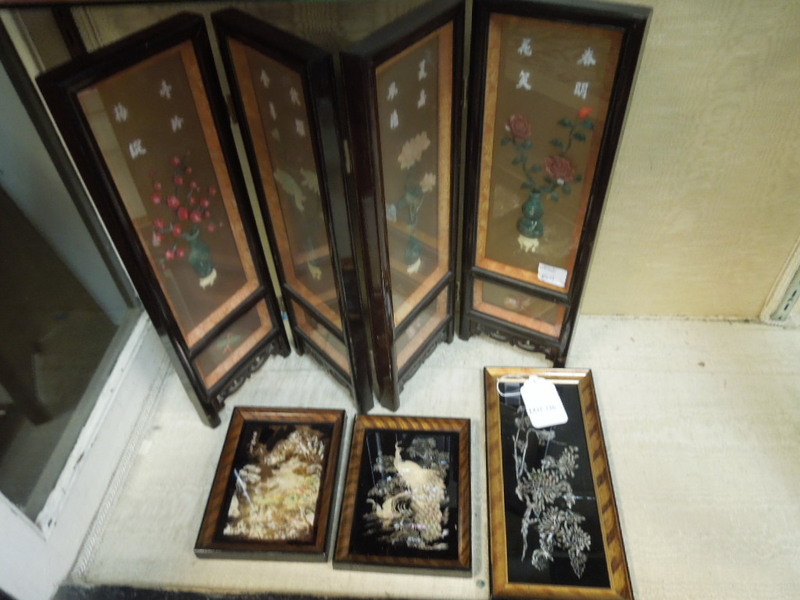 Lot 376: (2) Oriental Panels With Hard Stone Floral Decoration. 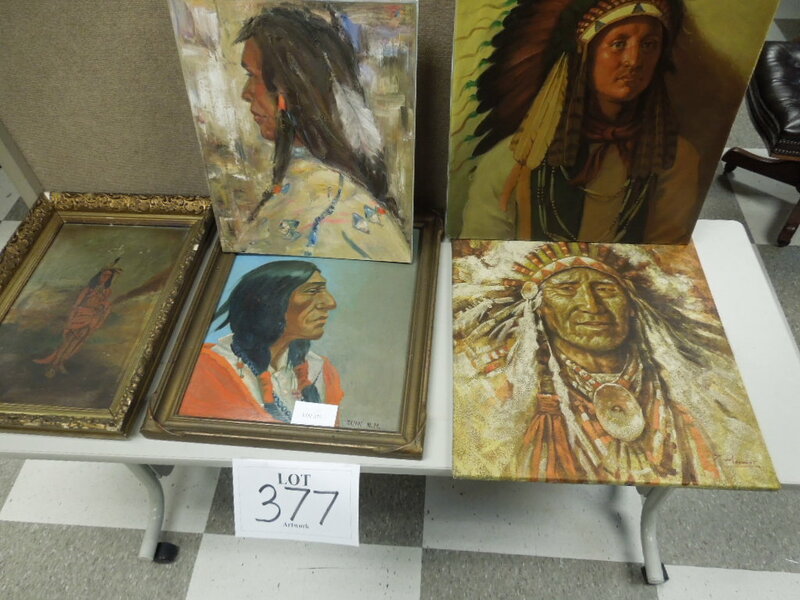 Lot 377: Group Of (5) Native American Themed Oils On Canvas. 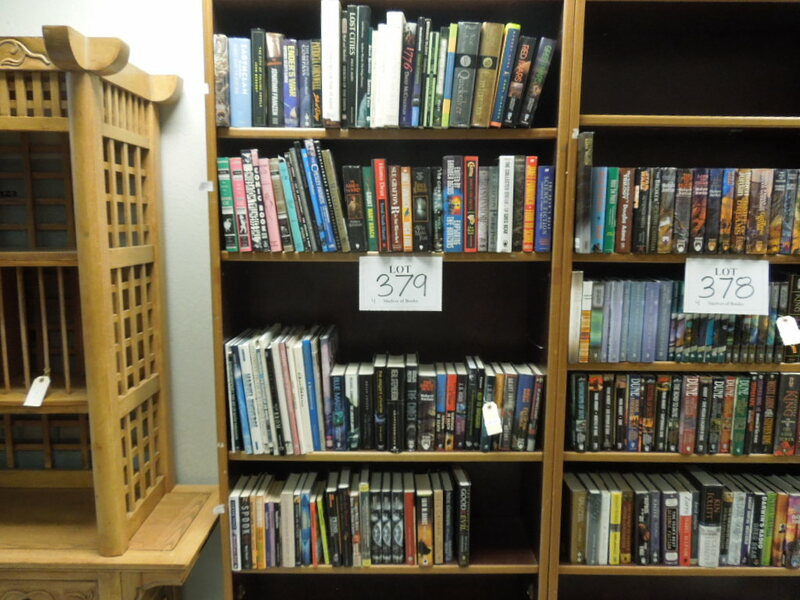 Lot 378: (4) Shelves Of Science Fiction Books. 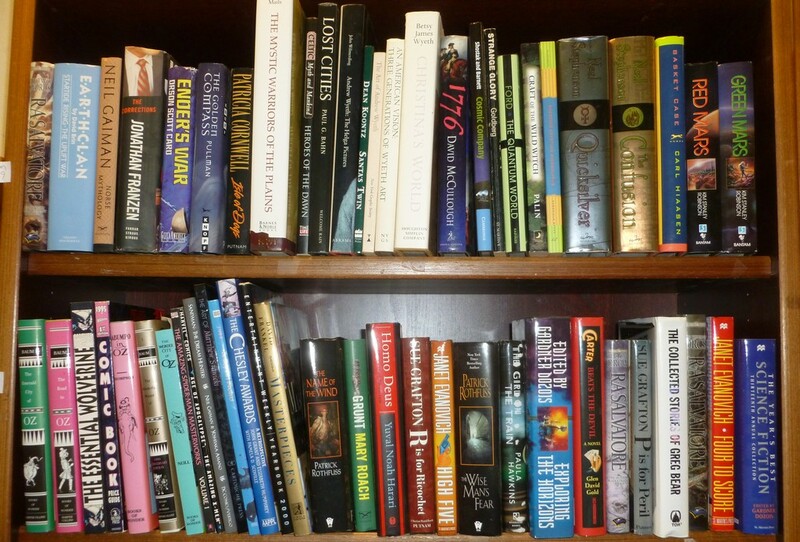 Lot 379: (4) Shelves Of Science Fiction And Coffee Table Books. 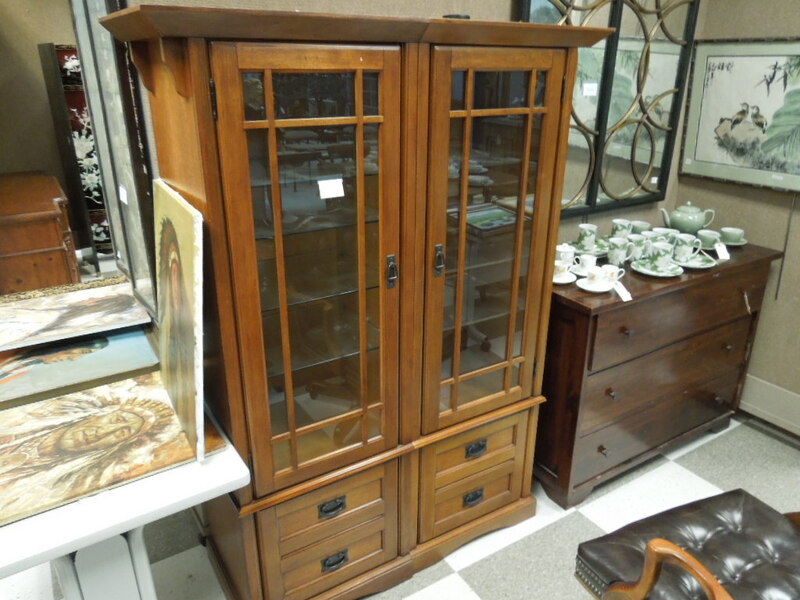 Lot 380: (2) Oak Mission Style Display Cabinets. 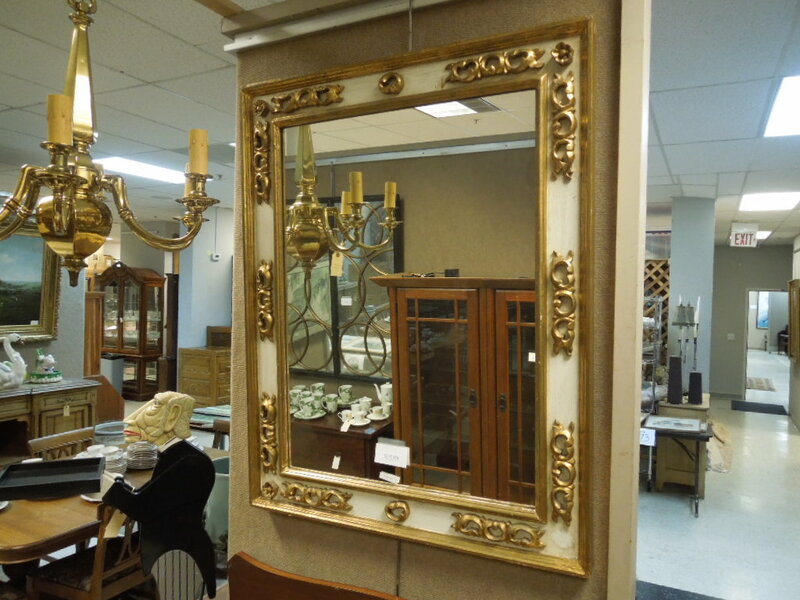 Lot 381: Framed Contemporary Mirror With Gilt Circle Overlay Design. 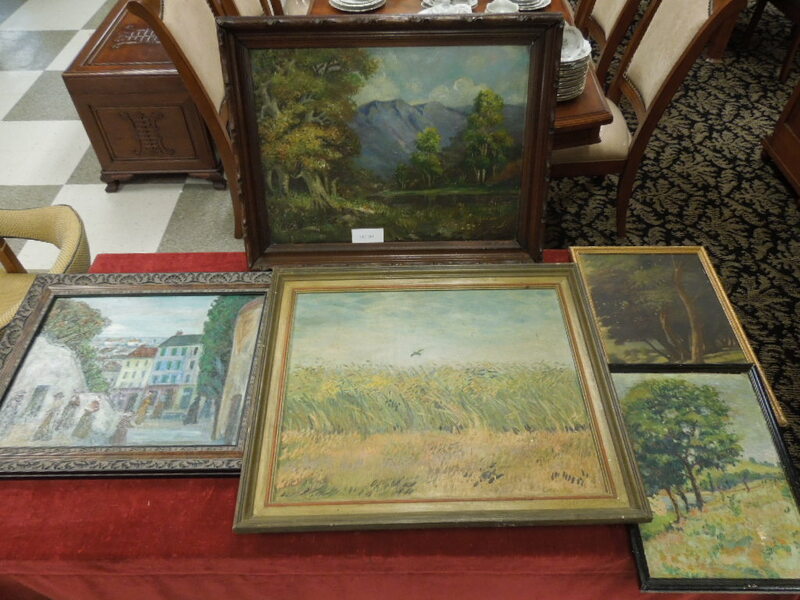 Lot 382: Group Of Asstd. Dinnerware Incl. Fitz & Floyd. 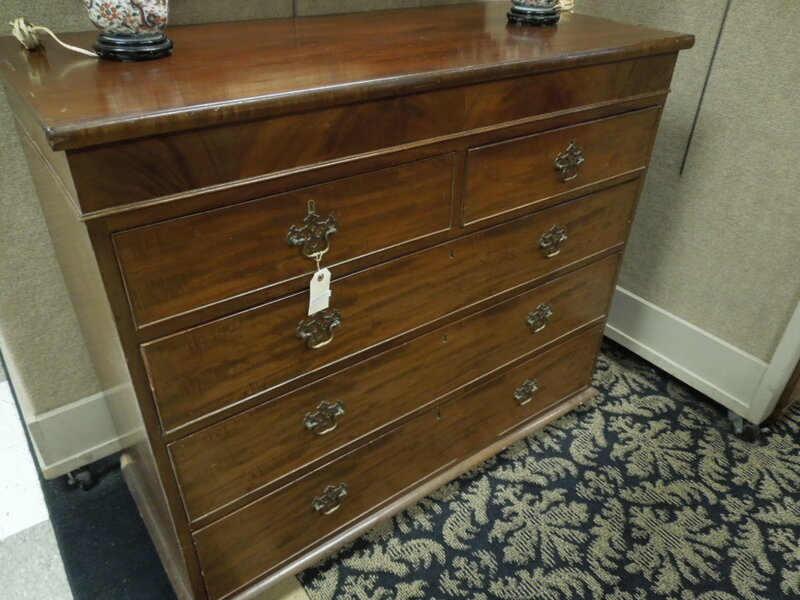 Lot 383: Custom Mahogany 3-Drawer Bedroom Chest. 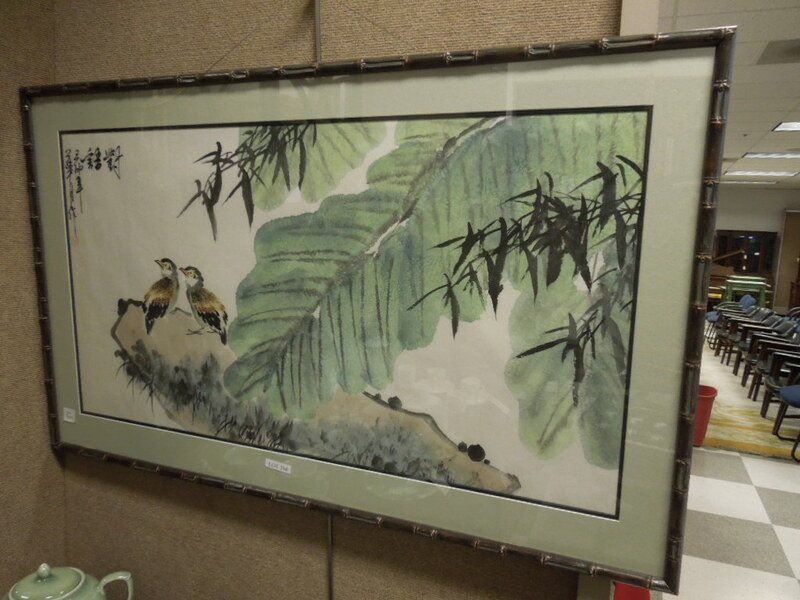 Lot 384: Framed Oriental Watercolor, Landscape With 2 Birds And Trees. Inscribed, With Seal. (18" X 34"). 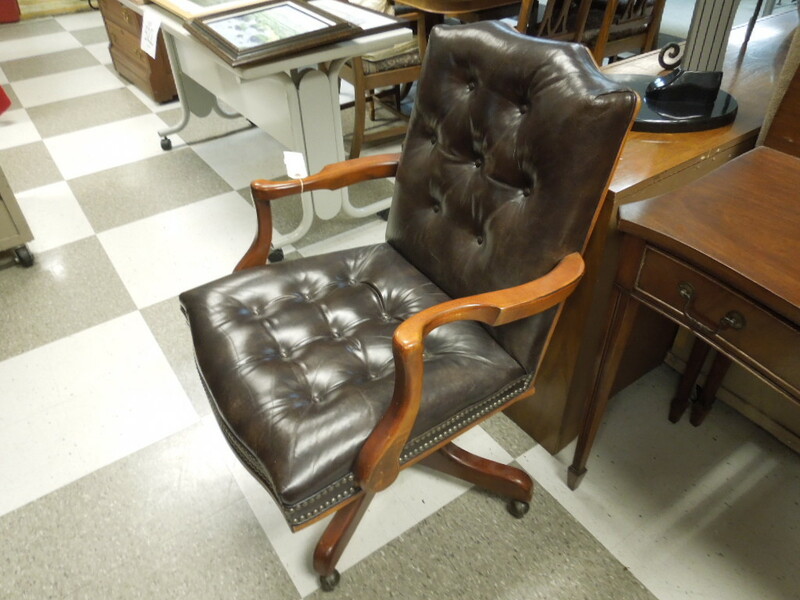 Lot 385: Century Chair Co. Executive Swivel Chair. 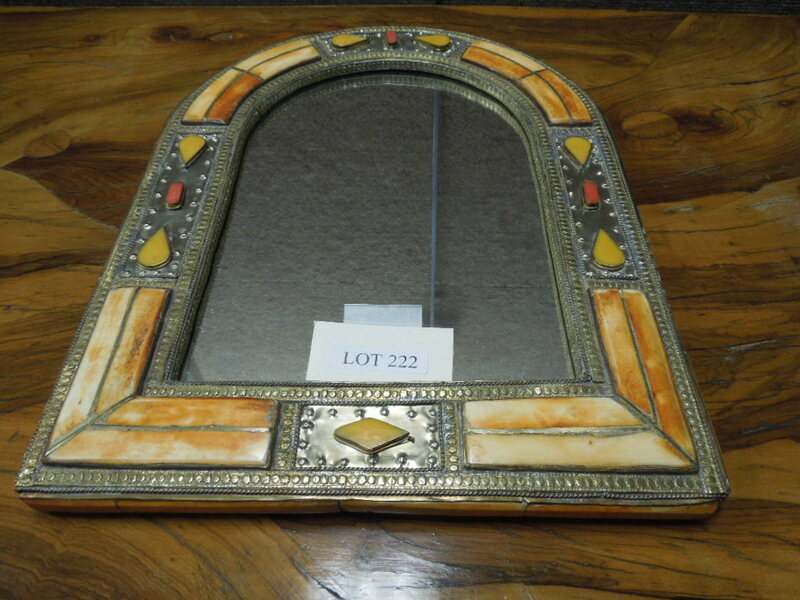 Lot 386: Gilt Painted Mirror. 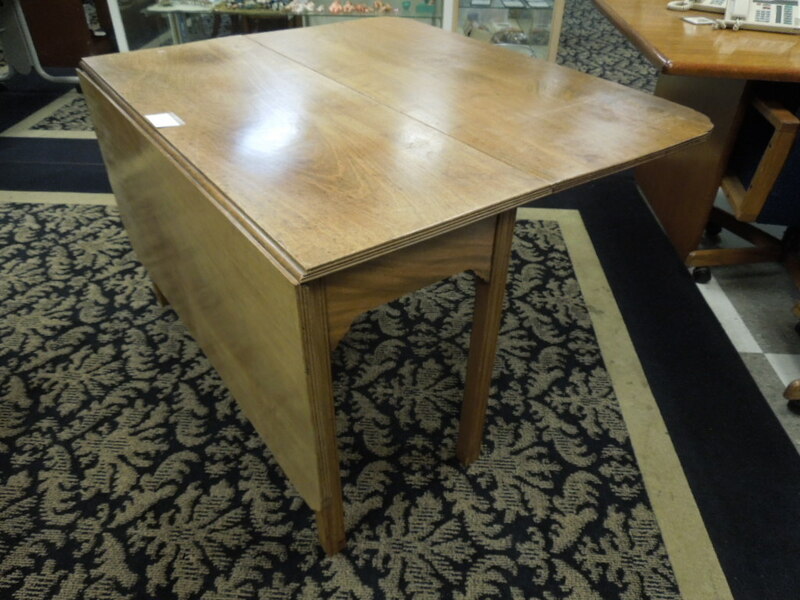 Lot 387: Mahogany Fold Over Single Drawer Table. 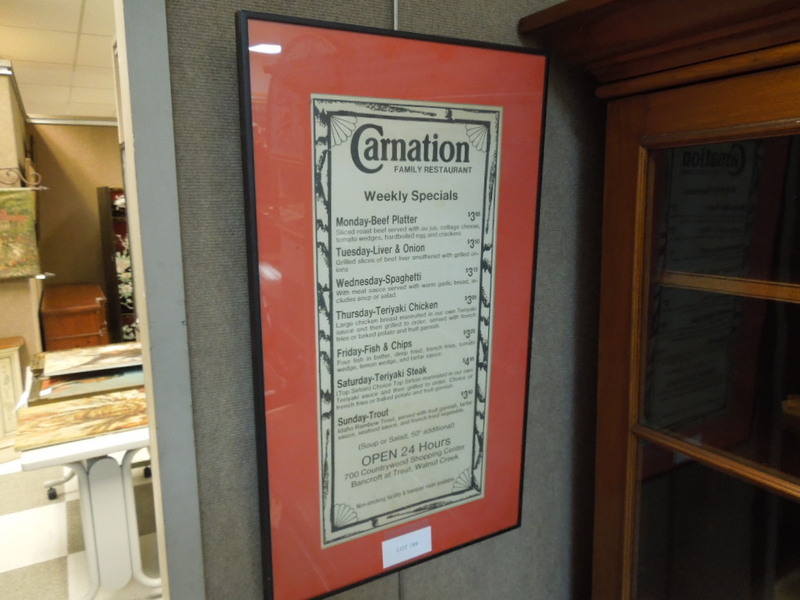 Lot 389: Framed Carnation Restaurant Menu. 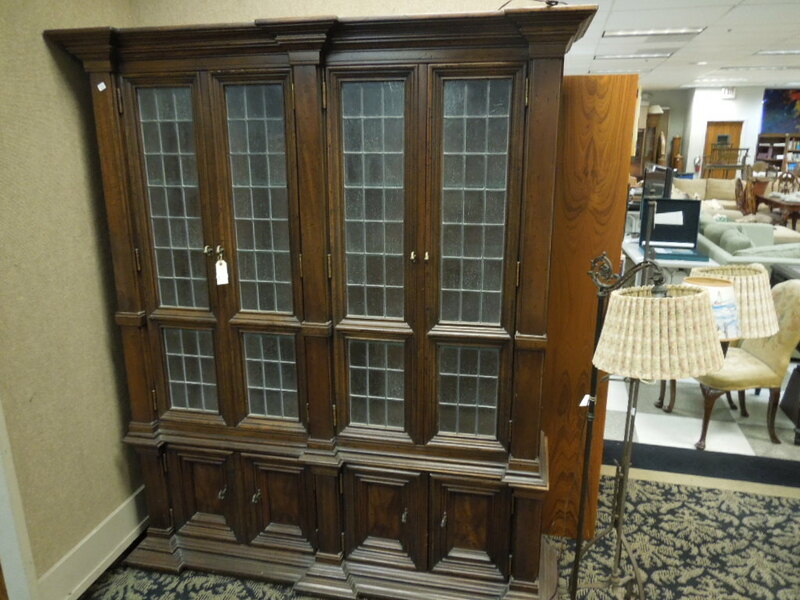 Lot 390: Circa 1900 Mahogany Bookcase Cabinet With 4 Doors, 3 Drawer And A Drop Front Writing Surface. 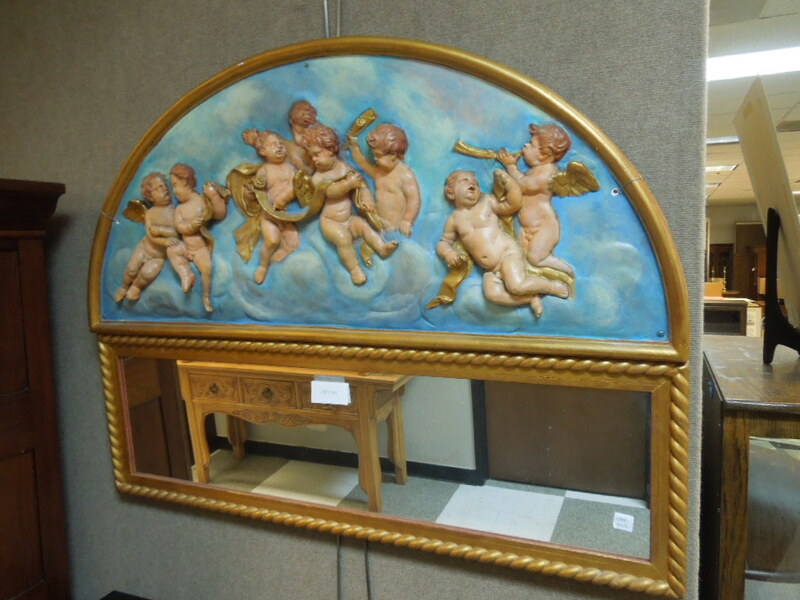 Lot 391: Gilt Framed Mirror With Domed Cherub Decoration. 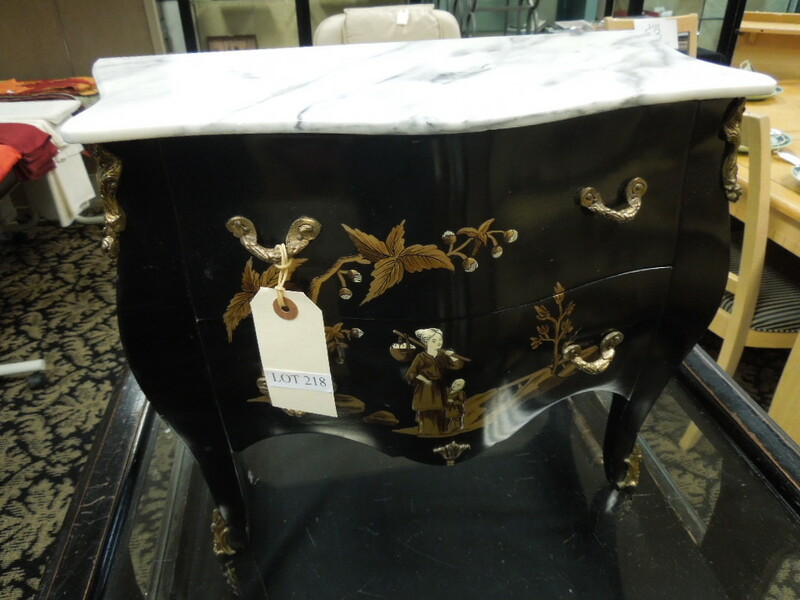 Lot 392: Kohler & Chase Ebonized Upright Piano And Bench. Serial No. 146746. 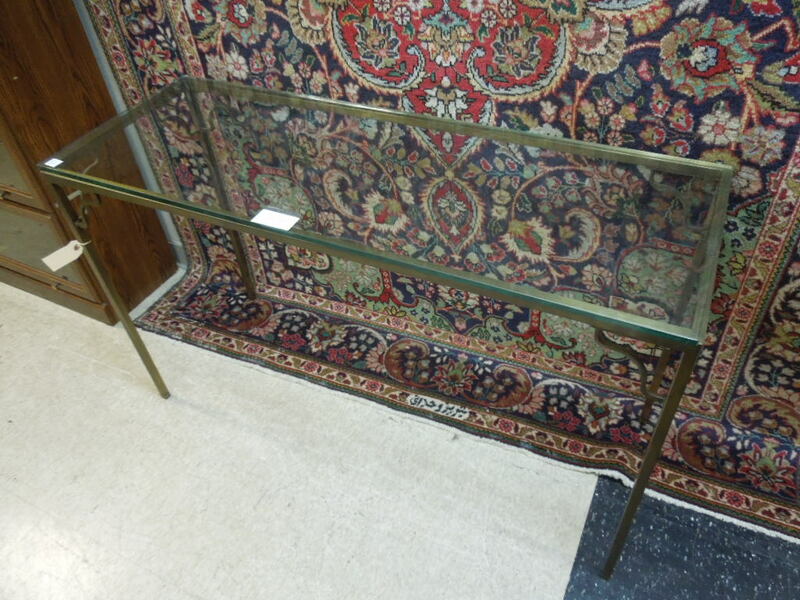 Lot 393: Metal And Glass Top Sofa Table. 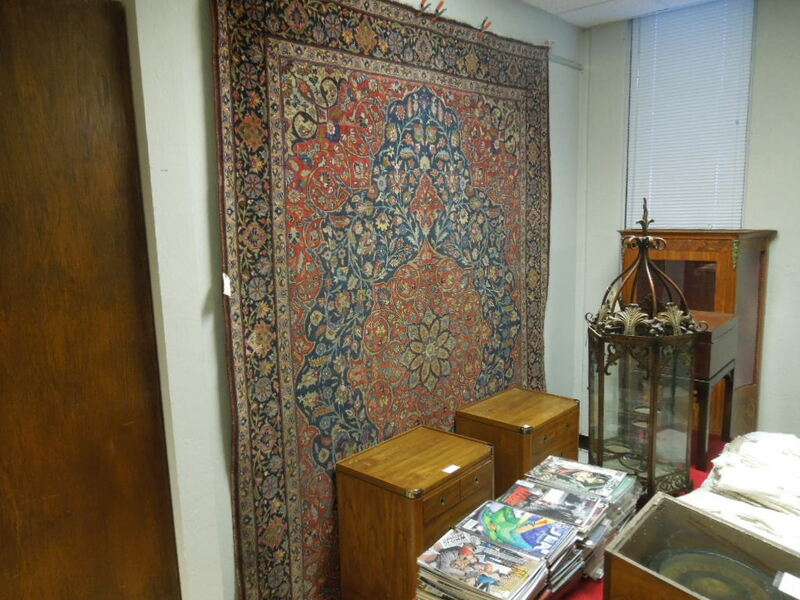 Lot 394: Hand Knotted Oriental Rug. Floral Center Medallion And Design. (Approx. 9' X 6'). 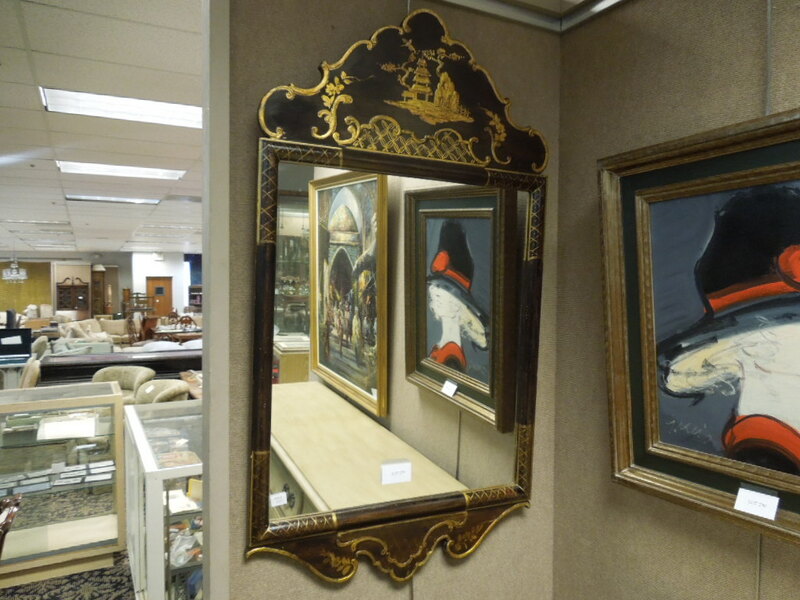 Lot 395: Country Style Hand Painted Framed Mirror. 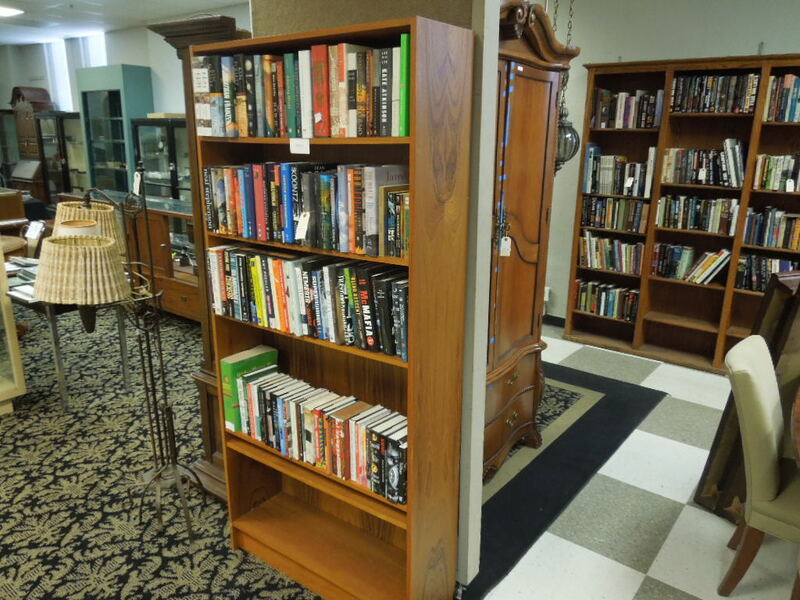 Lot 396: Lawyer's Style Stacking Bookcase. 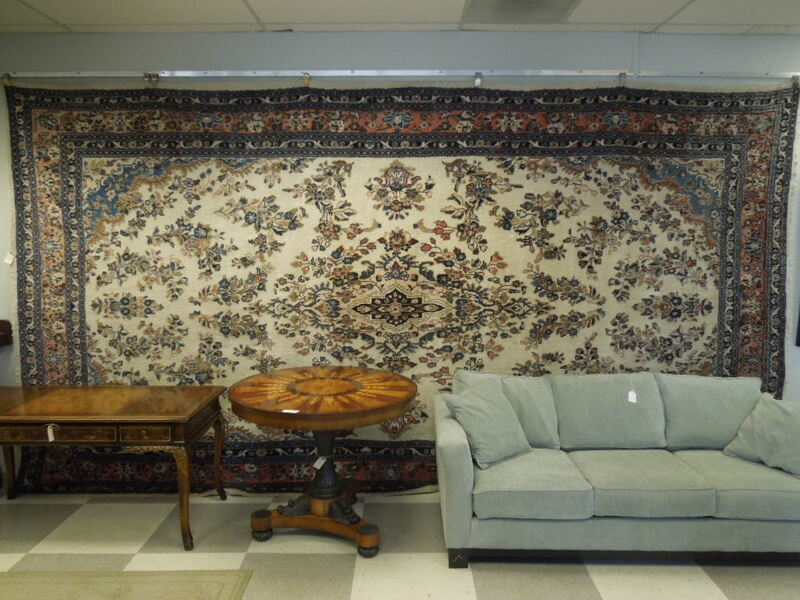 Lot 397: Caucasian Hand Knotted Wool Rug. Wool Pile On Wool Foundation. Crab, Fish And Foliate Motif. (Approx. 8'8" X 5'8"). 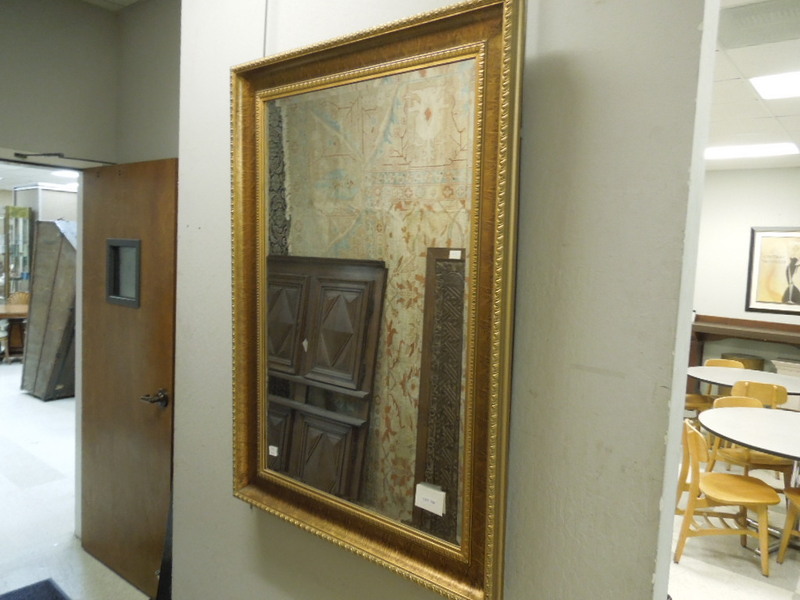 Lot 398: Contemporary Gilt Framed Beveled Mirror. 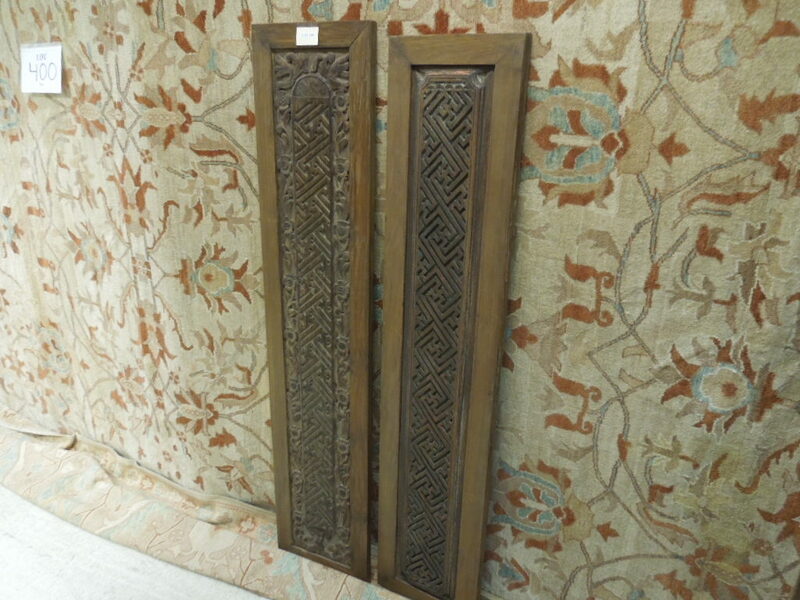 Lot 399: (2) Carved Wood Open Work Panels. 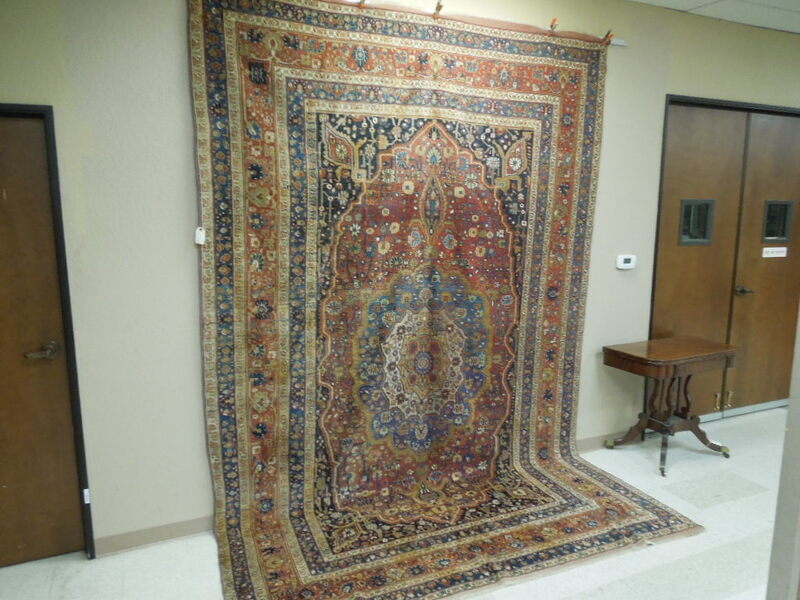 Lot 400: Hand Knotted Oriental Rug. (Approx. 18' X 12'). 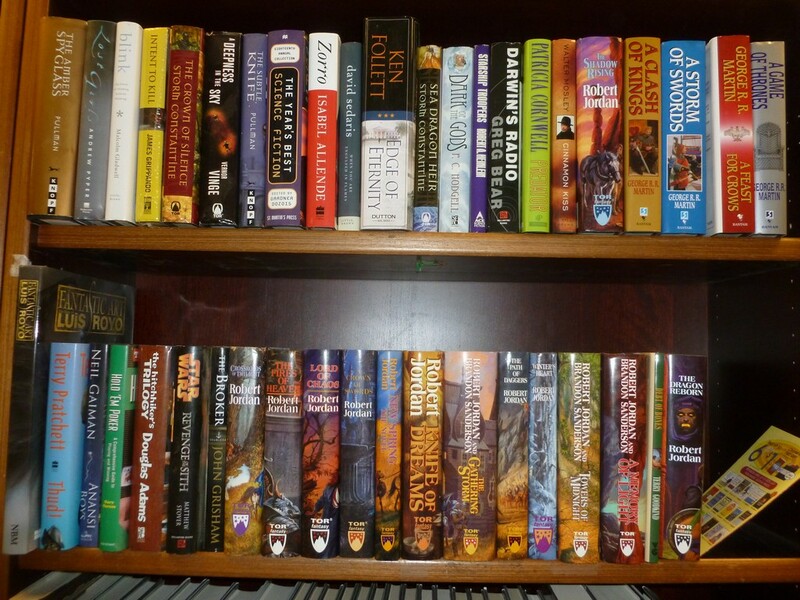 Lot 401: Shelf Of Asstd. 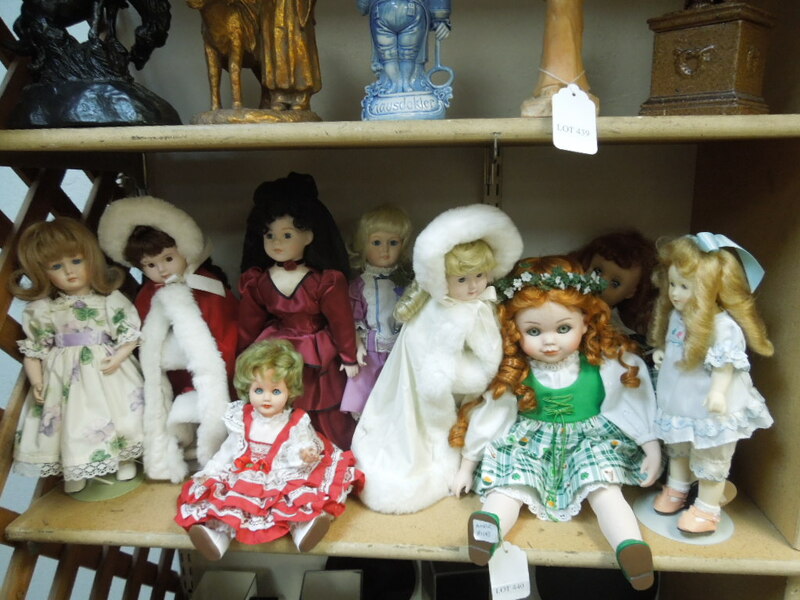 Dolls. 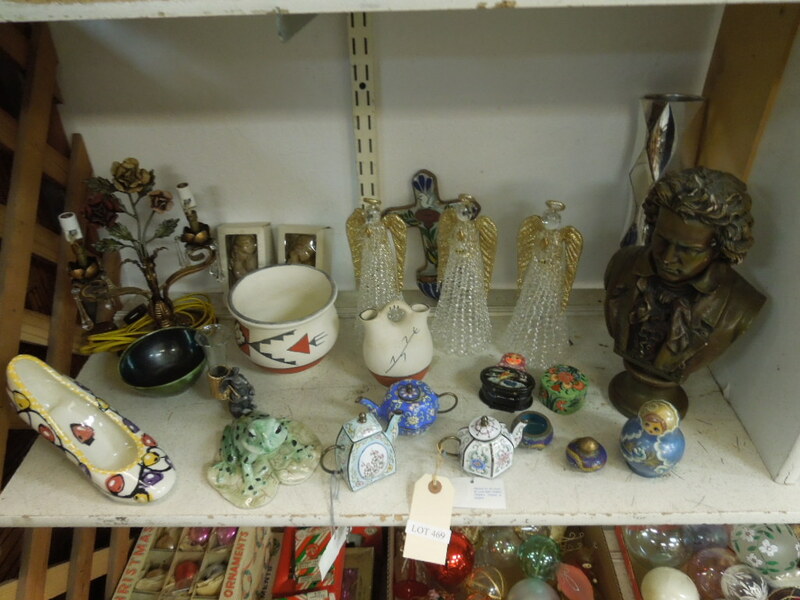 Lot 402: Shelf Of Decorative Items Incl. 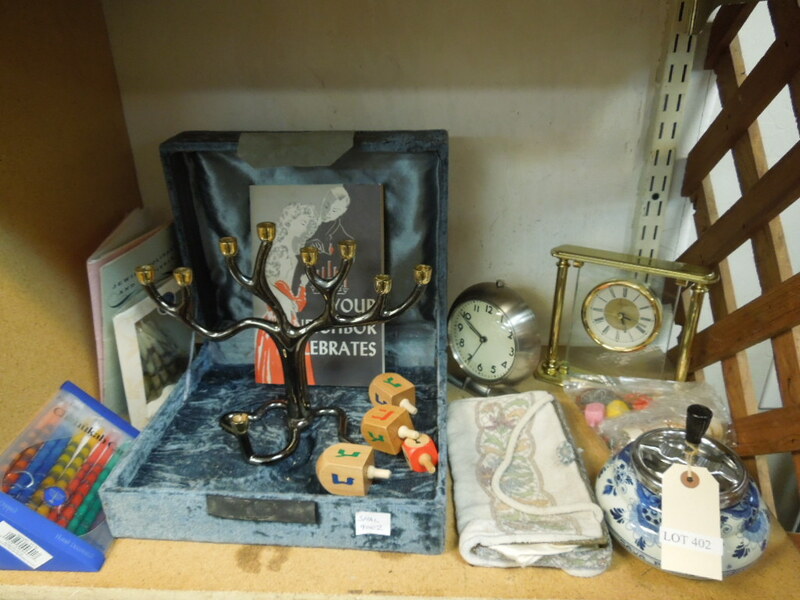 Desk Clocks, Art Metal Menorah. 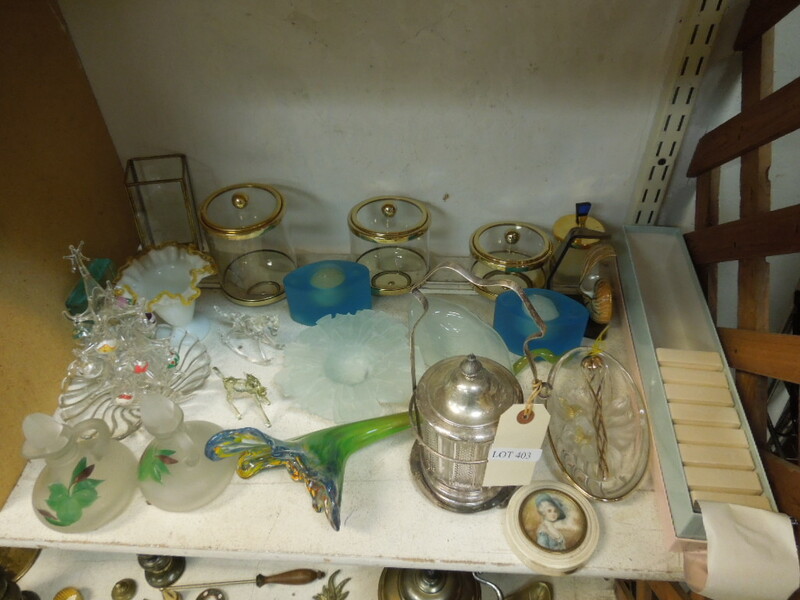 Lot 403: Shelf Of Art Glass And Decorative Items. 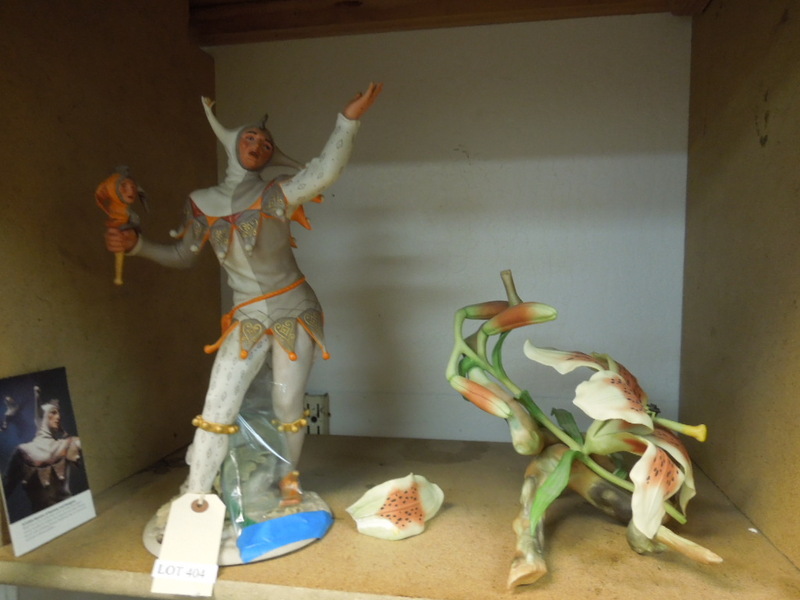 Lot 404: Orchid Ceramic Sculpture And A Jester Figure. 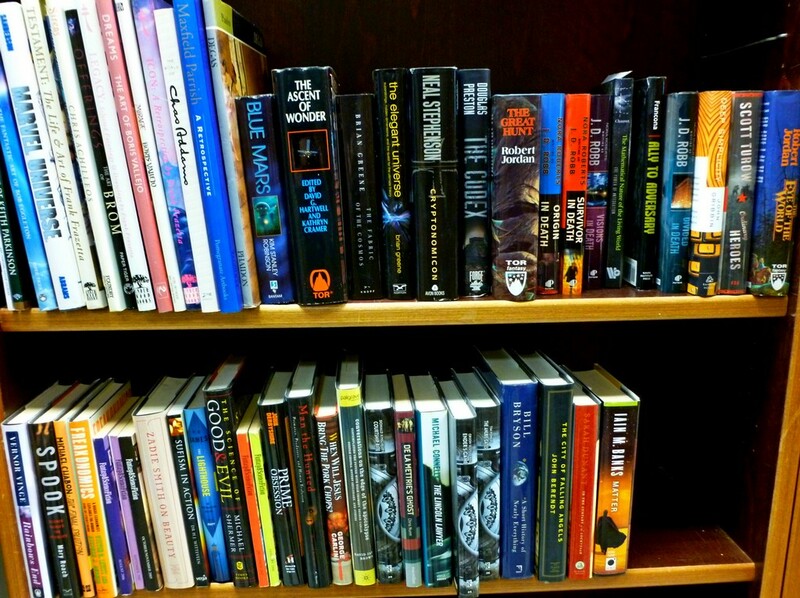 Lot 405: Shelf Of Asstd. 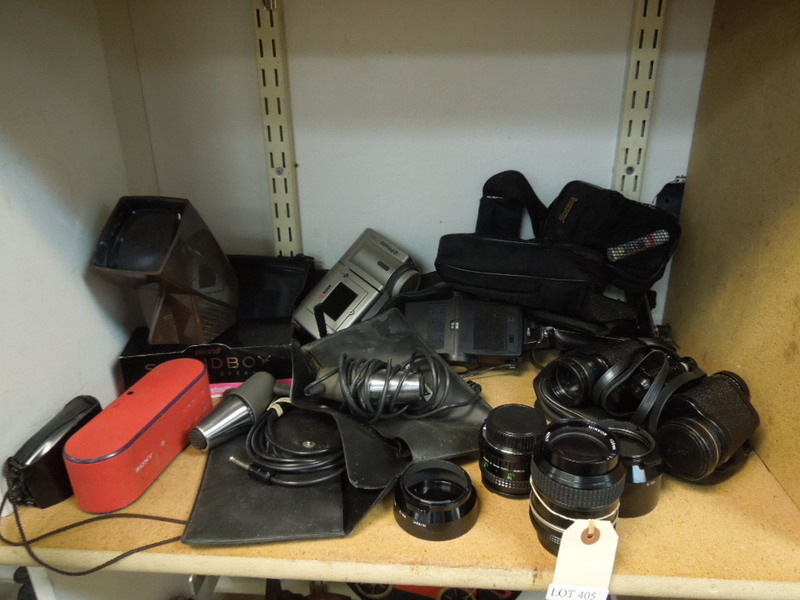 Camera Lenses, Binoculars And Accessories. 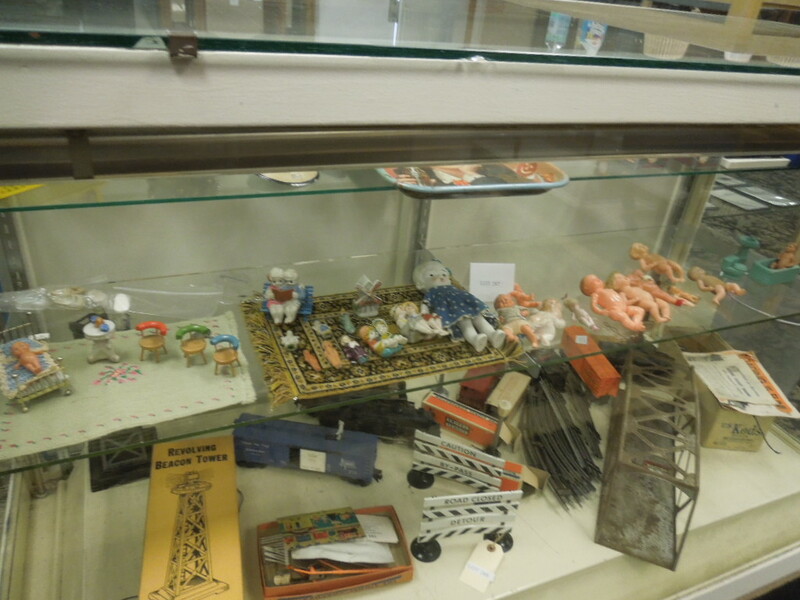 Lot 406: Shelf Of Knick Knacks And Decorative Items Incl. 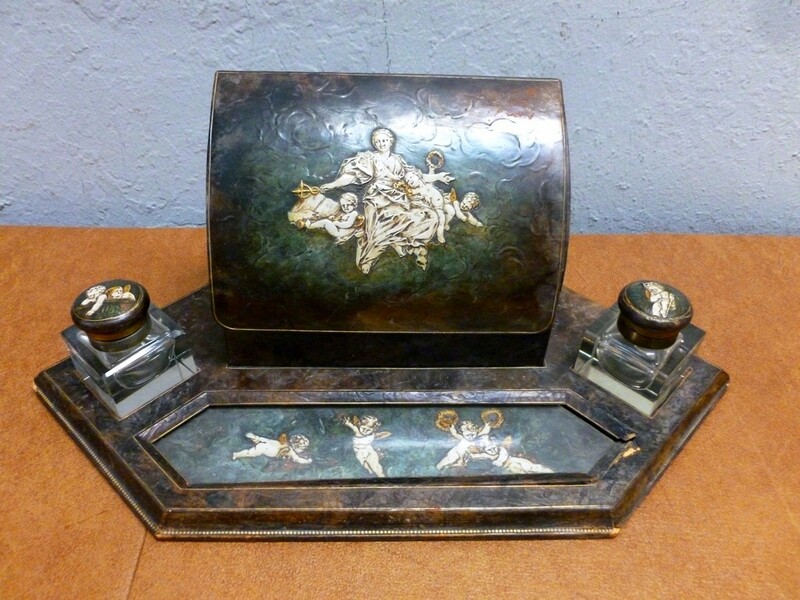 Stone, Metal And Ceramic Sculptures, Italian Music Box. 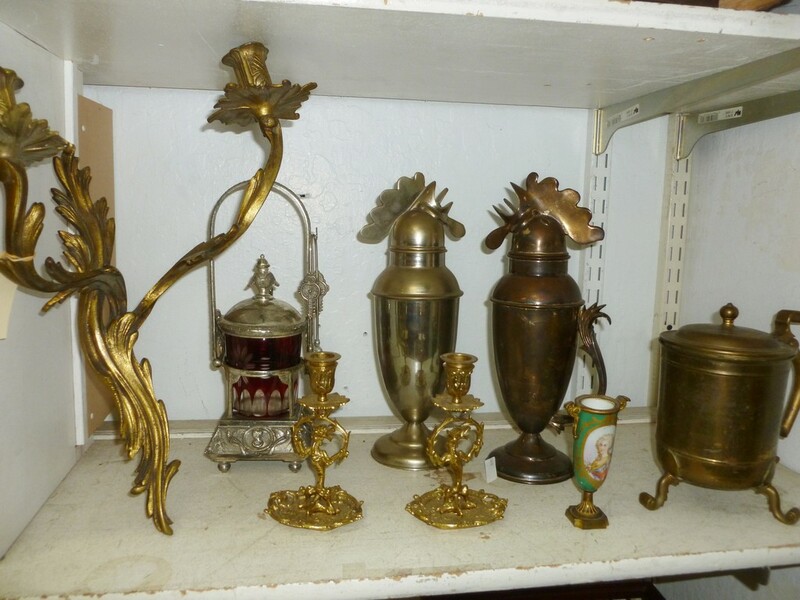 Lot 407: Large Shelf Of Brass Decorative Items. 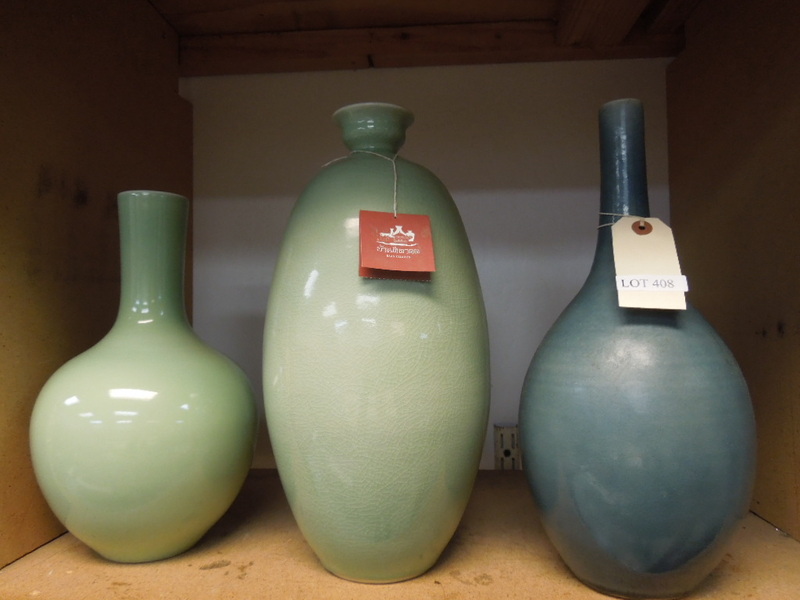 Lot 408: (3) Glazed Decorative Vases. 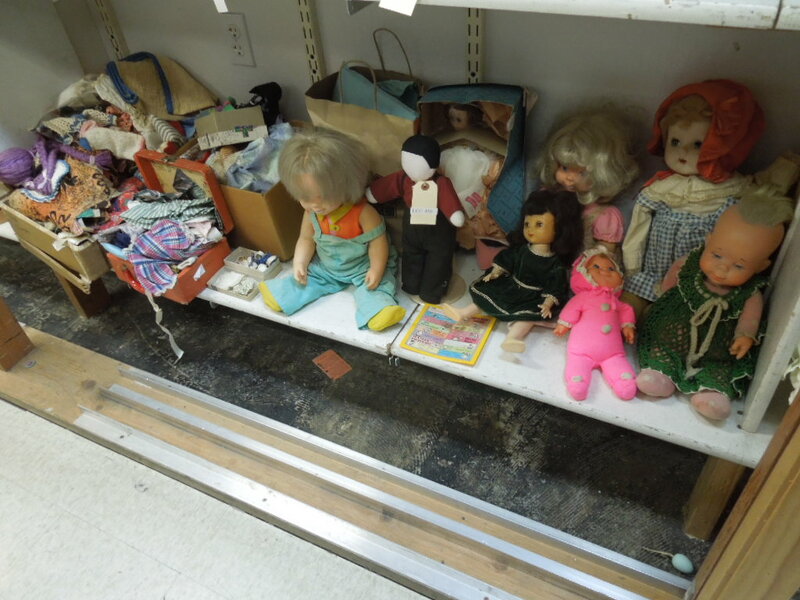 Lot 409: Shelf Of Knick Knacks. 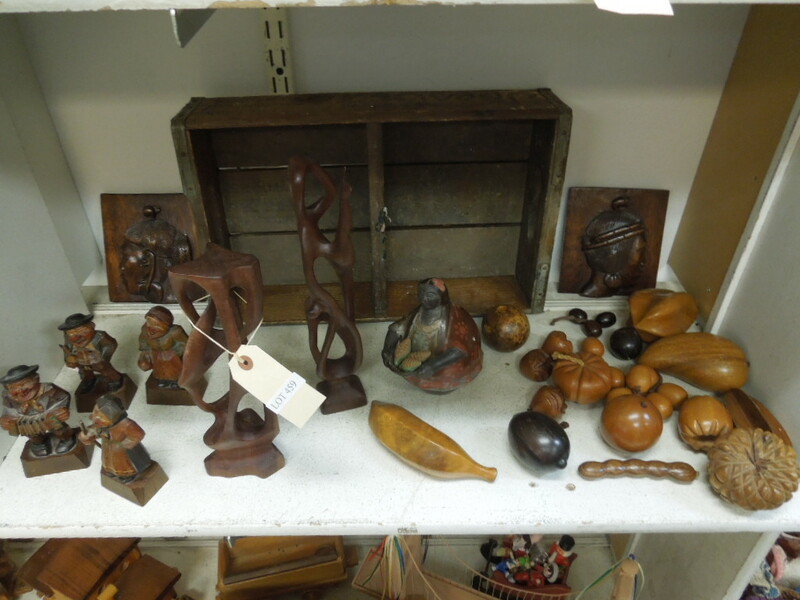 Lot 410: Shelf Of Carved Wood, Metal And Ceramic Decorative Items. 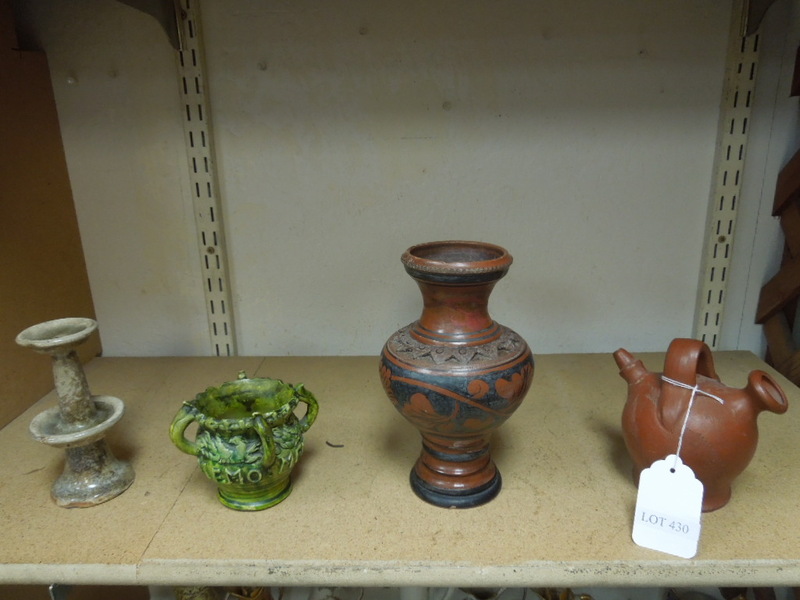 Lot 411: Shelf Of Pottery And Vessels Incl. A Peruvian Bowl. 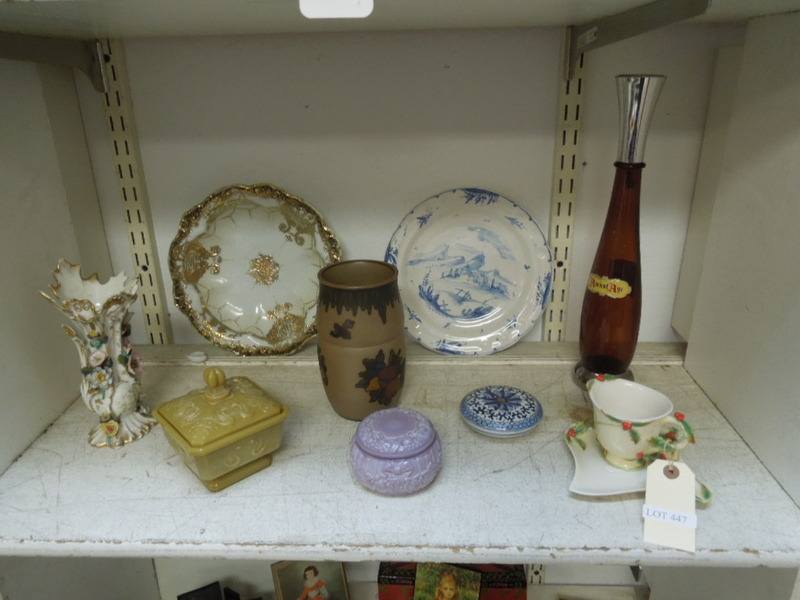 Lot 412: Shelf Of Porcelain Items Incl. 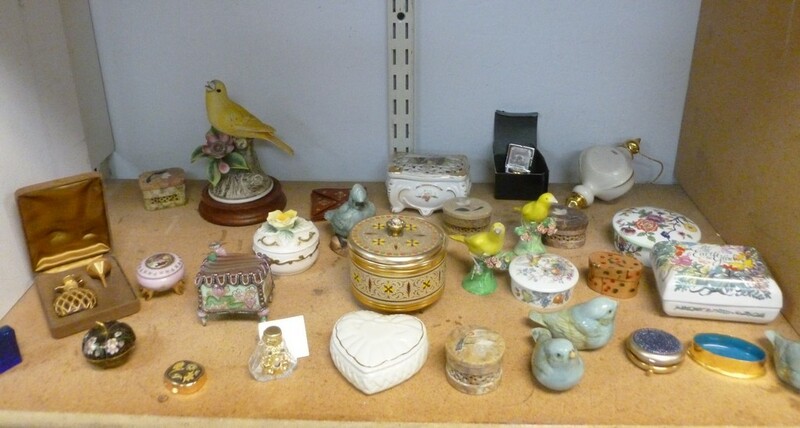 Figurines And Lidded Boxes. 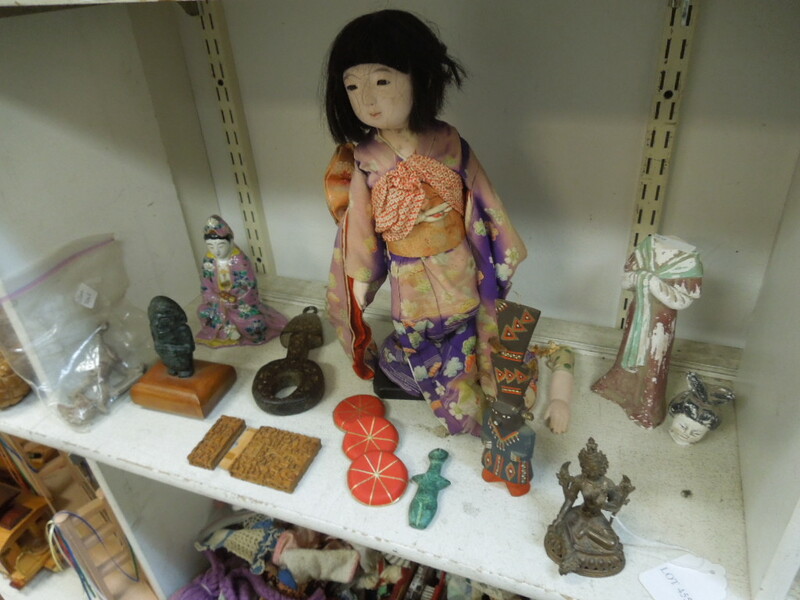 Lot 413: Shelf Of Decorative Asian Items Incl. 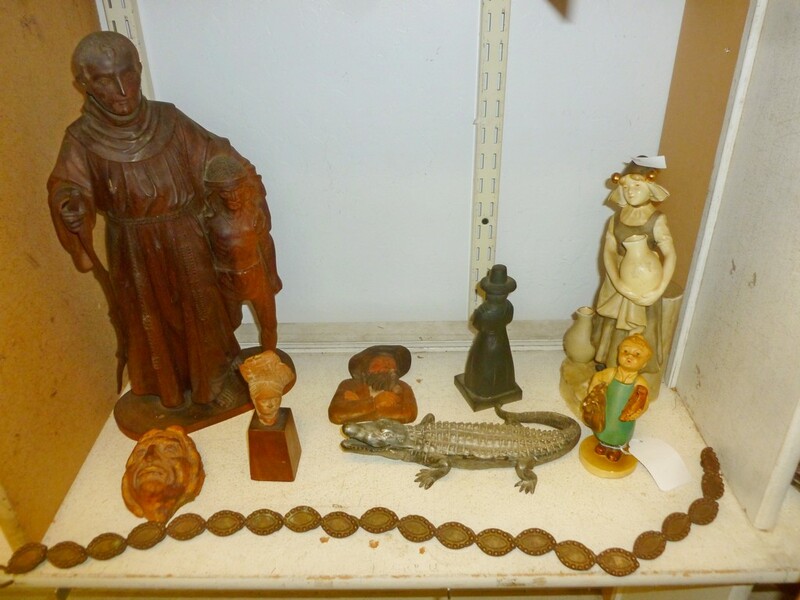 Carved Wooden Mask, Burl Wood Frog, Nesting Dolls. 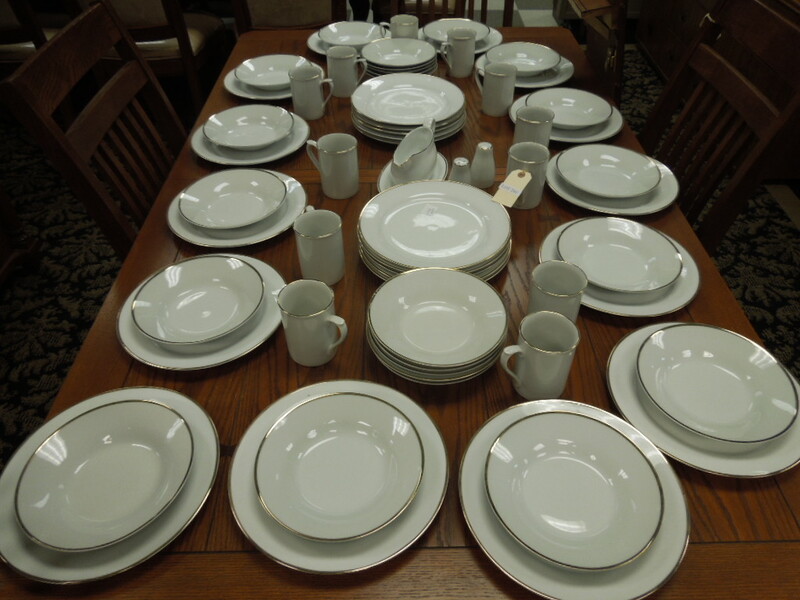 Lot 414: Contemporary Spanish Porcelain Dinner Service. 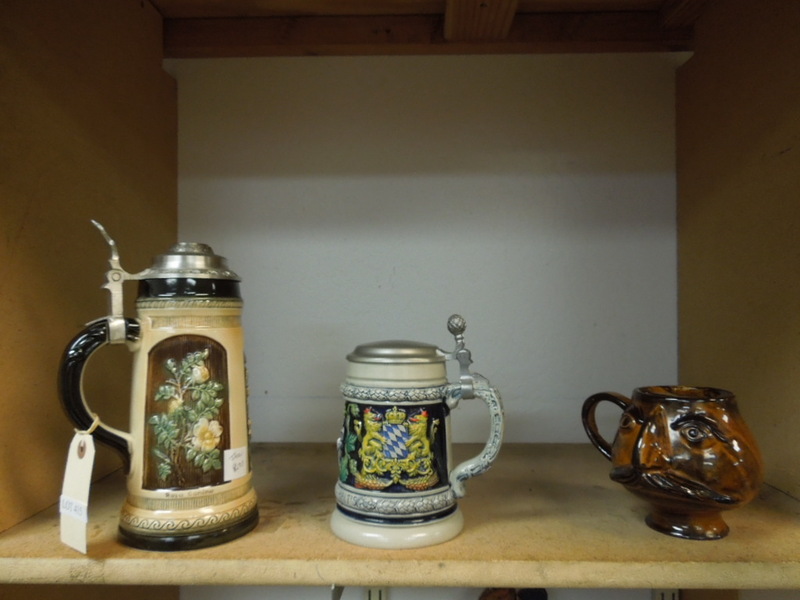 Lot 415: (2) Ceramic Beer Steins Incl. German. 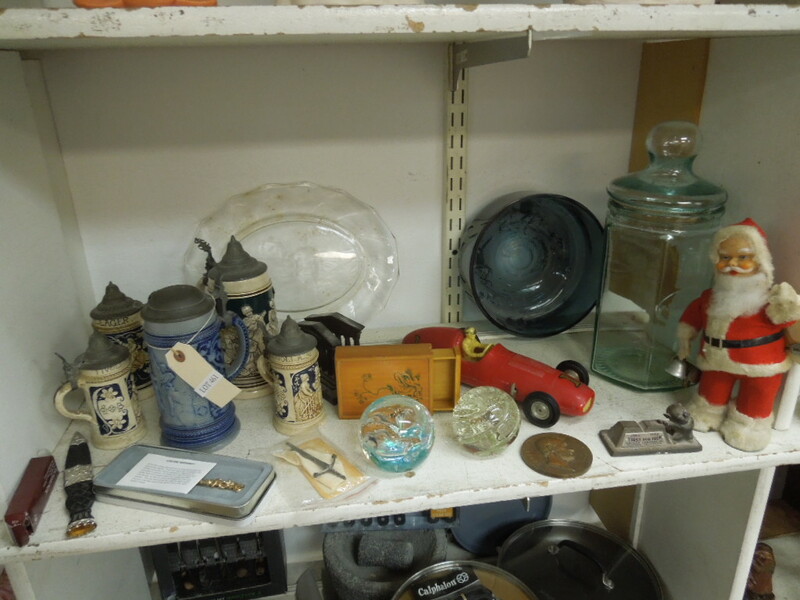 Lot 416: Shelf Of Asstd. Figurines. 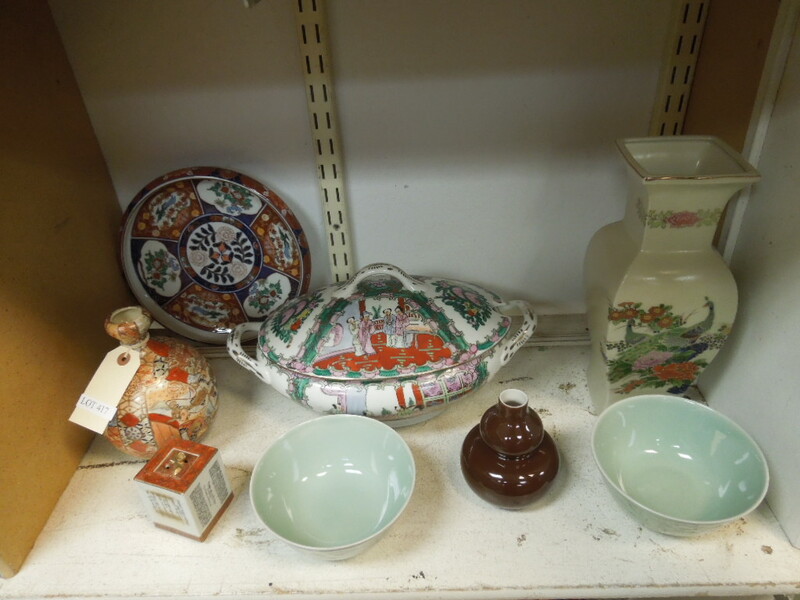 Lot 417: Shelf Of Asian Pottery Items Incl. 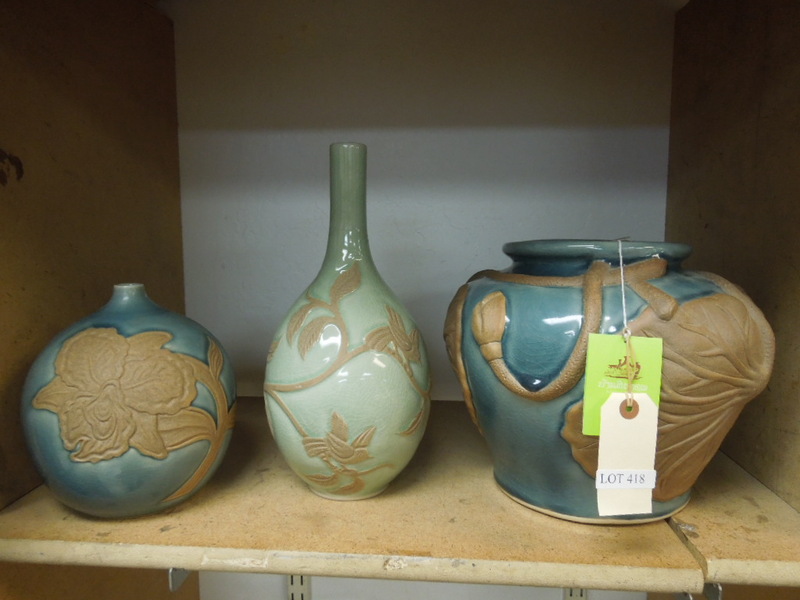 Decorative Painted Tureen And Vases. Lot 418: (3) Thai Glazed Pottery Vessels. 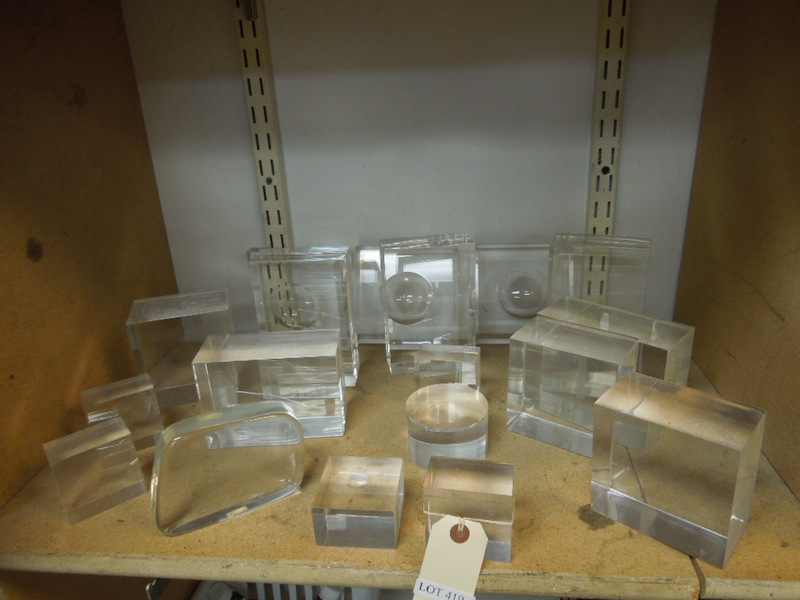 Lot 419: Shelf Of Lucite Display Stands. 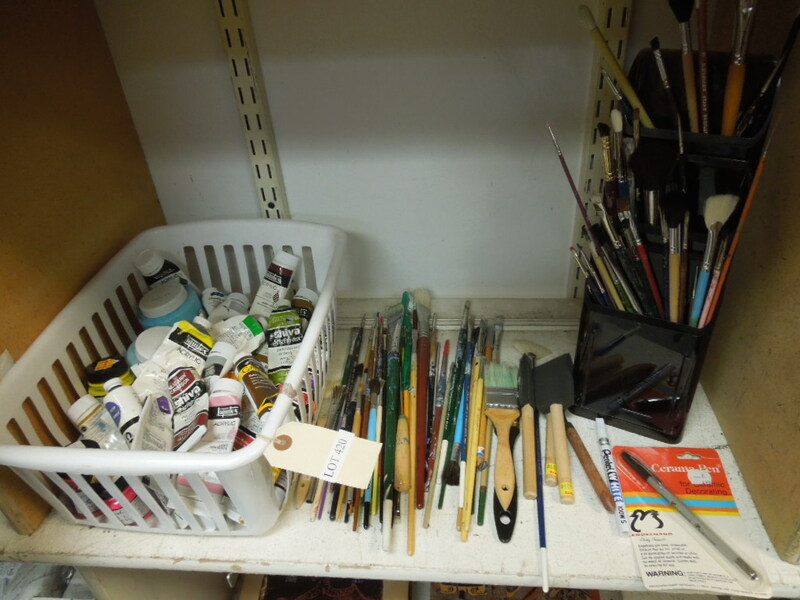 Lot 420: Shelf Of Art Supplies. 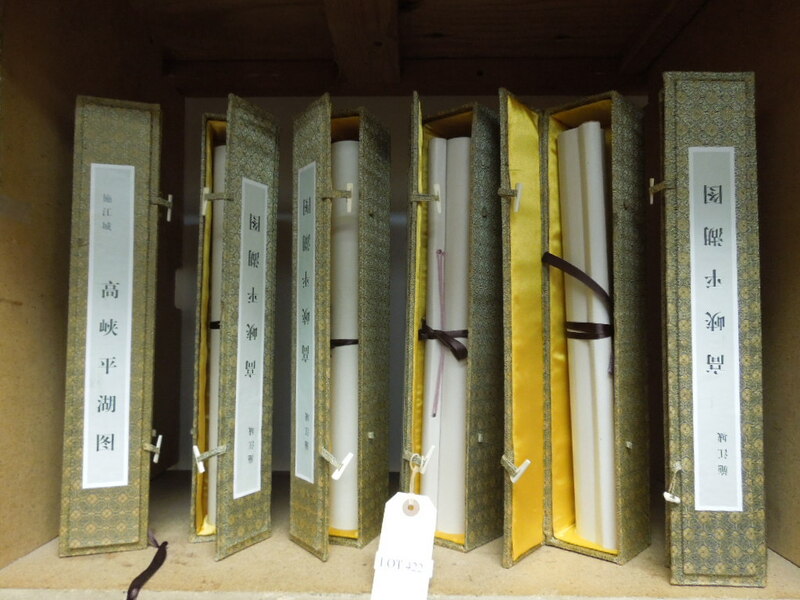 Lot 422: Shelf Of Oriental Scrolls In Boxes. 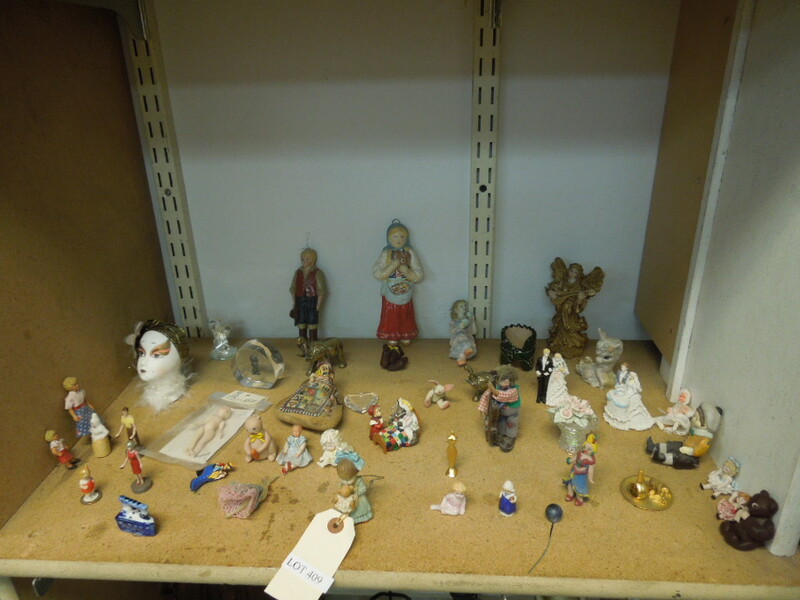 Lot 423: Shelf Of Figurines Incl. Limited Edition Humphrey Bogart. 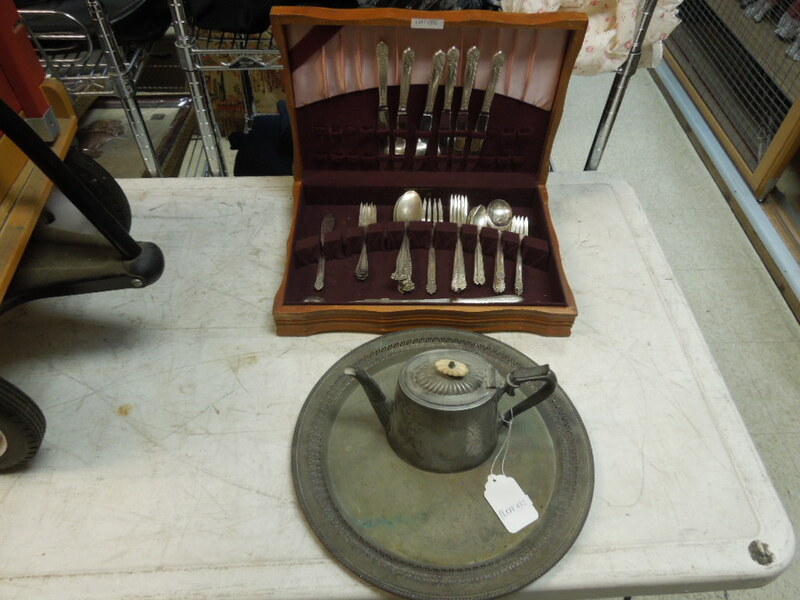 Lot 424: Selanger Pewter Tea Set With Tray And Silver Plated Pitcher Form Vase. 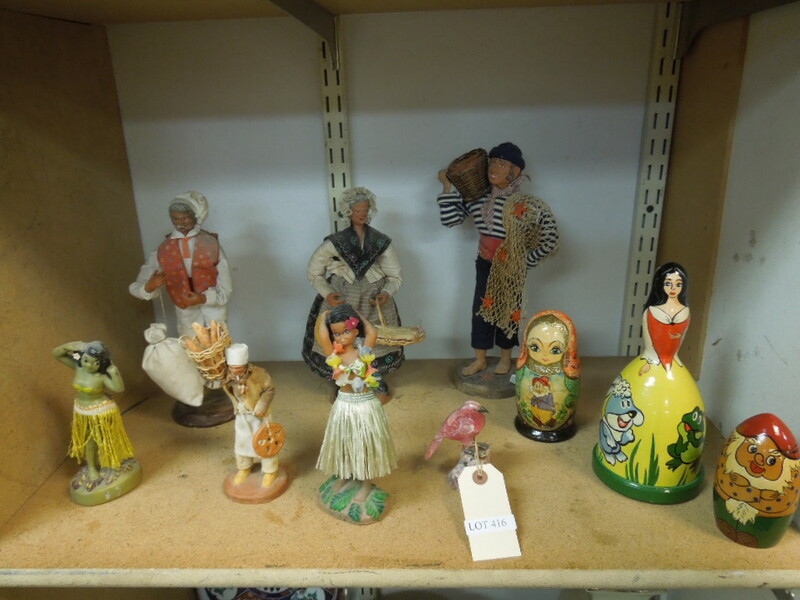 Lot 425: Shelf Of Figurines. 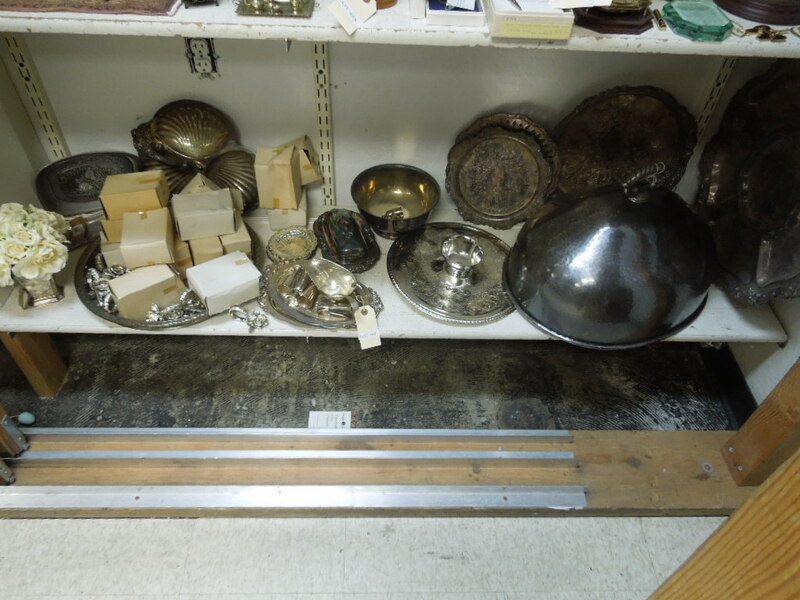 Lot 426: Shelf Of Silver Plated Items. 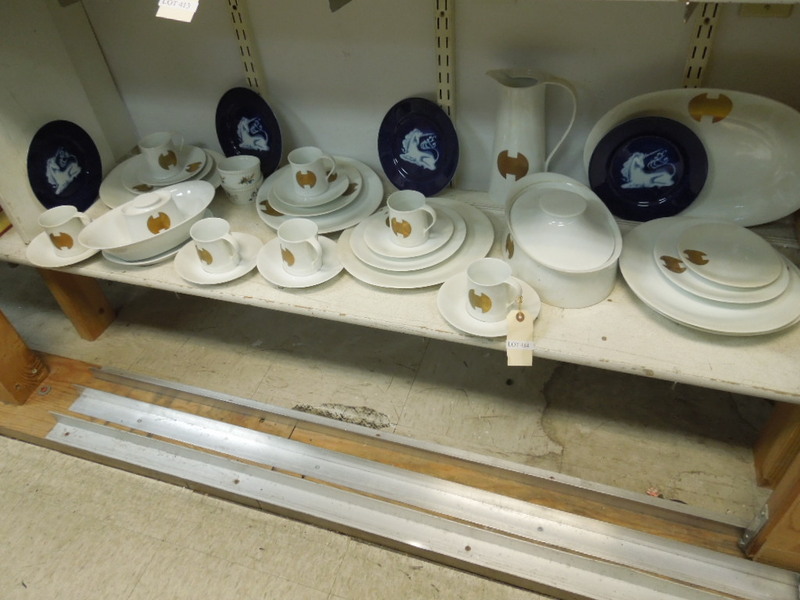 Lot 427: Shelf Of Asstd. Art Supplies. 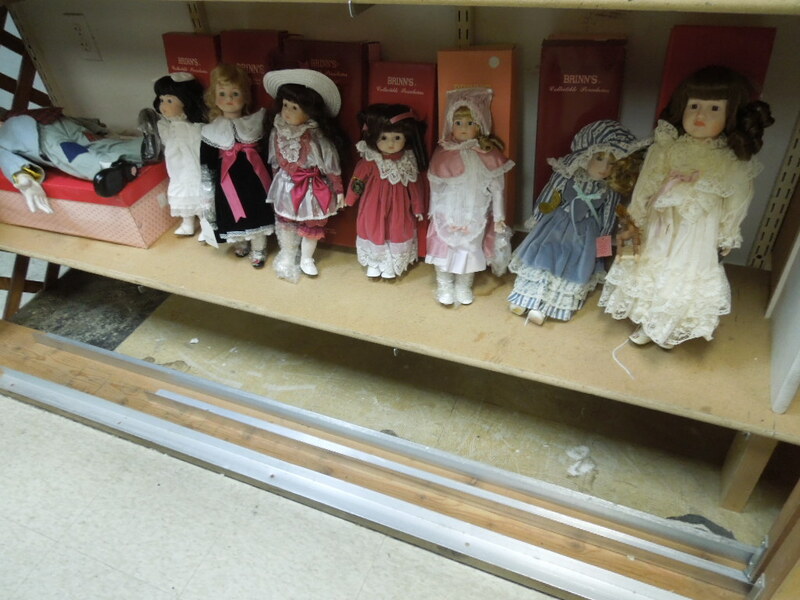 Lot 428: Shelf Of Contemporary Porcelain Dolls Incl. Ashton Drake, Some With Boxes. 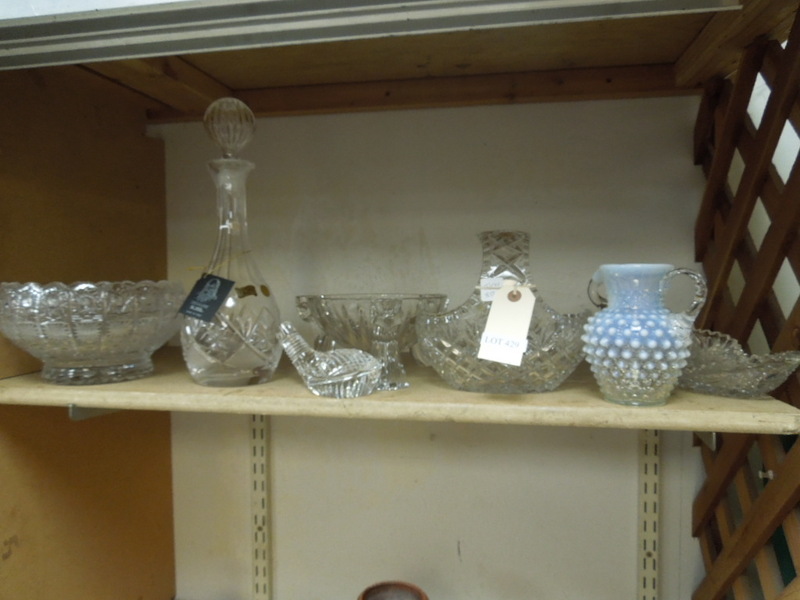 Lot 429: Shelf Of Cut And Pressed Glass Tableware Items. 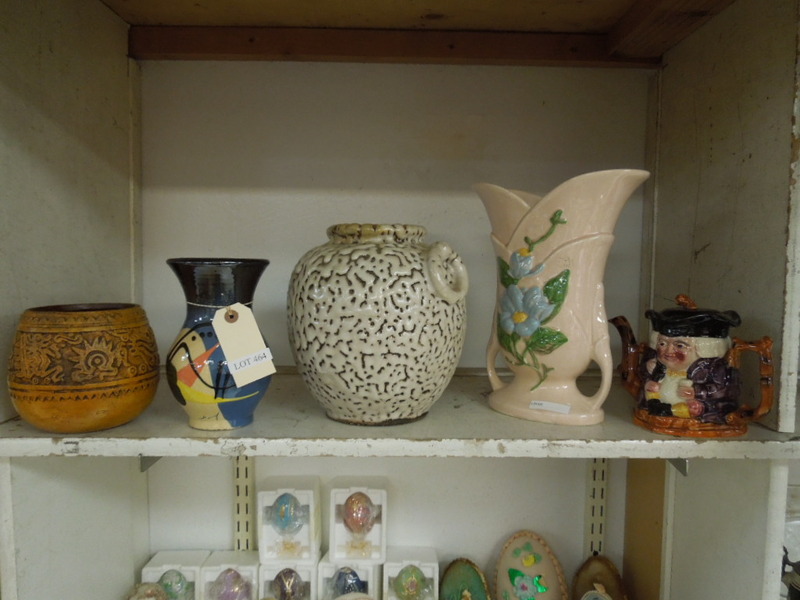 Lot 430: Shelf Of Hand Made Pottery Vessels. 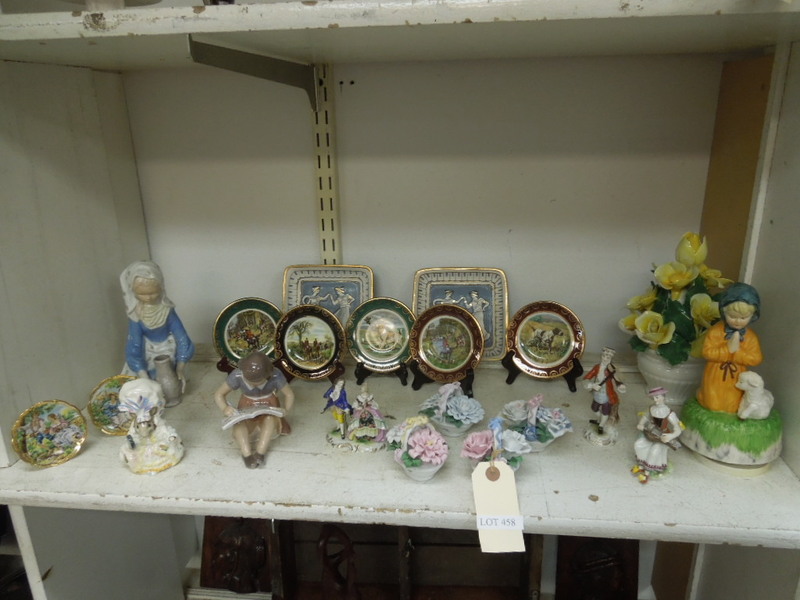 Lot 431: Shelf Of Fine Porcelain. 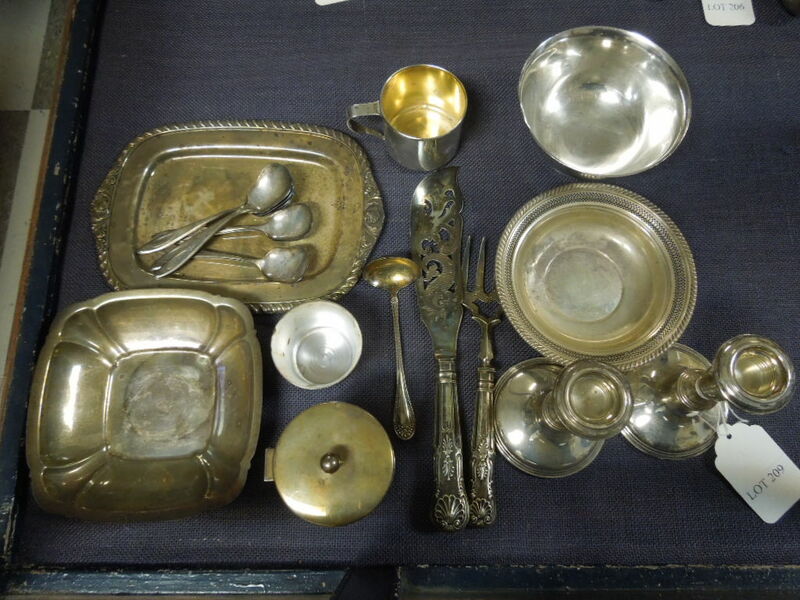 Lot 432: Silver Plated Flatware In Casket And 2 Tableware Items. 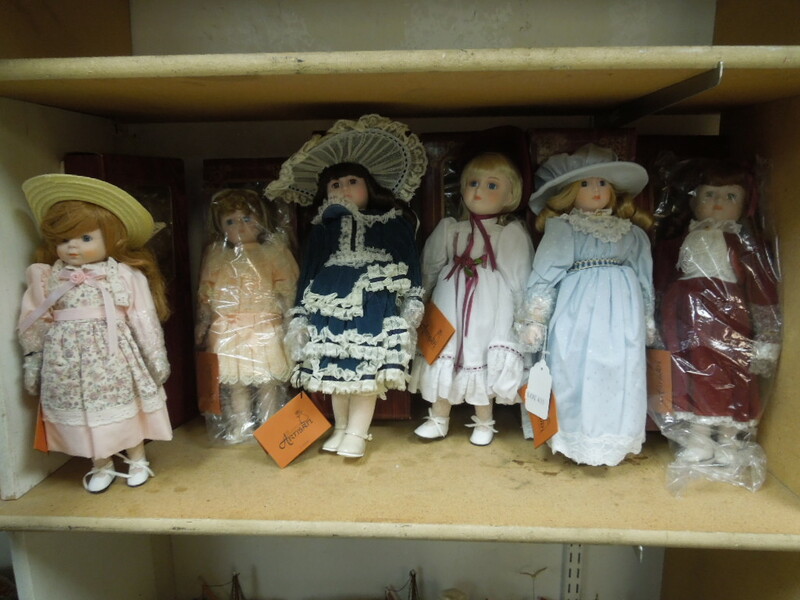 Lot 433: (6) Artisan Collection Porcelain Dolls With Tags And Boxes. 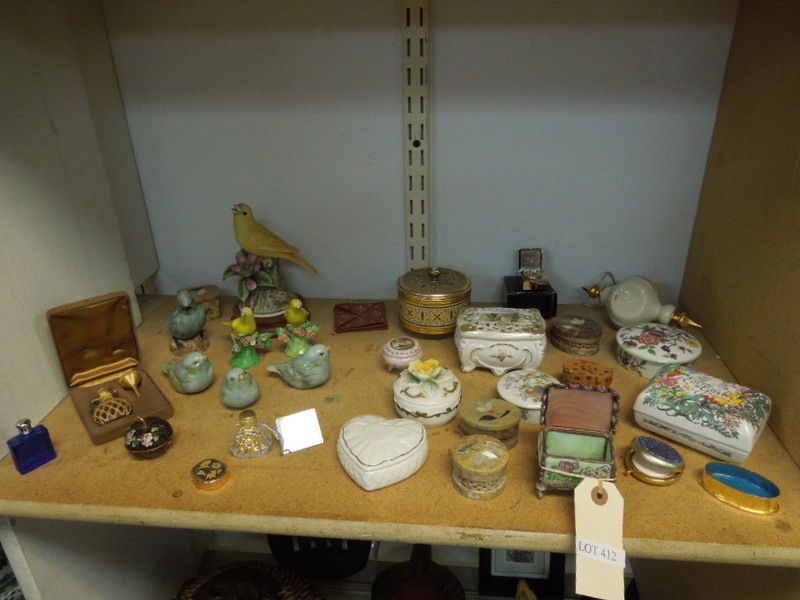 Lot 434: Shelf Of Decorative Boxes And Knick Knacks. 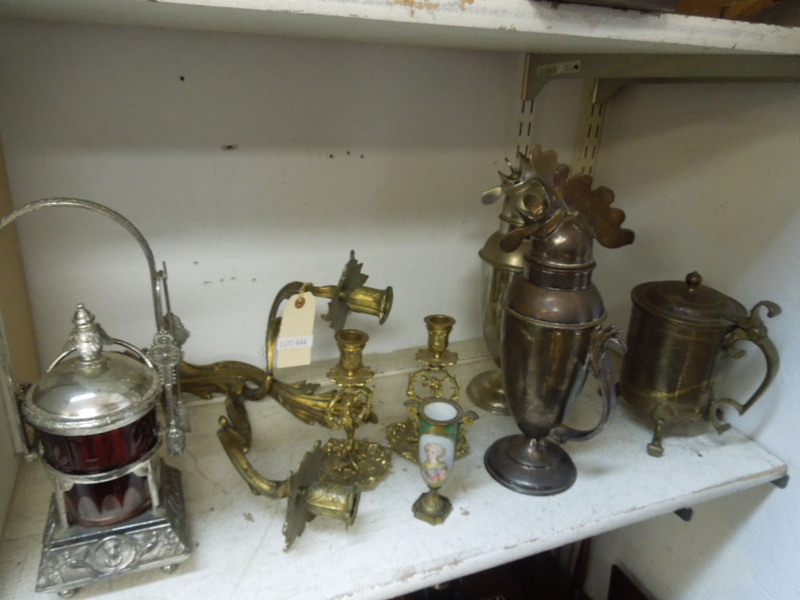 Lot 435: Shelf Of Silver Plated Items. 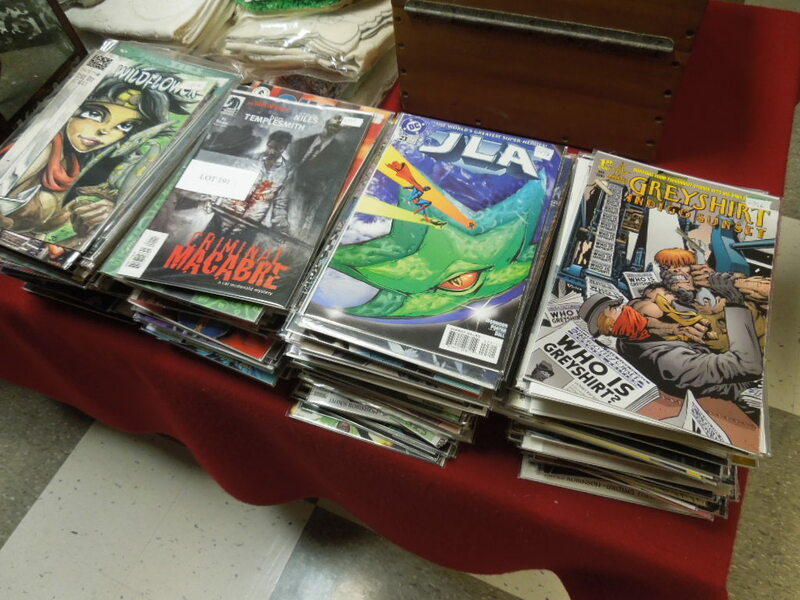 Lot 436: Shelf Of Comic And Movie Trading Cards. (Packaged). 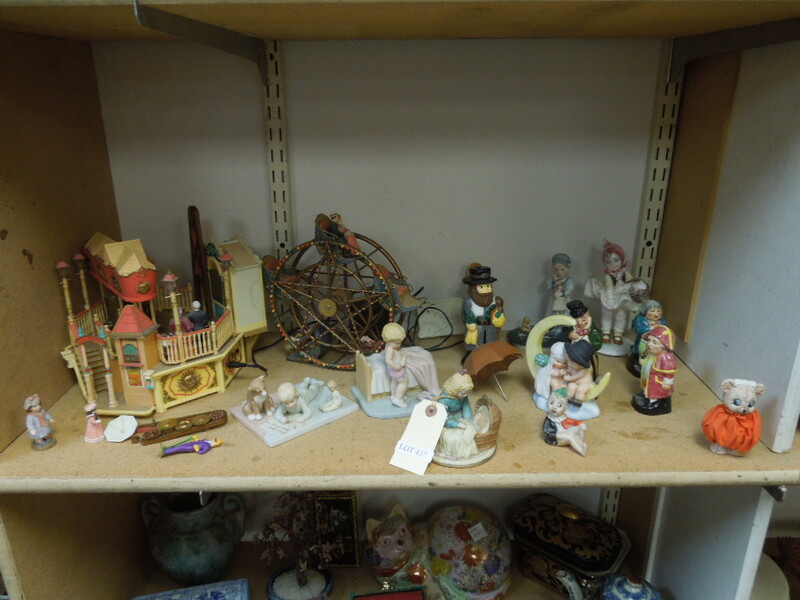 Lot 437: Shelf Of Figurines And Knick Knacks. 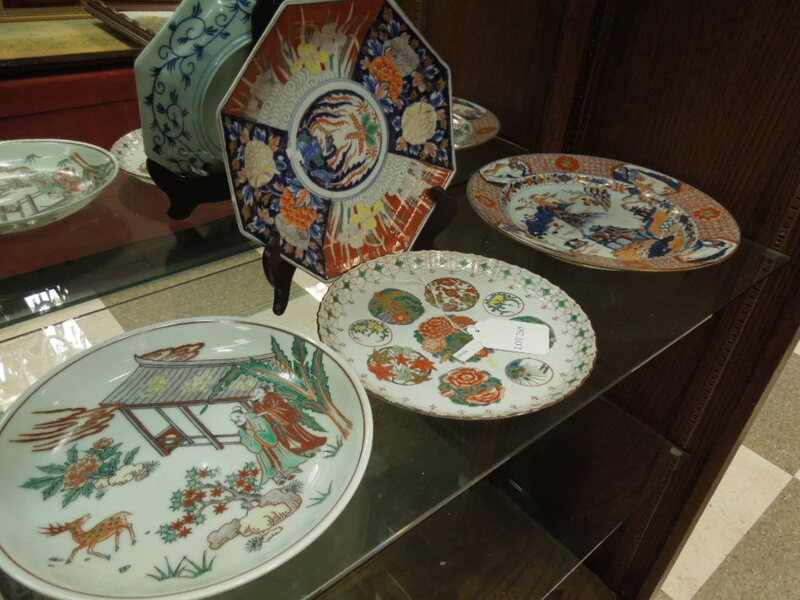 Lot 438: Shelf Of Oriental Decorative Items. 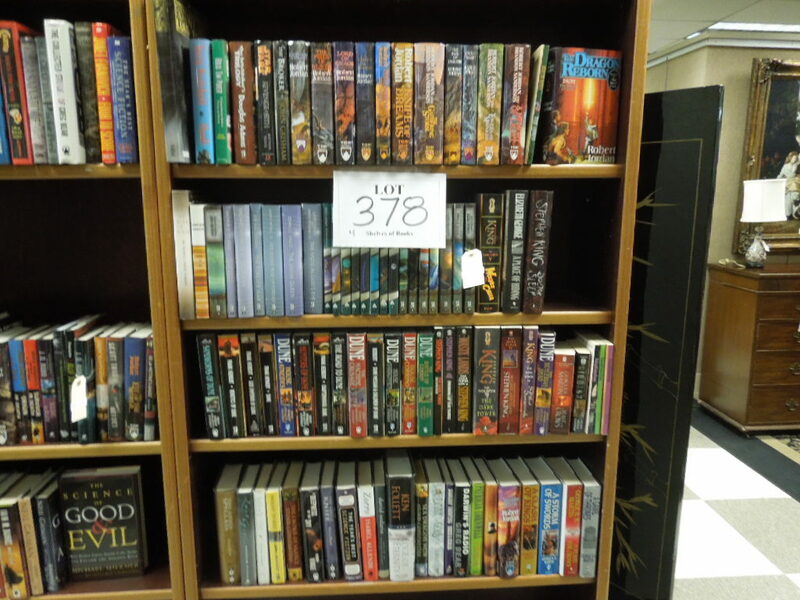 Lot 439: Shelf Of Asstd. 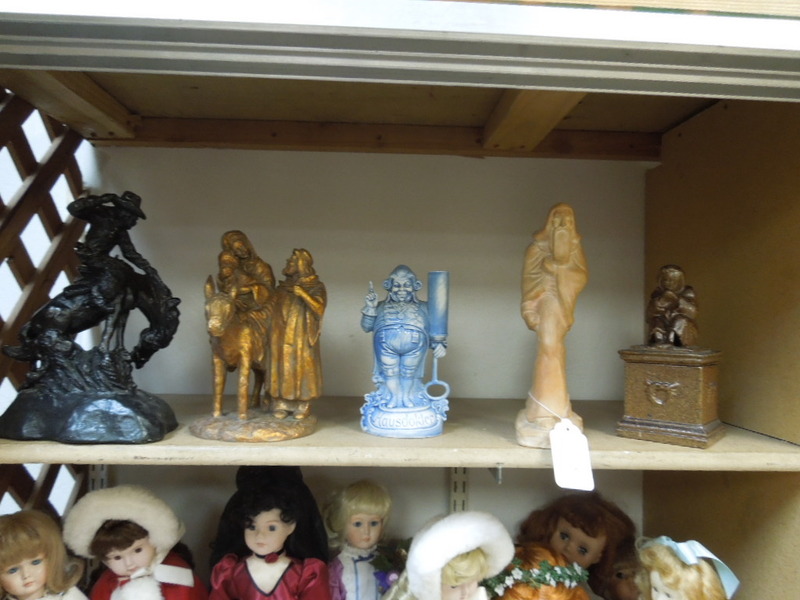 Figurines. 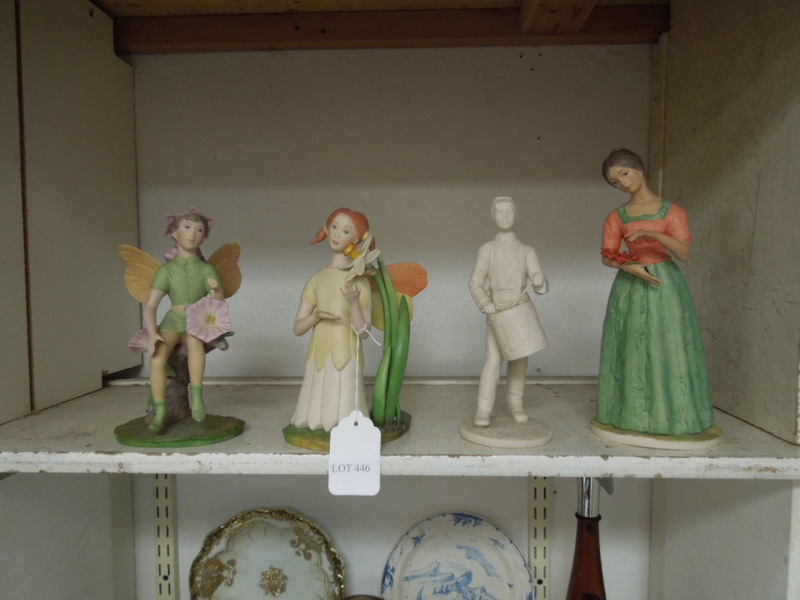 Lot 440: Shelf Of Contemporary Porcelain And Other Dolls. 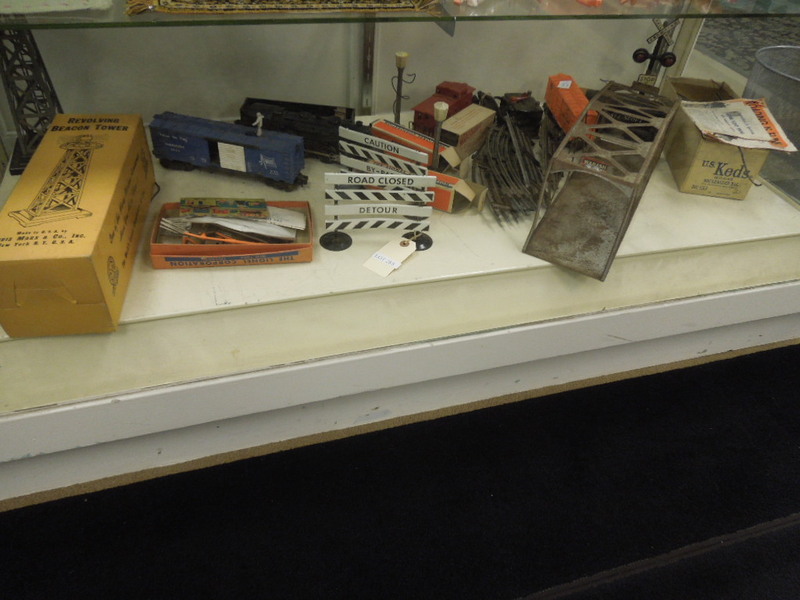 Lot 441: Shelf Of Display Stands. 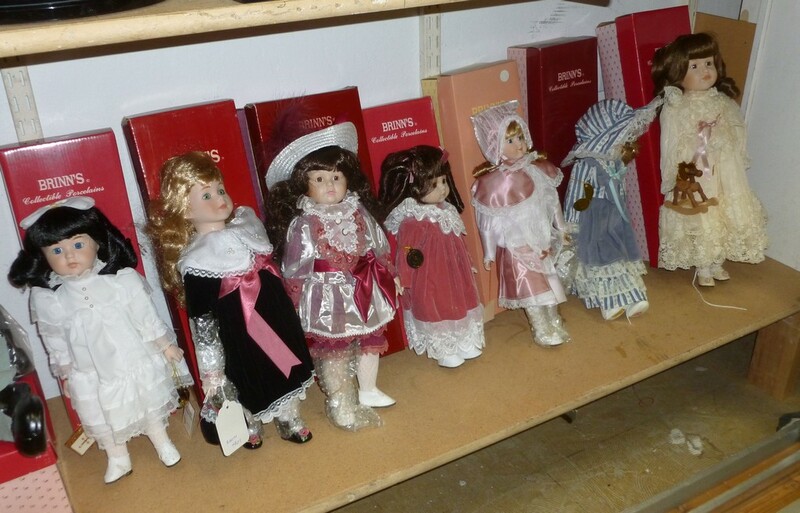 Lot 442: Shelf Of "Brinn's" Porcelain Collector Dolls With Original Boxes. 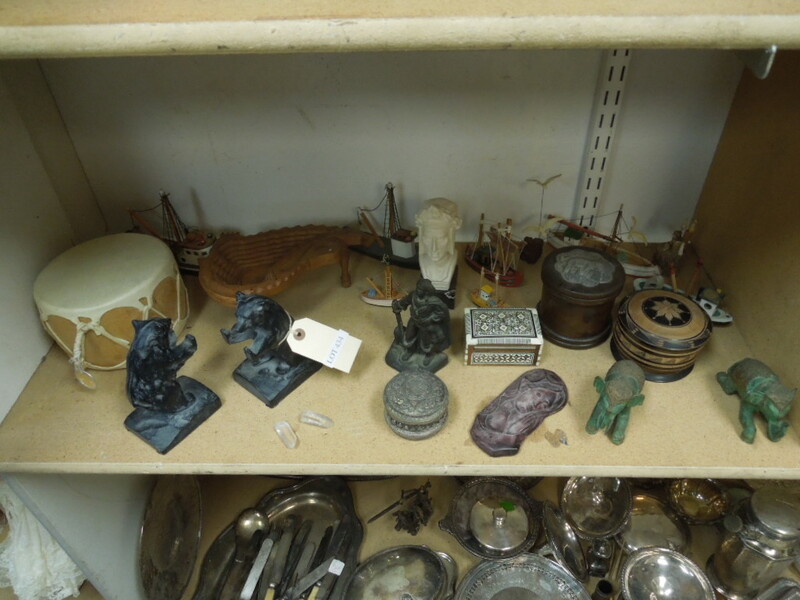 Lot 443: Shelf Of Asstd. 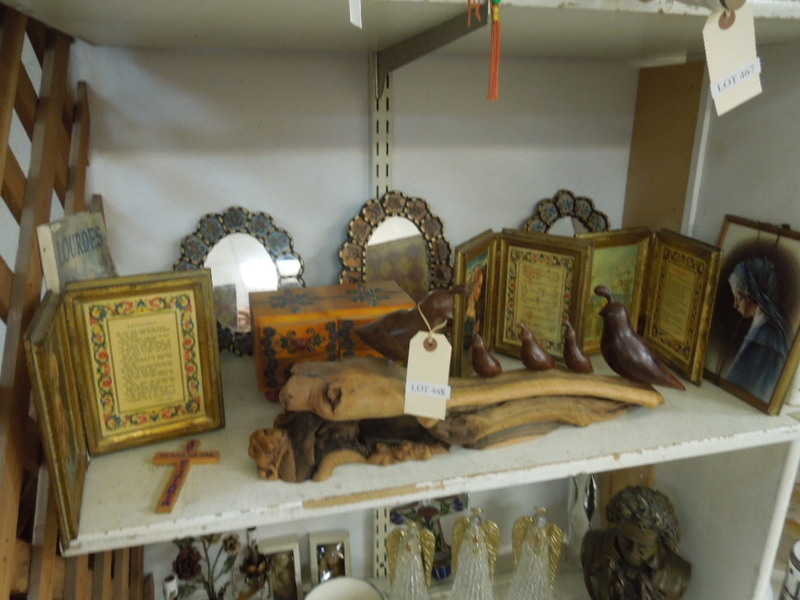 Decorative Items. 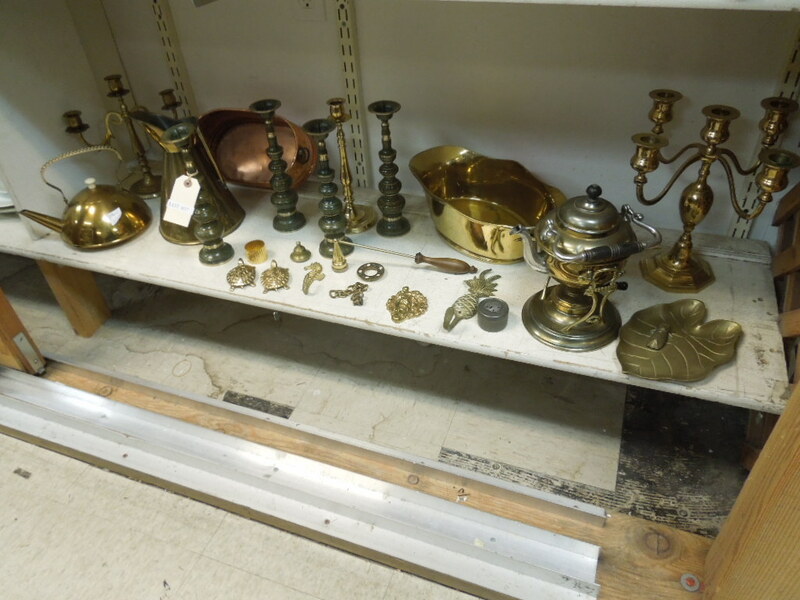 Lot 444: Shelf Of Metalware Incl. Cocktail Shakers, Candlesticks And A Pickle Jar. 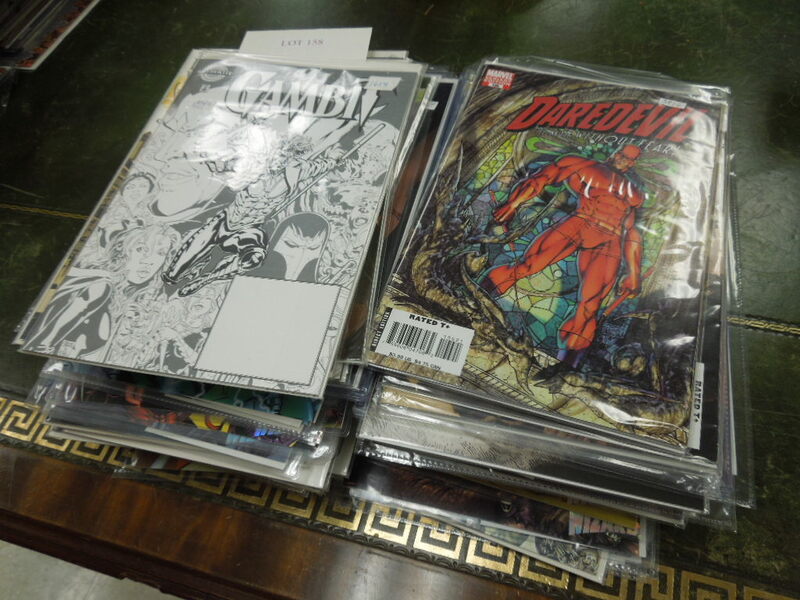 Lot 445: Shelf Of Desk Top Related Items And Collectibles. 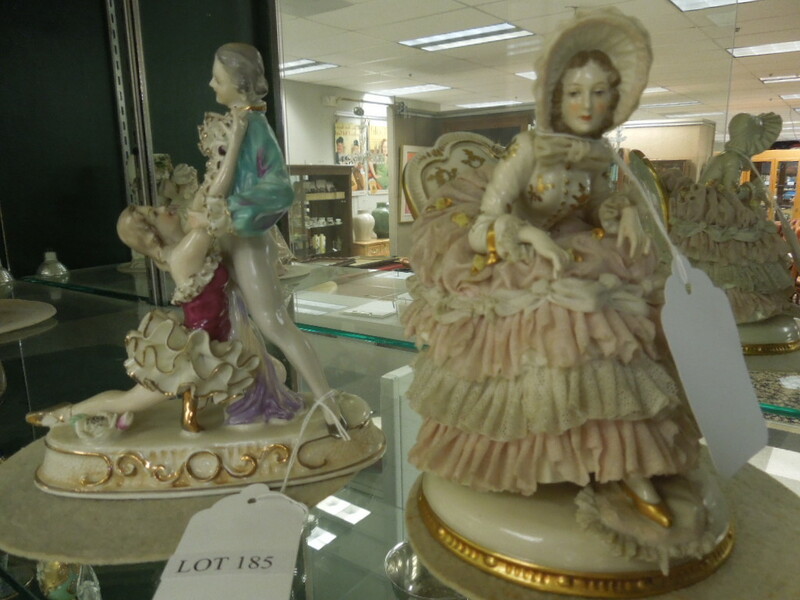 Lot 446: (4) Laszlo Ispanky Limited Edition Goebel Crafts Porcelain Figures. 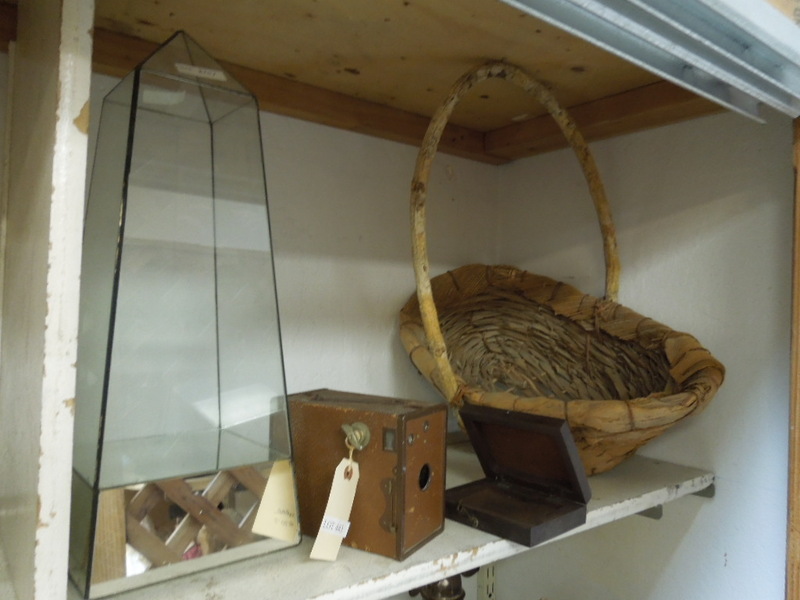 Lot 447: Shelf Of Asstd. 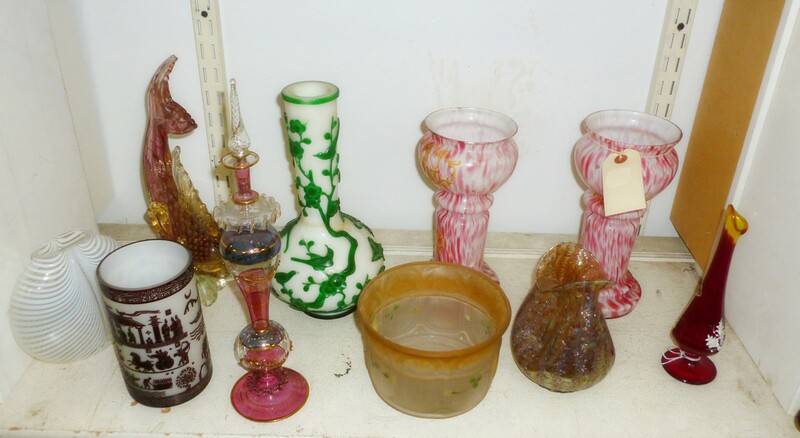 Porcelain And Glass Items. 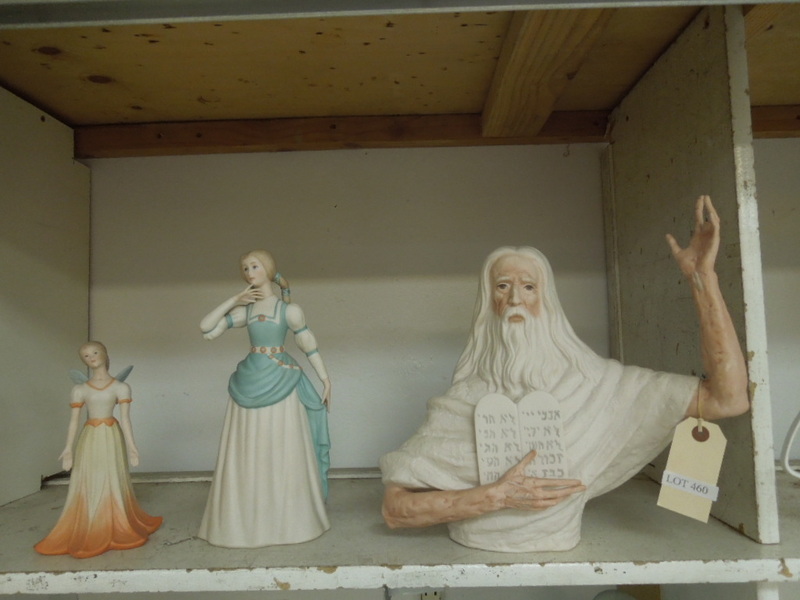 Lot 448: Shelf Of Asstd. 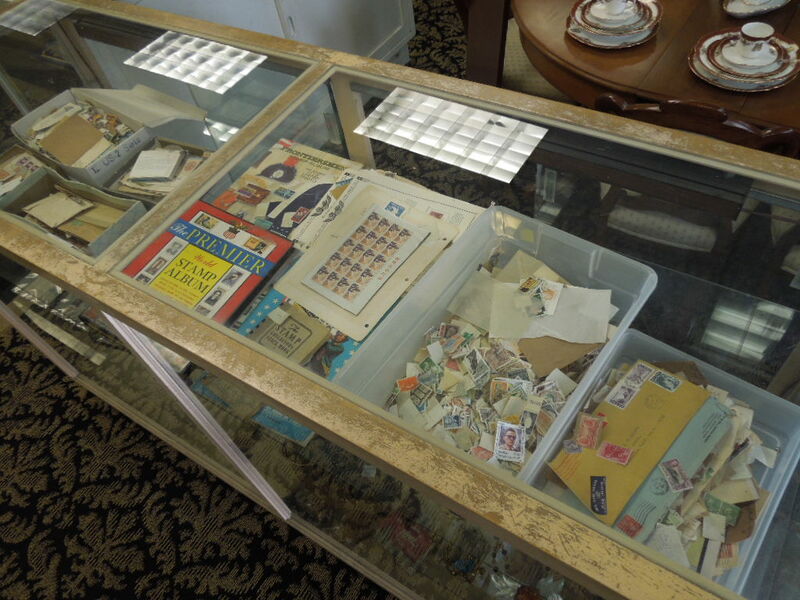 Boxes And Dollhouse Miniatures. 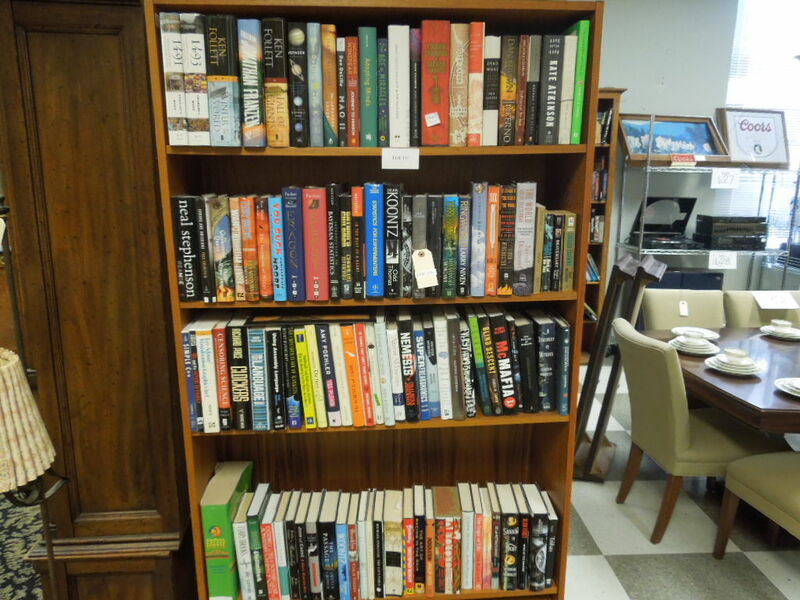 Lot 449: Large Shelf Of Asstd. Silver Plated Items. 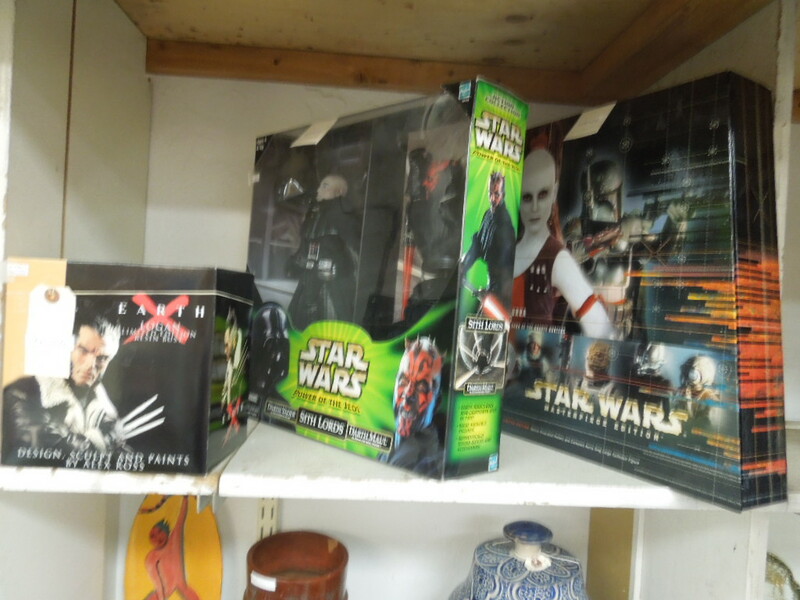 Lot 450: Group Of Star Wars And X-Men Collectibles. (3). 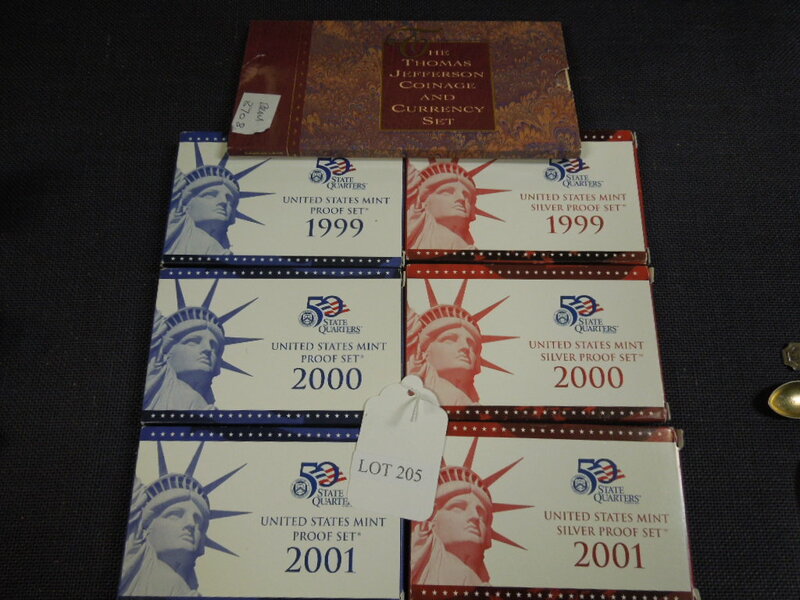 Lot 451: Shelf Of Asstd. Pottery. 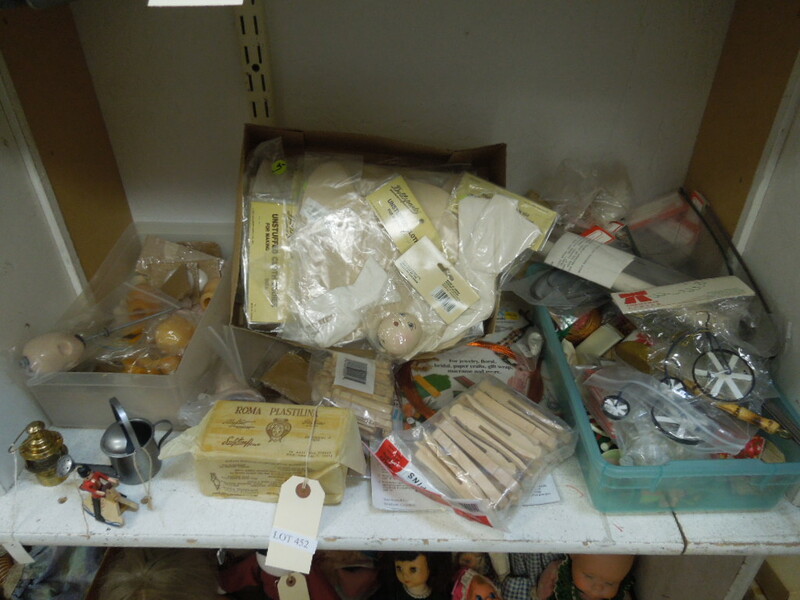 Lot 452: Shelf Of Doll Making Accessories. 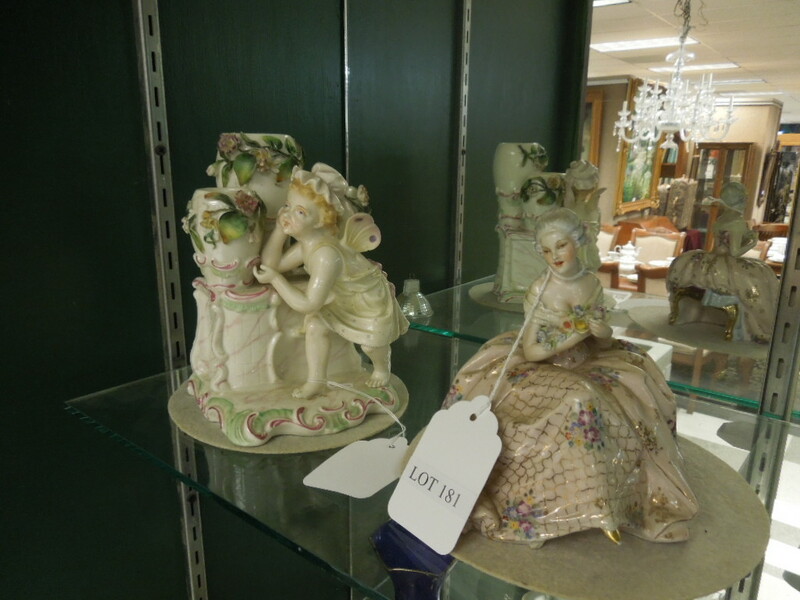 Lot 453: (2) Signed Ceramic Figures. 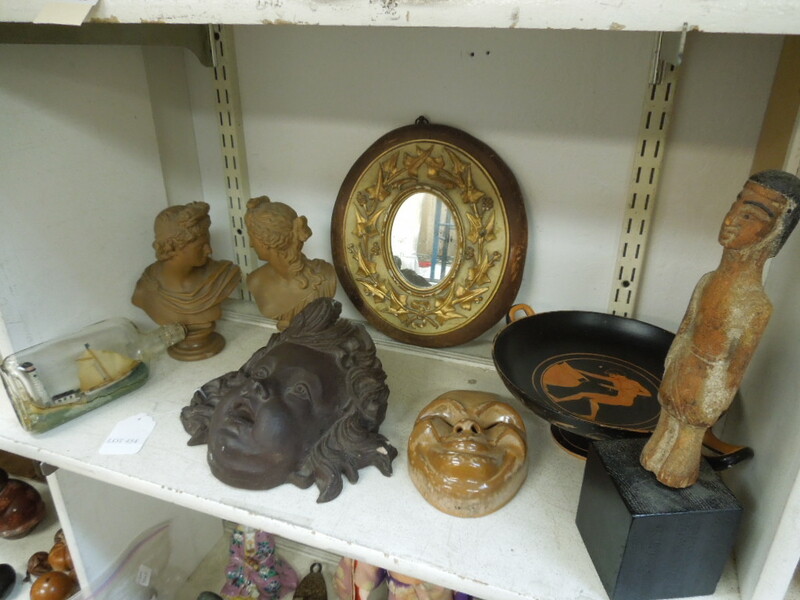 Lot 454: Shelf Of Ceramic Classical Figures, Gilt Wood Mirror And Collectibles. 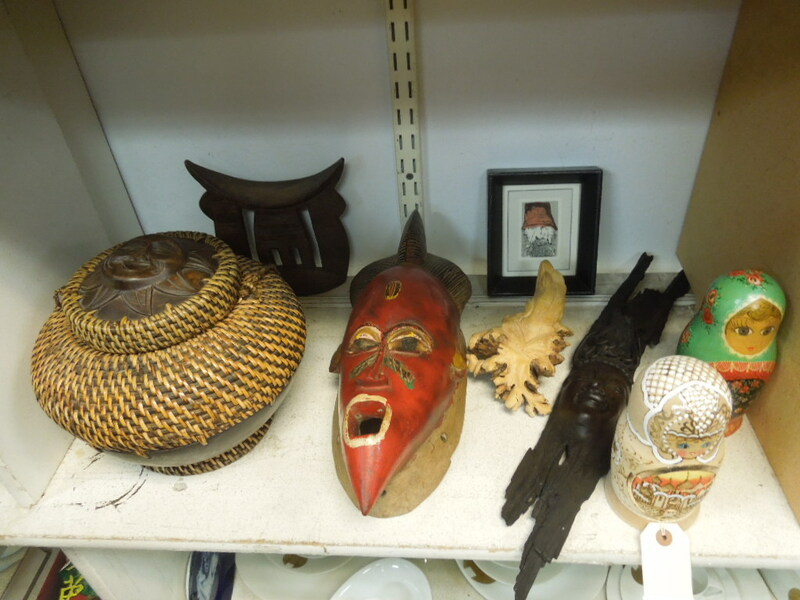 Lot 455: Shelf Of Asian And African Collectibles And Knick Knacks. Lot 456: Group Of Asstd. 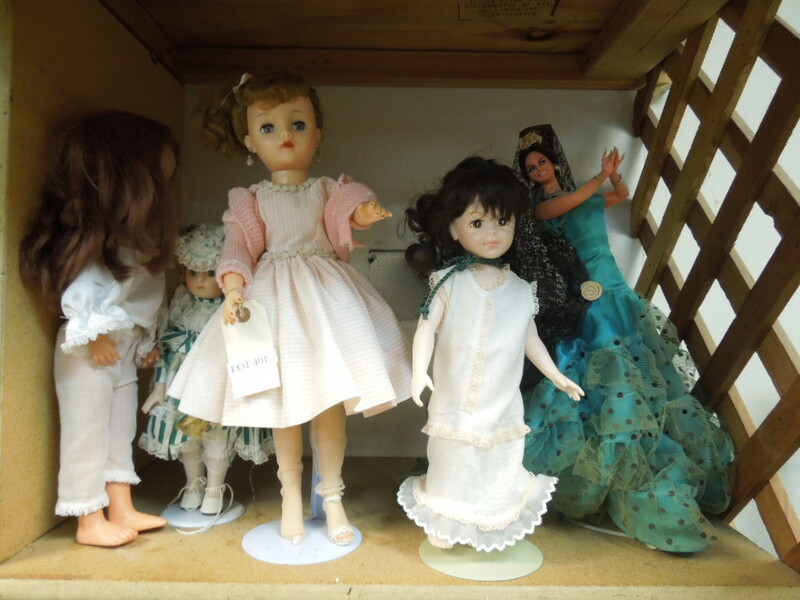 Dolls And Doll Clothes. 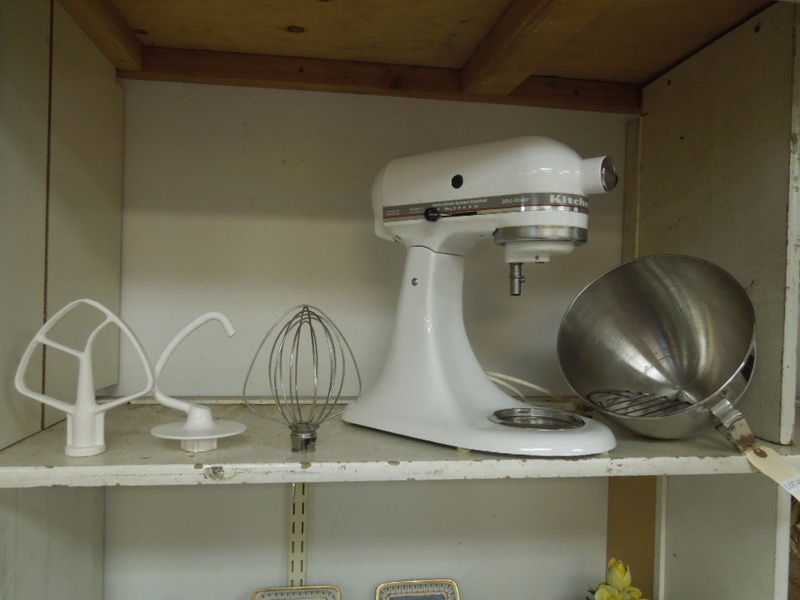 Lot 457: Kitchen Aid Ultra Power Mixer. 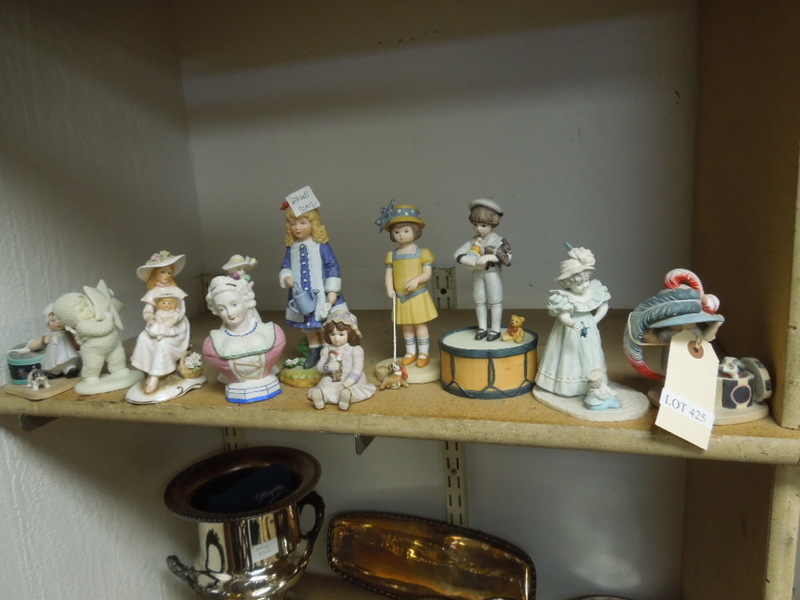 Lot 458: Shelf Of Porcelain Figures And Knick Knacks. 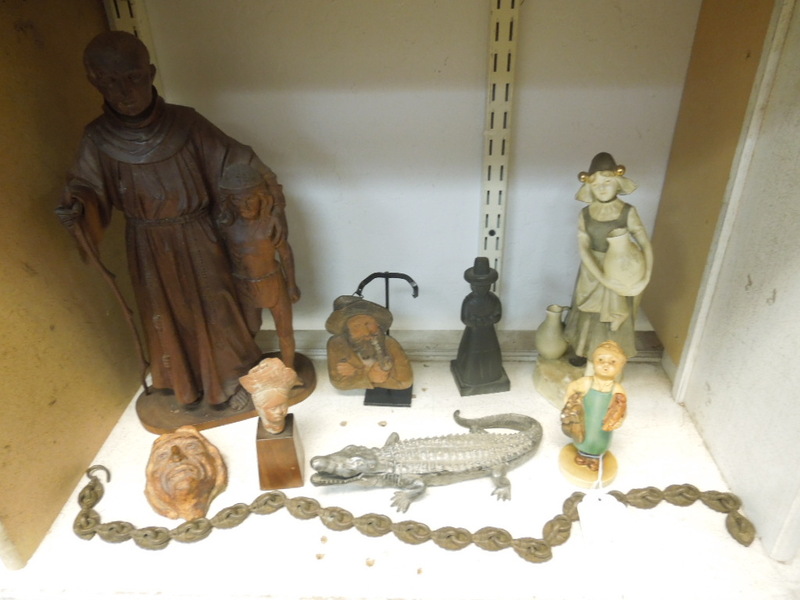 Lot 459: Shelf Of Wooden Figurines And Knick Knacks. 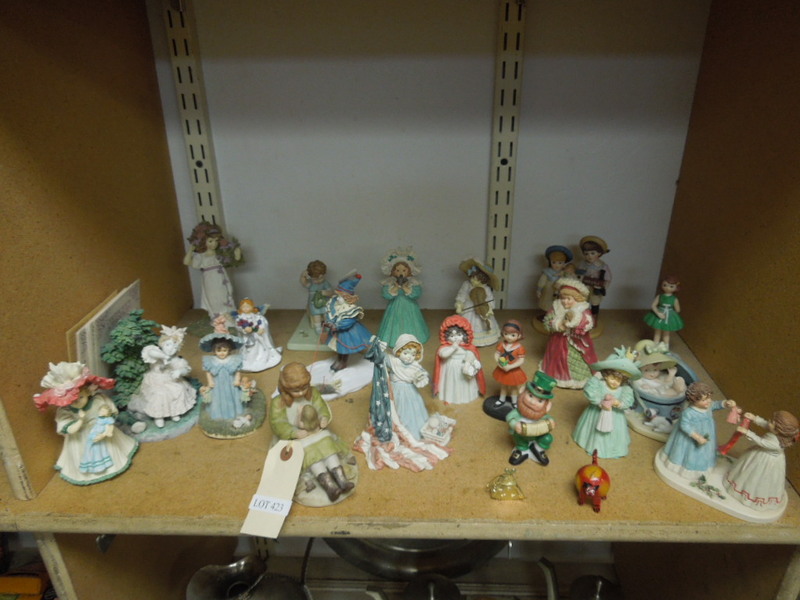 Lot 460: Shelf Of Ceramic Figures Incl. Laszlo Ispanky. 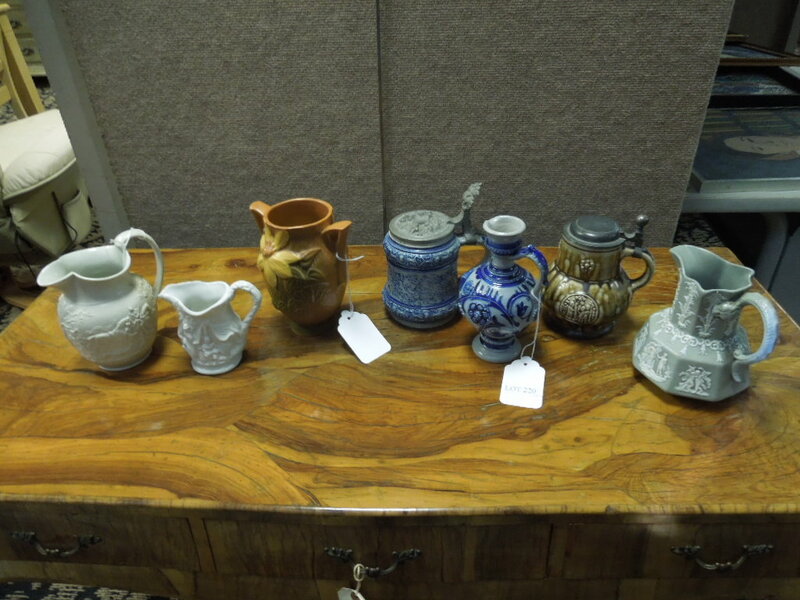 Lot 461: Shelf Of Ceramic Beer Steins And Knick Knacks. 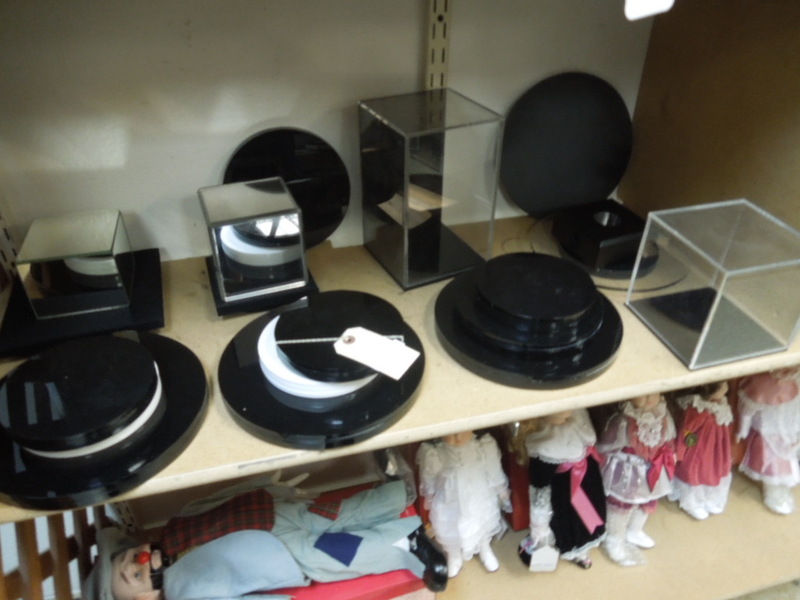 Lot 462: Shelf Of Kitchenware Incl. 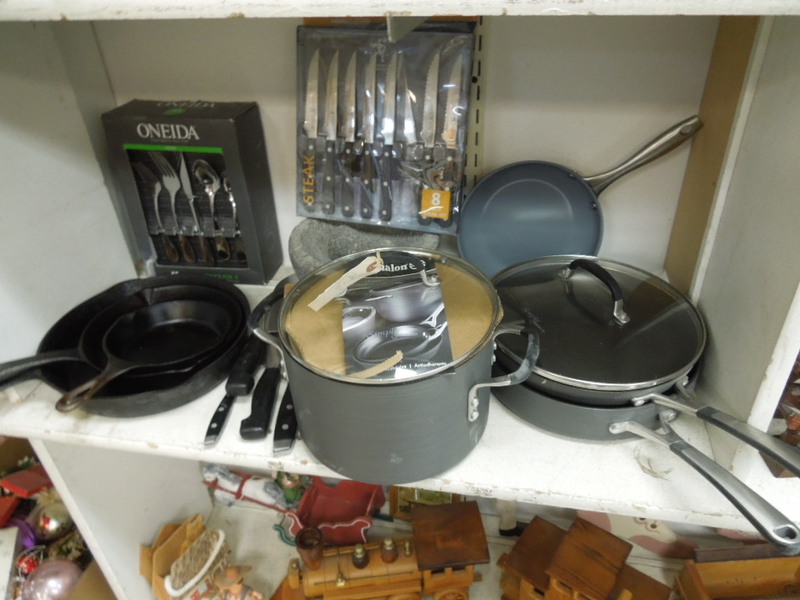 Calphalon Non-Stick Cookware Set, Flatware, Pans, Steak Knives. 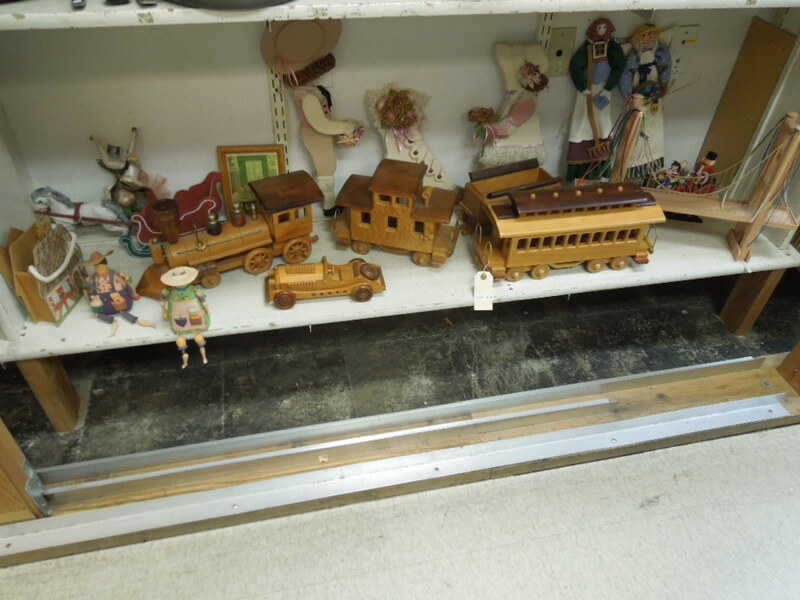 Lot 463: Large Shelf Of Wooden Knick Knacks. 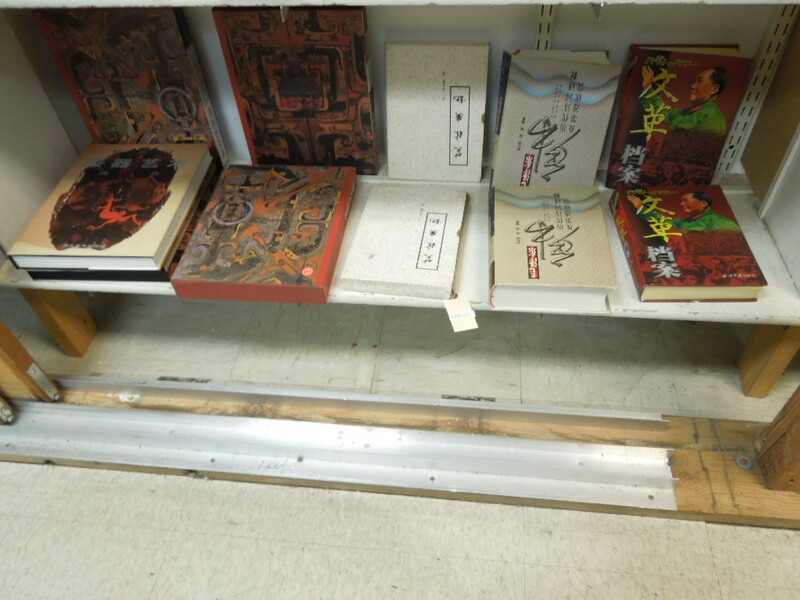 Lot 464: Shelf Of Asstd. 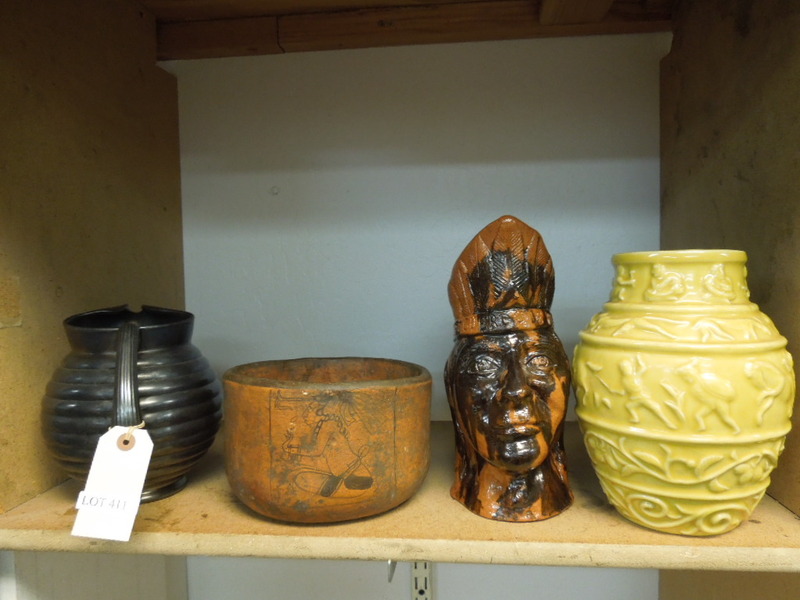 Pottery Items. 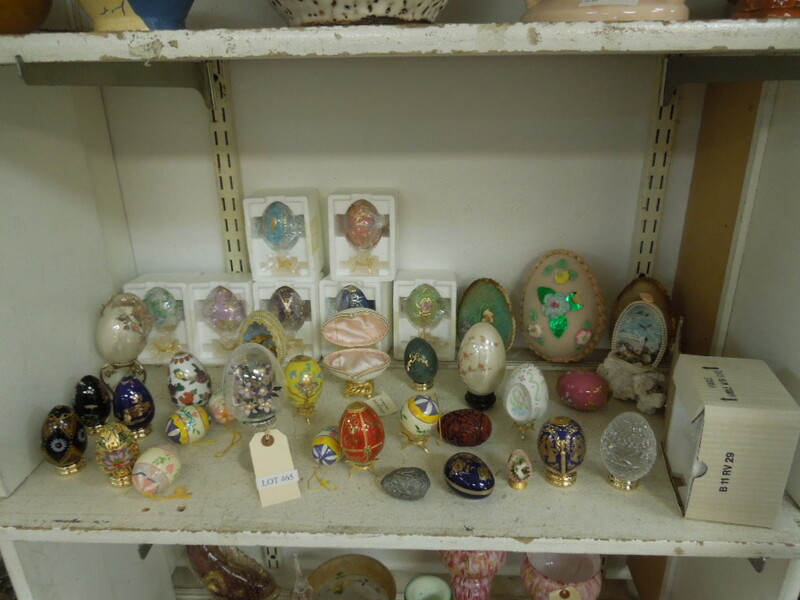 Lot 465: Shelf Of Porcelain And Glass Eggs. 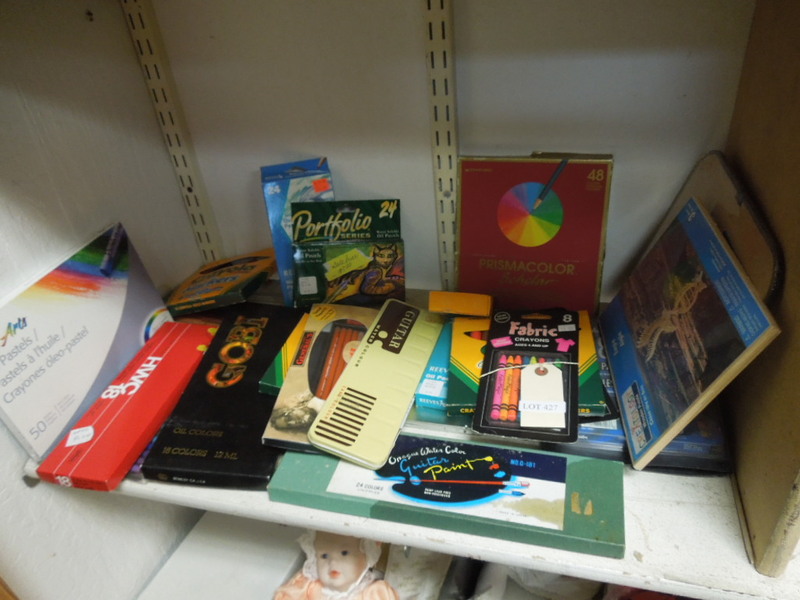 Lot 466: Shelf Of Asstd. 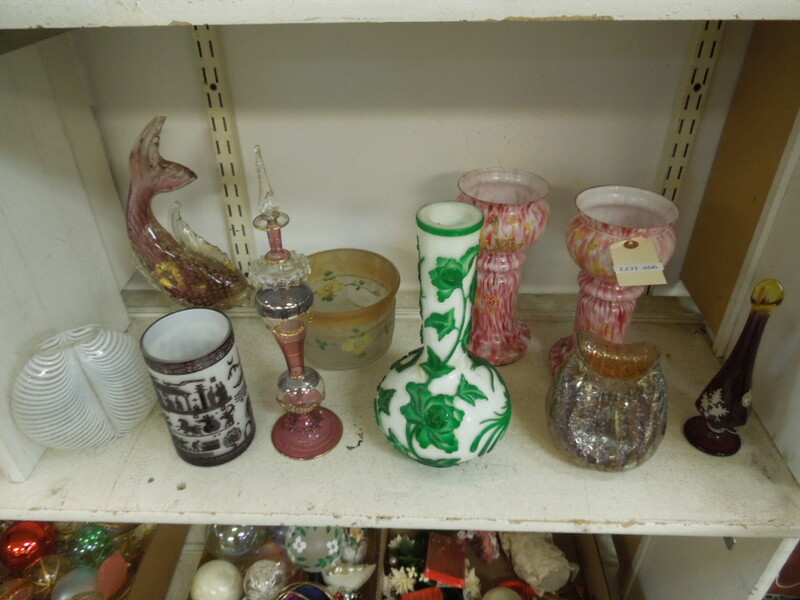 Glassware And Vases. 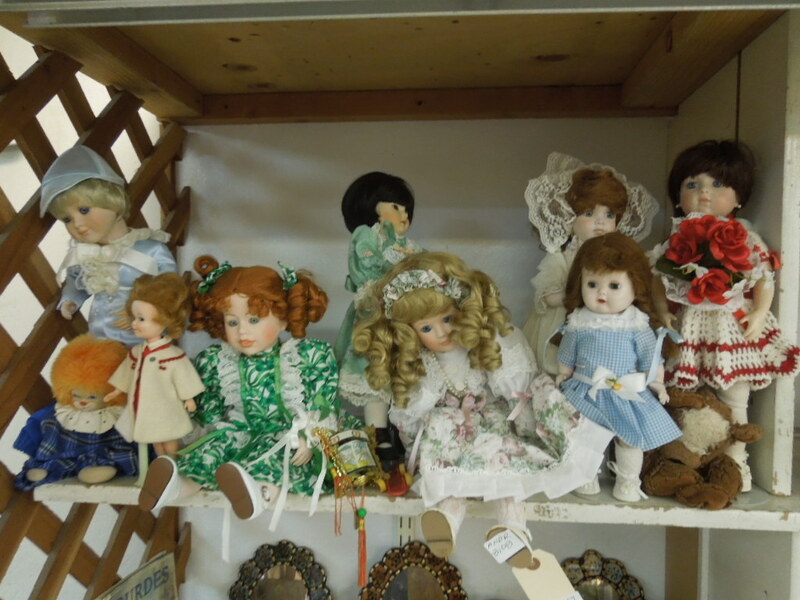 Lot 467: Shelf Of Dolls. 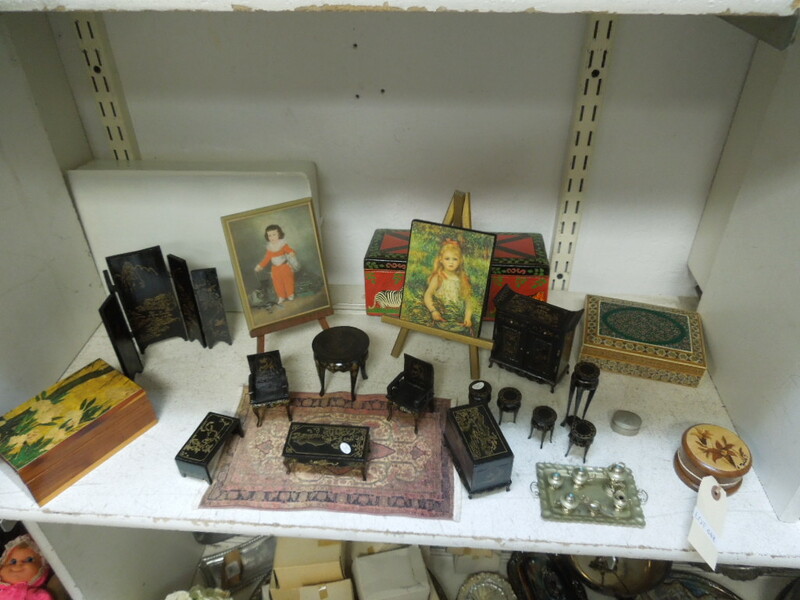 Lot 468: Shelf Of Decorative Items Incl. Quail Family Wood Carving, Mirrors. 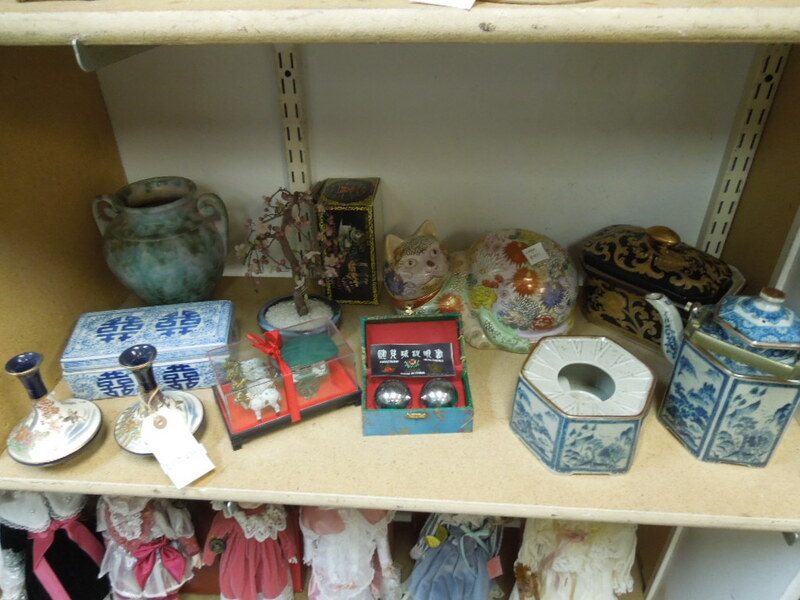 Lot 469: Shelf Of Decorative Items And Collectibles. 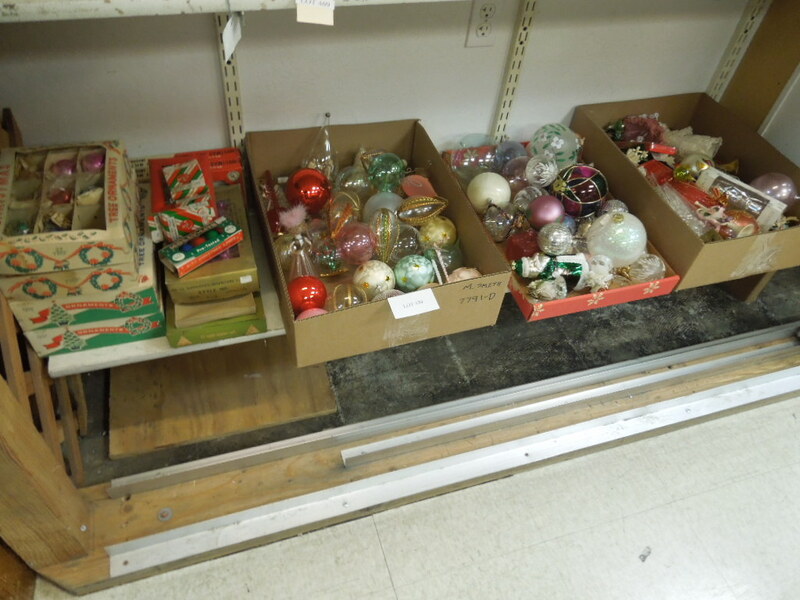 Lot 470: Shelf Of Christmas Ornaments And Decorations.